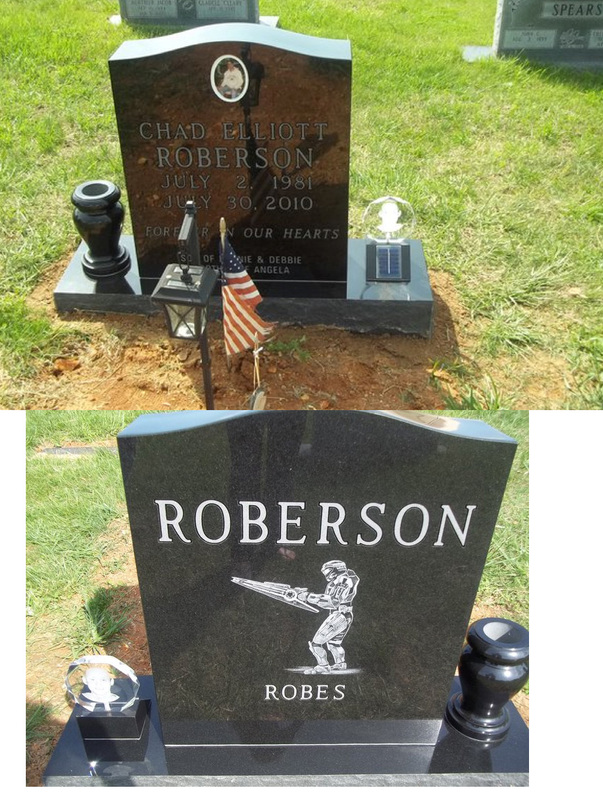 Added about a dozen additional photos to the Pearl Webb Cemetery - It is believed the transcription for this cemetery is now completed. 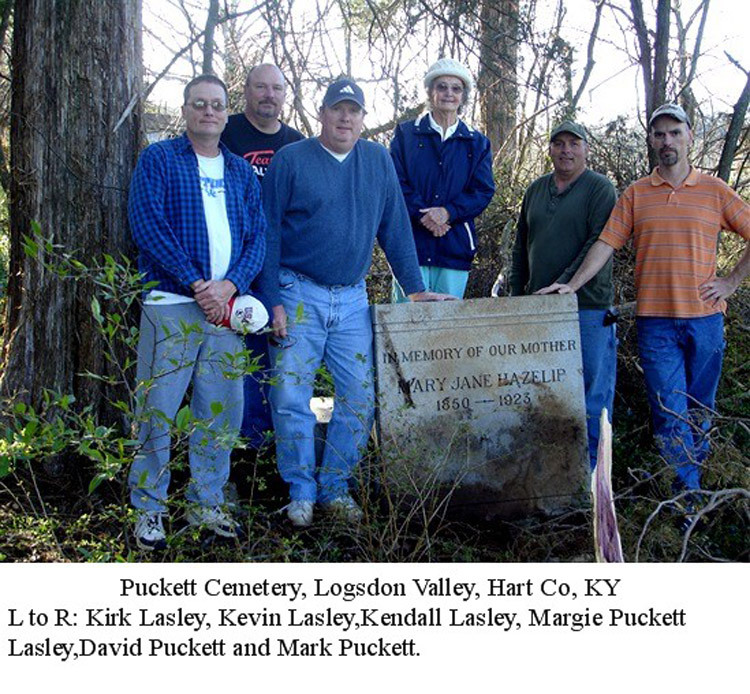 04/01/2013 Added about 5,000 stone photos to Glasgow Municipal Cemetery, Barren Co.
01/16/2013 Added about 2,000 stone photos for Glasgow Municipal Cemetery, Barren Co.
10/12/2011 Added a ChangeDetection link at the top of this page. 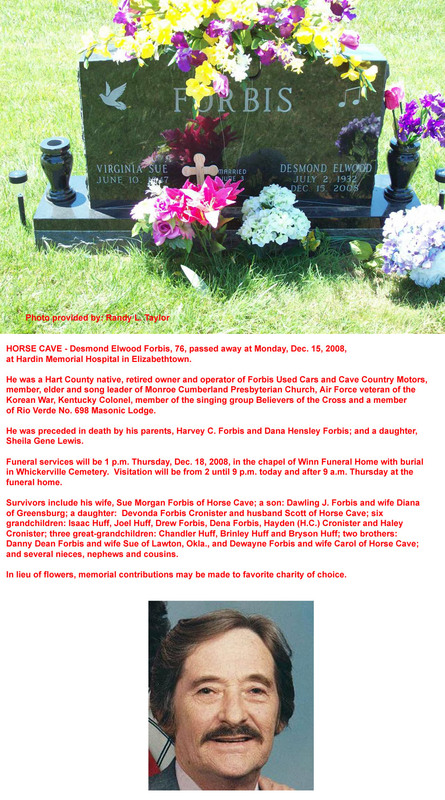 You can enter your email address and each time I add something to this page you will be notified by email. 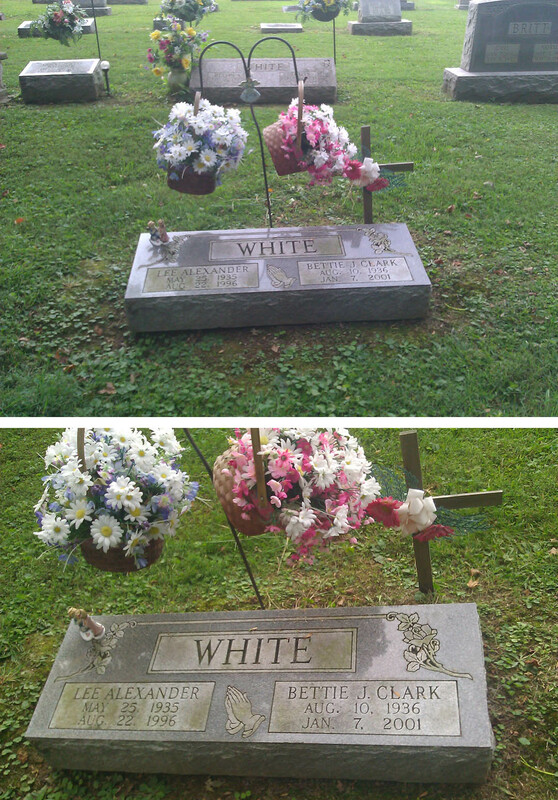 10/09/2011 Revised the McCubbins Cemetery, Hart Co. - combined the Mt. 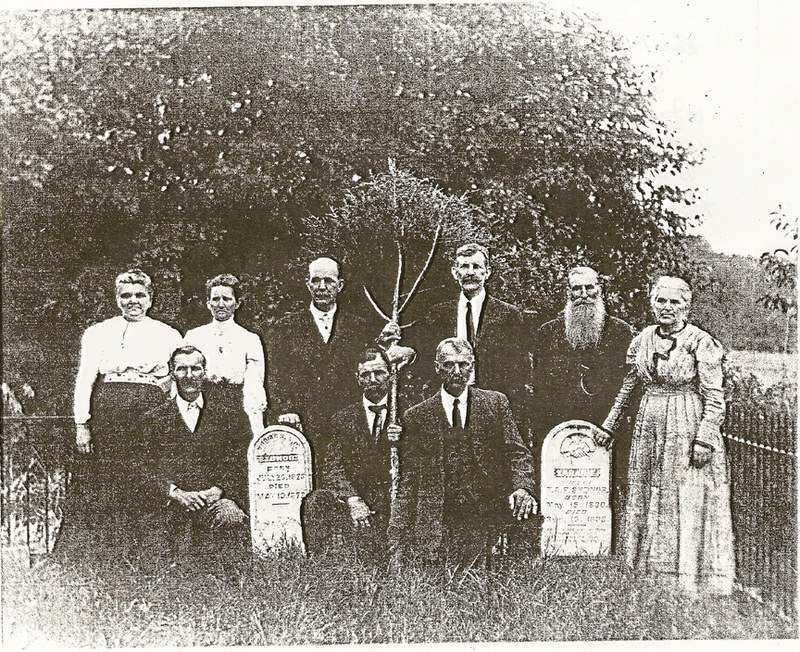 Olivet Missionary Baptist Church & McCubbin Cemeteries as they are the same. 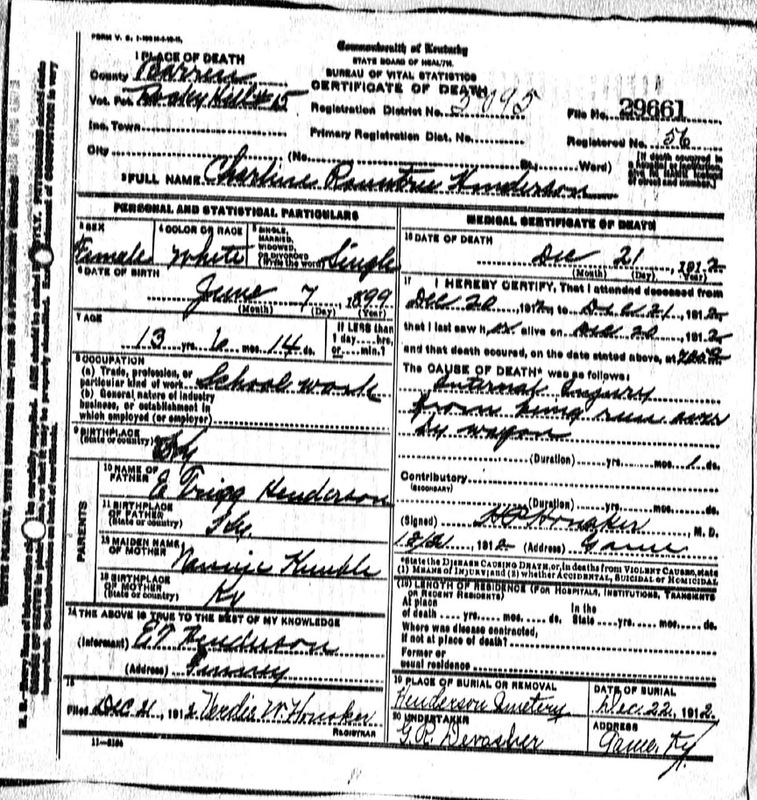 - Added Emma Faye Middleton & Henry Thomas. 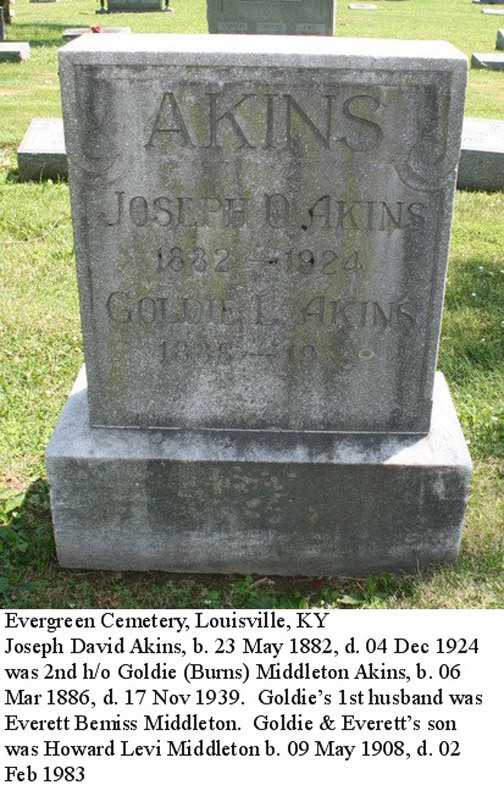 10/08/2011 Added the Polston aka Old Stephen Goodman Cemetery, Hart Co. - 39 graves - Surnames: Edwards, Goodman, Jaggers, Lathery, Lothery, Mathews, Philpott, Polston, Poston, Ruark - provided by Edith Bastin. 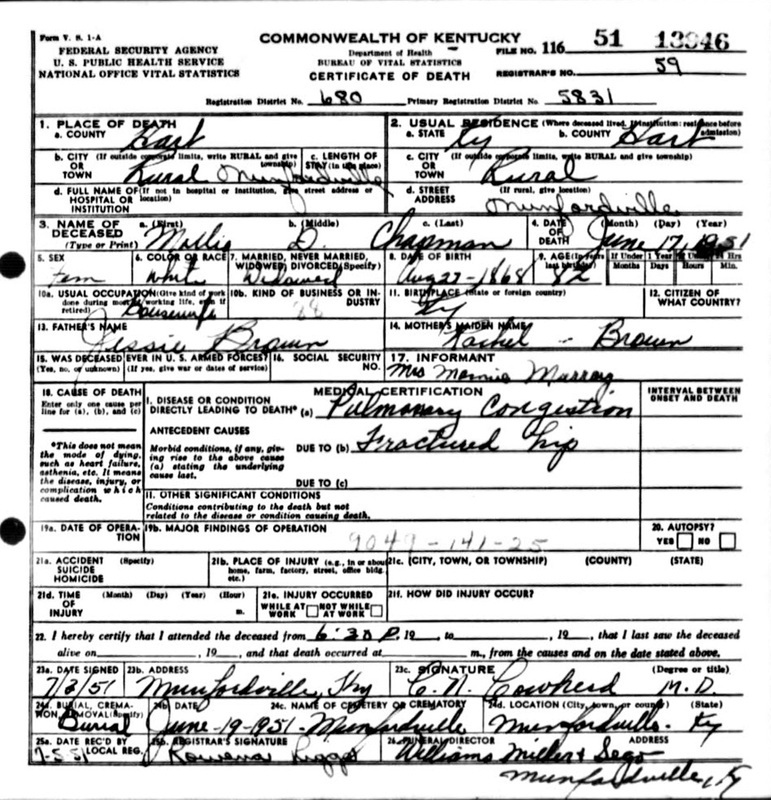 10/04/2011 Added the Little Jordan Cemetery, Edmonson Co./Mammoth Cave- 118 graves - Surnames: Blair, Clark, Cox, Denison, Doyle, Fitzgeralds, Keith, Lucas, Merideth, Rigdon, Sanders, Sell, Short, Snyder, Staples, Strange, Taylor, Terry, Turley, Whitlow, Wilson - provided by Doris Dorsey and Edith Bastin. 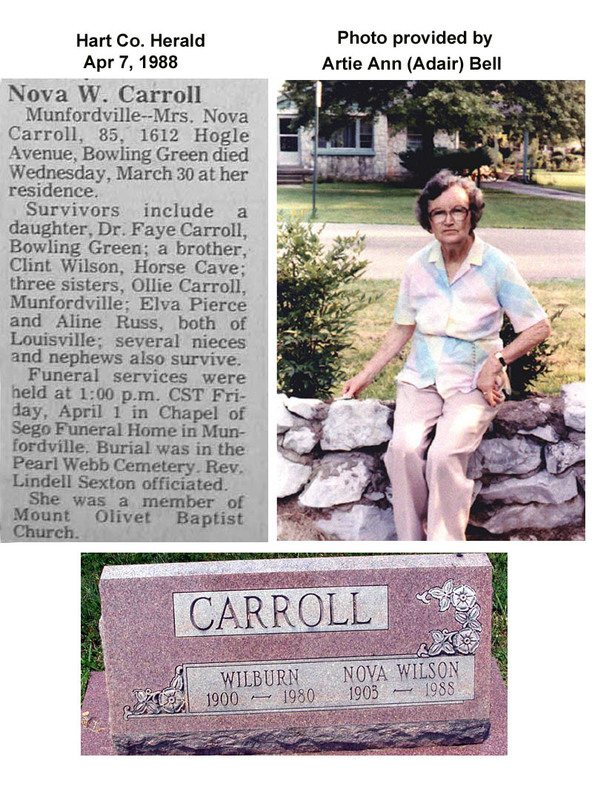 09/25/2011 Added the Geralds/Fitzgerald Cemetery, Edmonson or Hart Co. provided by Sheila Miles, Doris Dorsey, Sarah Hogan, Carol Olney and Edith Bastin. 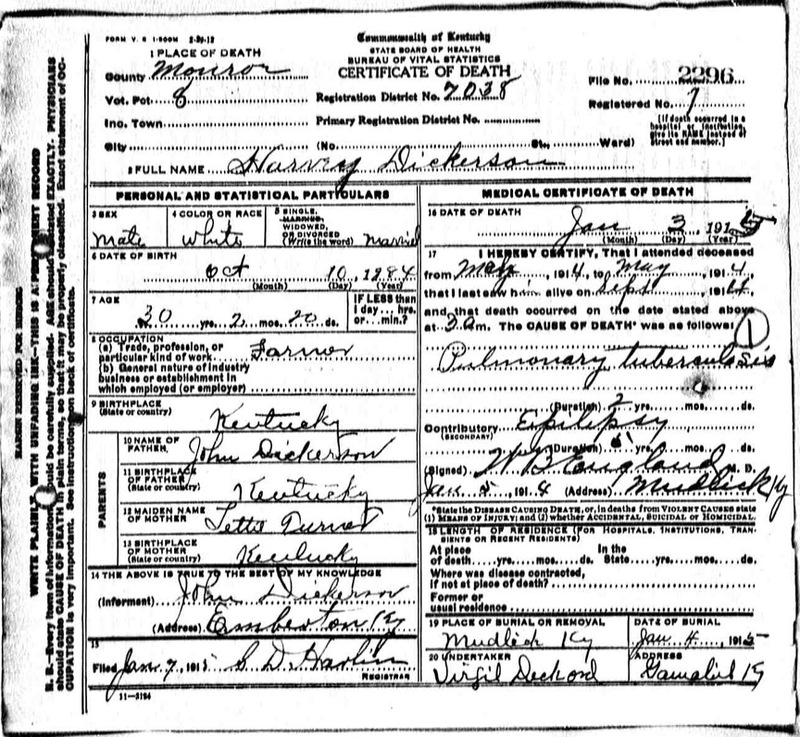 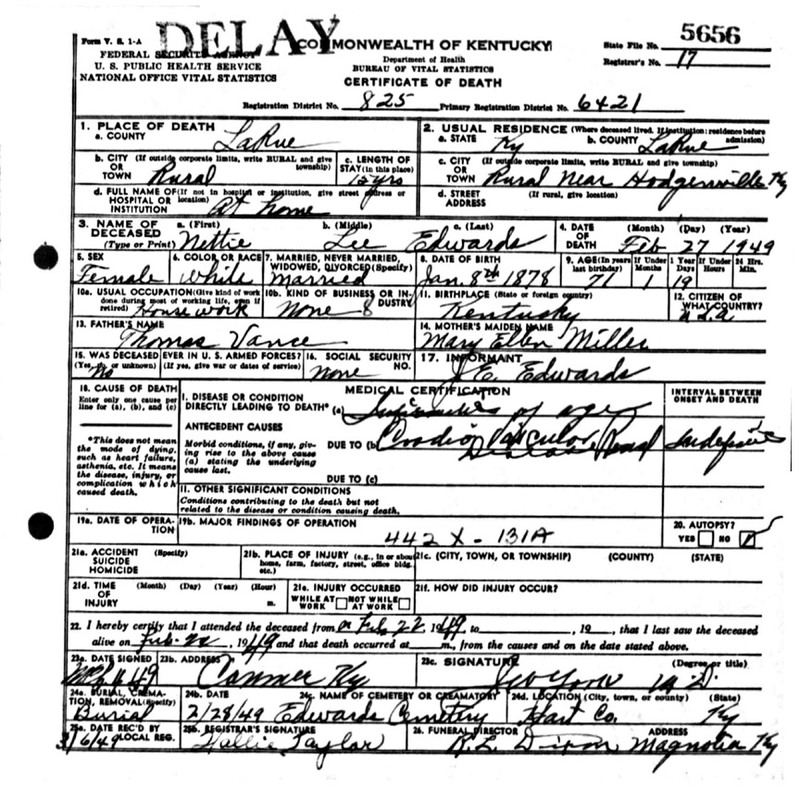 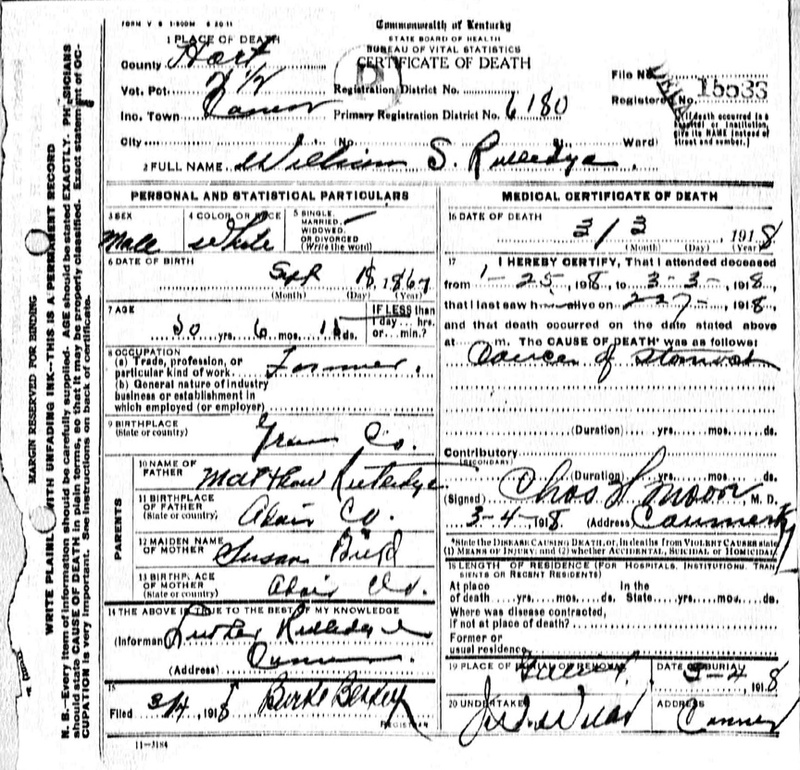 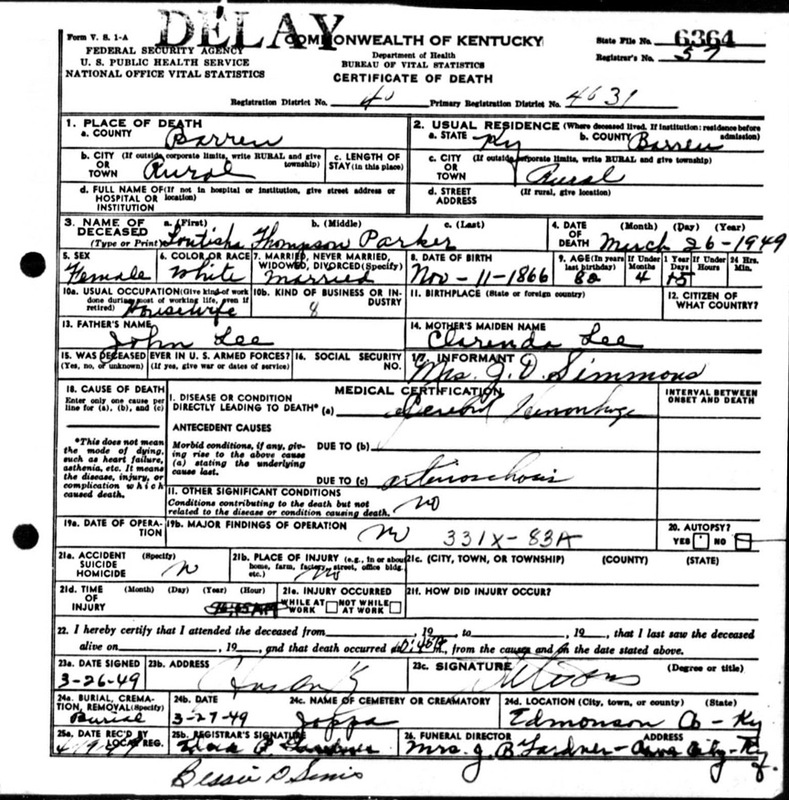 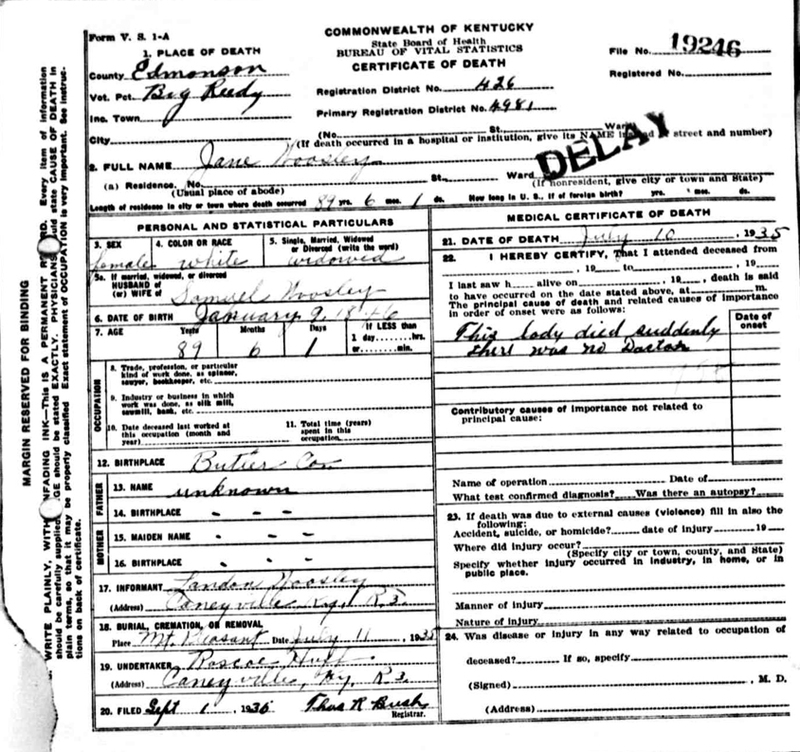 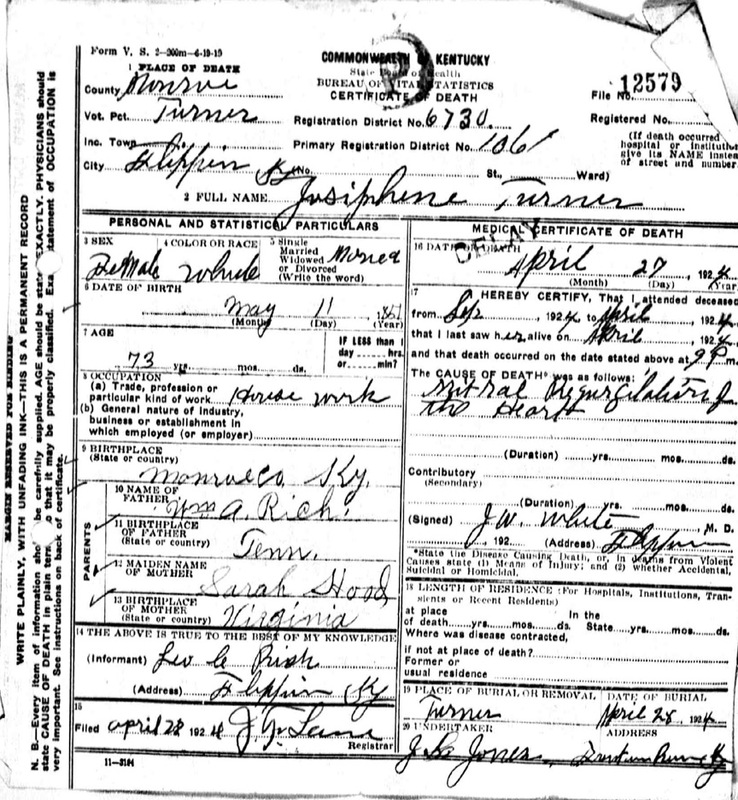 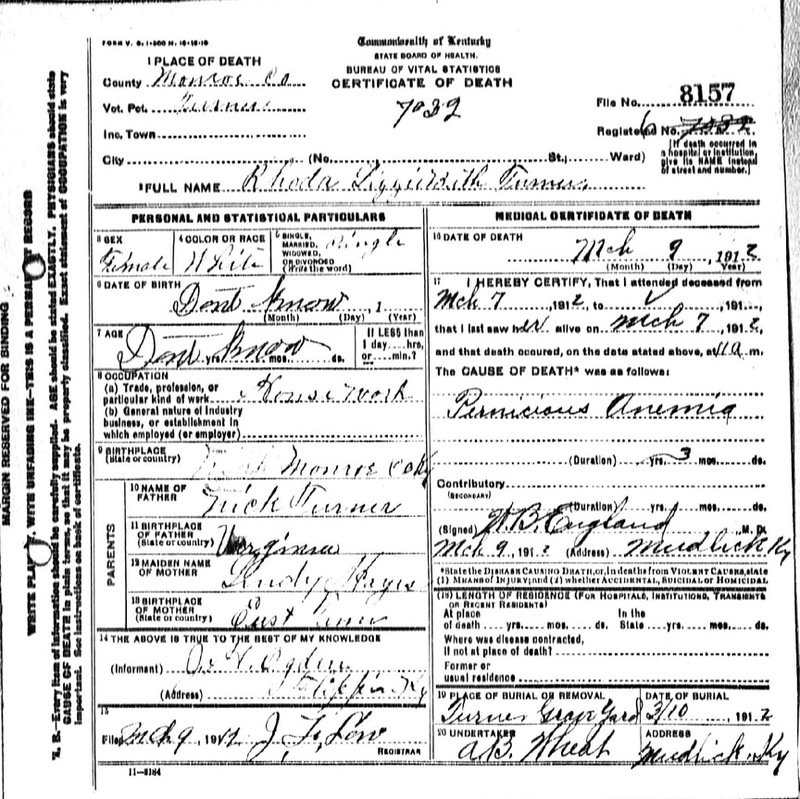 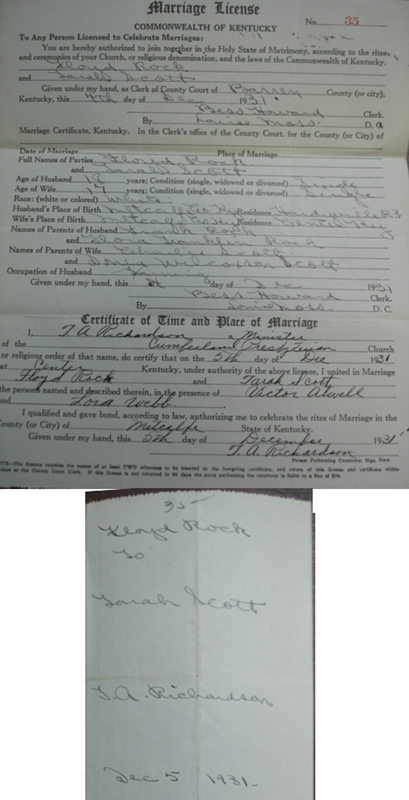 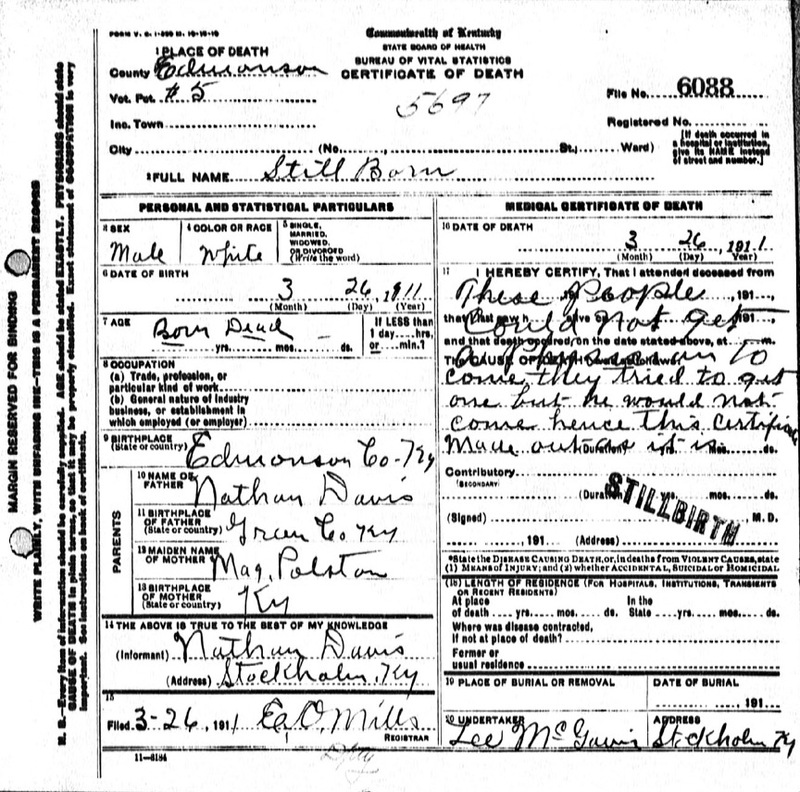 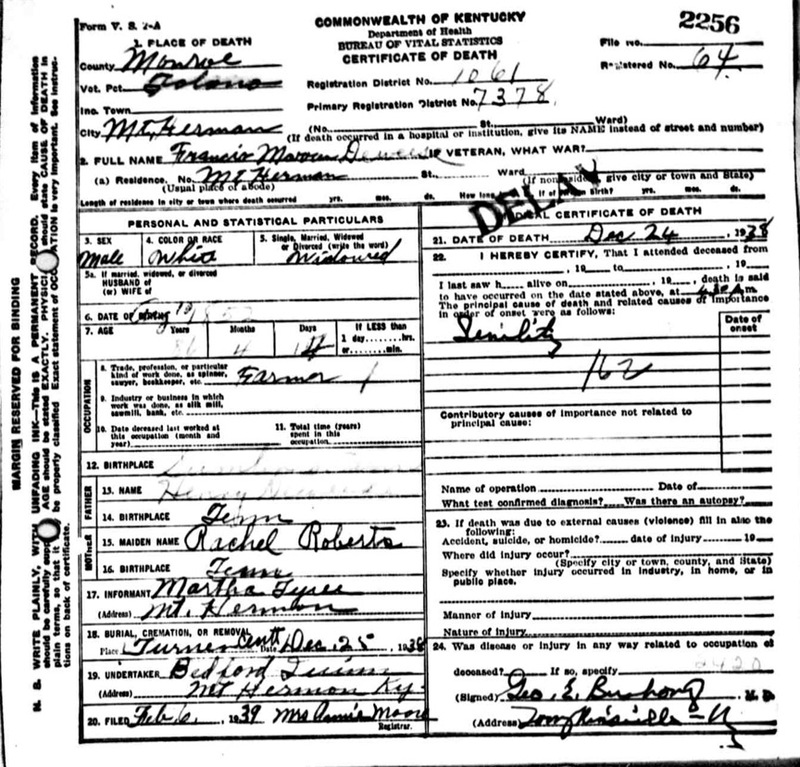 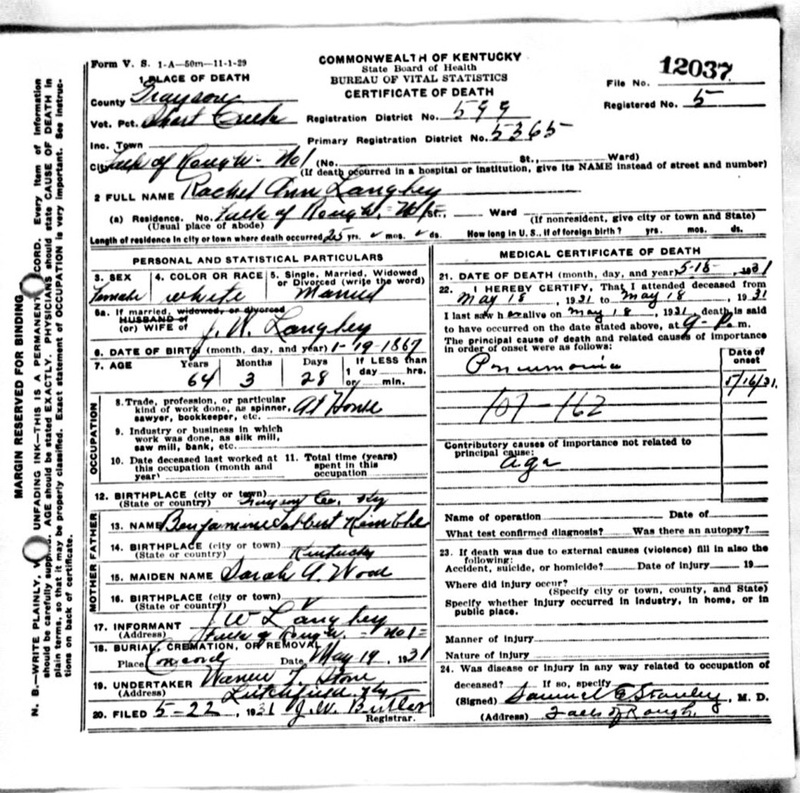 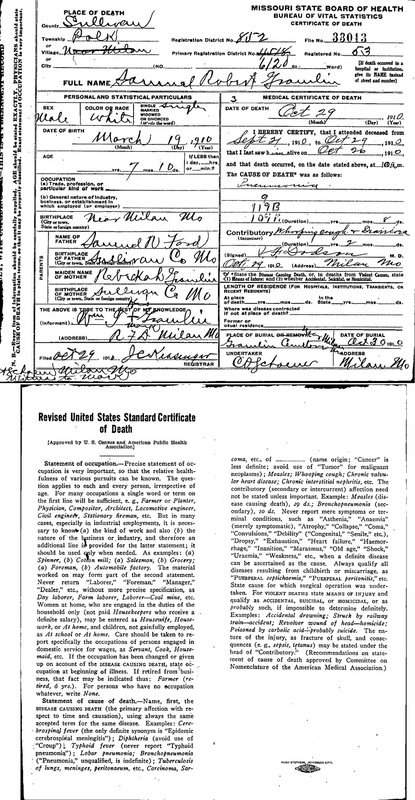 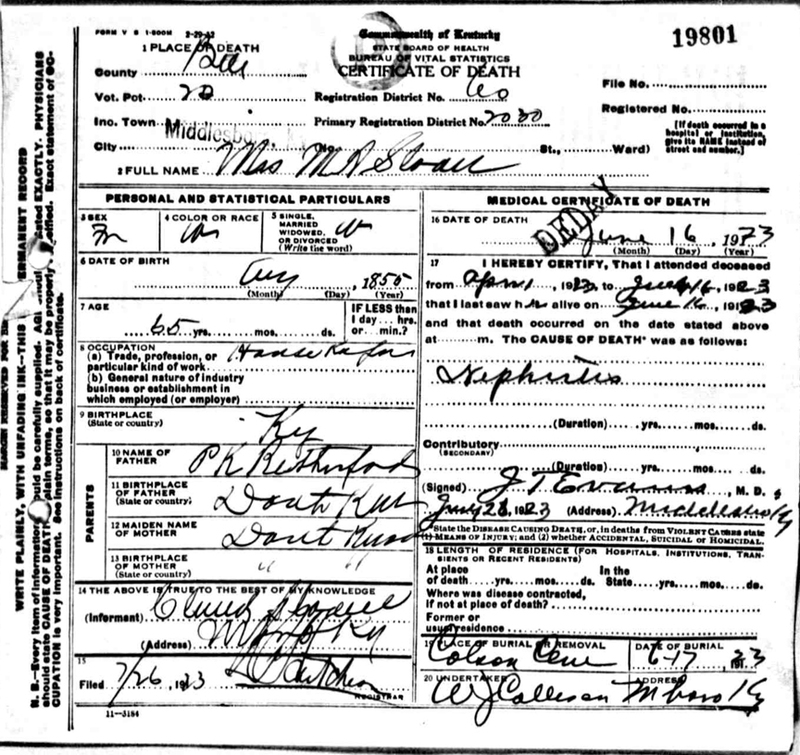 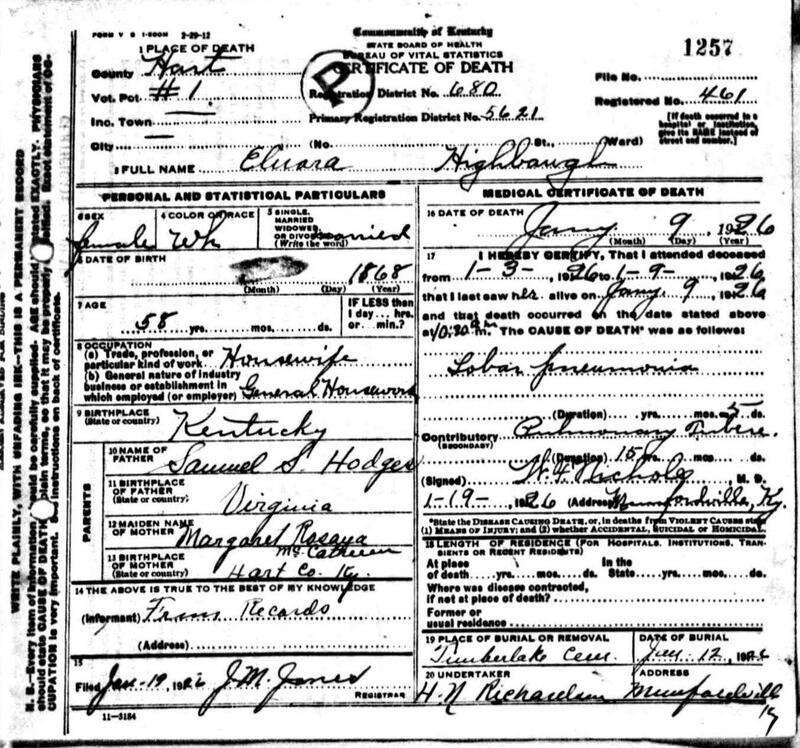 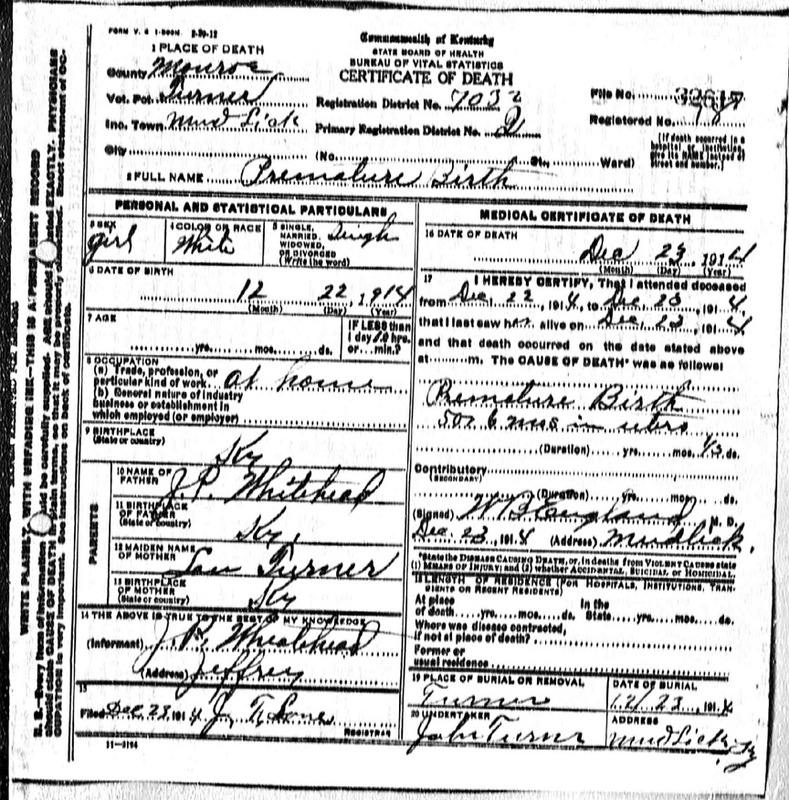 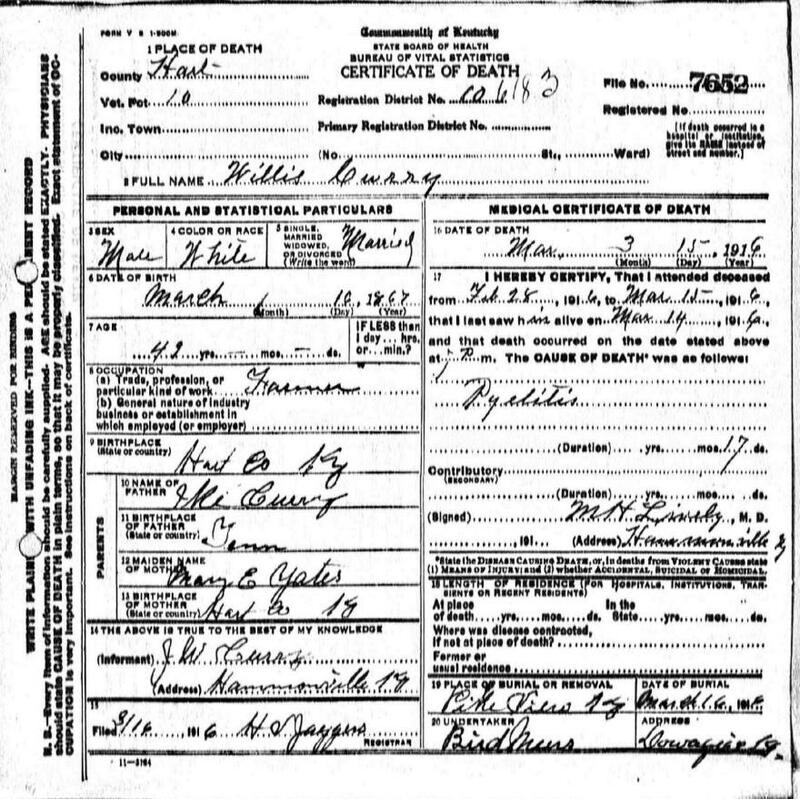 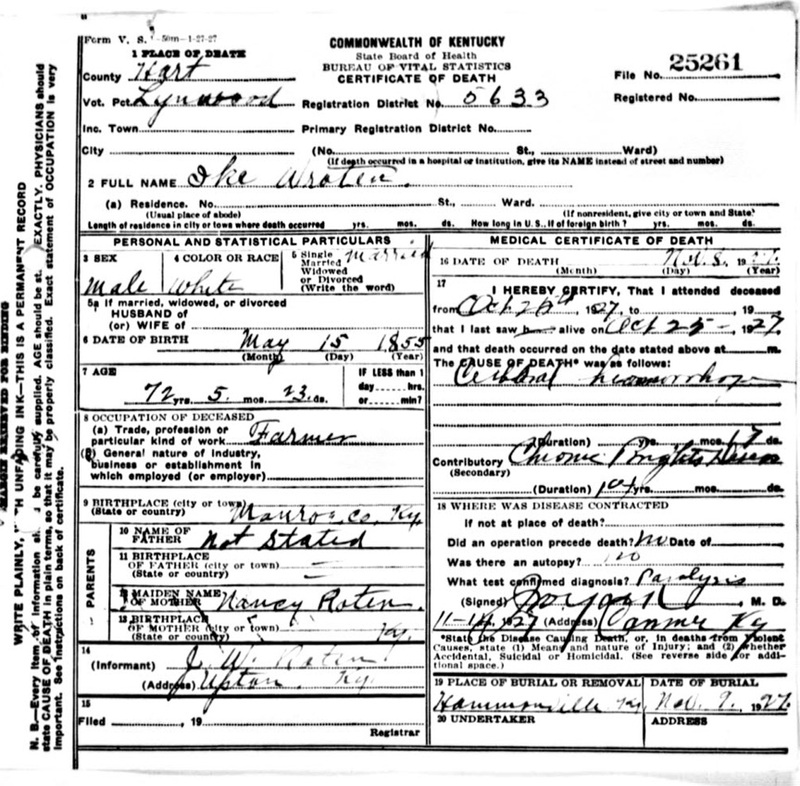 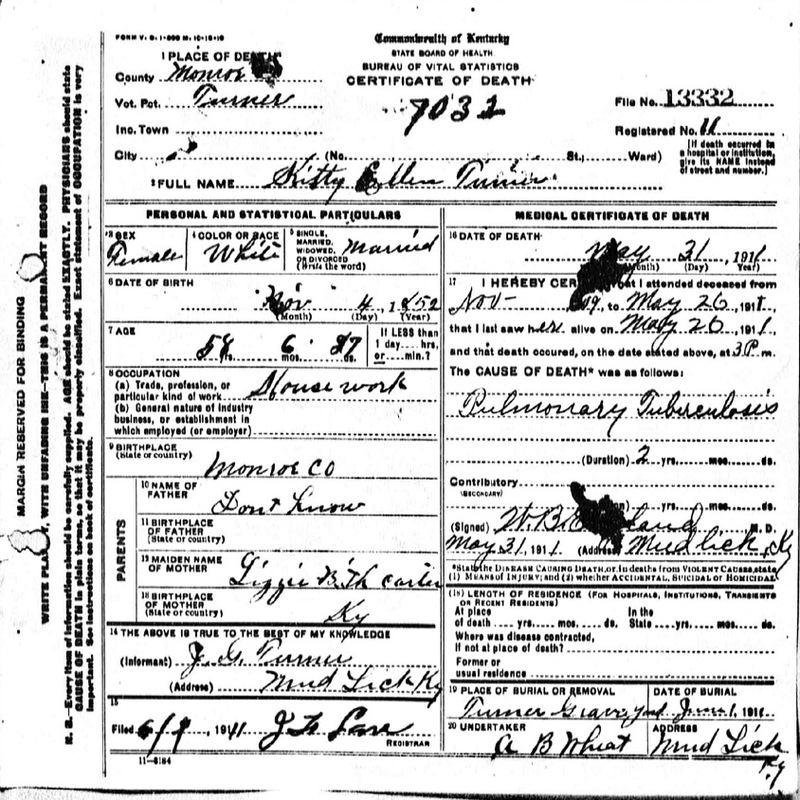 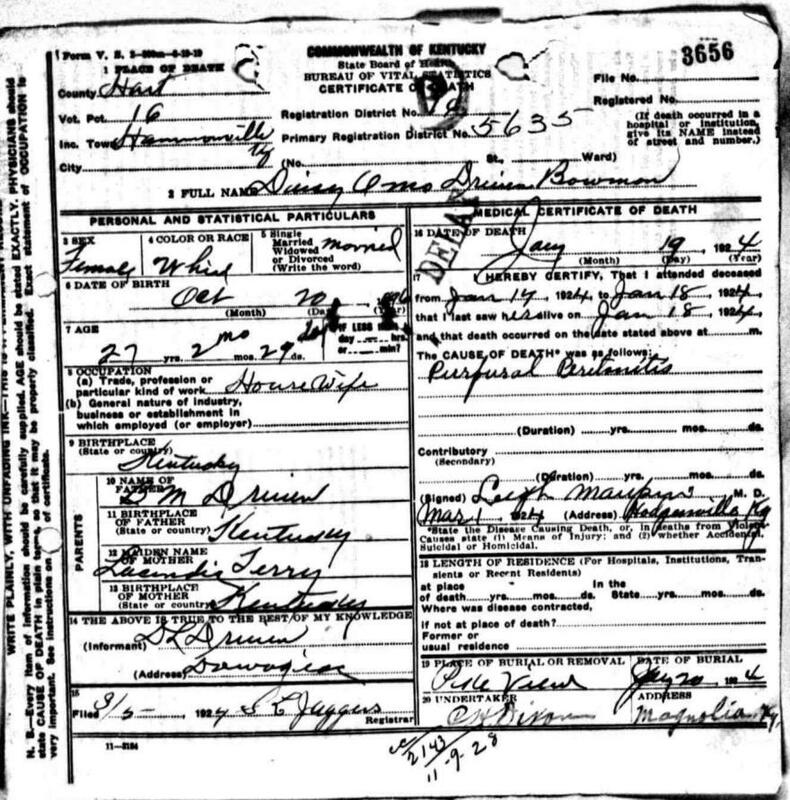 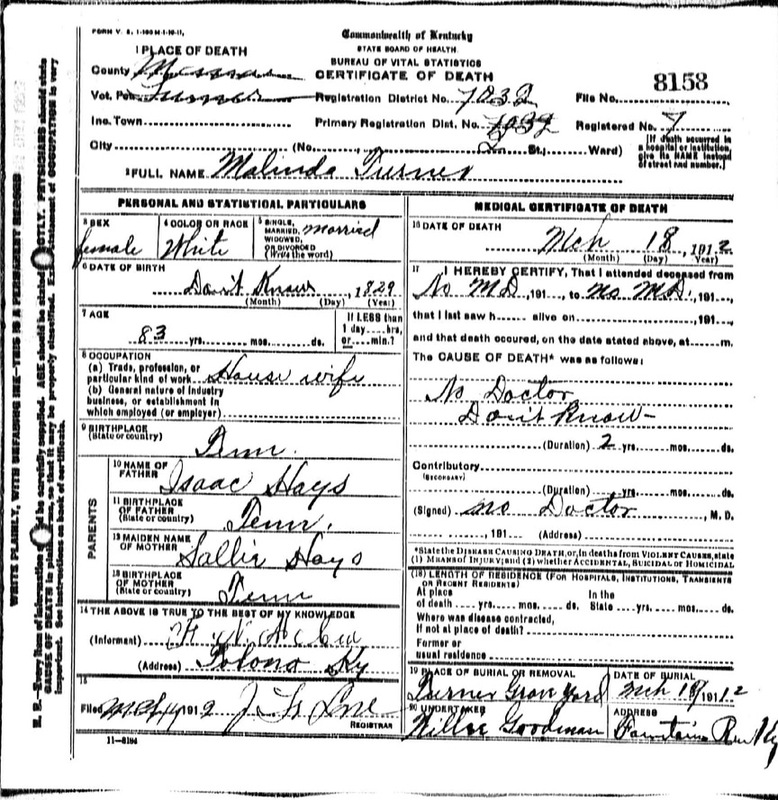 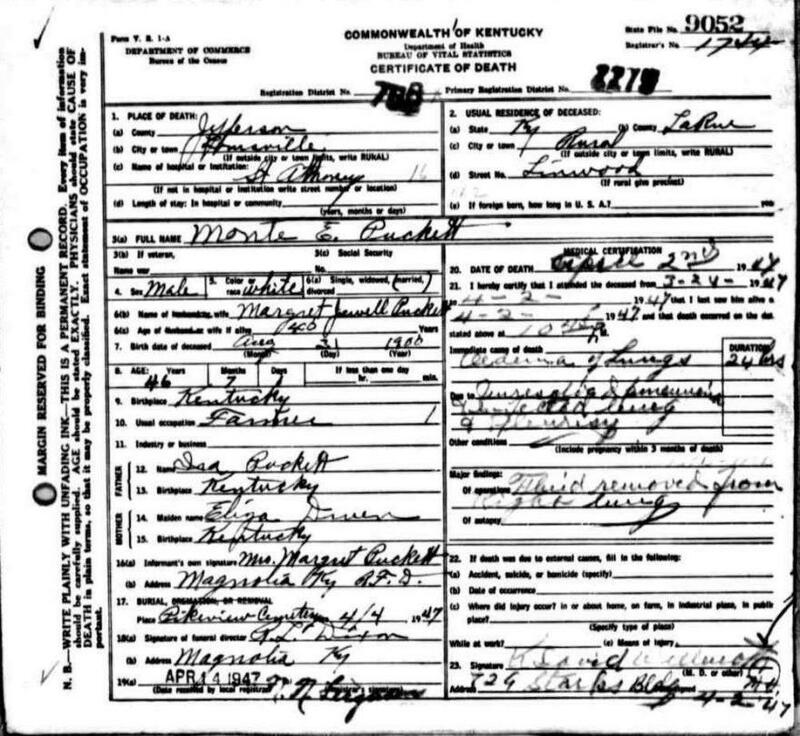 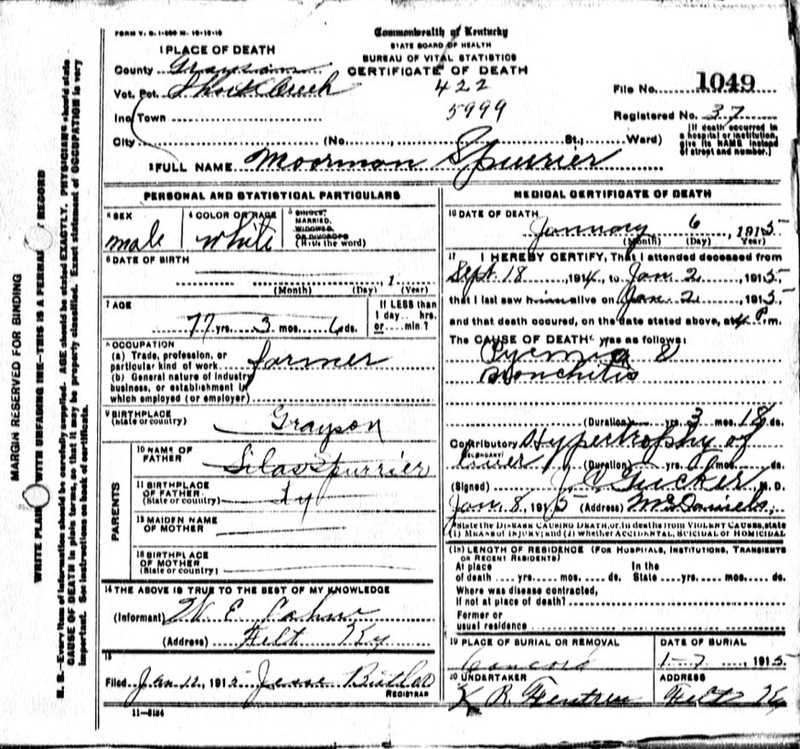 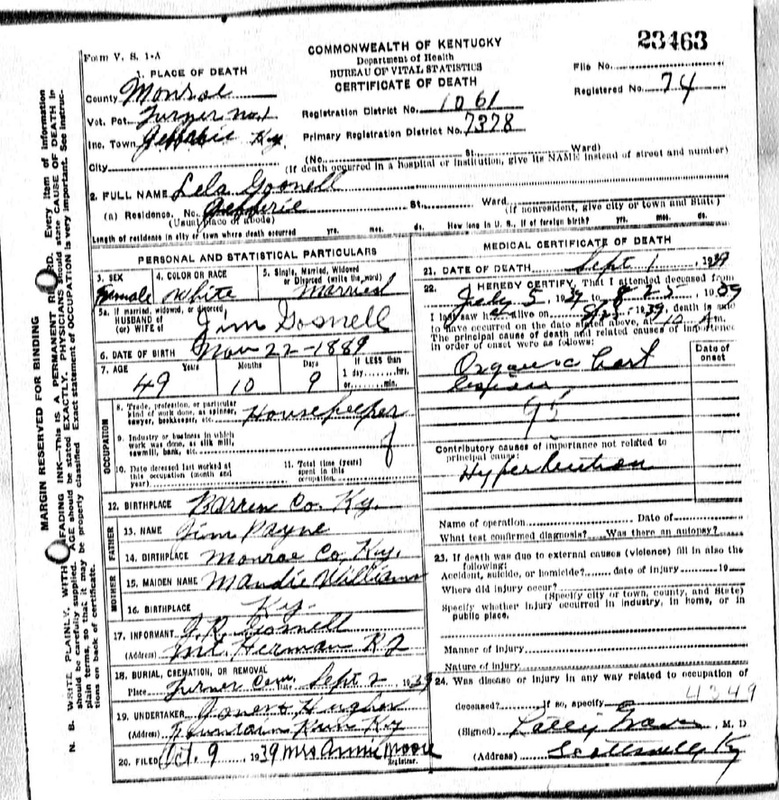 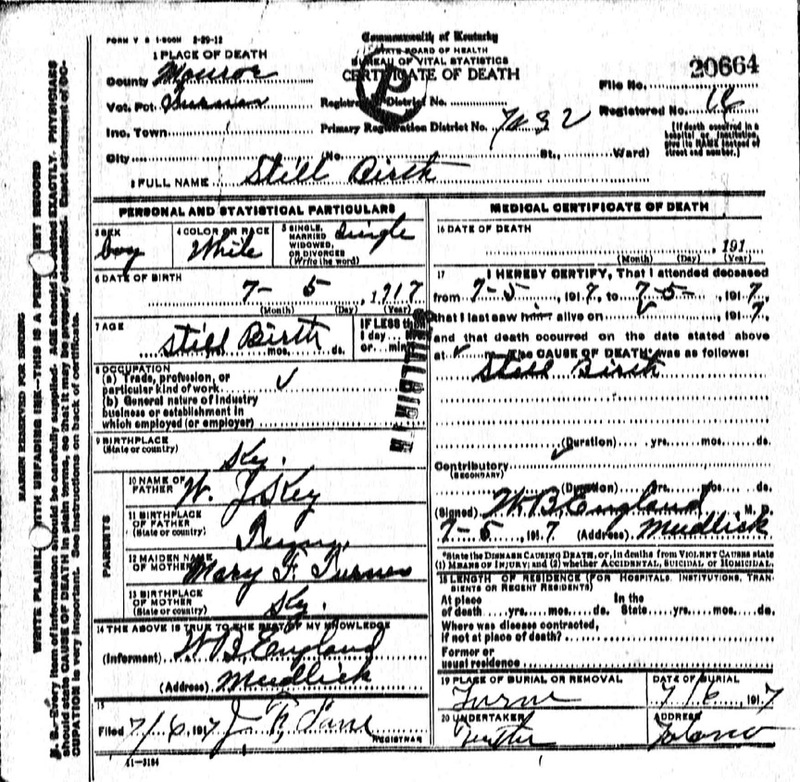 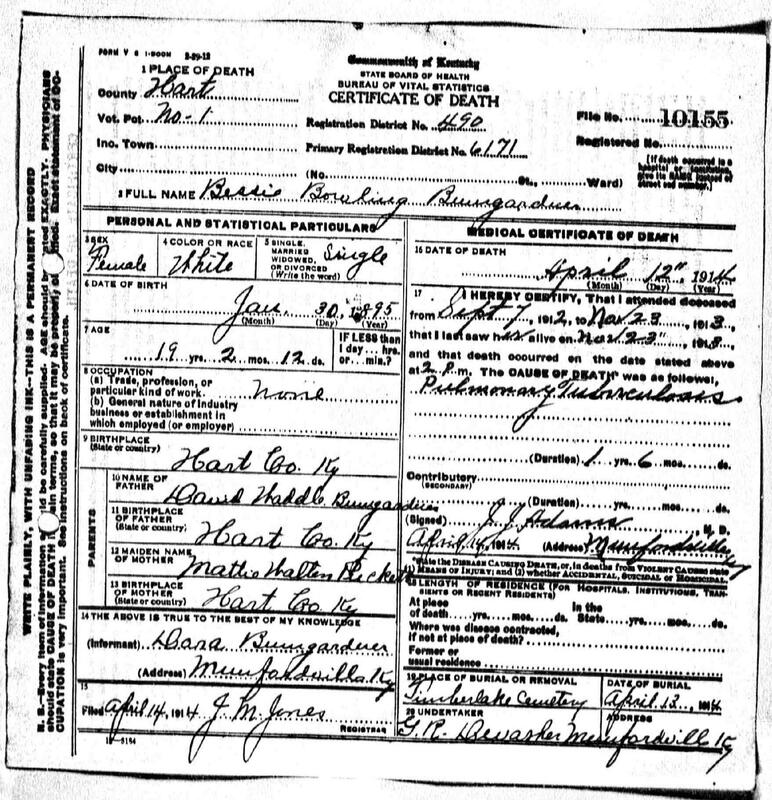 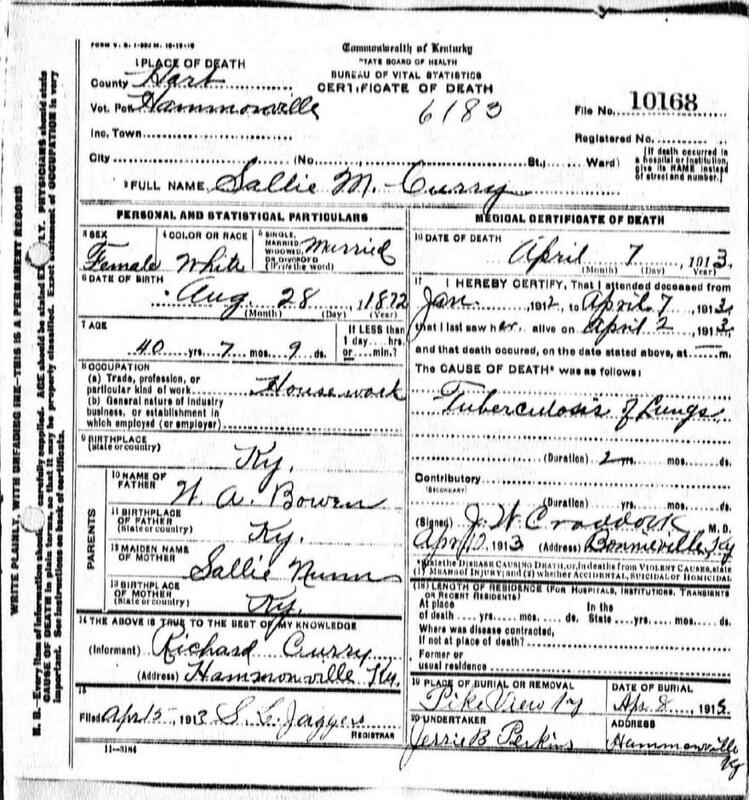 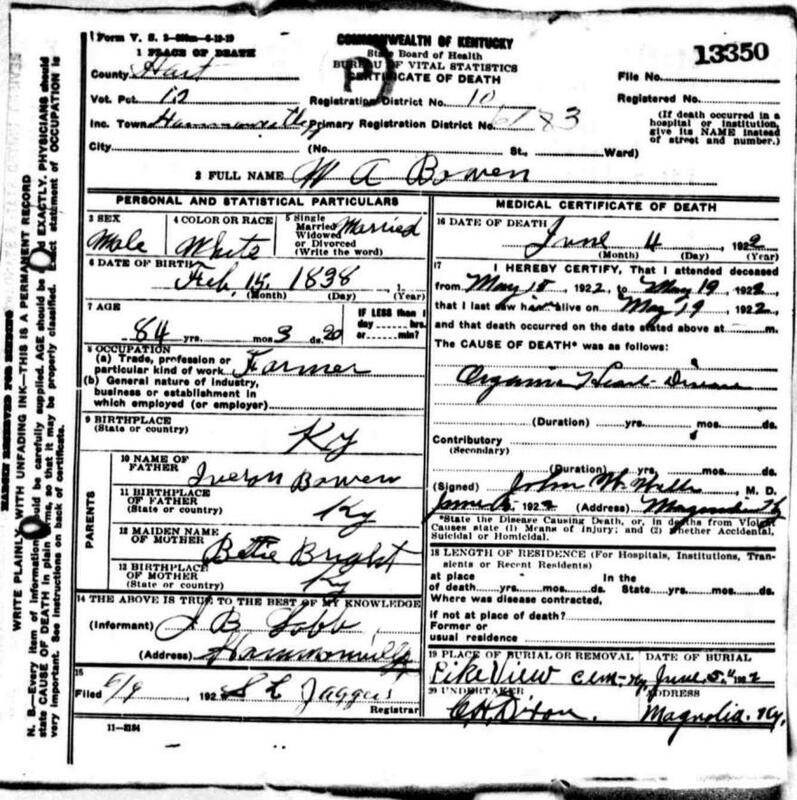 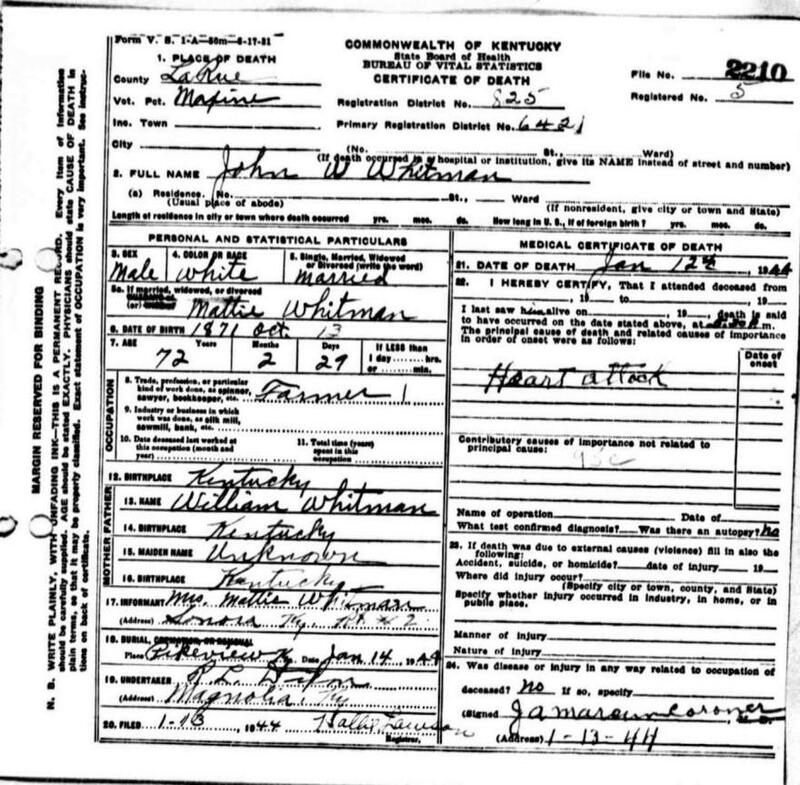 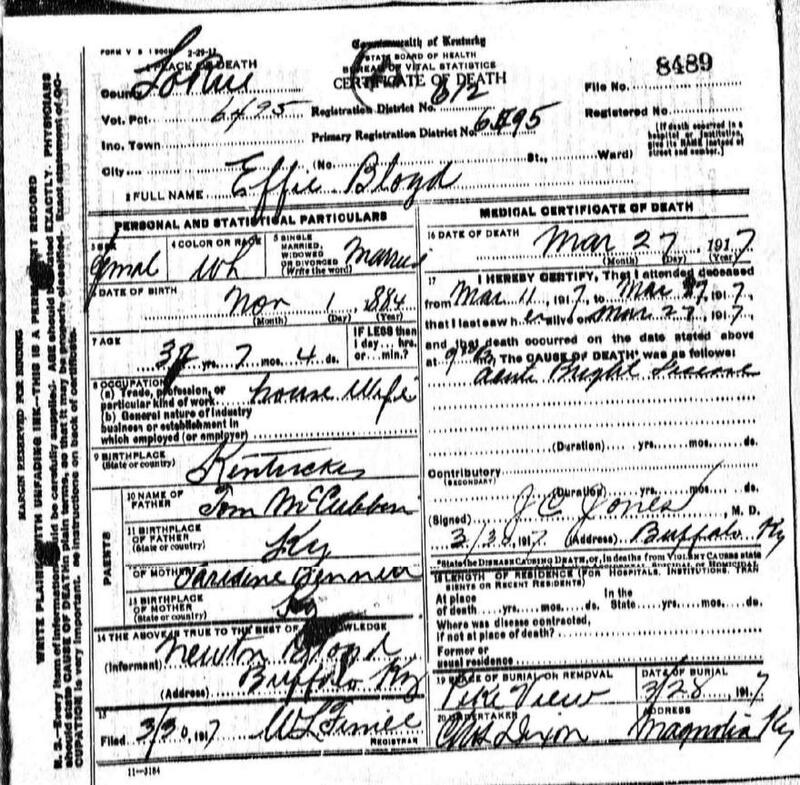 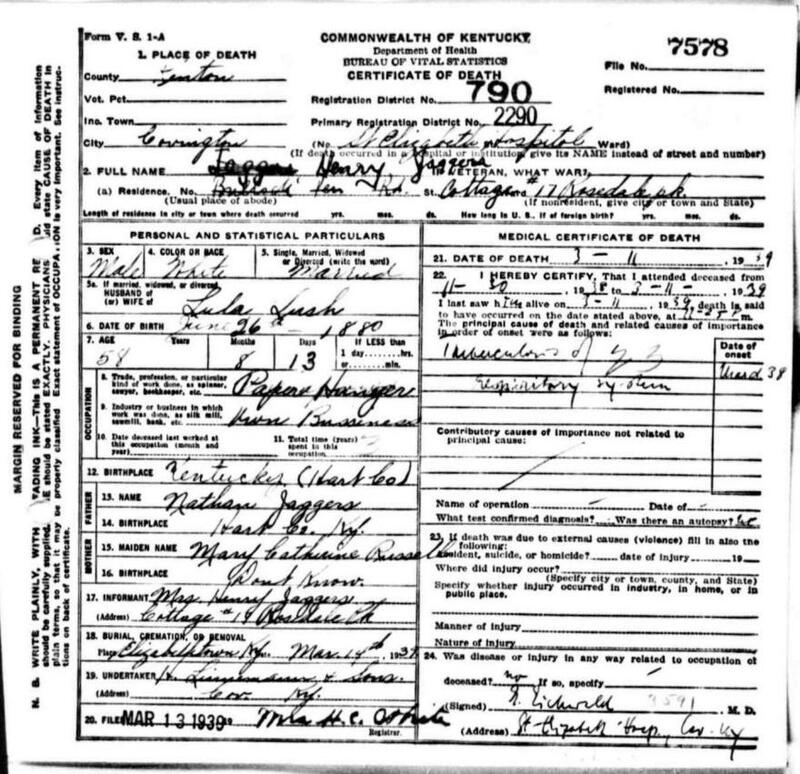 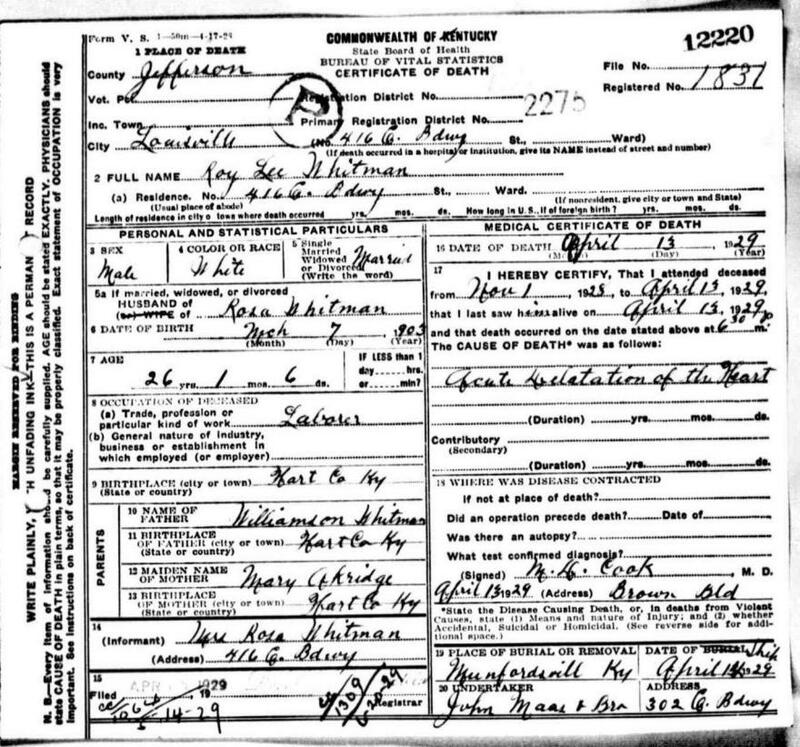 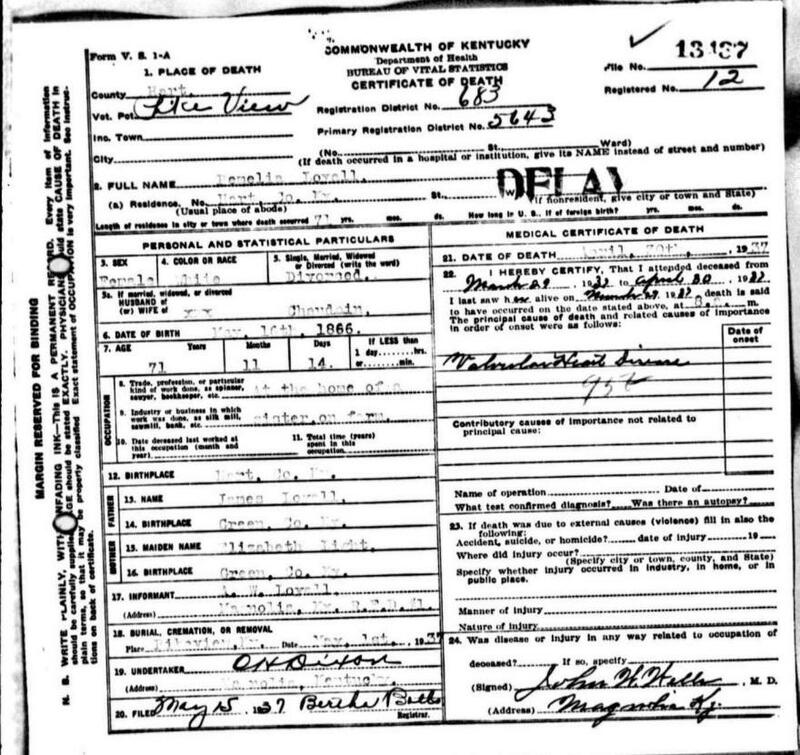 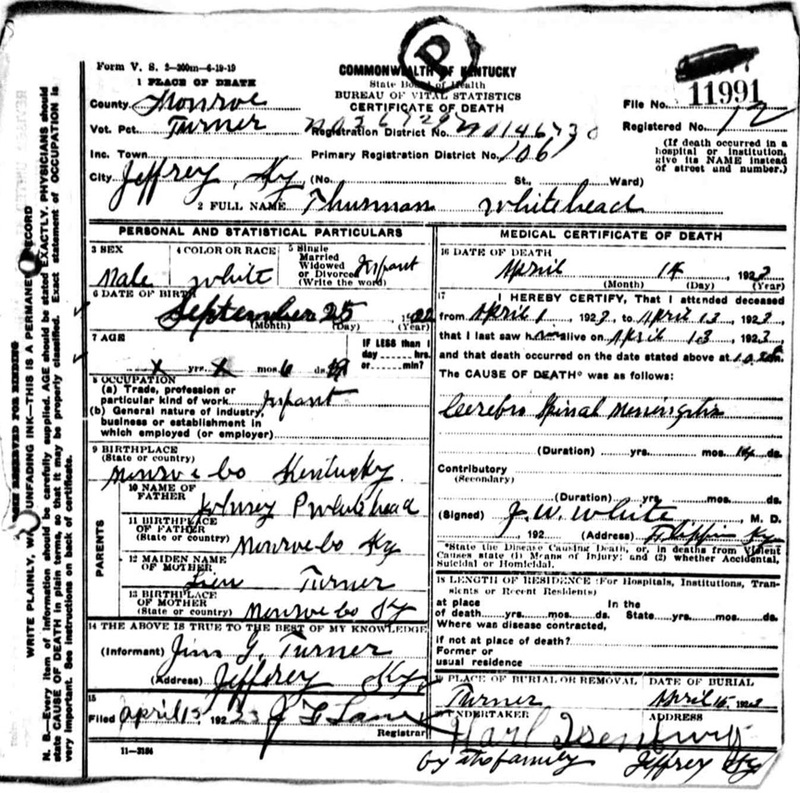 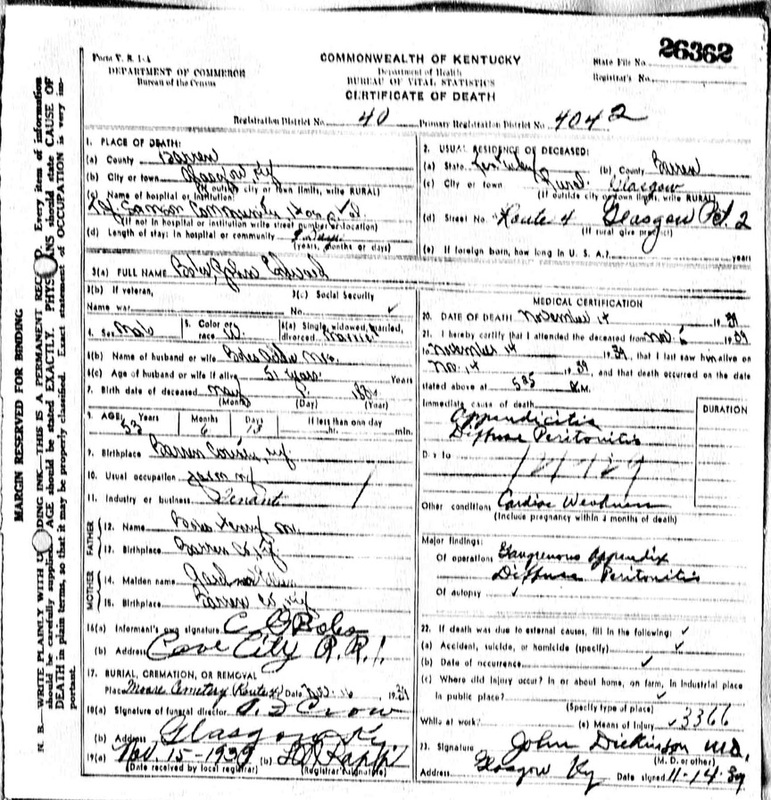 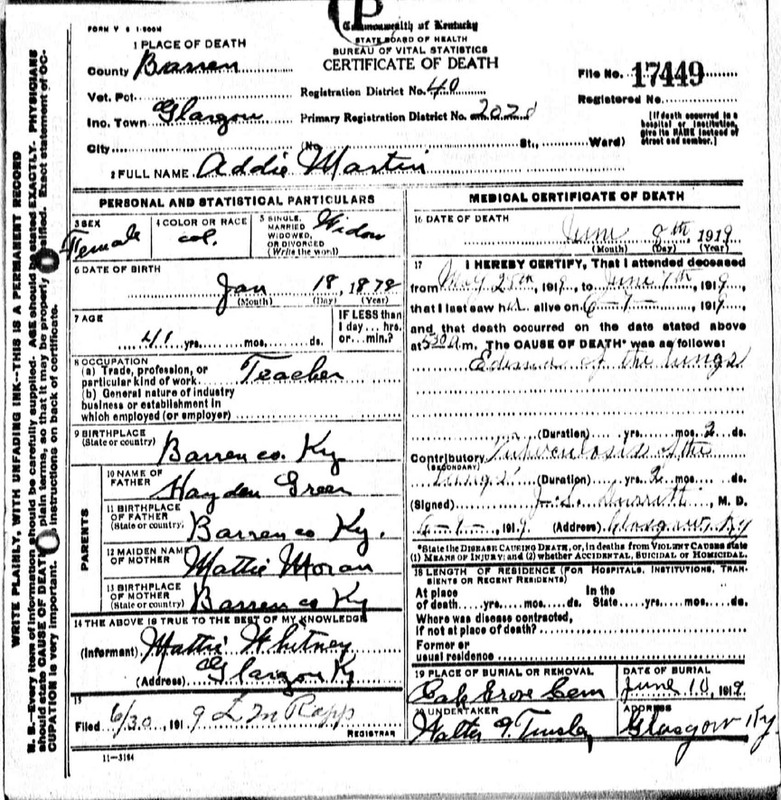 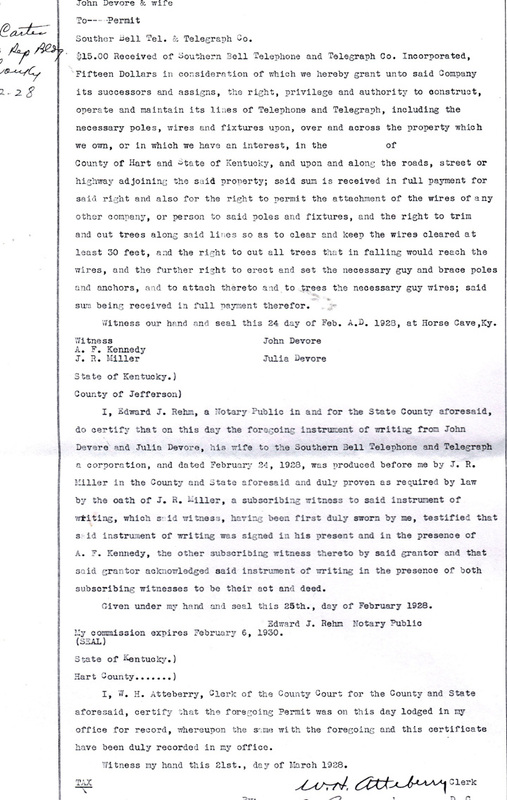 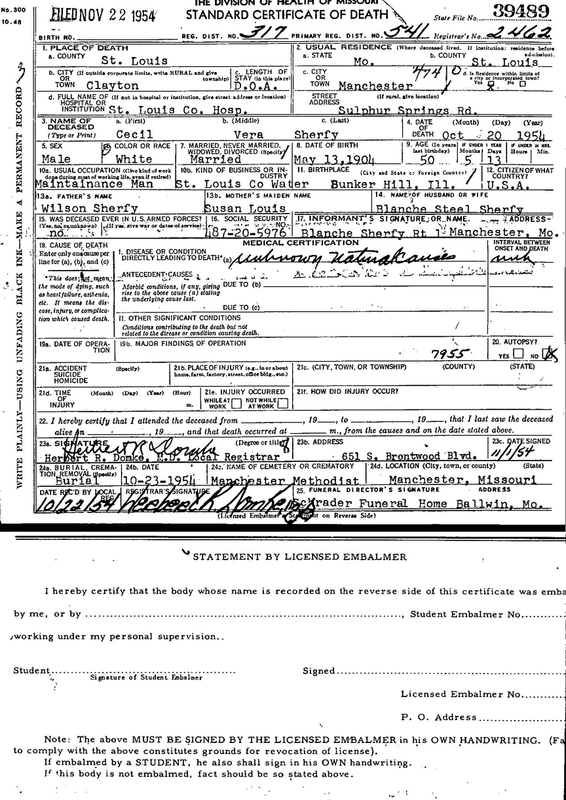 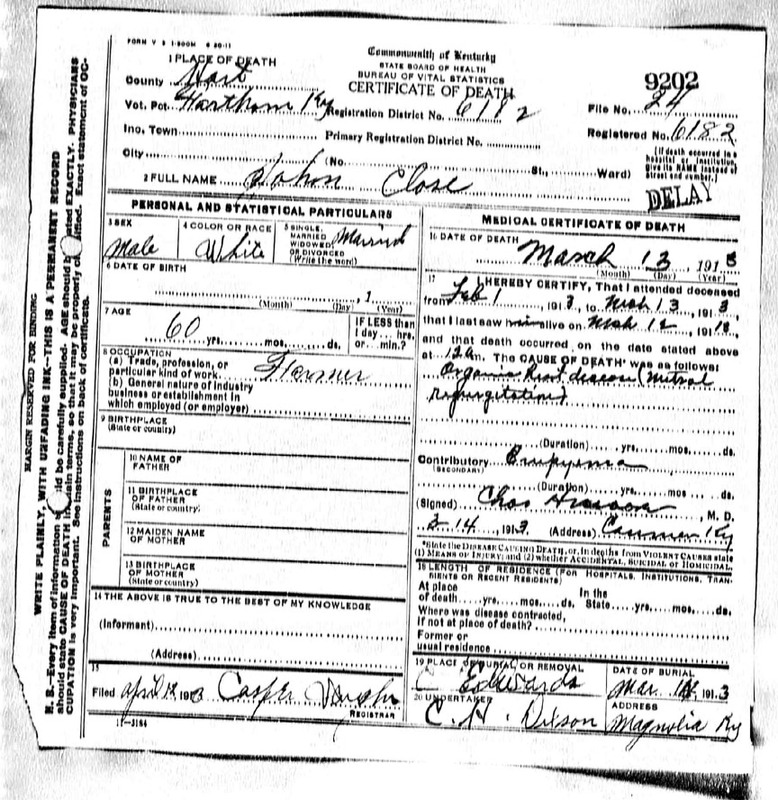 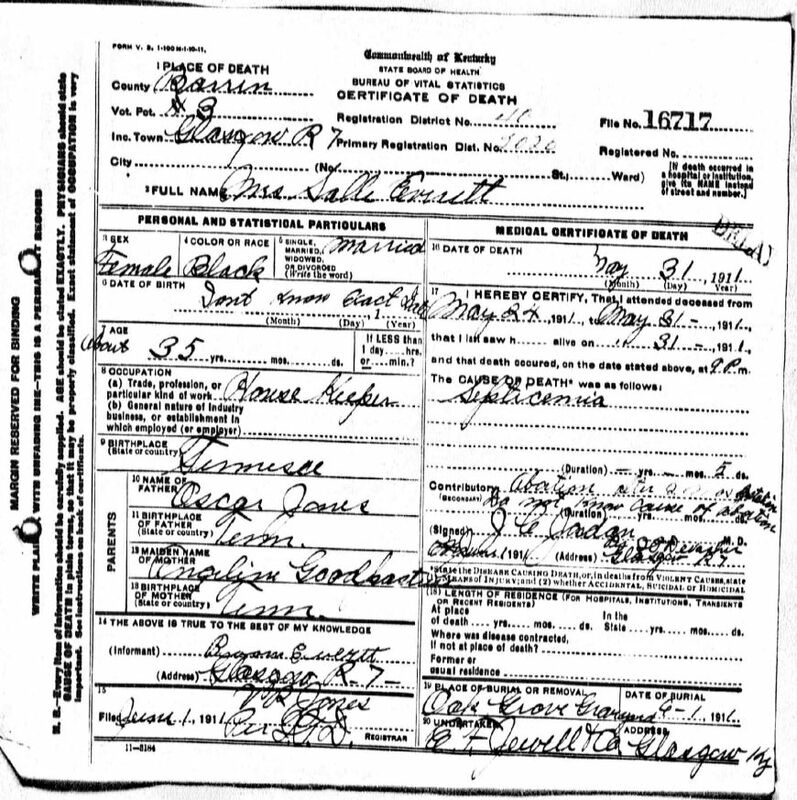 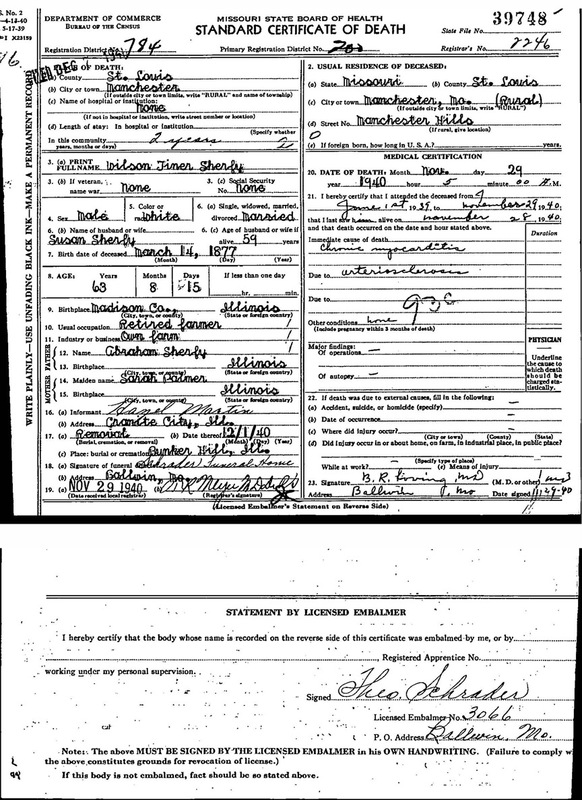 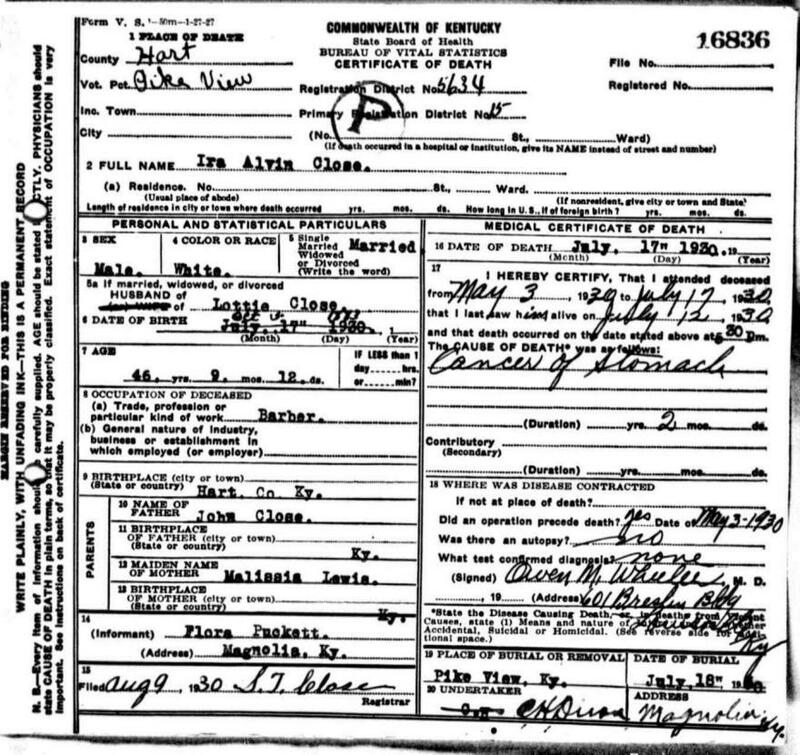 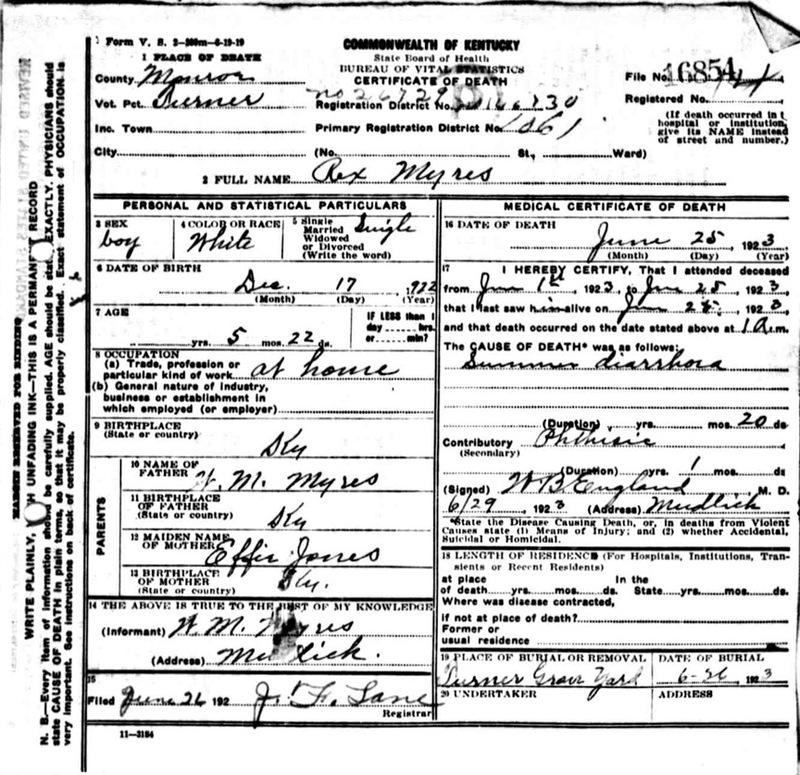 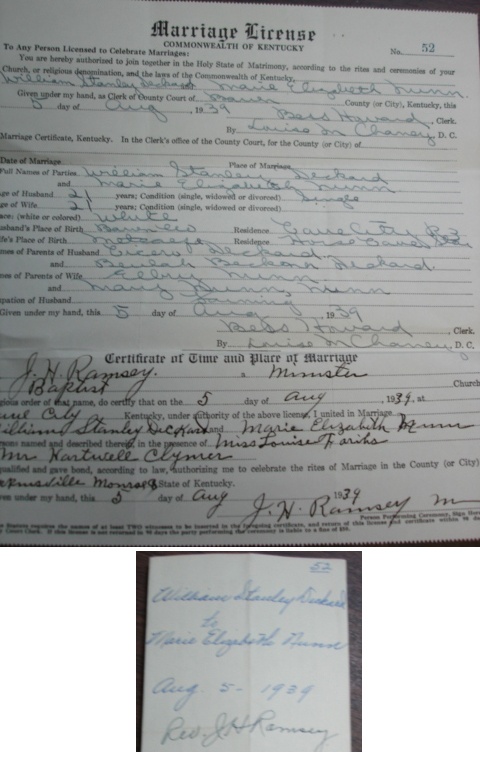 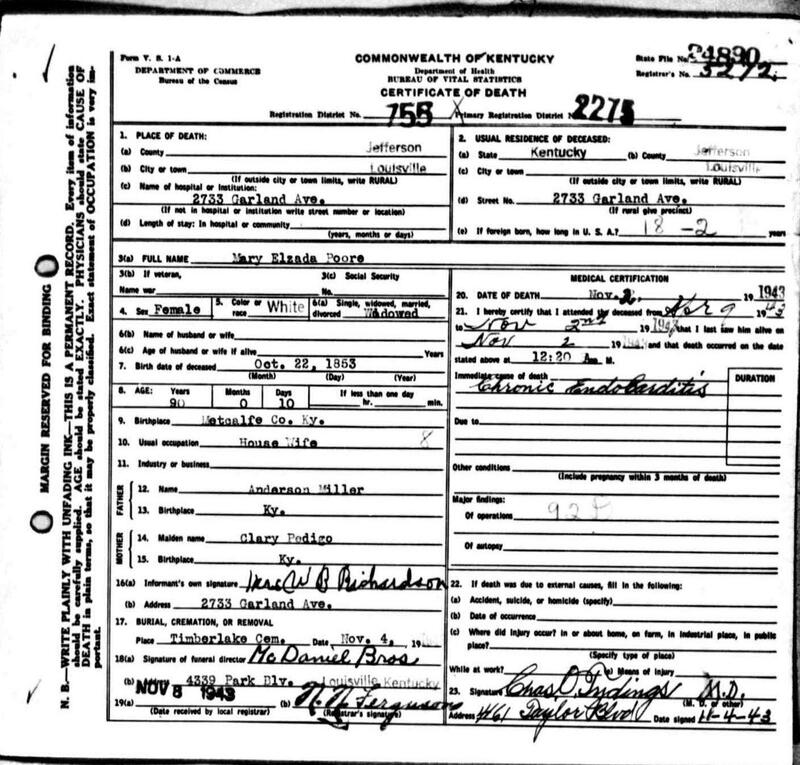 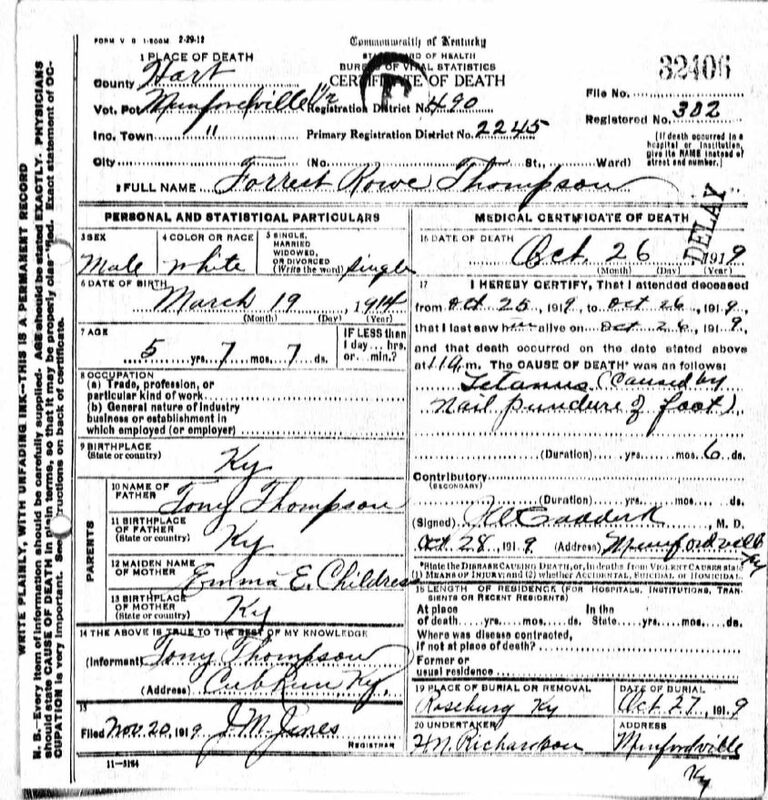 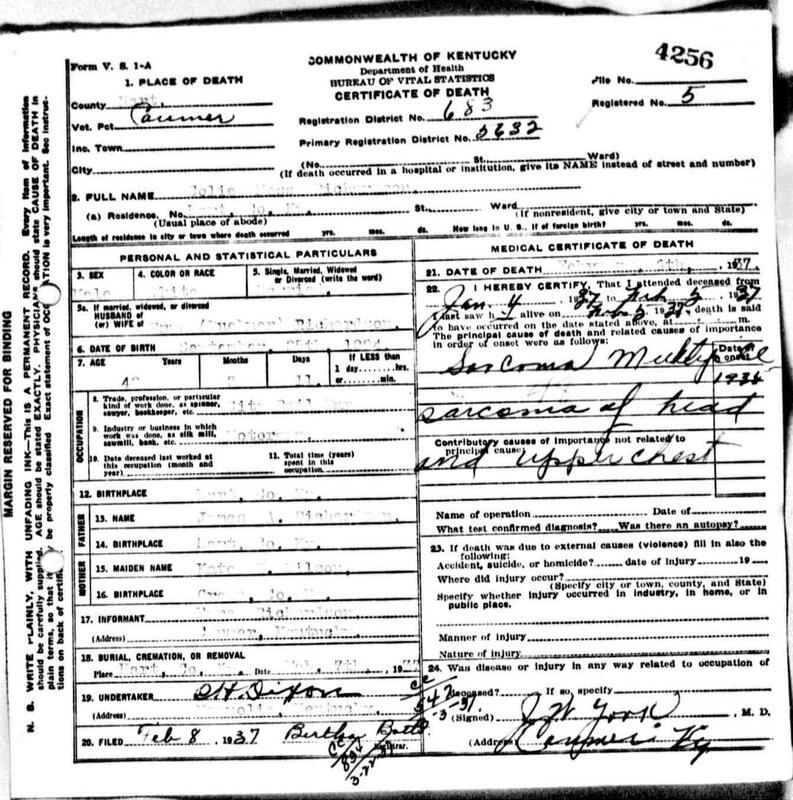 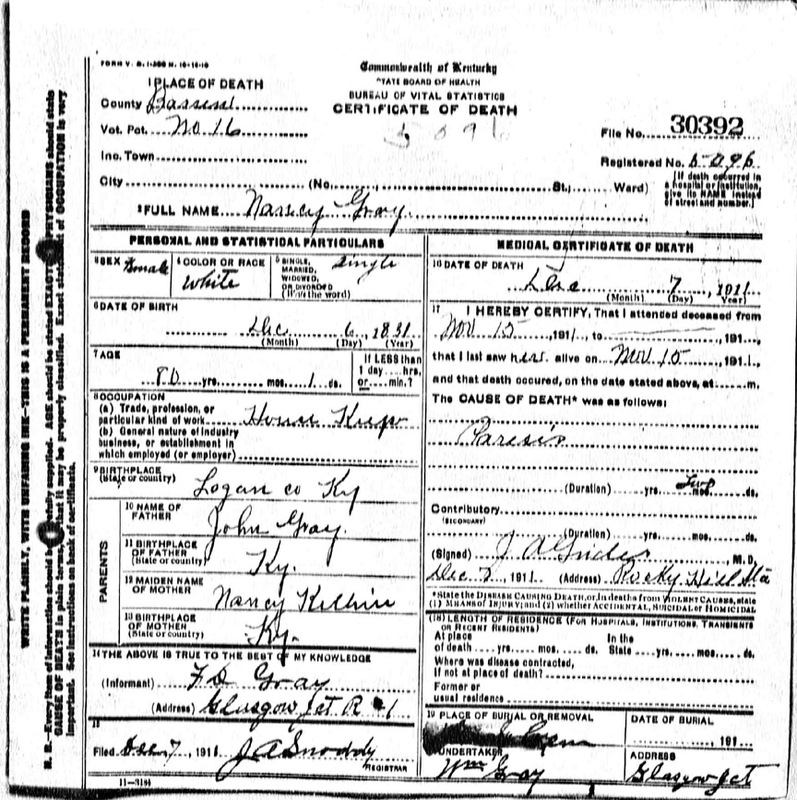 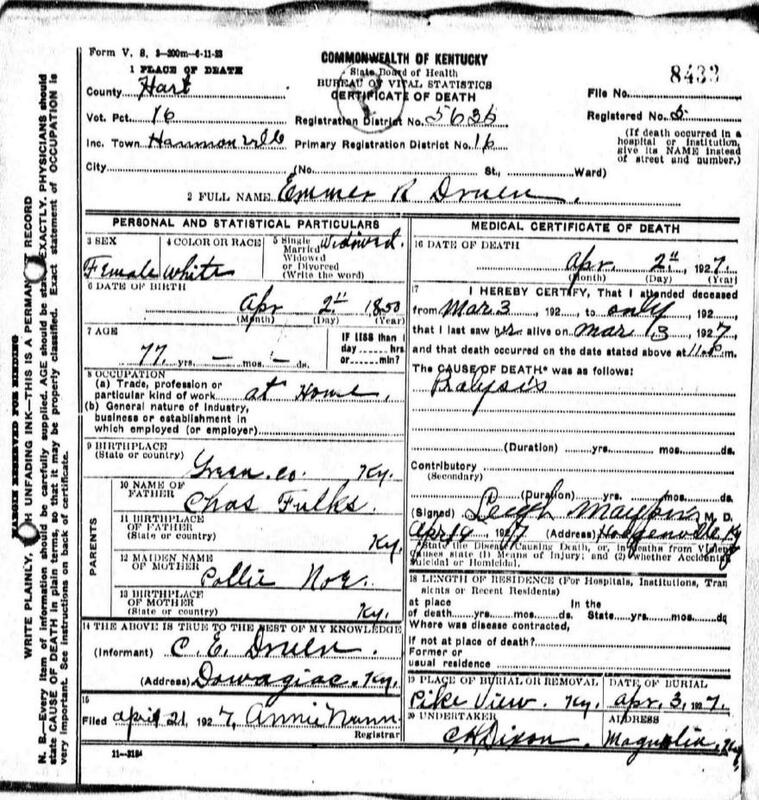 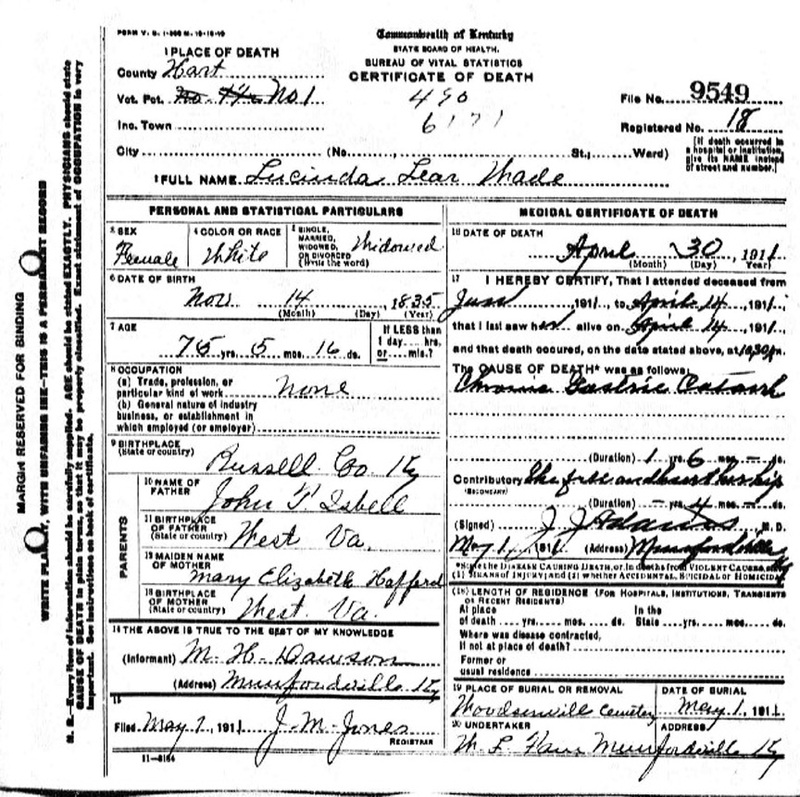 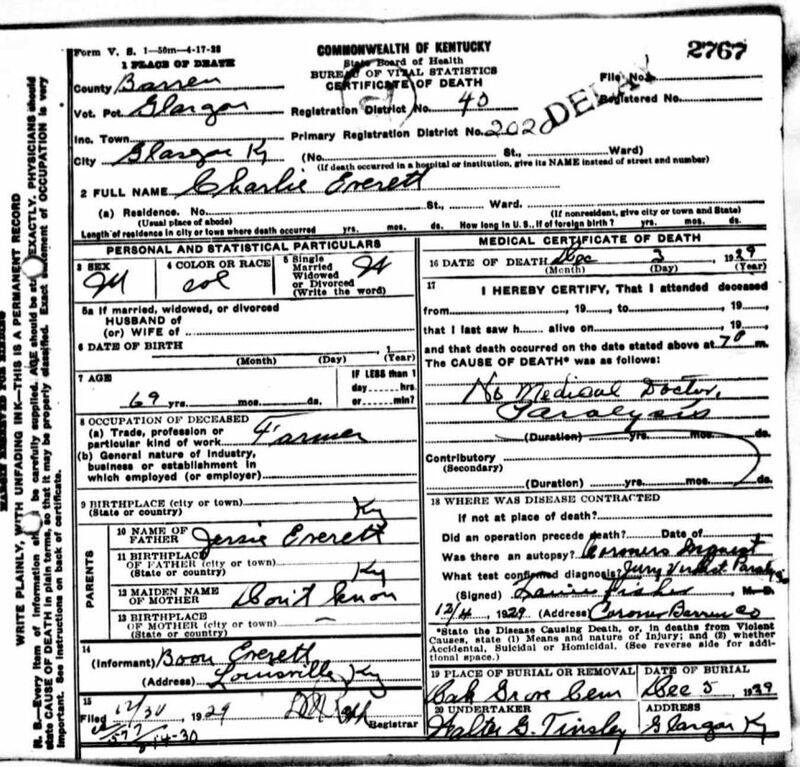 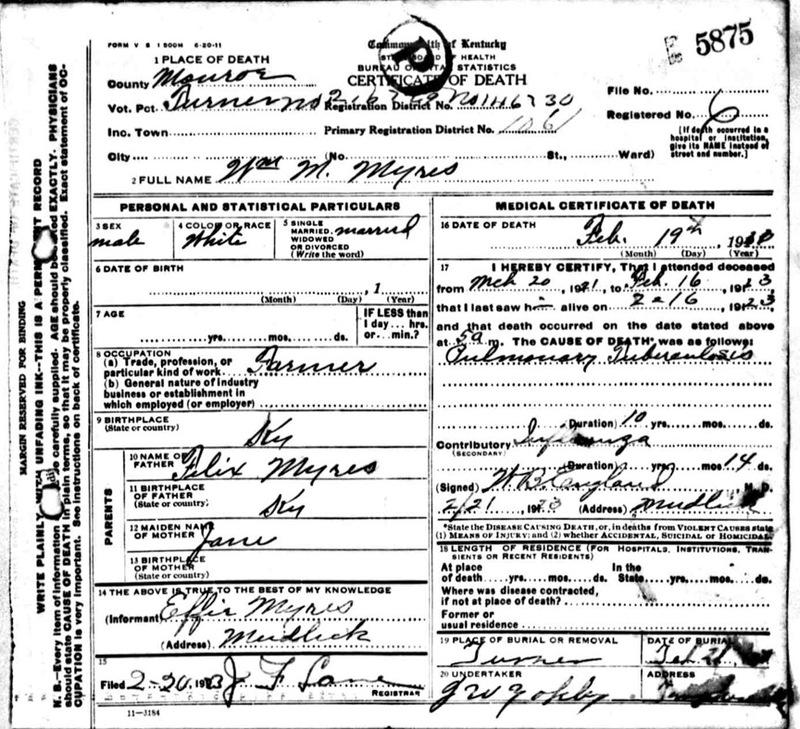 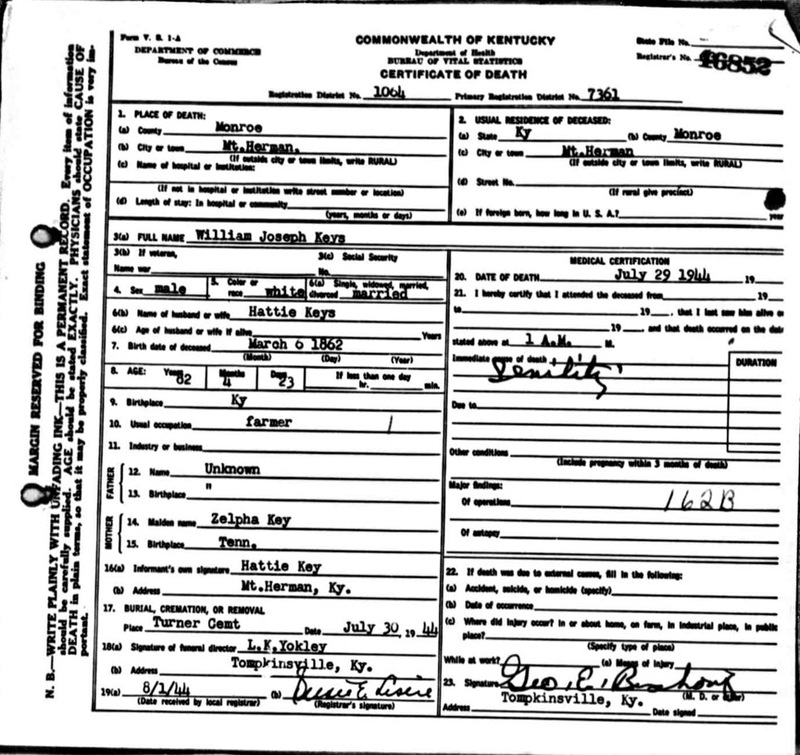 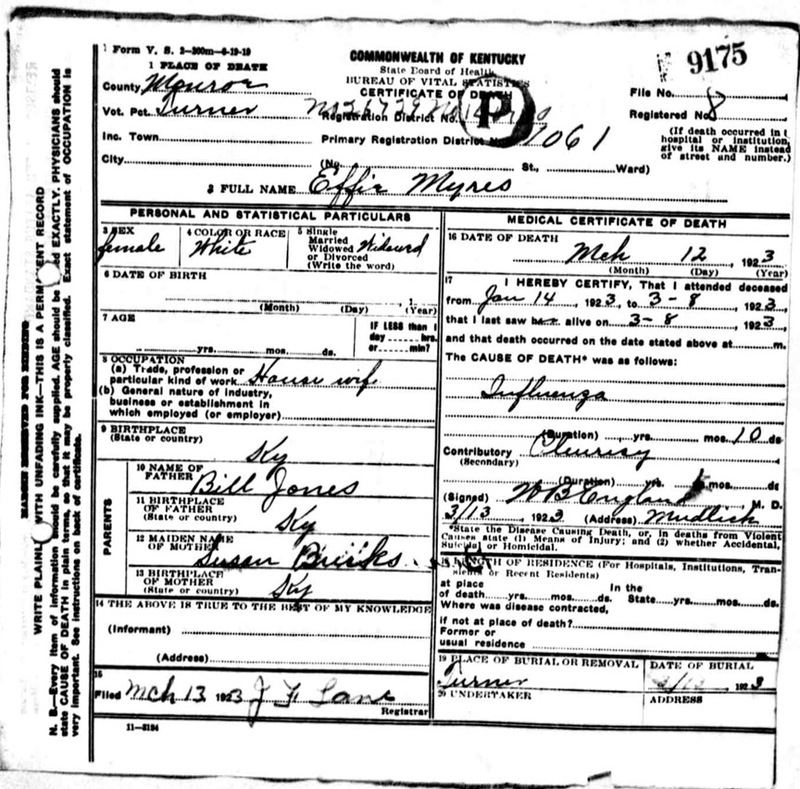 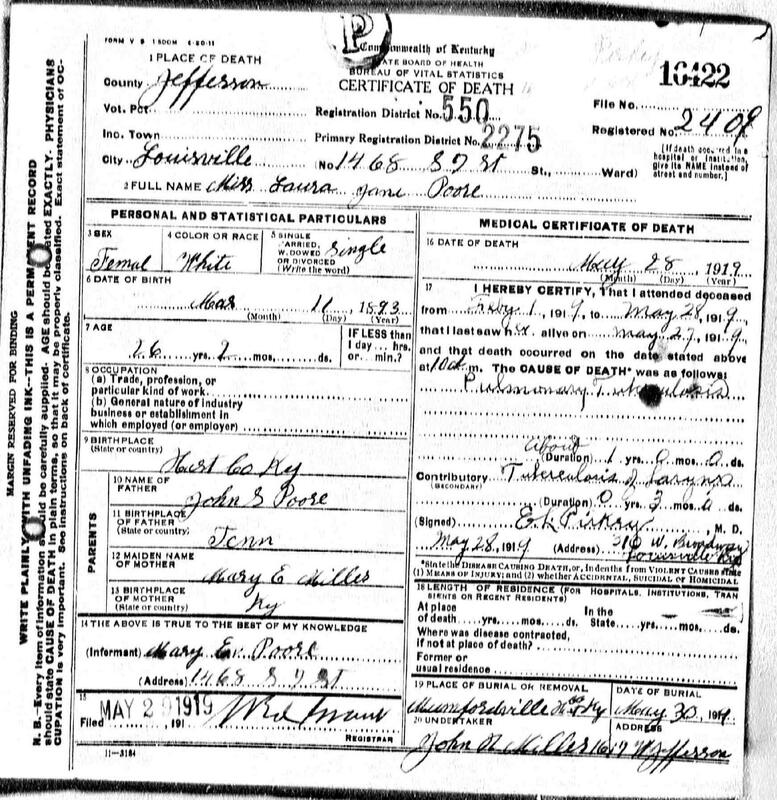 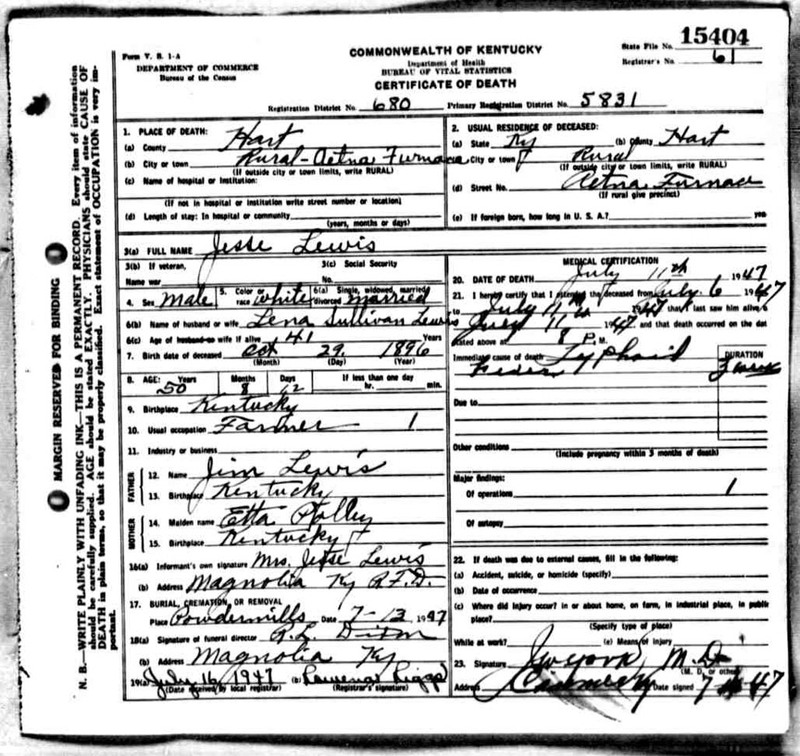 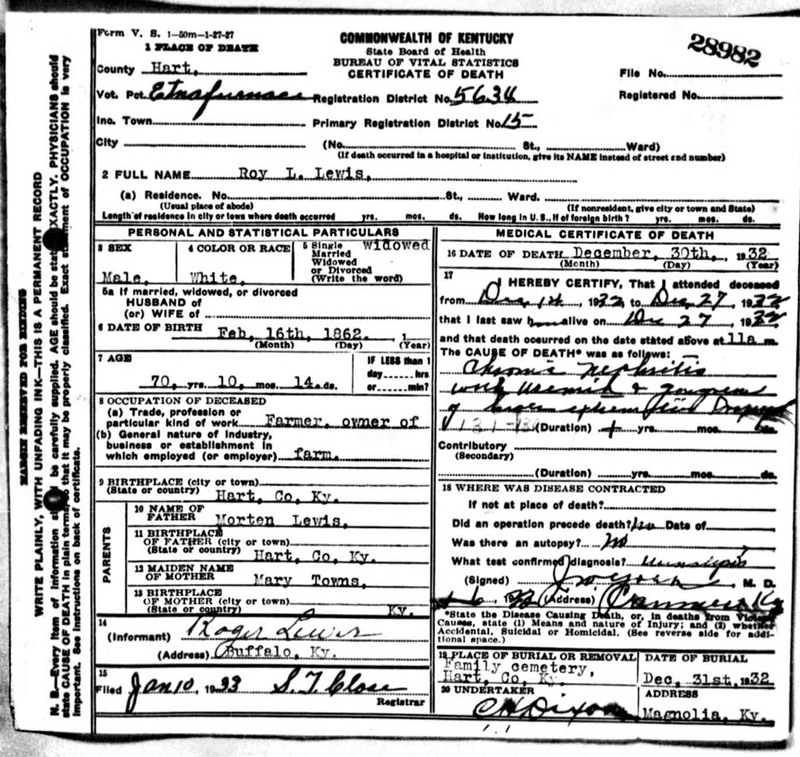 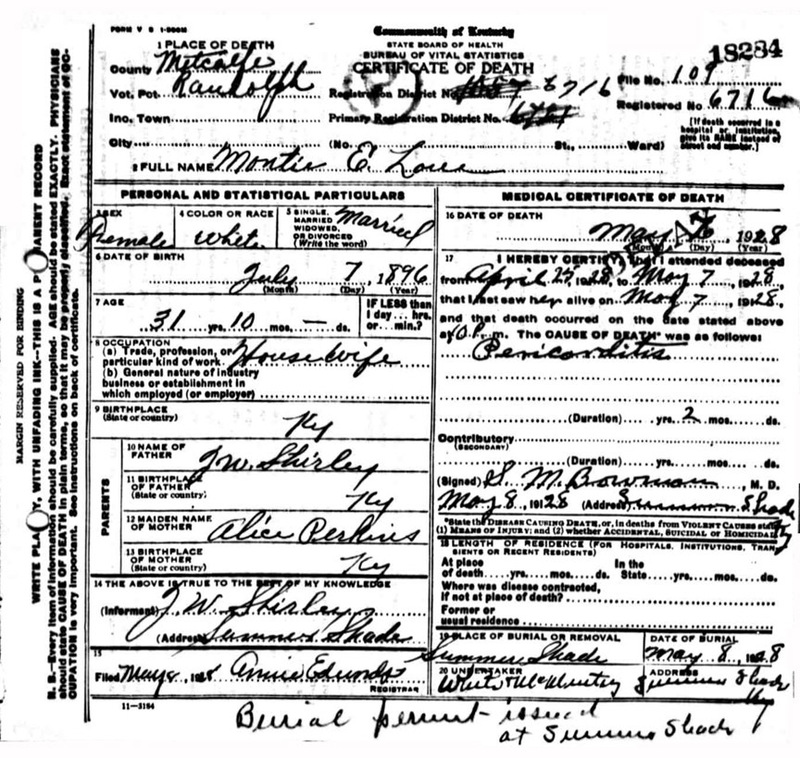 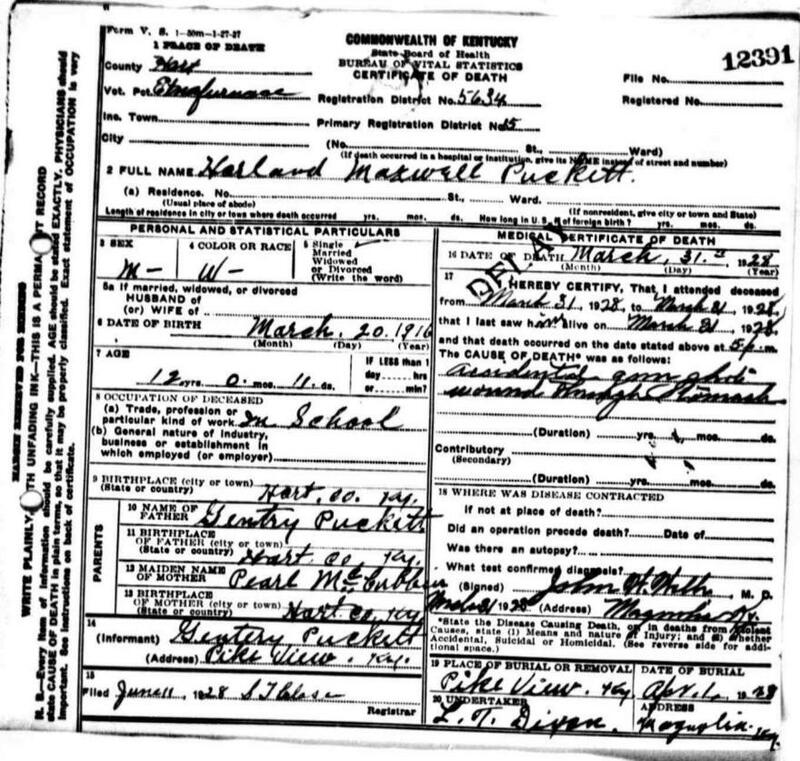 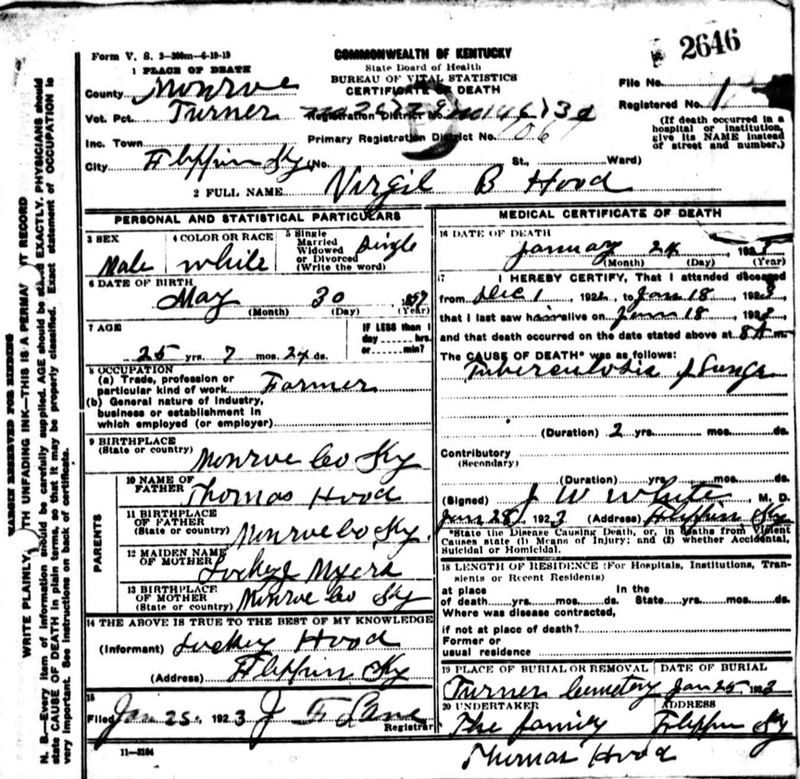 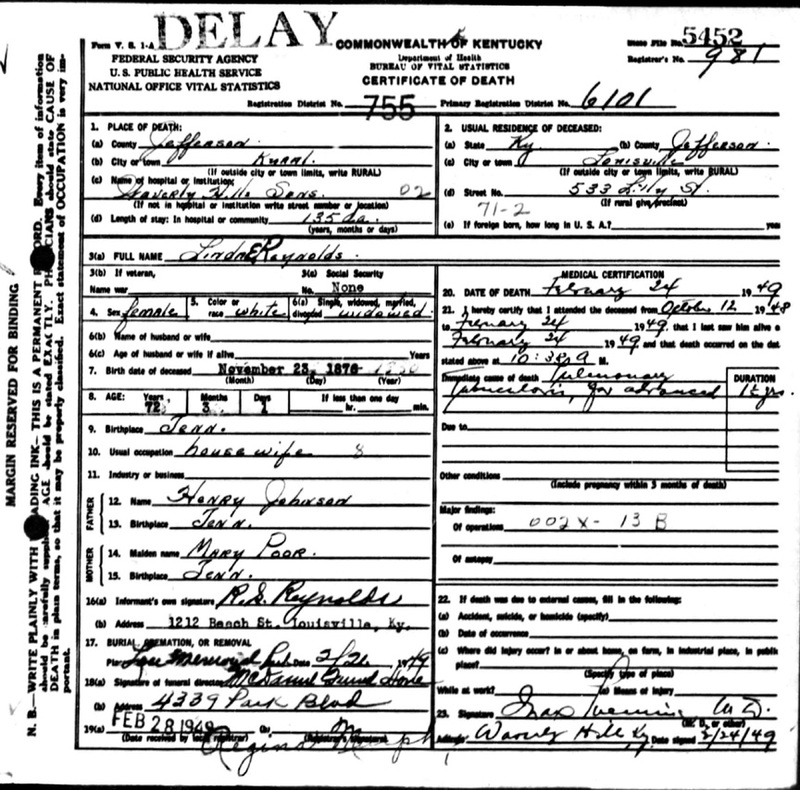 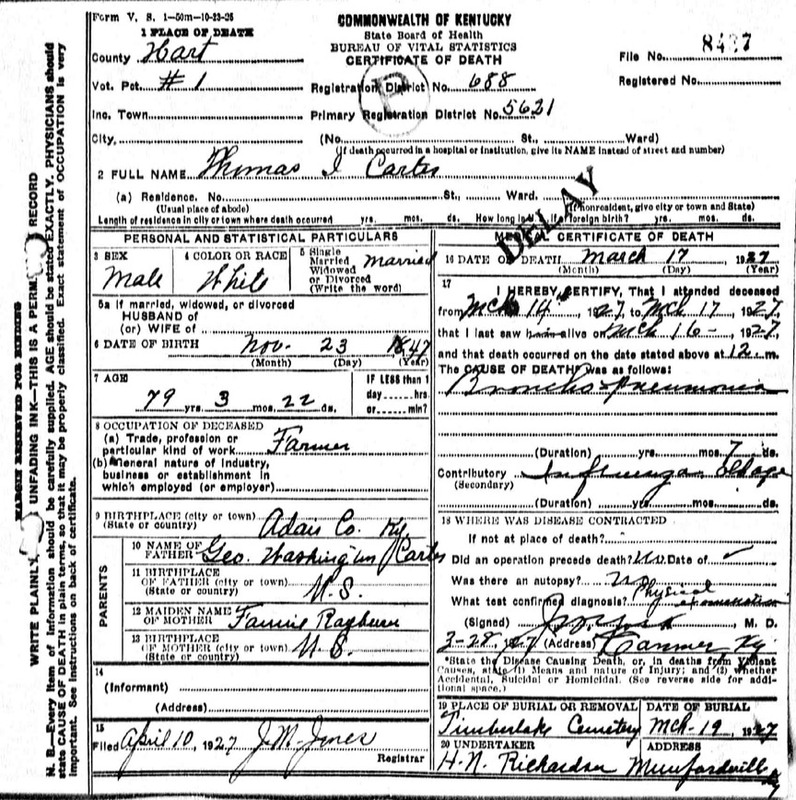 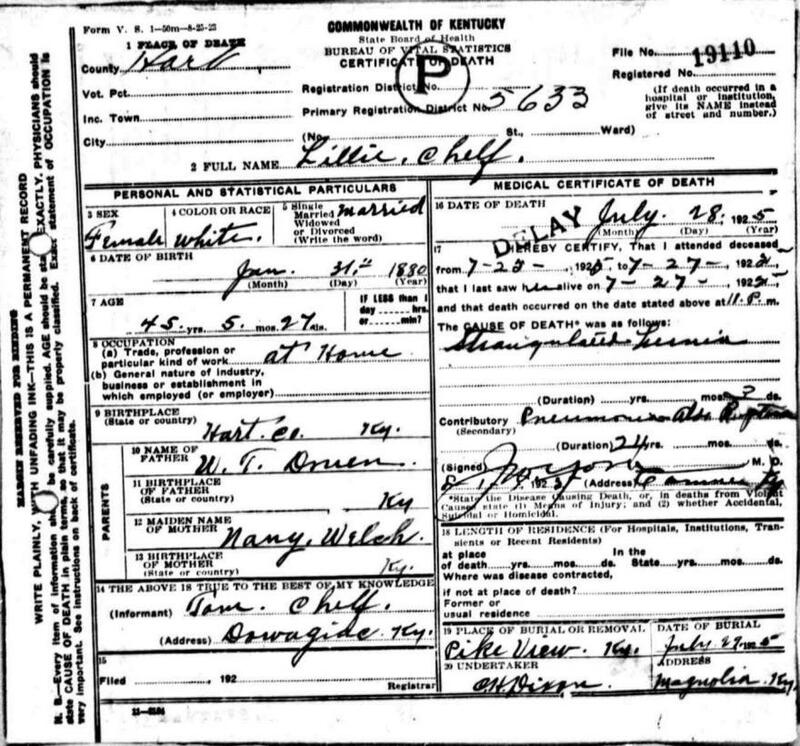 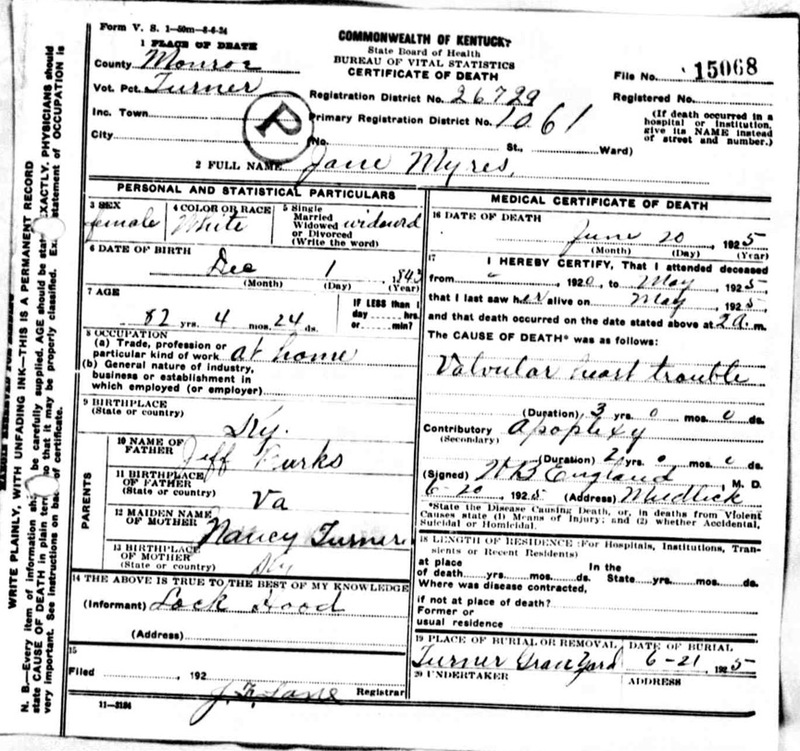 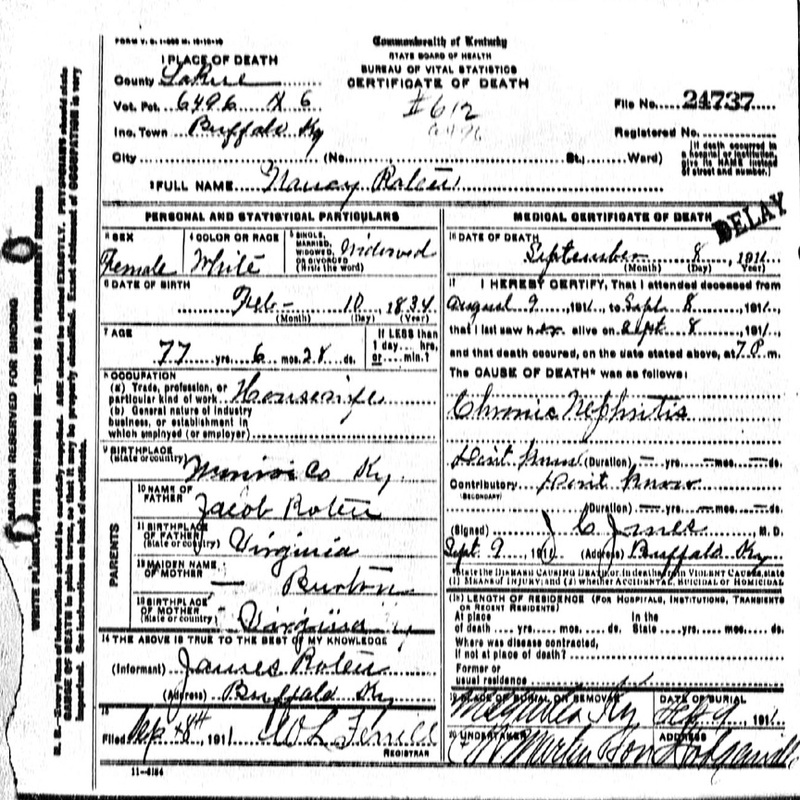 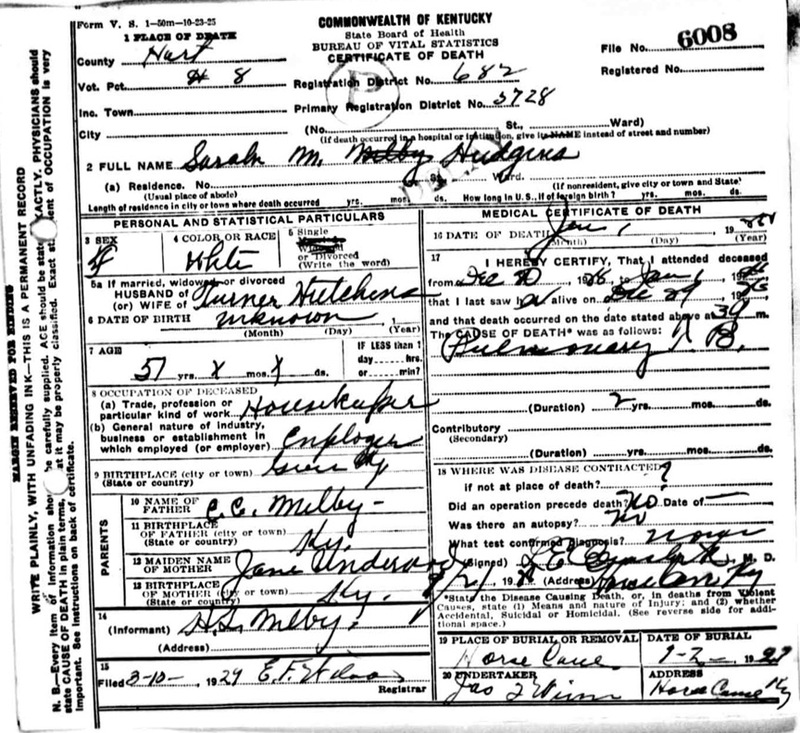 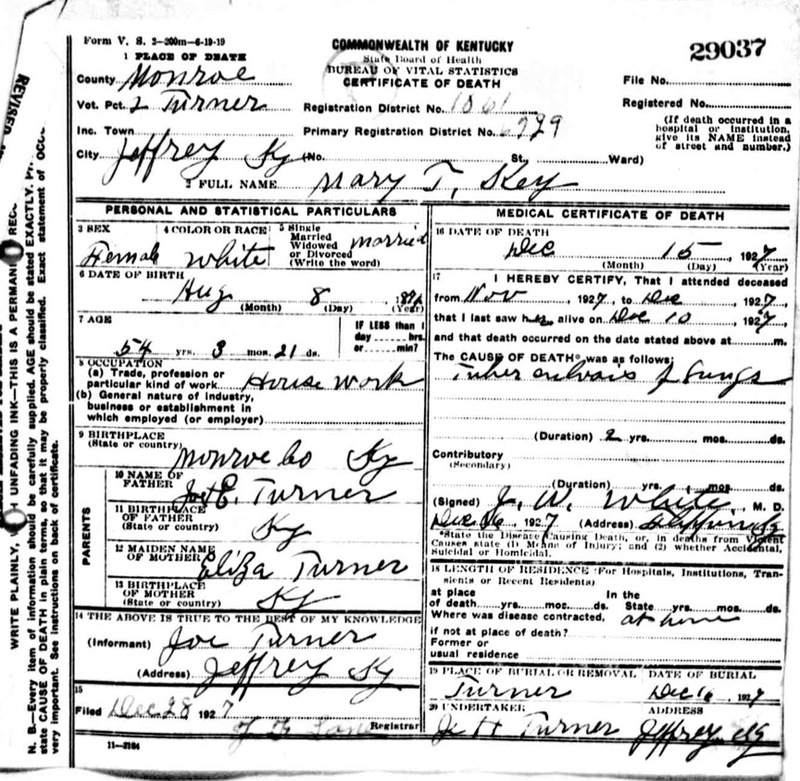 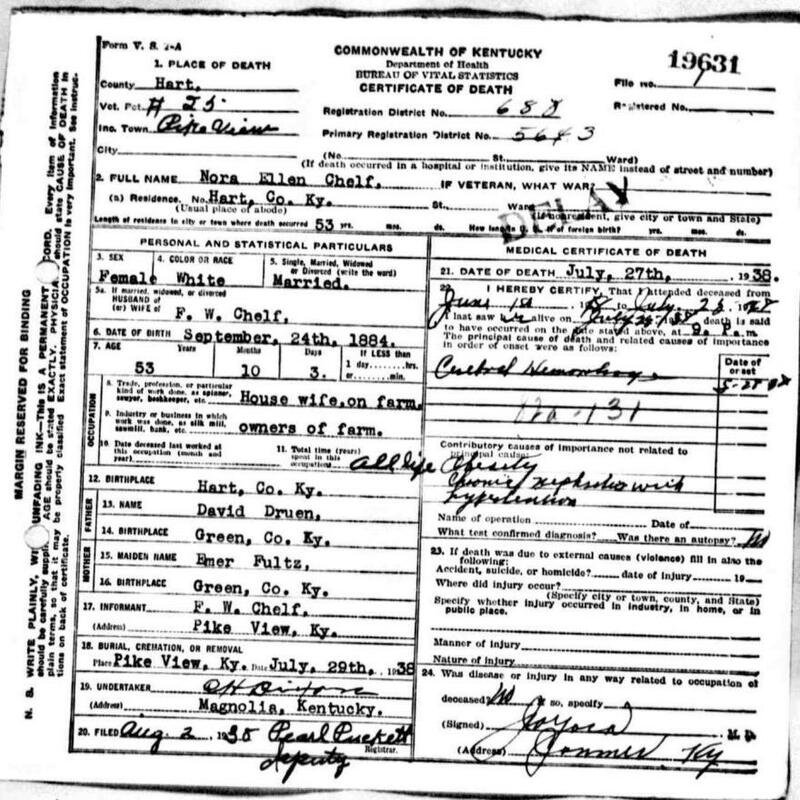 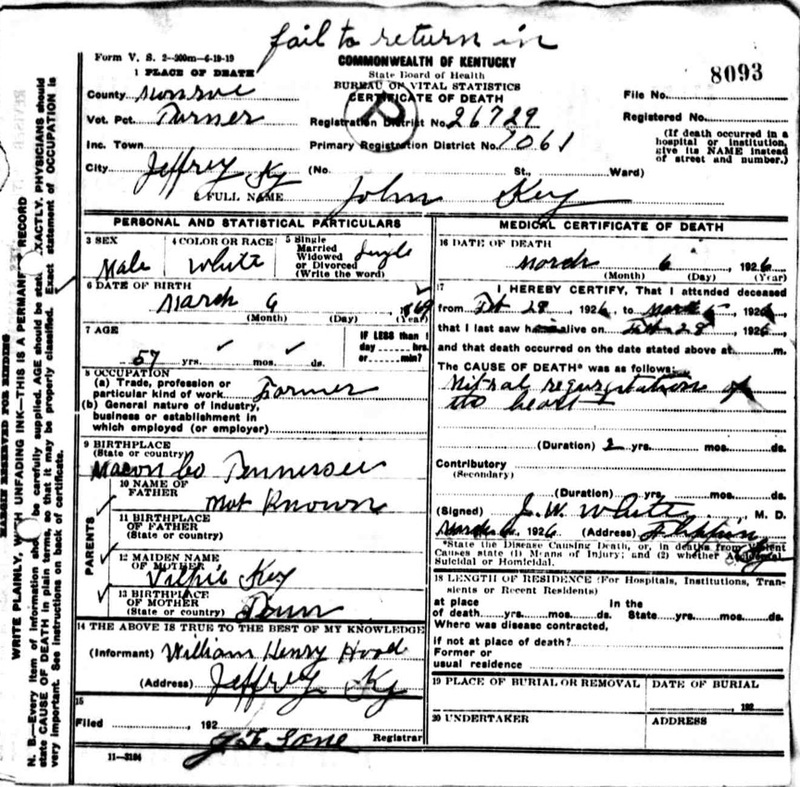 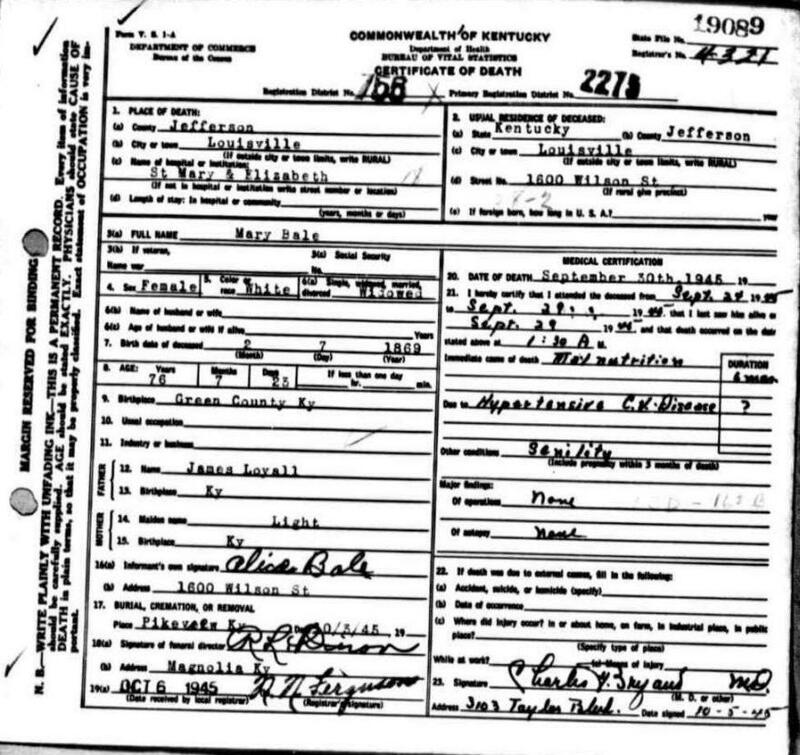 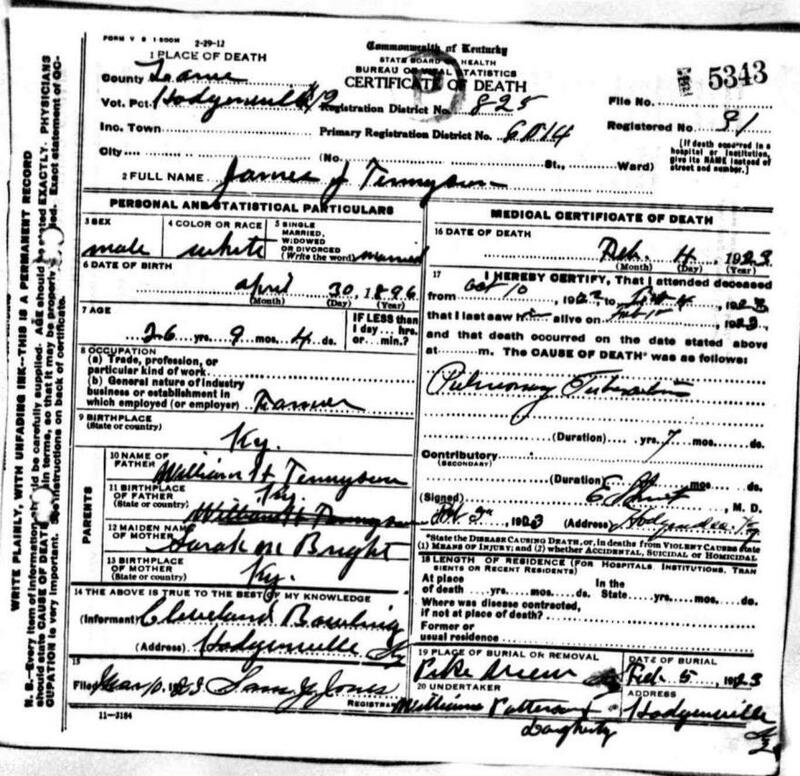 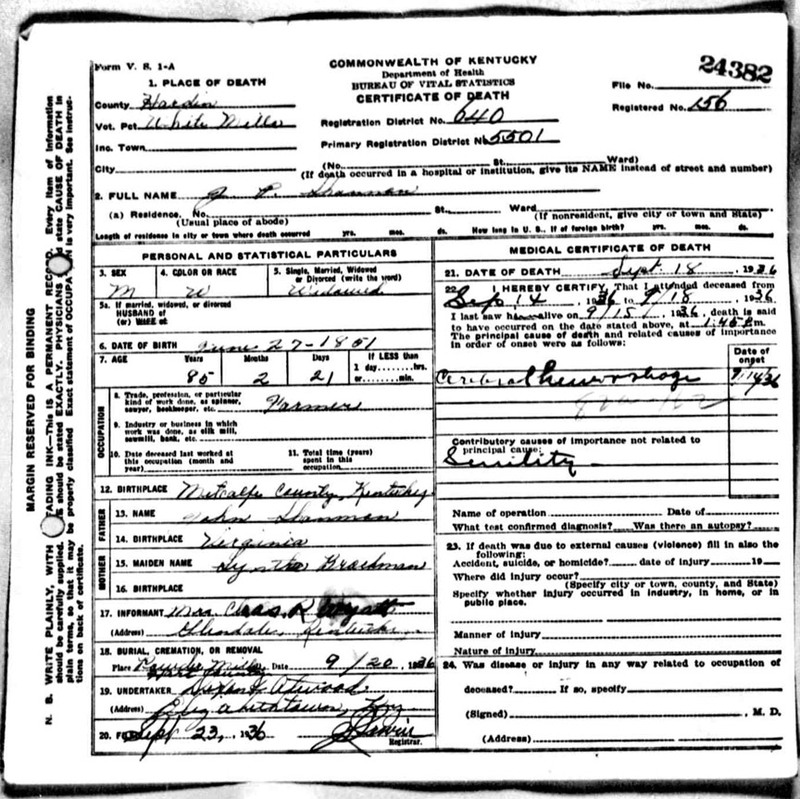 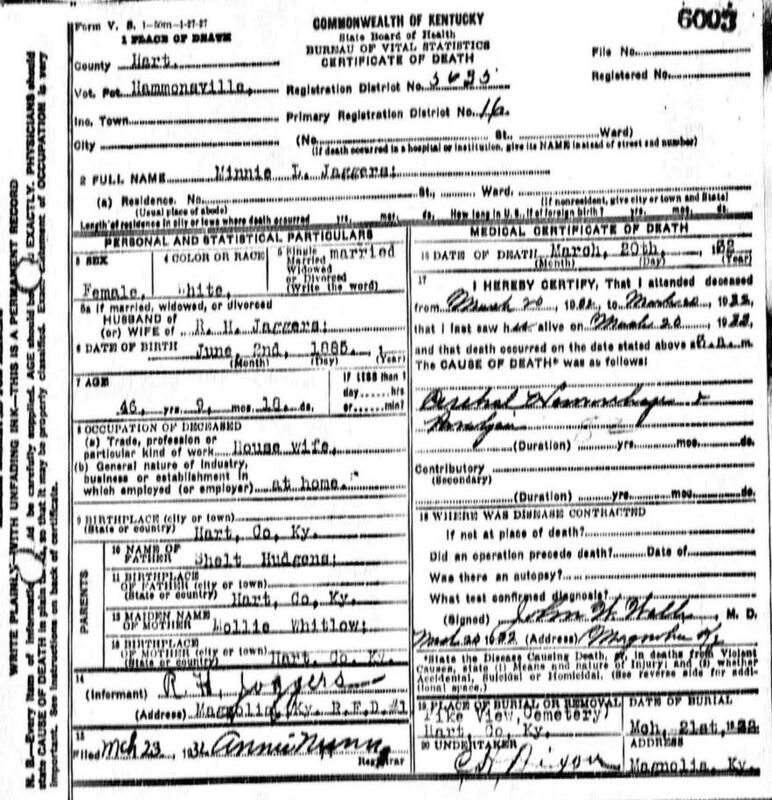 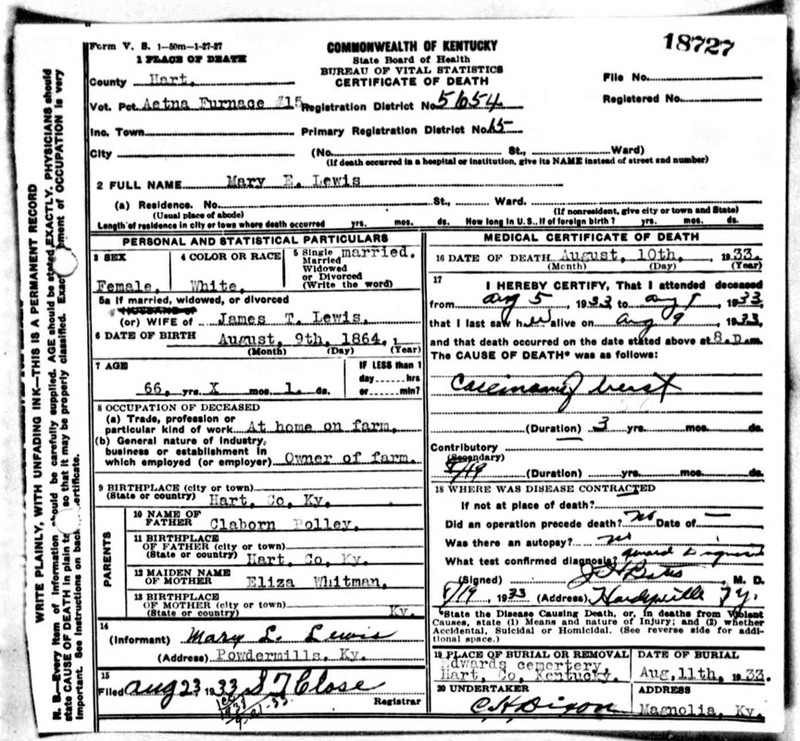 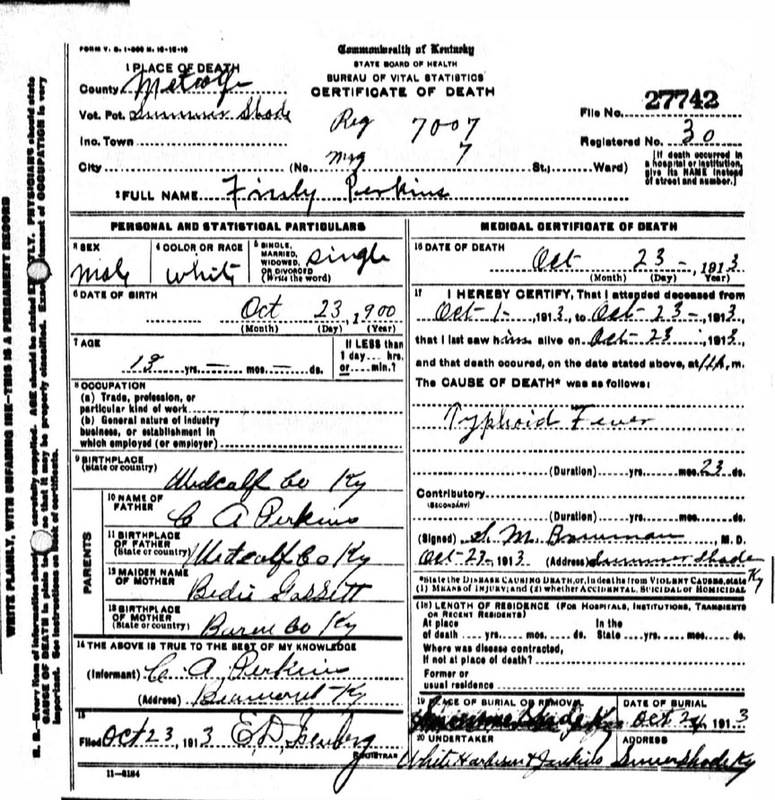 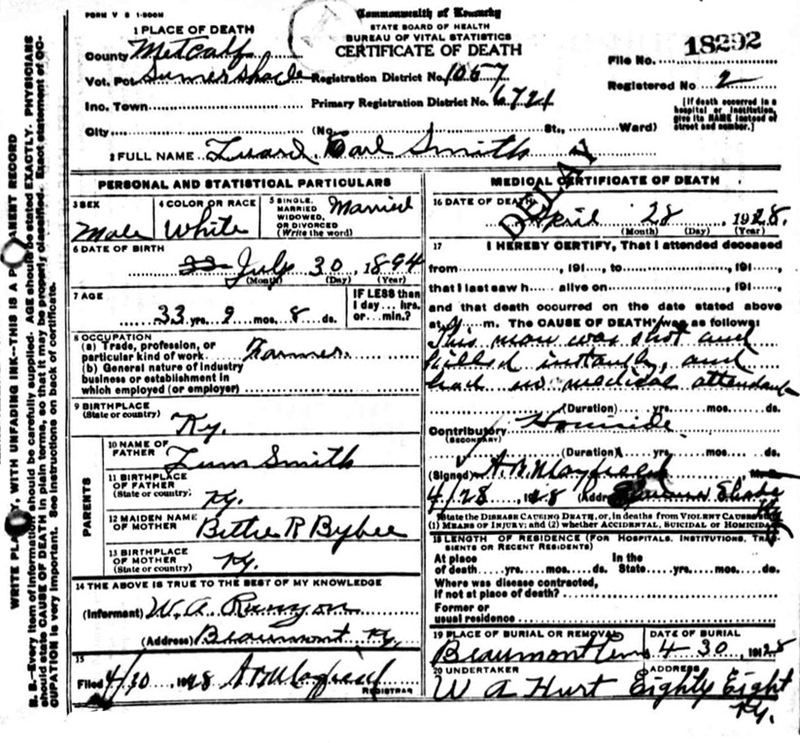 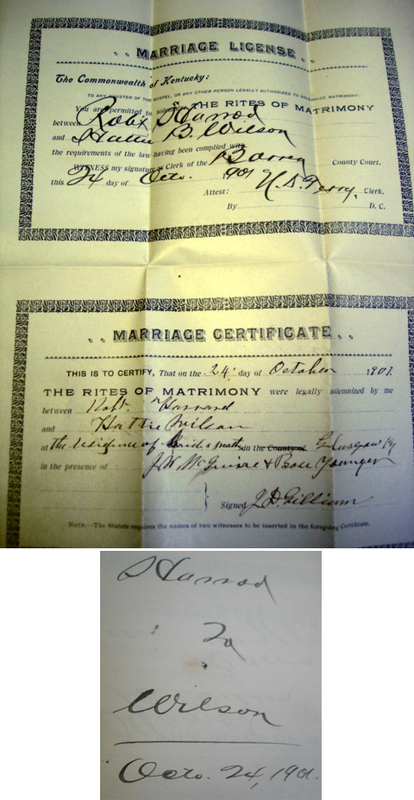 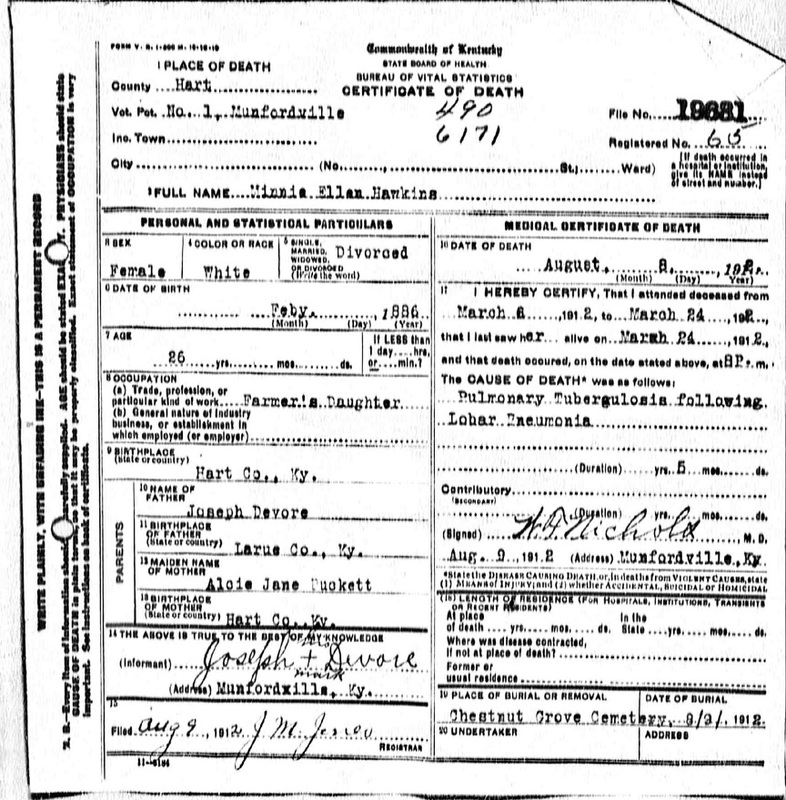 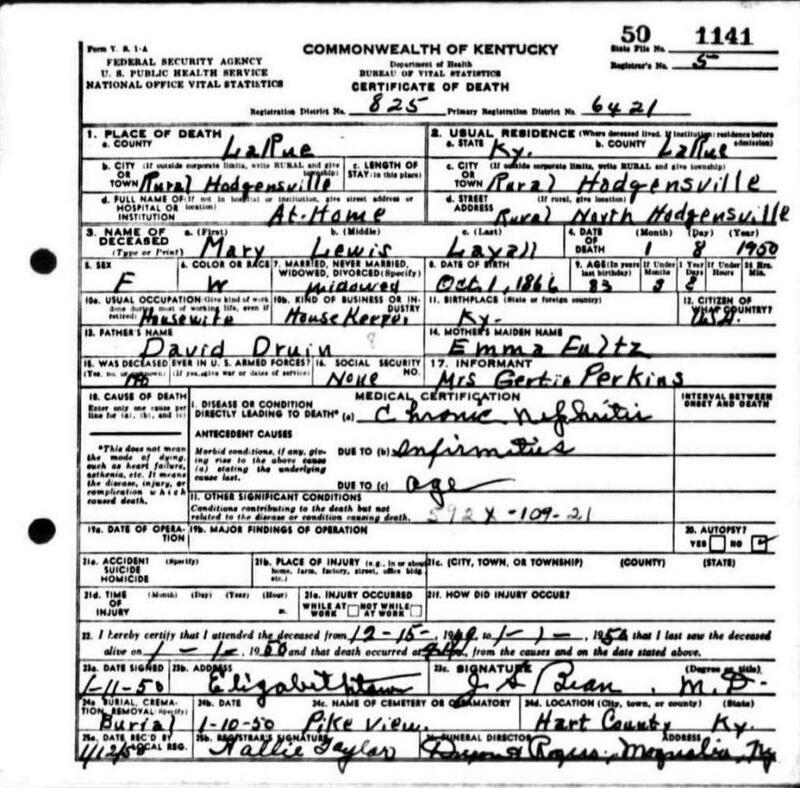 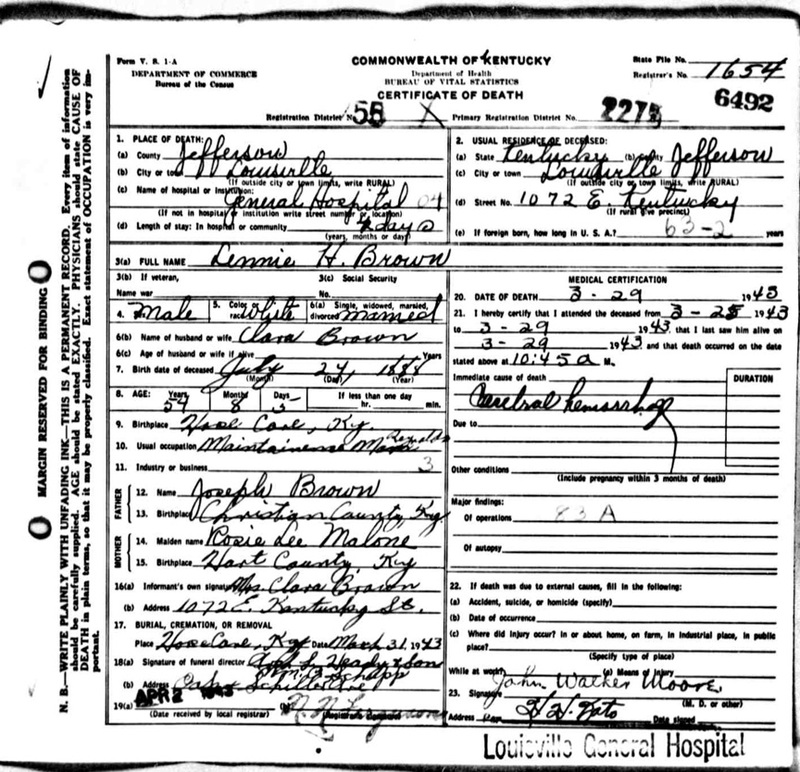 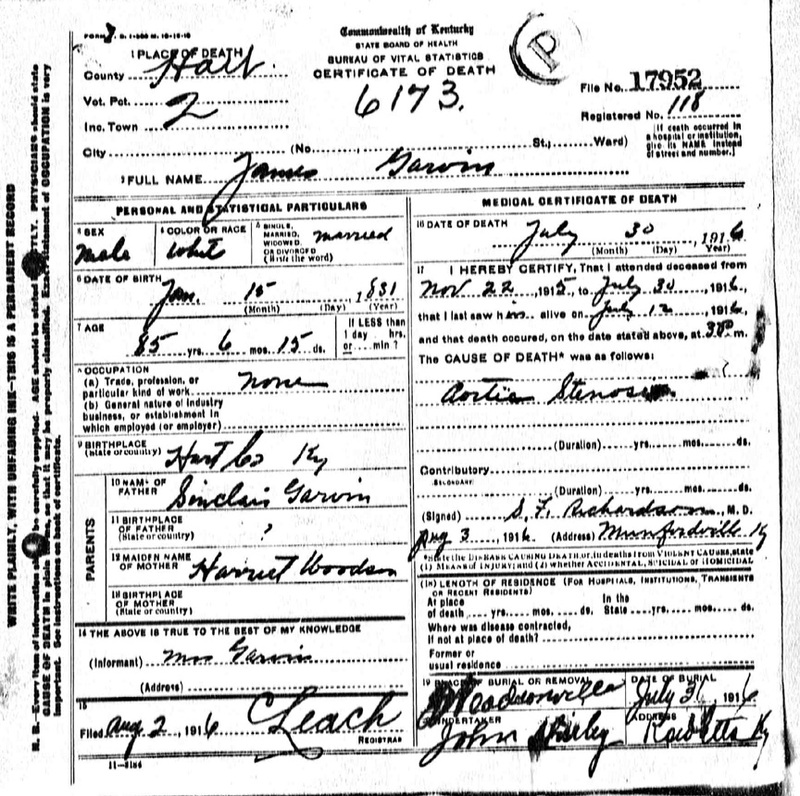 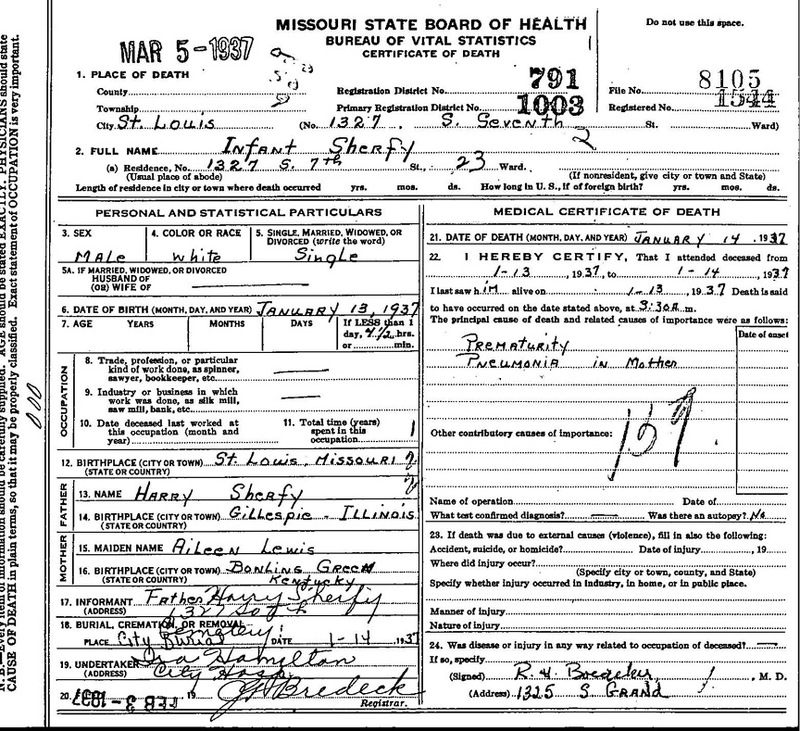 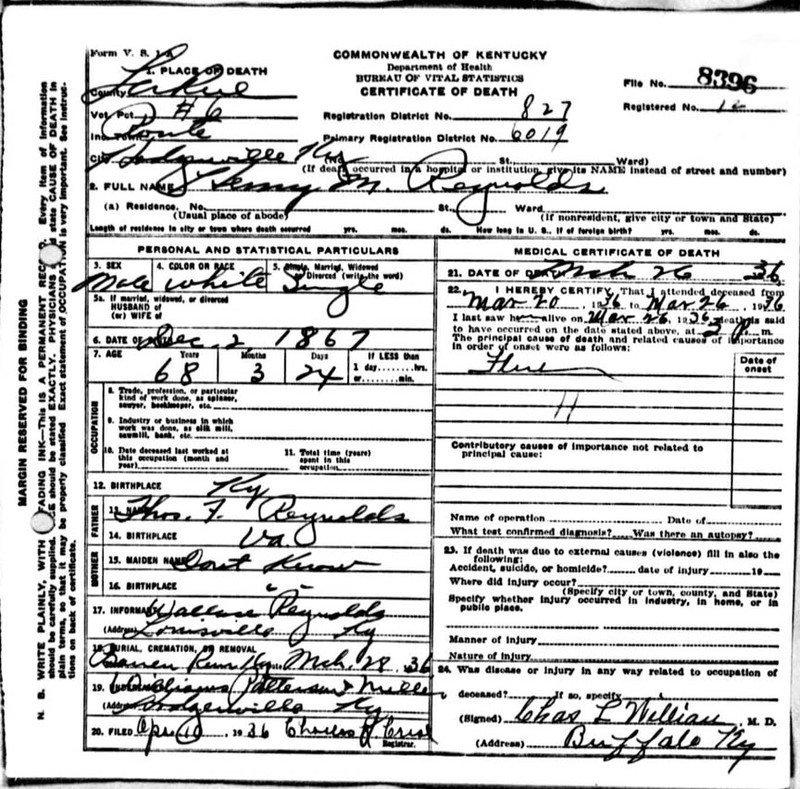 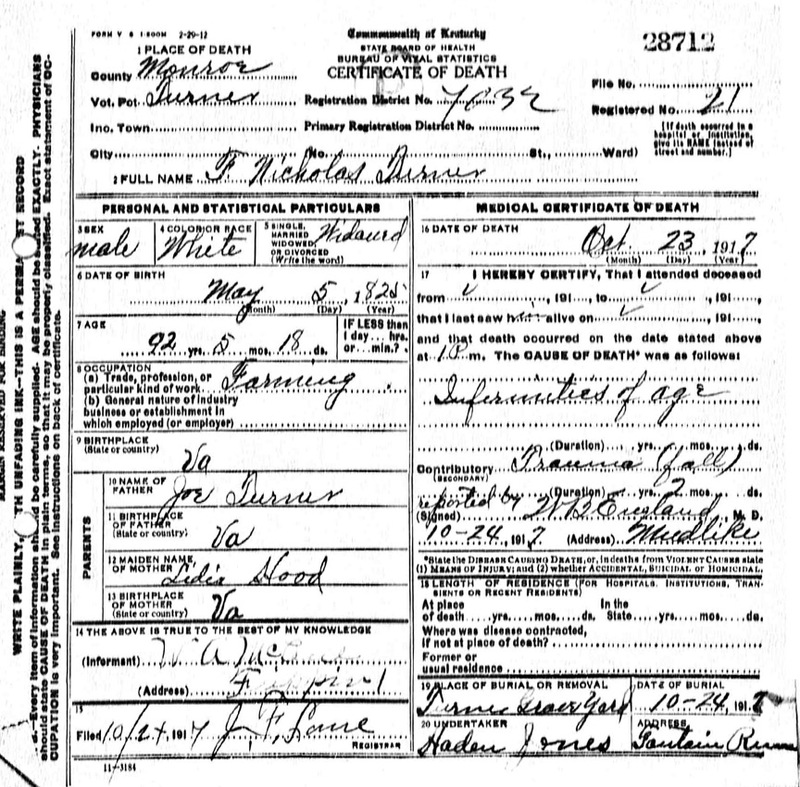 Added death certificates for Daymon Ferren, Elvin McKinney, Nannie Jane Mckinney & Sheral Meadows. 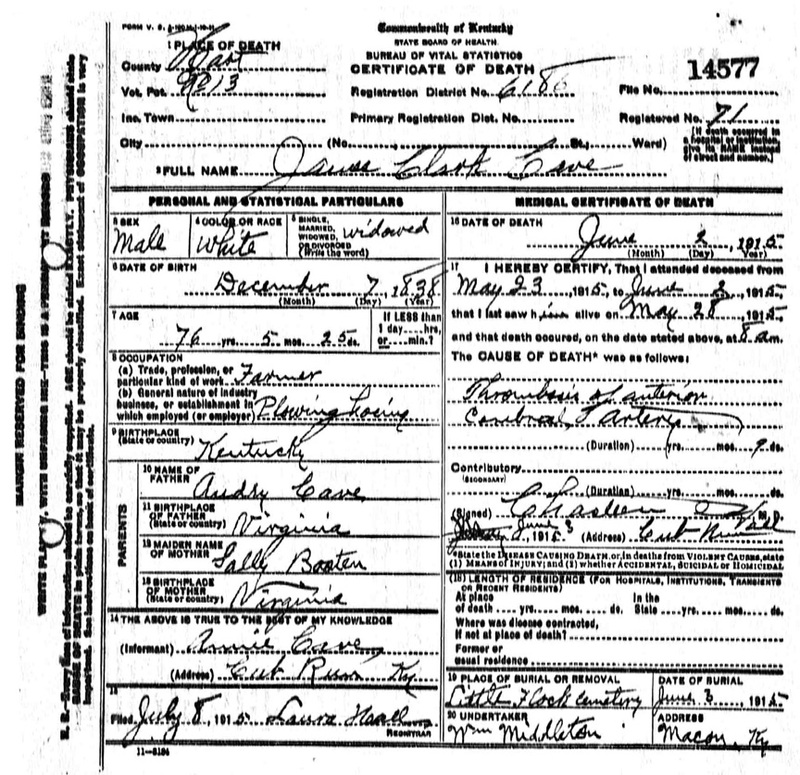 Added an obit for Cecil Earnest Goode, Barren Co.
Added the Tennison Cemetery, Hart Co. - 4 graves - Surnames: Bowen, Tennison, Tennyson - Provided by Randy Murray & Dee Tapp. 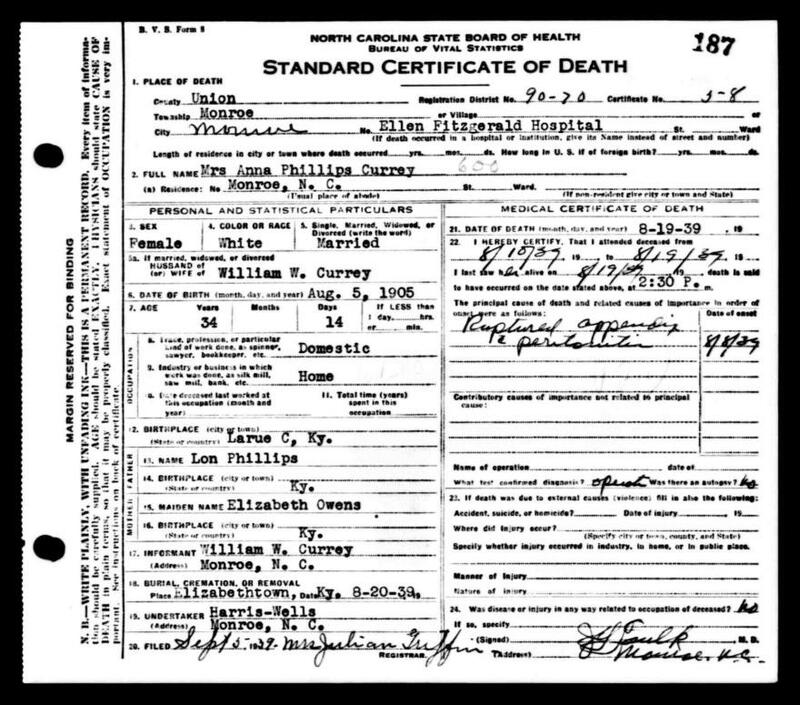 Added 14 burials (or revised info) at Center Point Cemetery, Hart Co.
Added death certificate for Synthia Malinda Peden Estes, buried at Lickbranch Cumb. 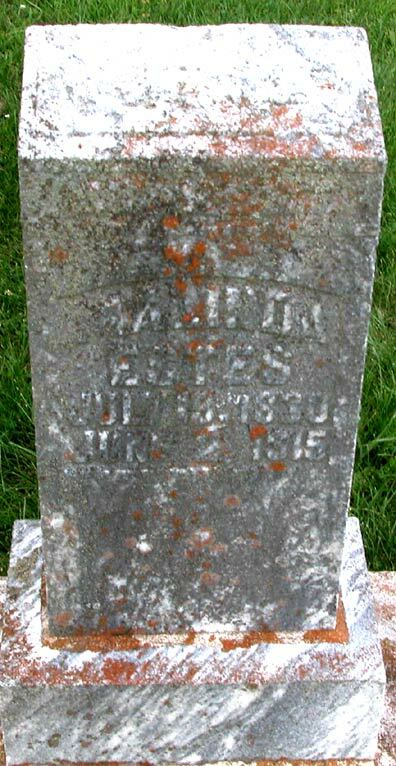 Presty. 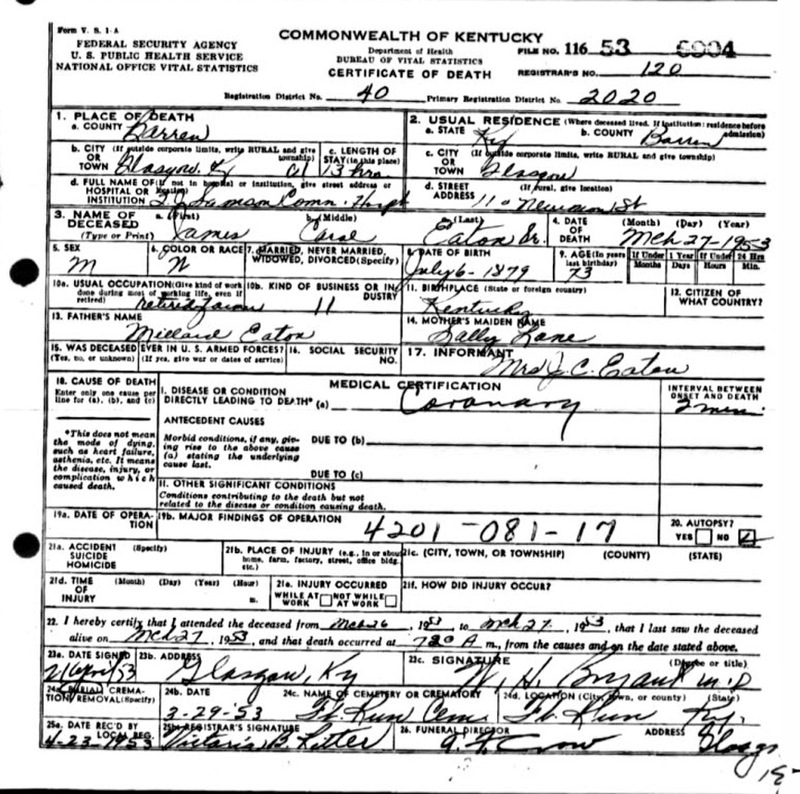 Church Cemetery, Barren Co.
Added 2 Carr and 2 Ganter death certificates, burials in Glasgow Municipal Cemetery. 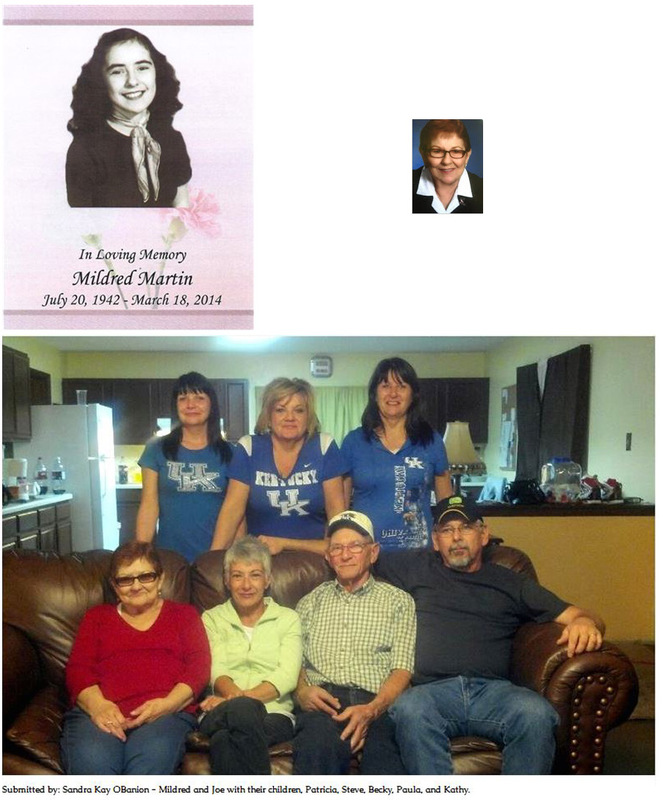 Added obit for Rose "Sissy" Legler Wilt - Anderson Co.
Added obit for my cousin, Timmy L. Green. 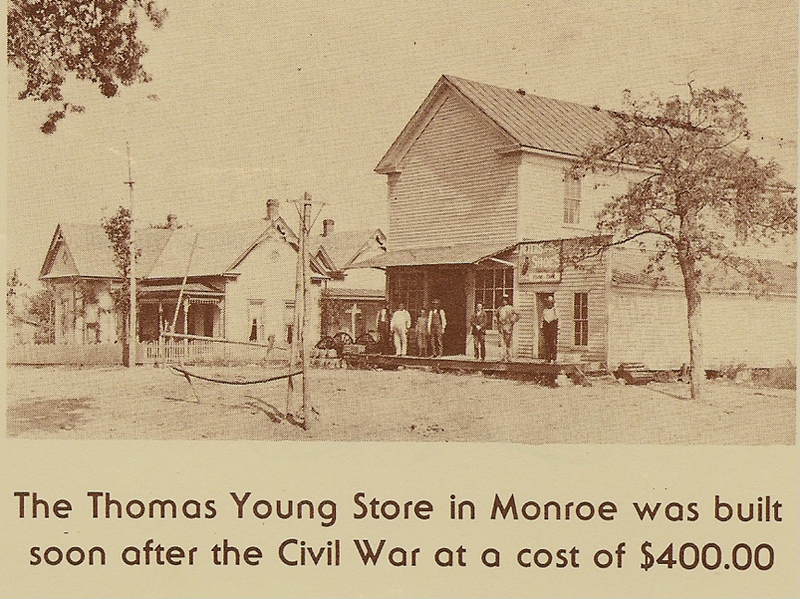 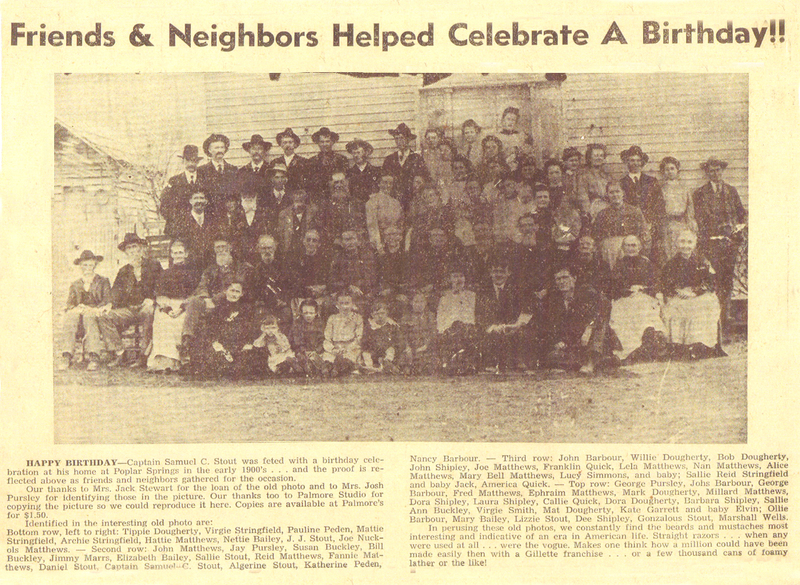 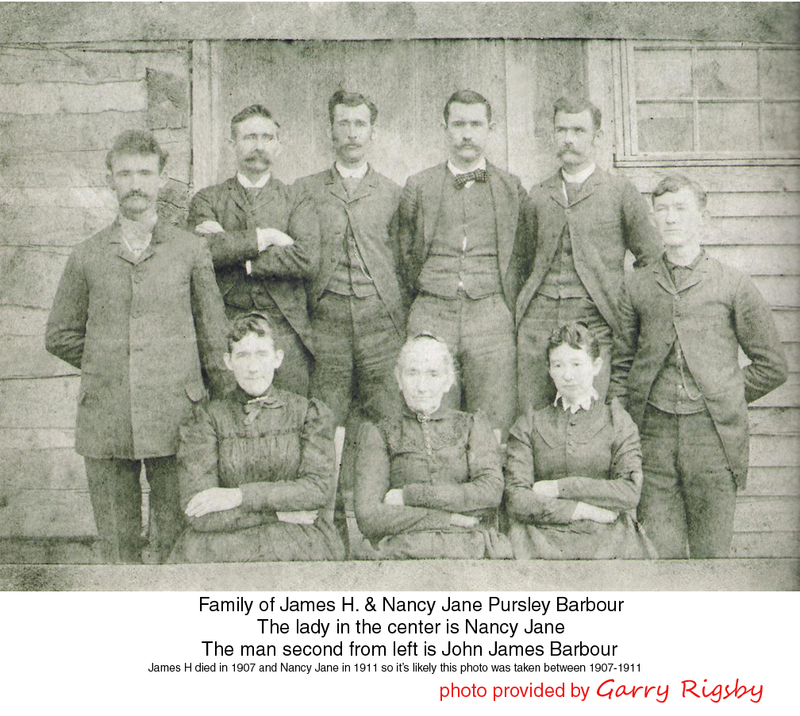 A Family History of John and Nancy (Burch) Nichols and their descendants; pioneers who journeyed to Kentucky from Virginia in 1805 and established their homestead in Barren County on the waters of Fallen Timber Creek in 1812." 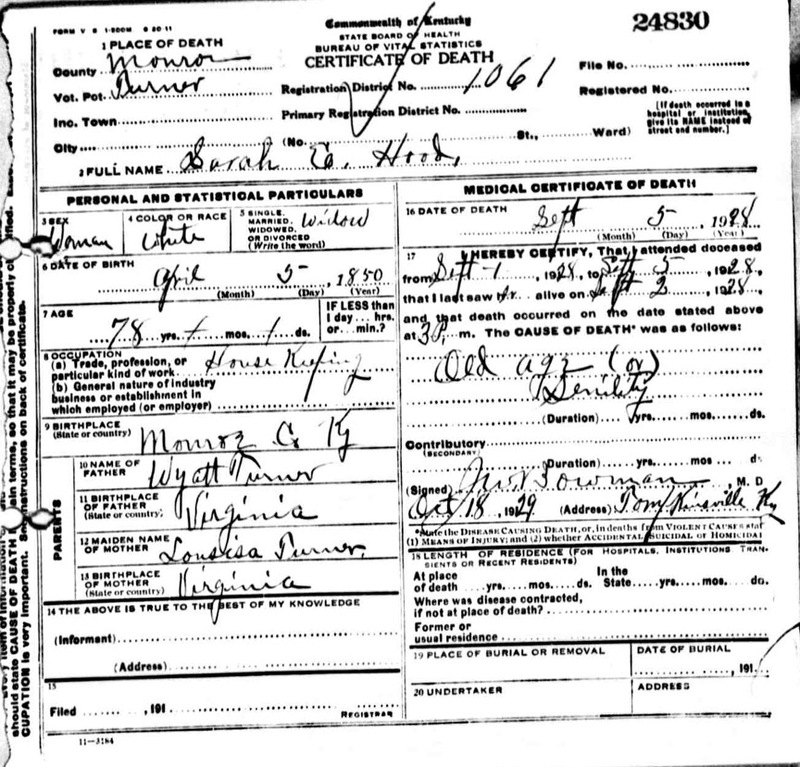 Added 3 burials at the Leesville Cemetery, Hart County - Barnes, Martha Ann; Childress, Stoy M; Dobson, Naomi Mae - info obtained from obits and other records. 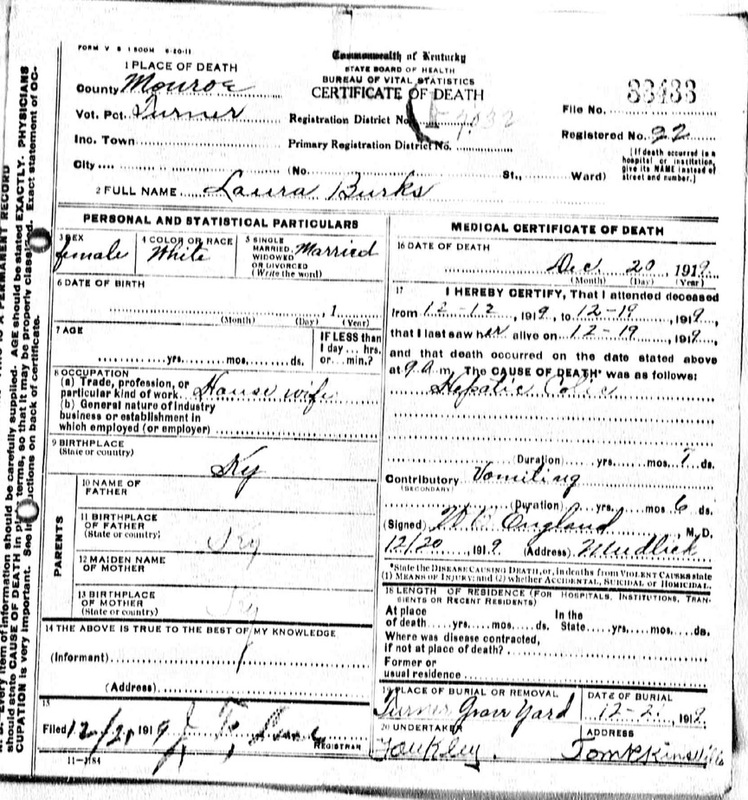 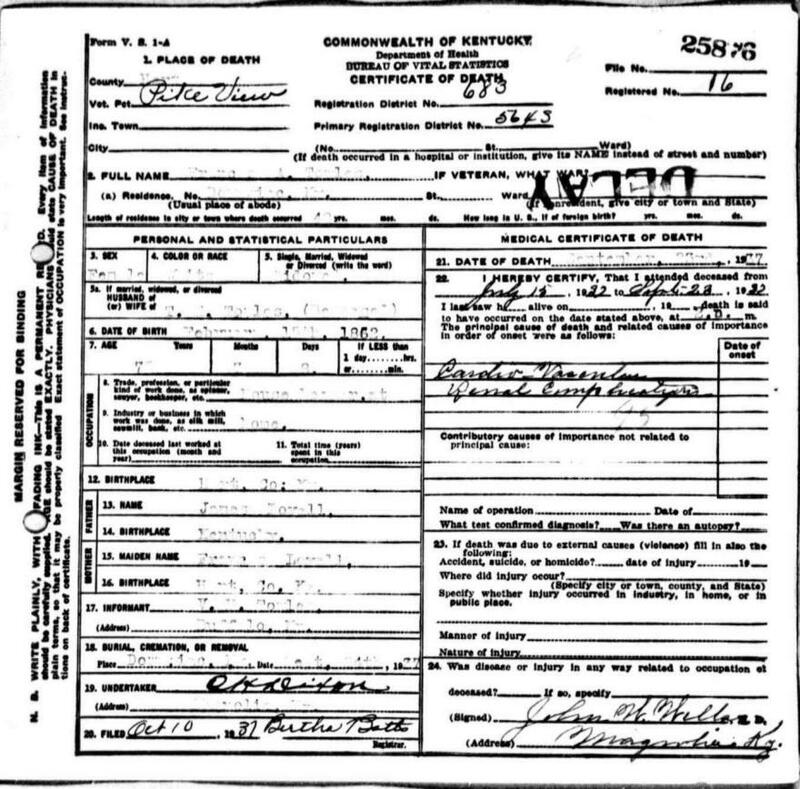 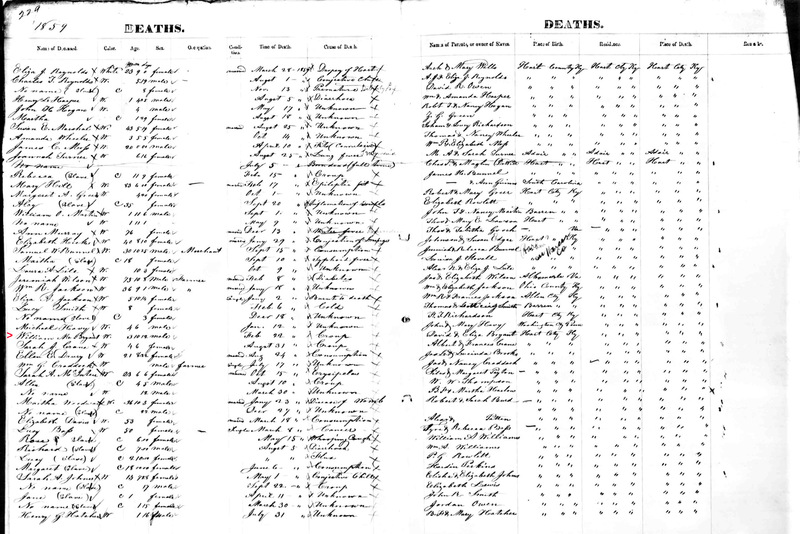 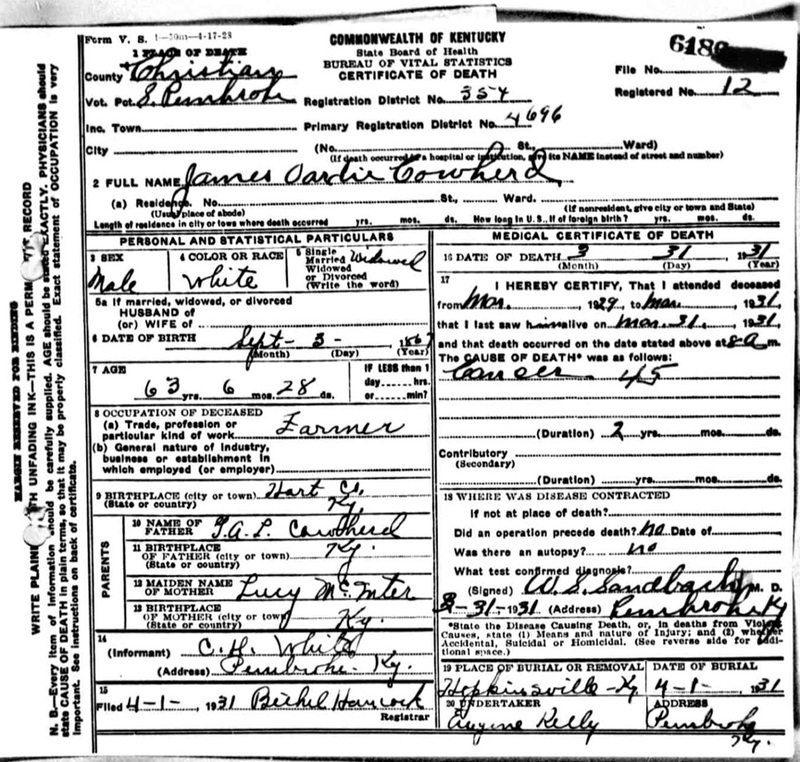 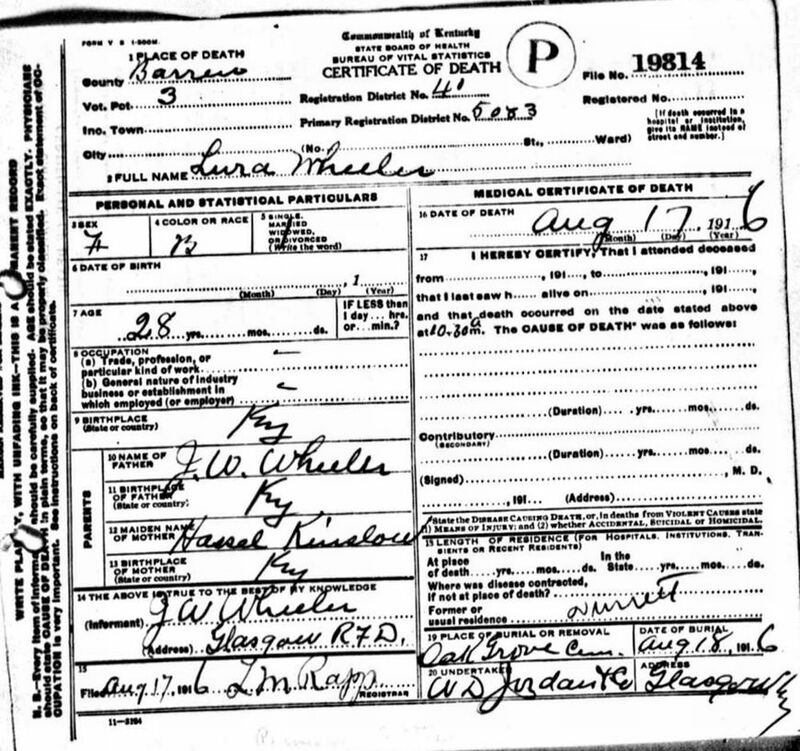 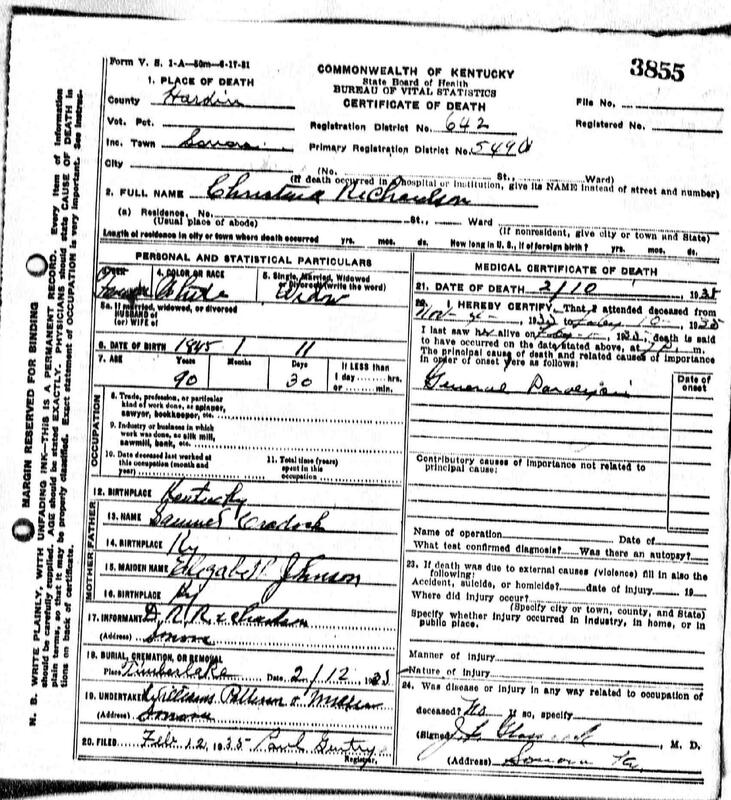 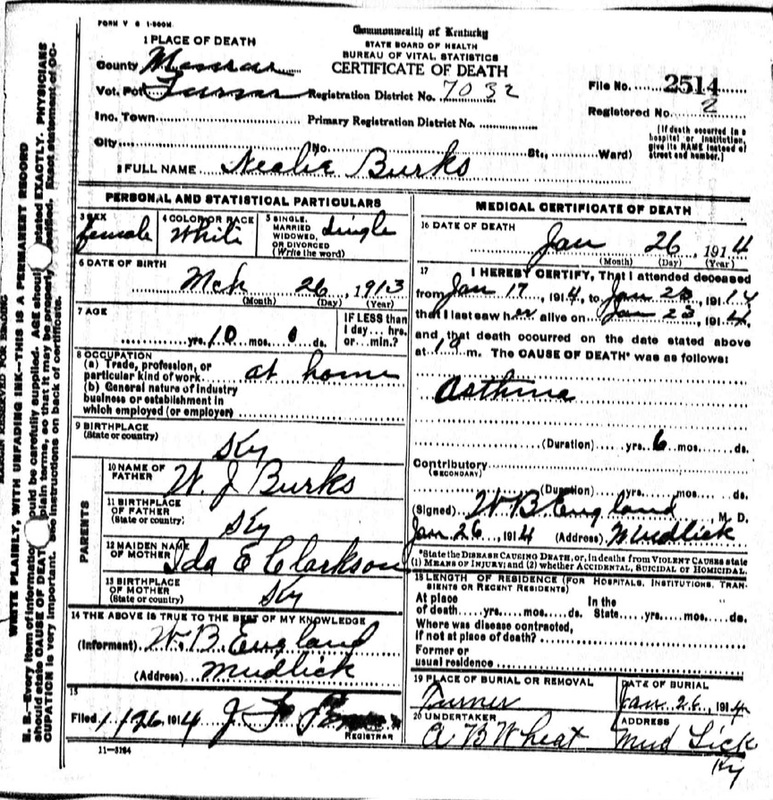 Added 33 death certificate some w/links to cemeteries. 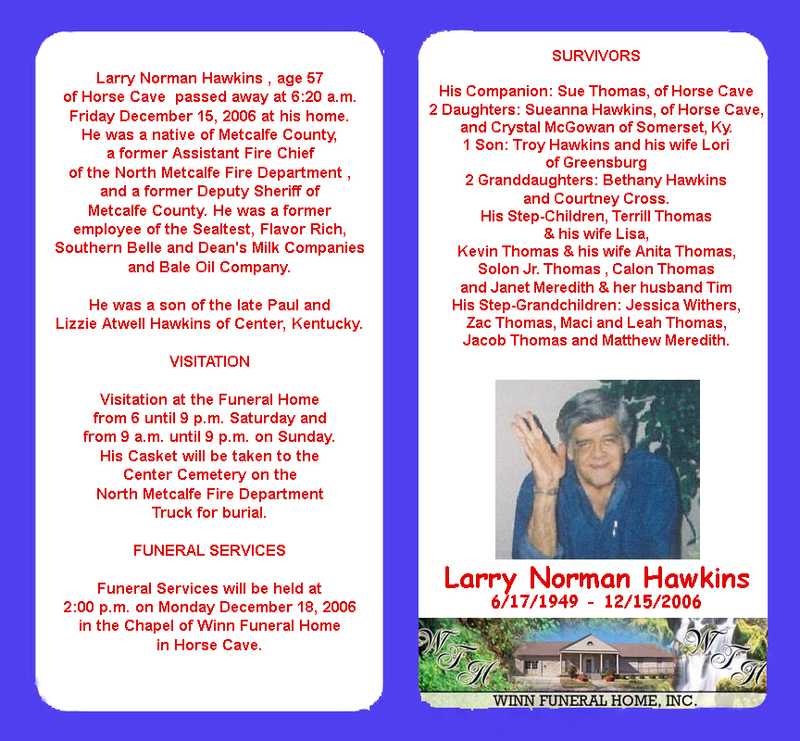 Added obituary for Jimmy Lee Pedigo, Barren Co.
Added obituary for Larry Norman Hawkins, Hart Co.
Posted better quality photos for Simmons burials in Barbour Cemetery, Barren Co.
Added 2 new burials for Poplar Spring Cemetery, Barren Co. - Judy Carol Harloy & Ronnie Taylor. 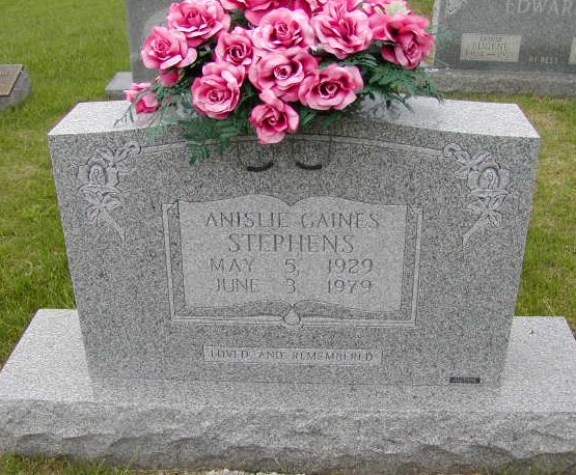 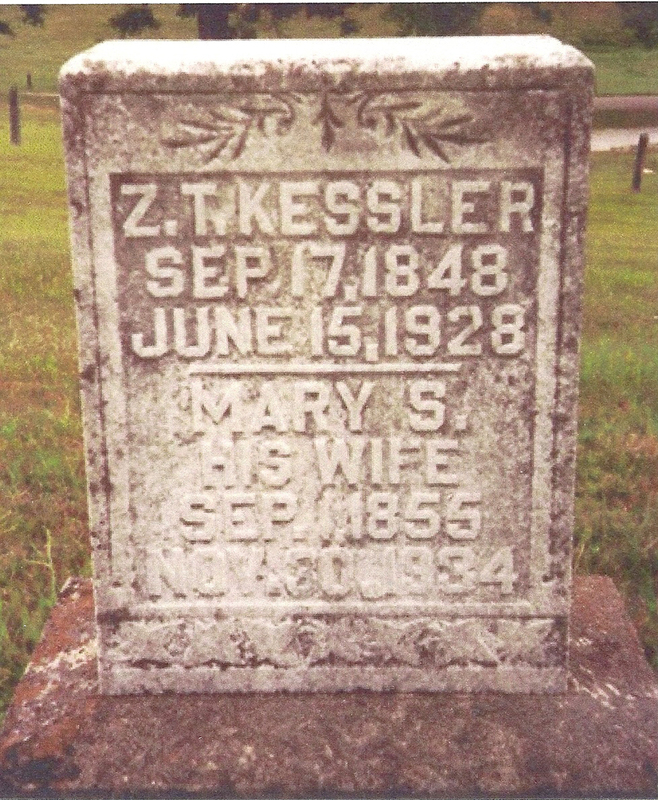 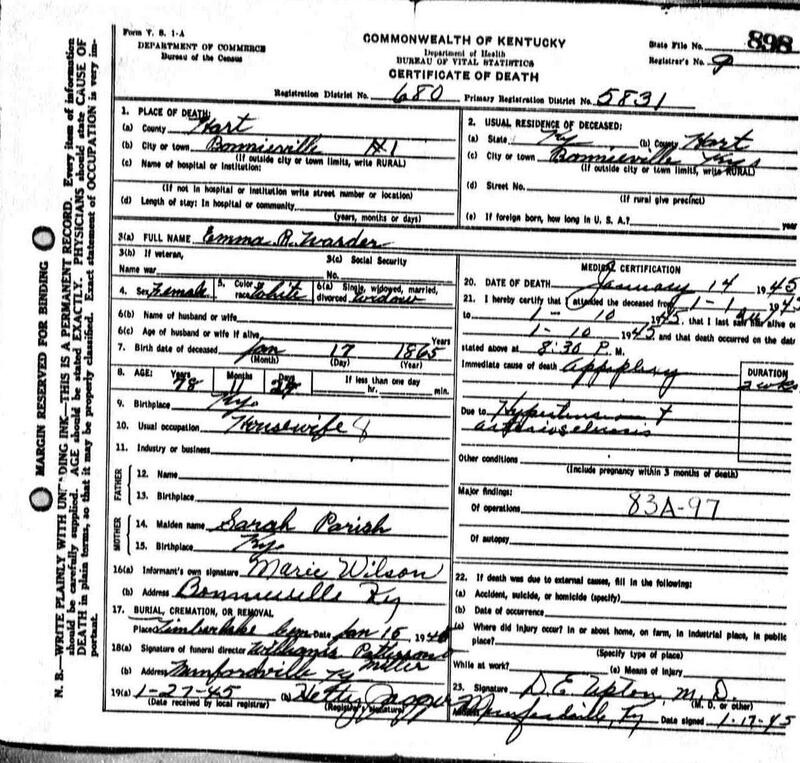 Added the Kinslow Cemetery, Oil Well Road, Barren Co. - Graves and info for Kinslow Family - Surnames: Duncan, Foster, Gist, Jones, Kinslow - provided by Georgette Lee. 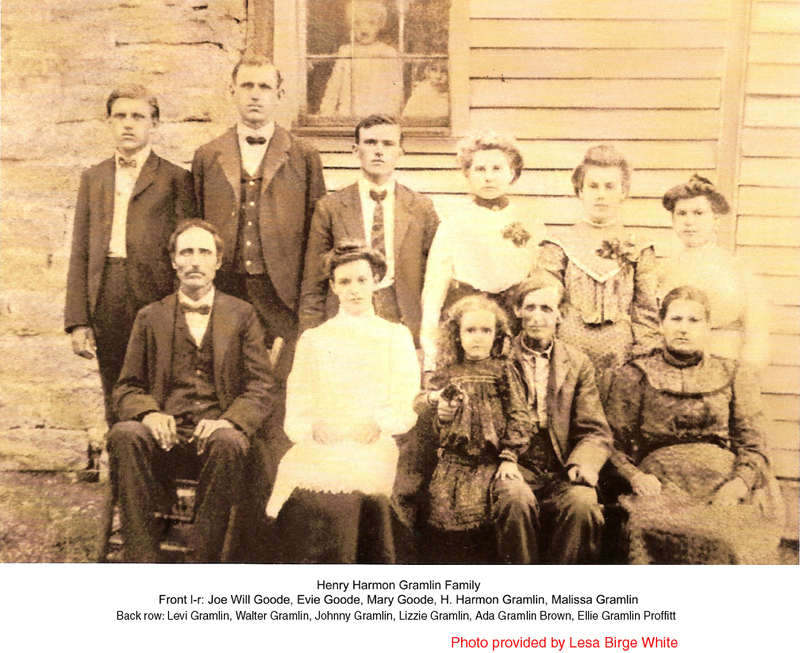 Added story: THE LITTLE CHURCH OUT IN THE COUNTRY By Scott Briggs, Cave City As told by Greg Briggs and Kim Gossett, Cave City to the Shady Grove Cemetery Page, Hart County. 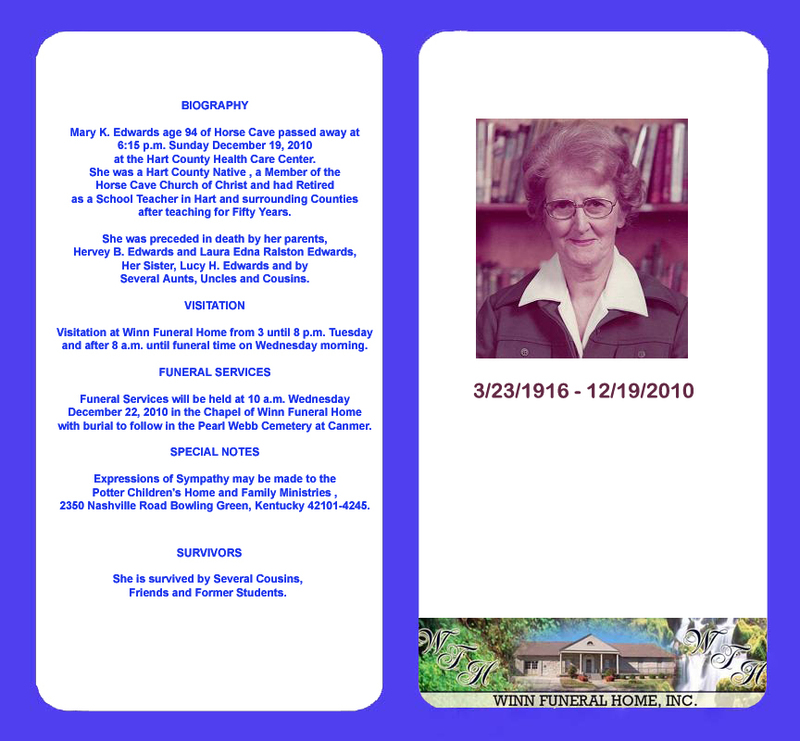 - from the Broomsedge Chronicles via Sandi Gorin. 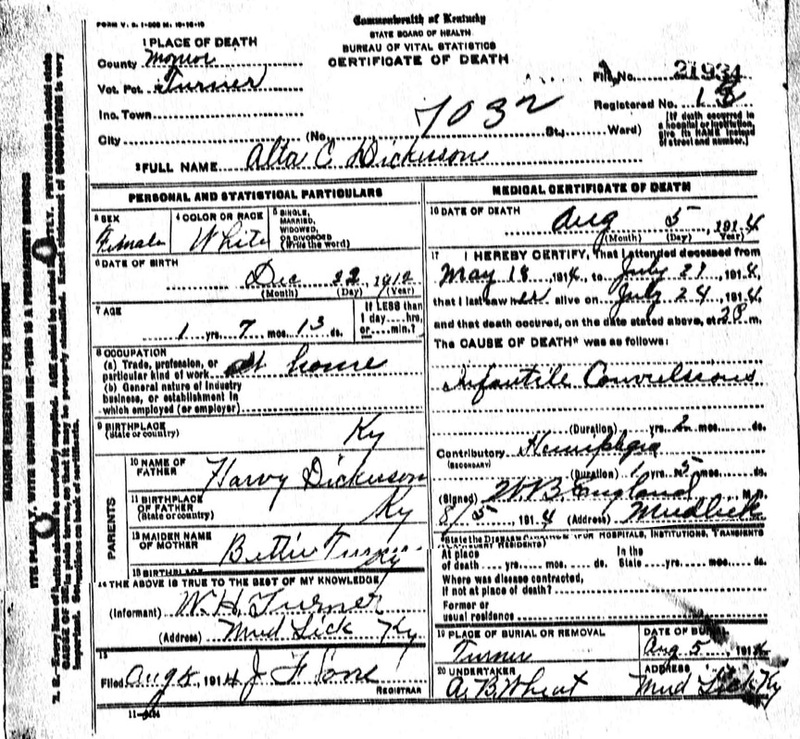 Added a brickwall request for Willis West/ Ann Cottrell with ties to Hart/Hardin Co.
Added birth and death dates for Malon Howard, Knoxes Creek Cemetery, Hart Co.
Added the Lively, Bacon Creek Cemetery - Hart Co., KY - 21 graves - Surnames: Cave, Gibson, Jaggers, Lively, Miles, Shively, Wells - info provided by Jim Cave, Edith Bastin & Judy Lawler. 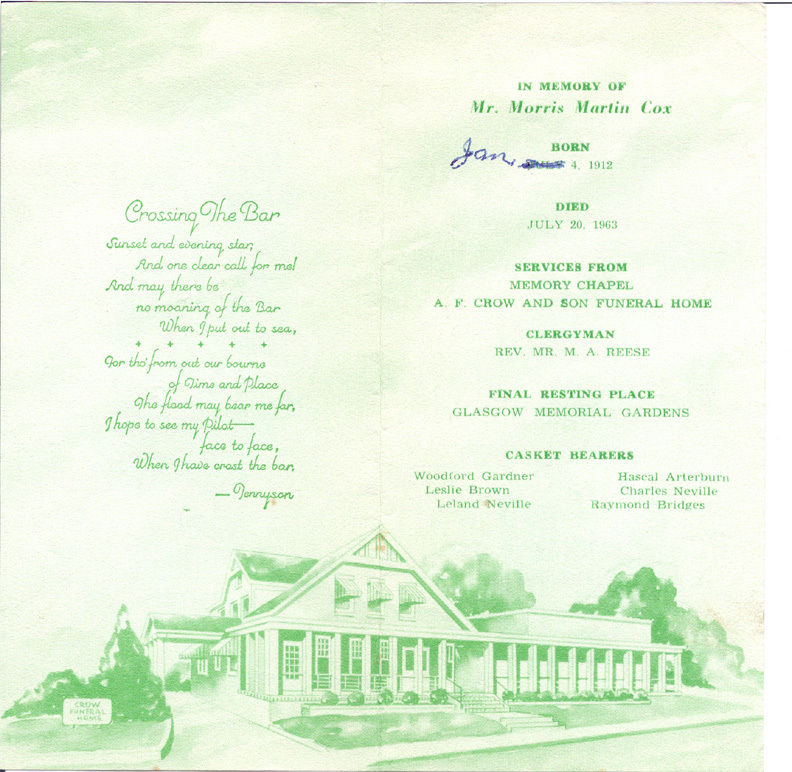 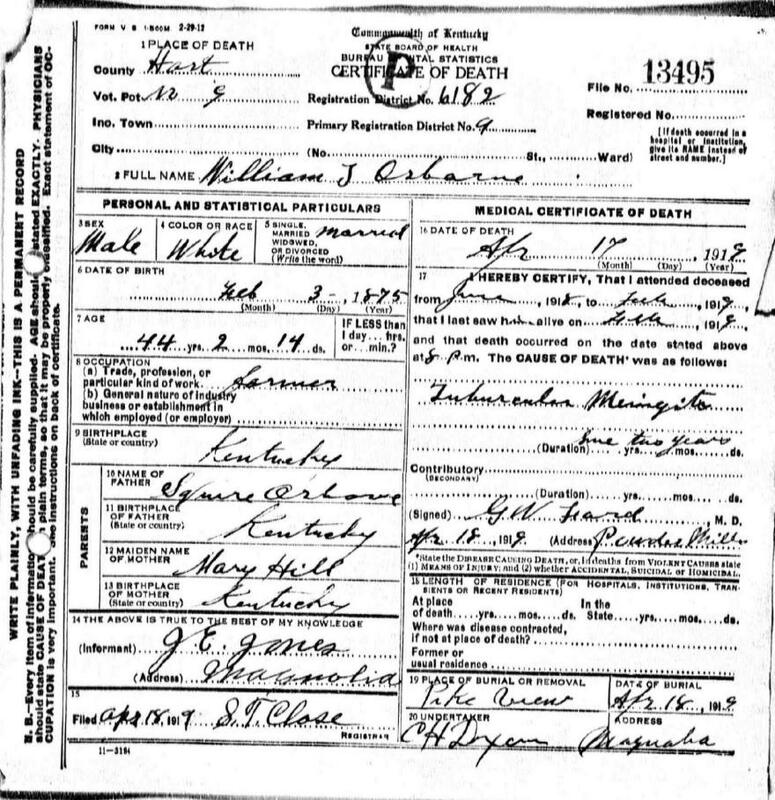 Added obit info for William Glenn Creek & added obit info to his gravestone photo. 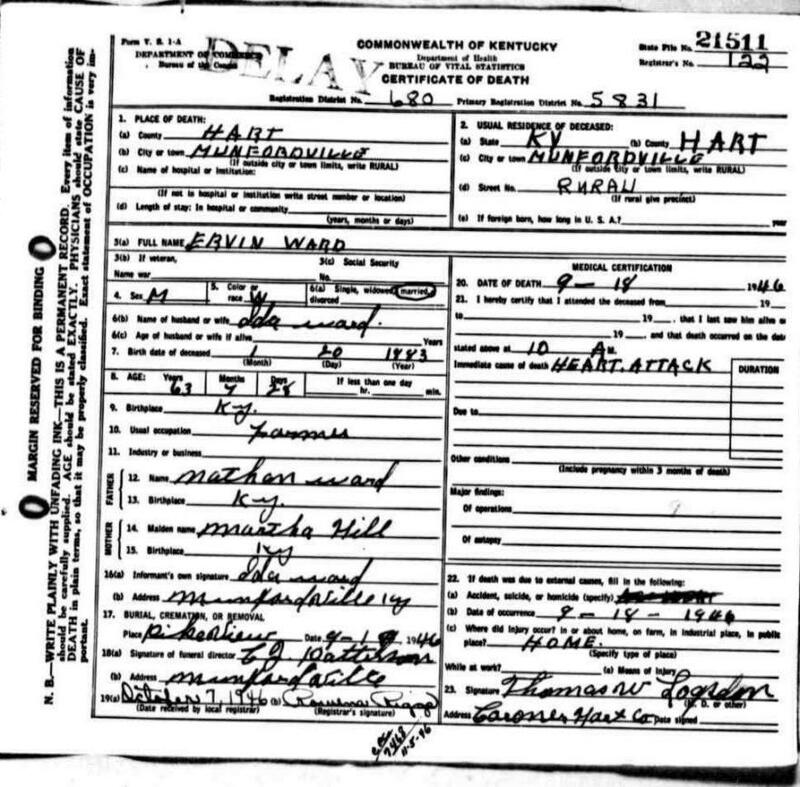 Harrod, Robert Wilson, Hattie B. 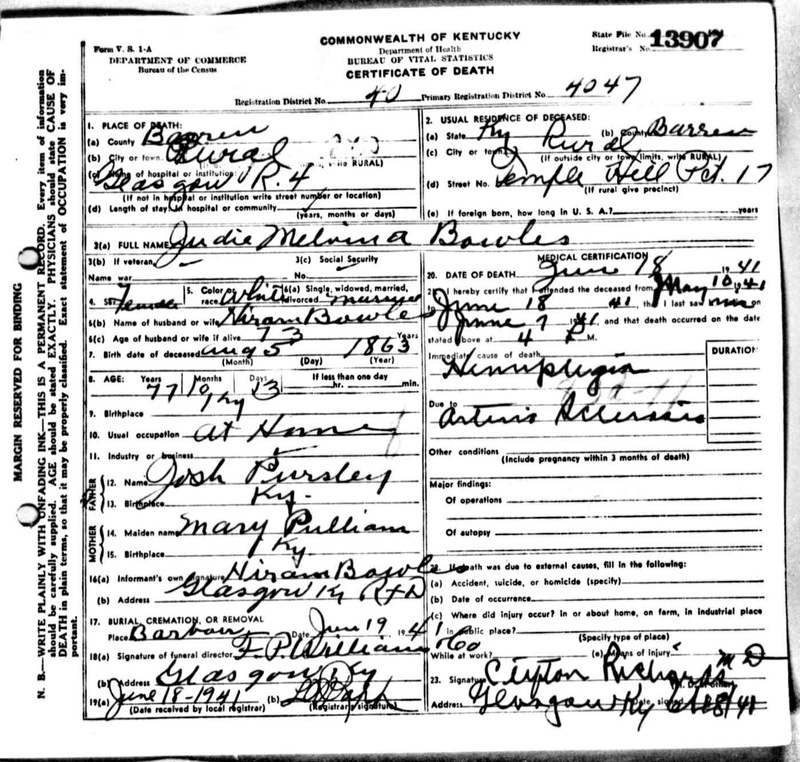 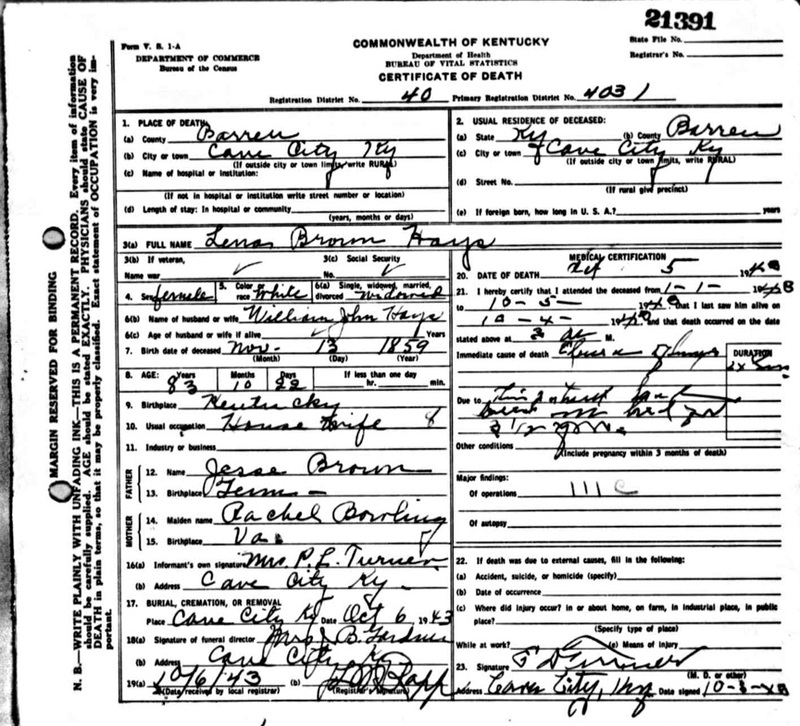 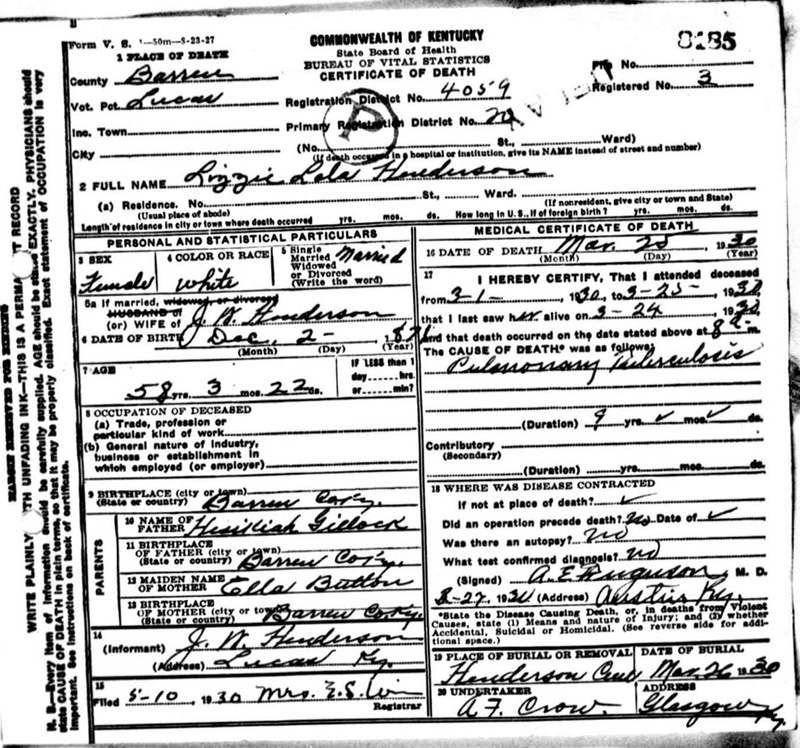 Added family photos for the Barbour and Piercy Families of Barren Co.
Added Obituary for Barty Robertson buried in Whickerville Cemetery, Hart Co.
Added 4 names to the Moore Cemetery, Barren Co., KY - Surnames, Boles, Knoeki, Moore, Williamson. 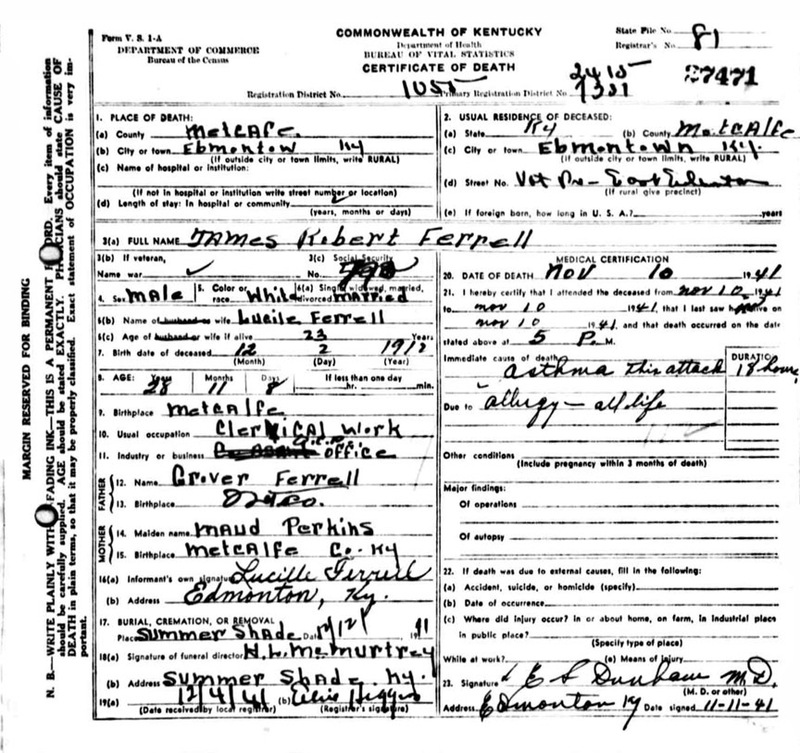 Added the Poplar Grove Cemetery, Barren Co., KY - 74 graves - Surnames: Barlow, Bradshaw, Bridges, Buford, Bush, Cavil, Chambers, Curd, Dillon, Duncan, Ellis , Francis, Franklin, Frazier, Grooms, Huffman, Mansfield, Mosby, Neal, Quinn, Seay, Smith, Stone, Wells - this is an African-American Cemetery. 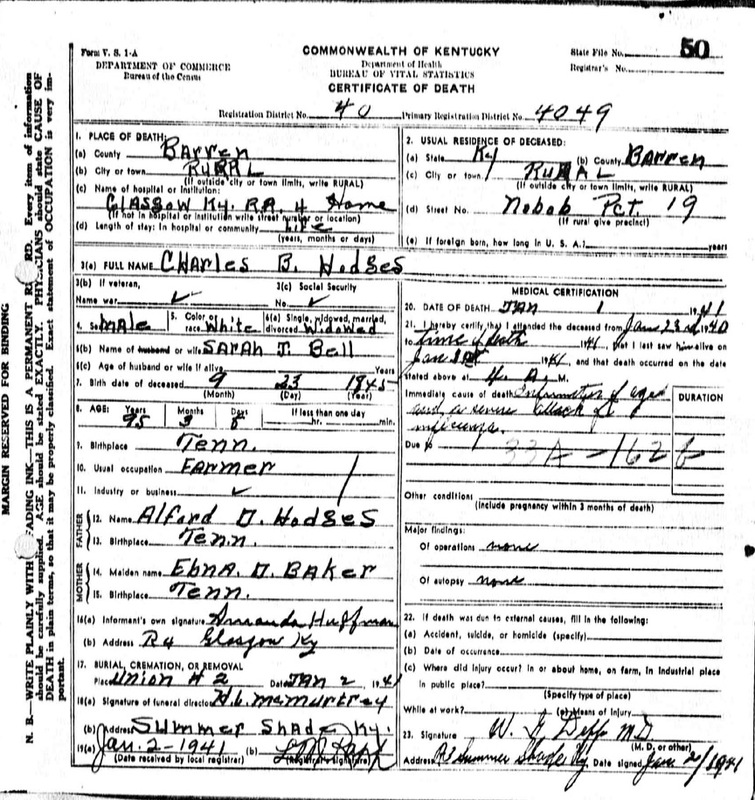 Added the Pleasant Union Cemetery, Barren Co., KY - 79 graves - Surnnames: Bates, Buford, Crenshaw, Driver, Duff, Ellington, England, Faulkner, Gatewood, Hibbitt, Kinslow, Martin, Maupin, Miller, Mills, Parrish, Paul, Short, Smiley, Stockton, Twyman, Walton, Williams, Wood Woodward - this is an African-American Cemetery. 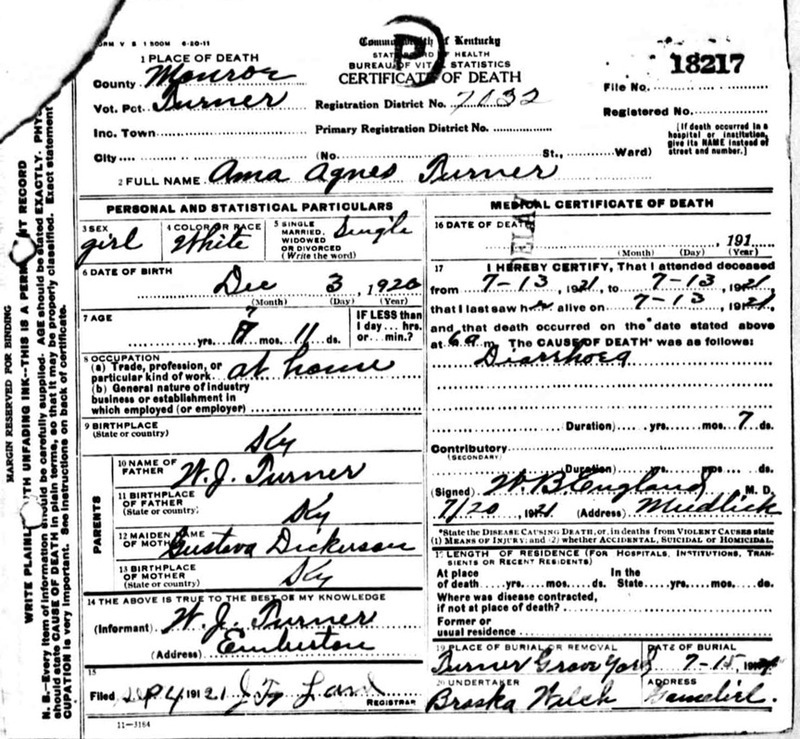 Added 52 death certificated for burials at Turner, aka New Salem Missionary Baptist Church Cemetery, Monroe County, Ky.
Added the Woods Cemetery, Barren Co., KY - 248 graves - Surnames: Abbott, Amos, Anderson, Austin, Barlow, Beck, Bethel, Boyd, Bransford, Broner, Cason, Chase, Clark, Coleman, Cosby, Curd, Davidson, Dotson, Doyle, Duke, Ennis, Eubank, Farris, Ford, Garnett, Green, Harris, Hatchett, Herndon, Huffman James, Jessup, Jordan, Kinslow, Kirkparrick, Lee, Martin, Neal, Oldham, Overstreet, Parrish, Paul, Poynter, Pryor, Quigley, Rogers, Rosenfield, Sanderson, Shobe, Smith, Sublett, Terry, Thornton, Tobin, Tribble, Trigg, Watterson, Wheeler, Whitlow, Whitney, Williams, Wilson, Wood, Woods, Young - this is an African-American Cemetery. 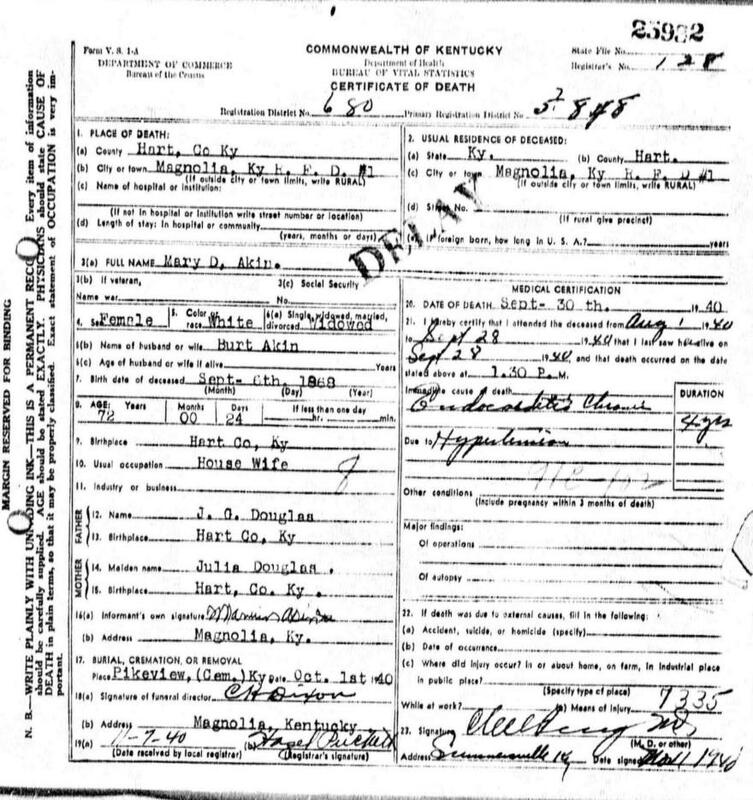 Added the Adwell Cemetery, Mammoth Cave National Park, KY - 56 graves - Surnames: Adwell, Buckingham, Burnett, Carney, Cooper, Cutliff, Dunn, Heatherly, Holton, Johnson, Peers, Rountree, Sell, Vance. 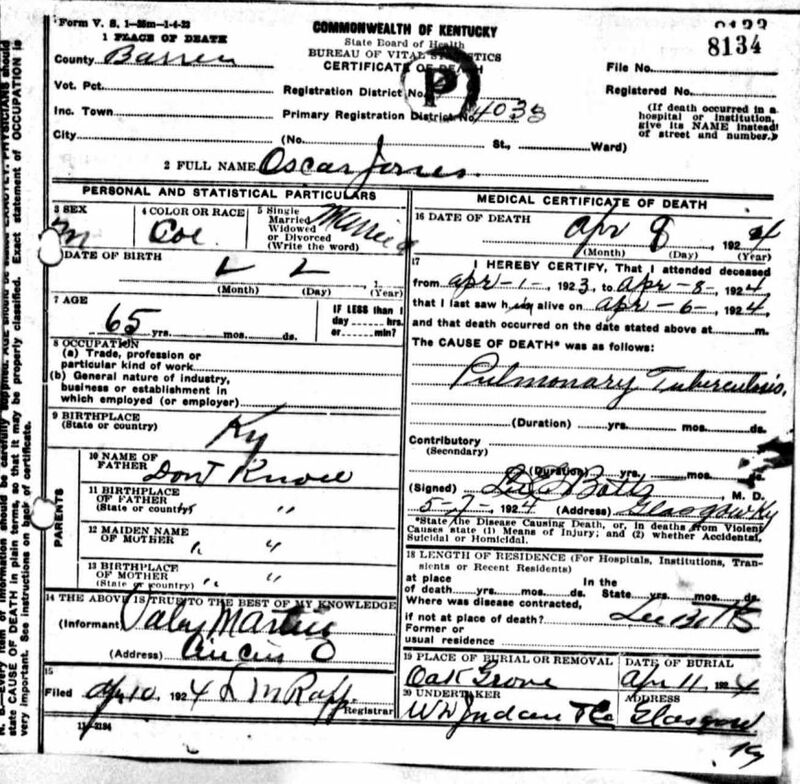 I removed the Google Search and reinstalled FreeFind (link on main index page). 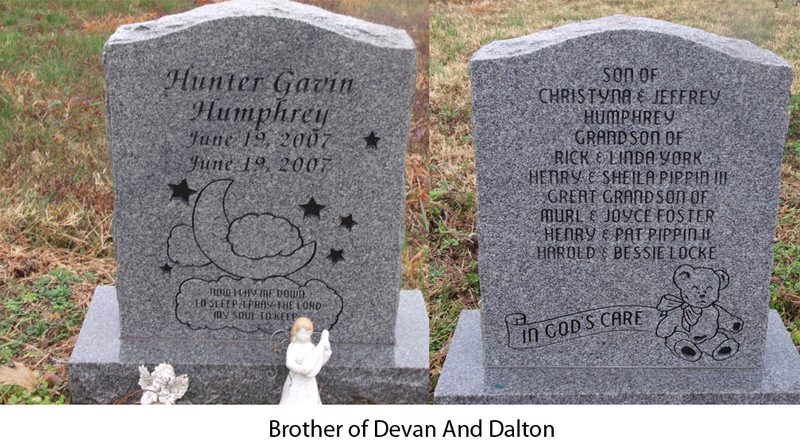 I could never get Google to work properly. 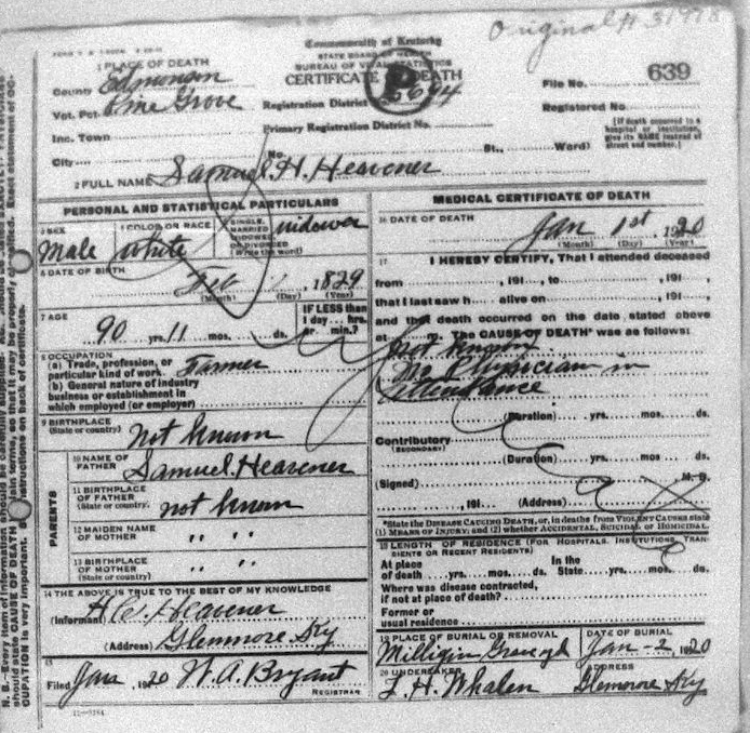 FreeFind now has new features. 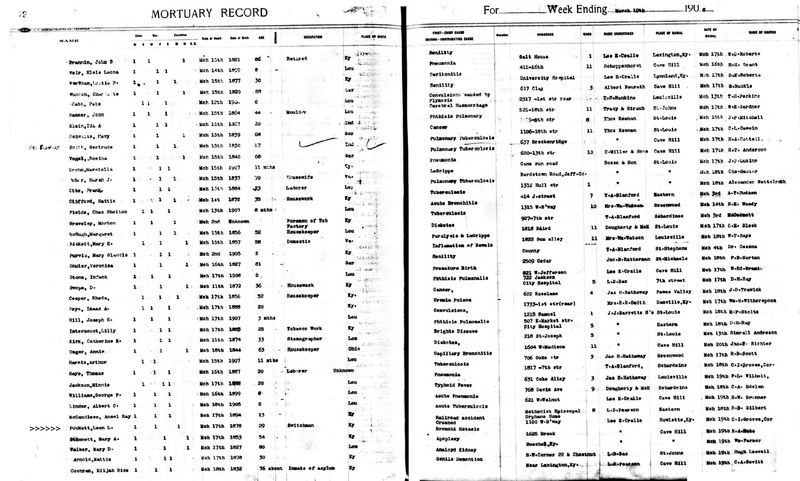 One is the "Index" function which allow you to see the words indexed. 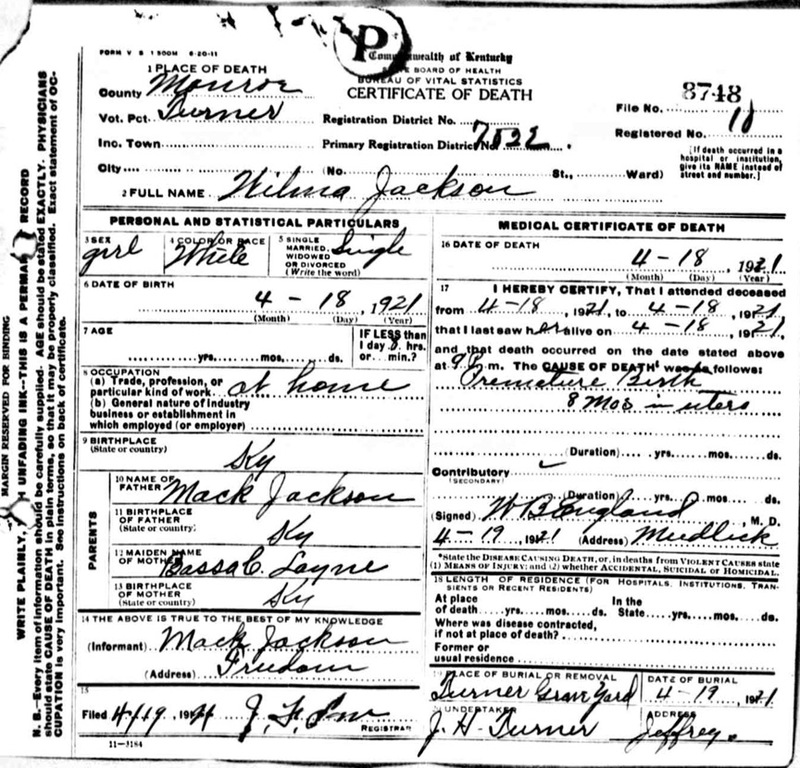 You can click on a word, or name and see all references. 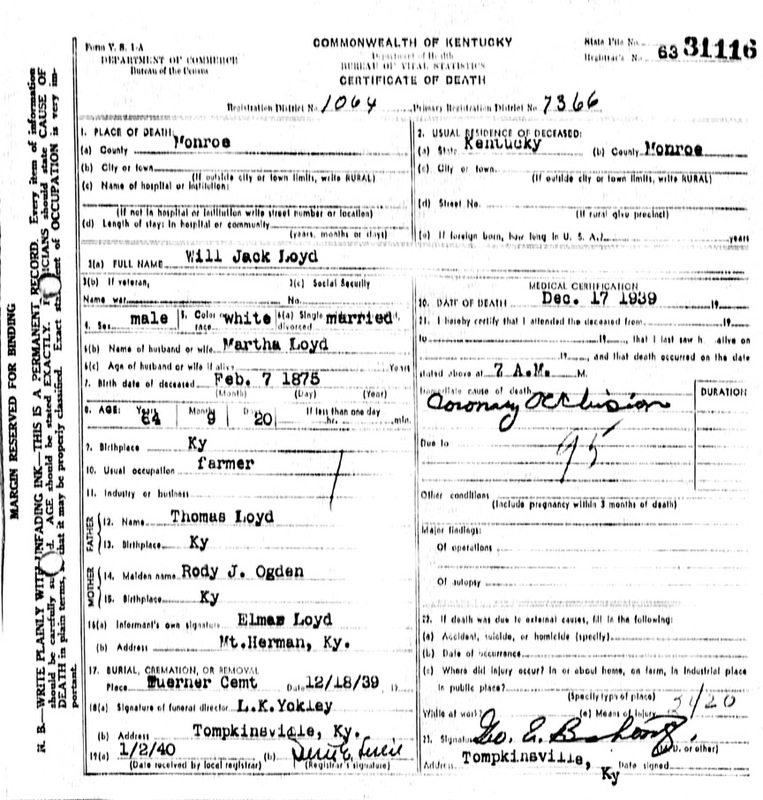 The other function is "Advanced" search which helps you narrow your search if you get too many results. 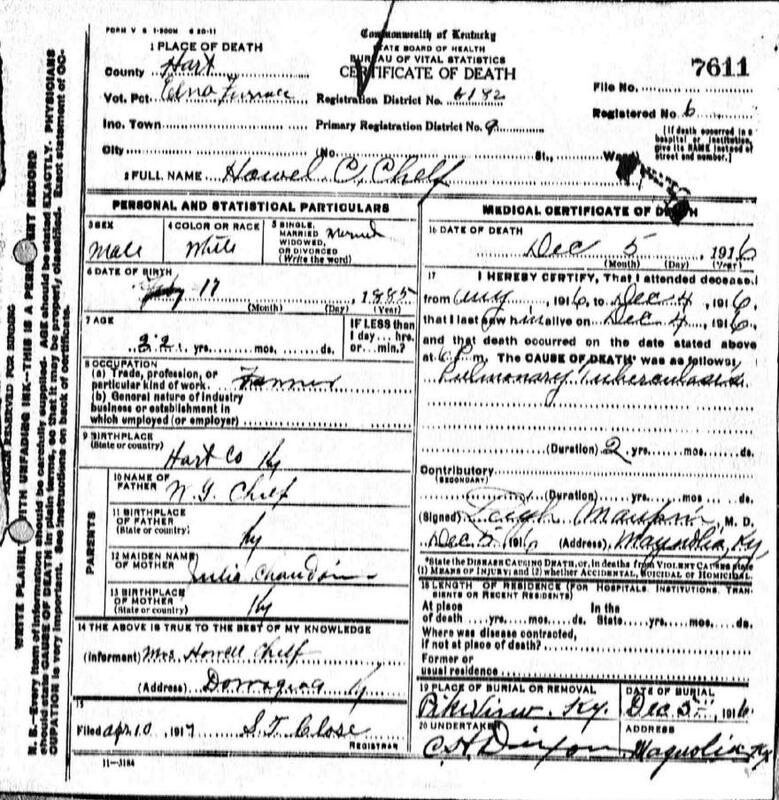 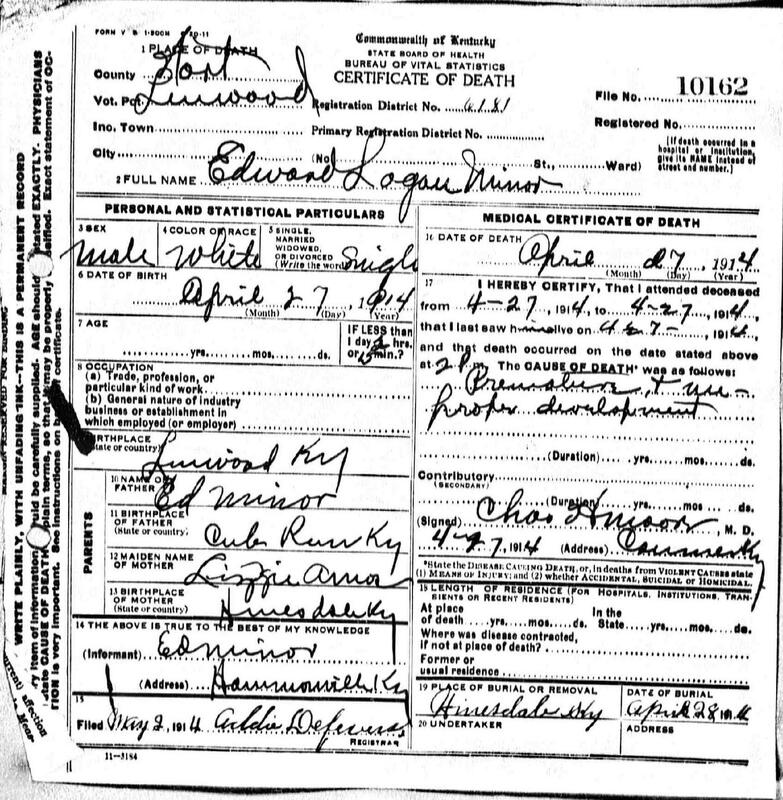 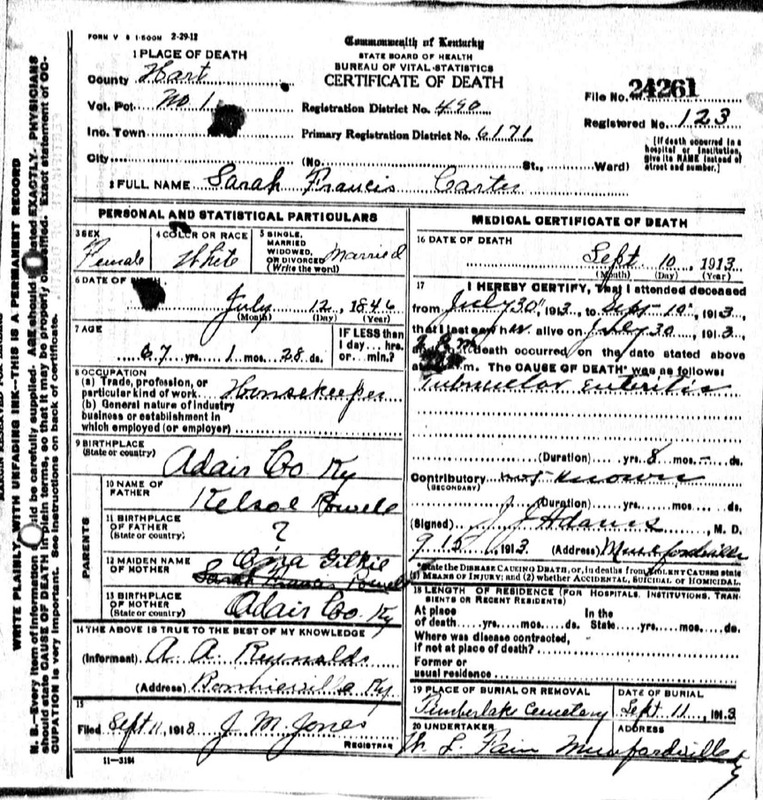 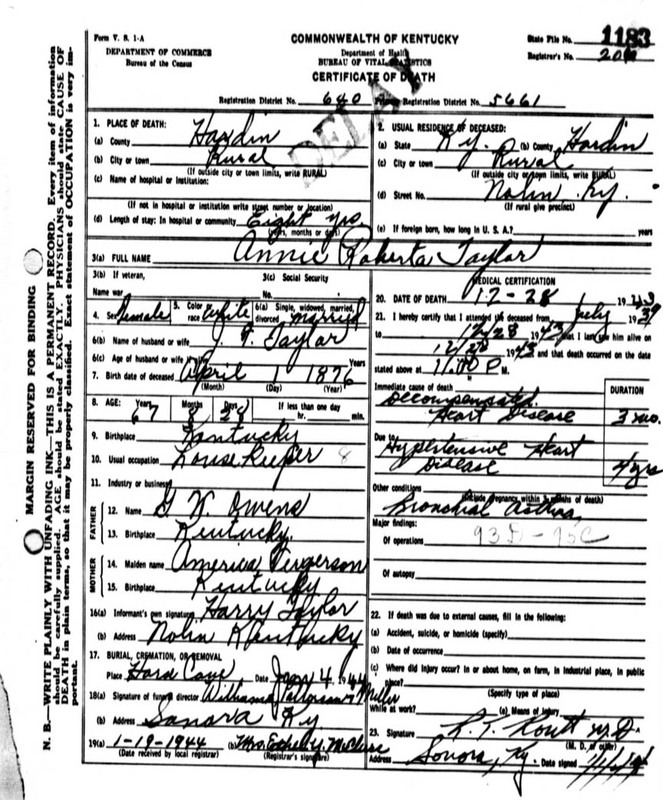 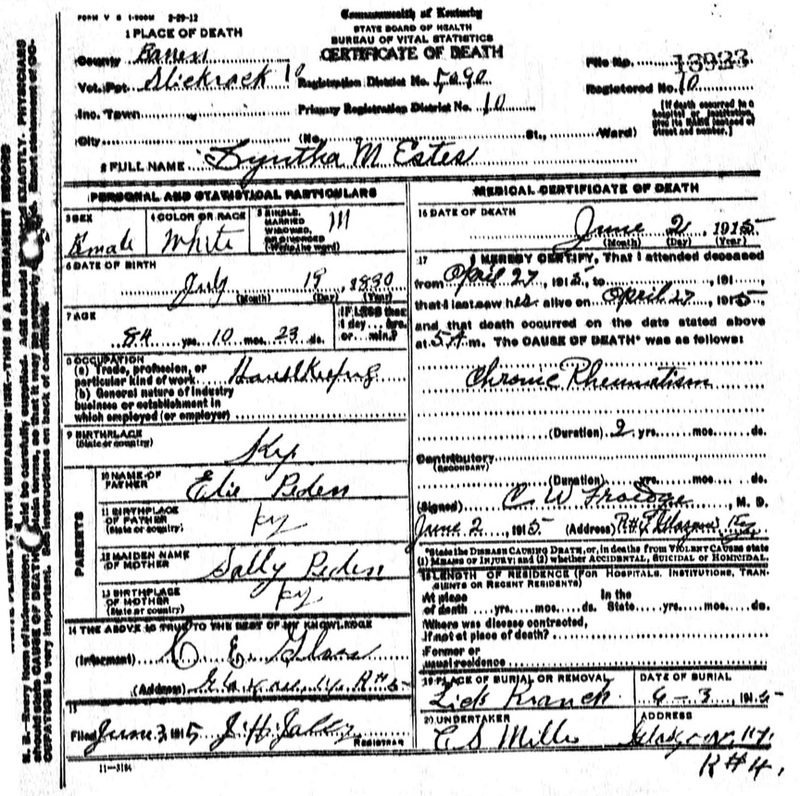 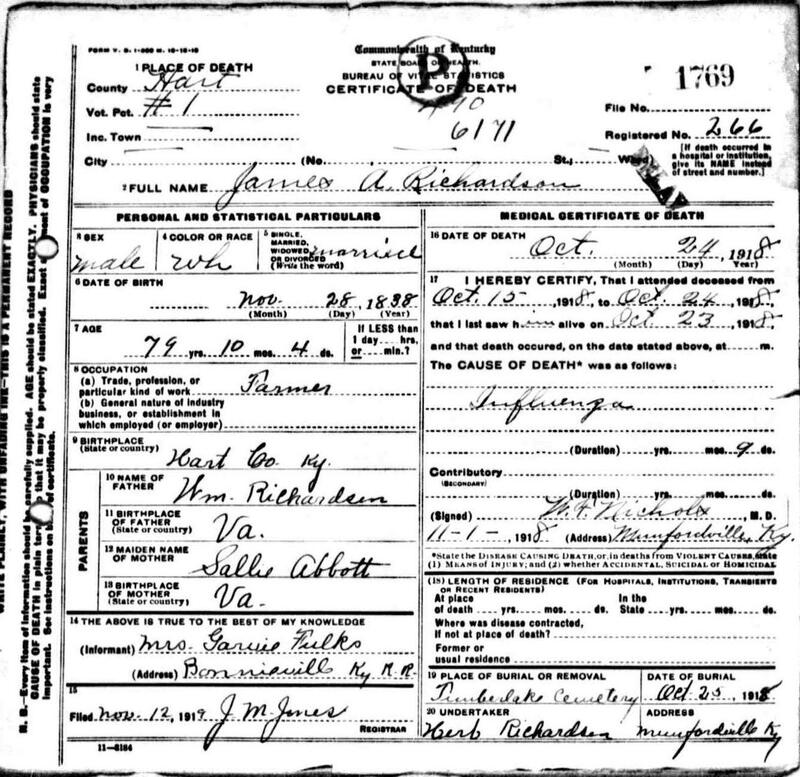 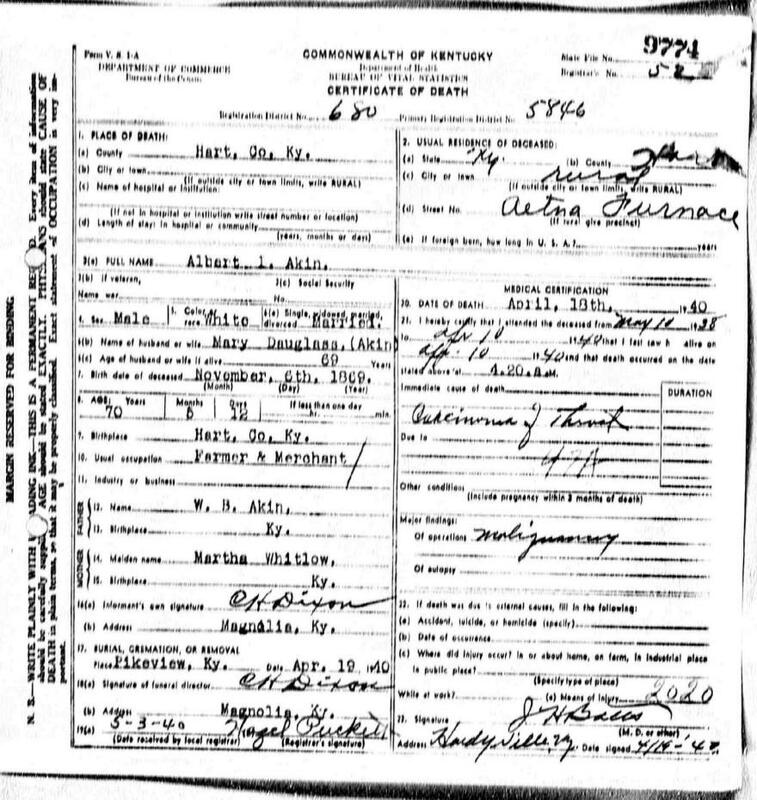 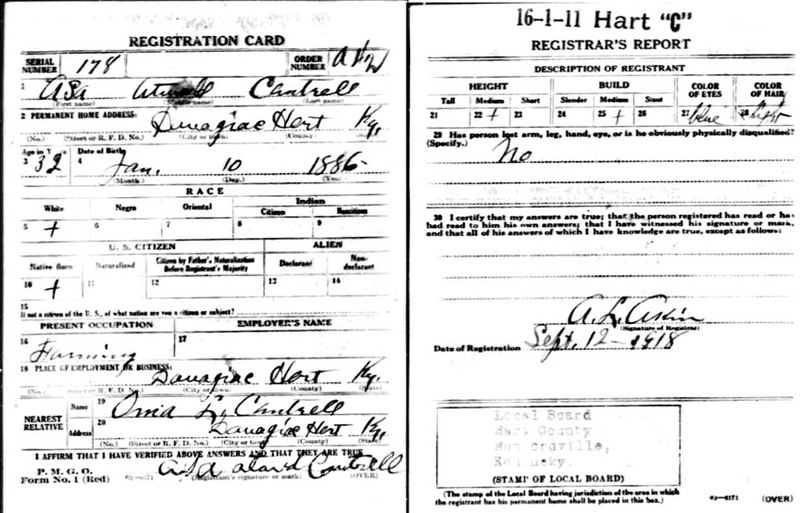 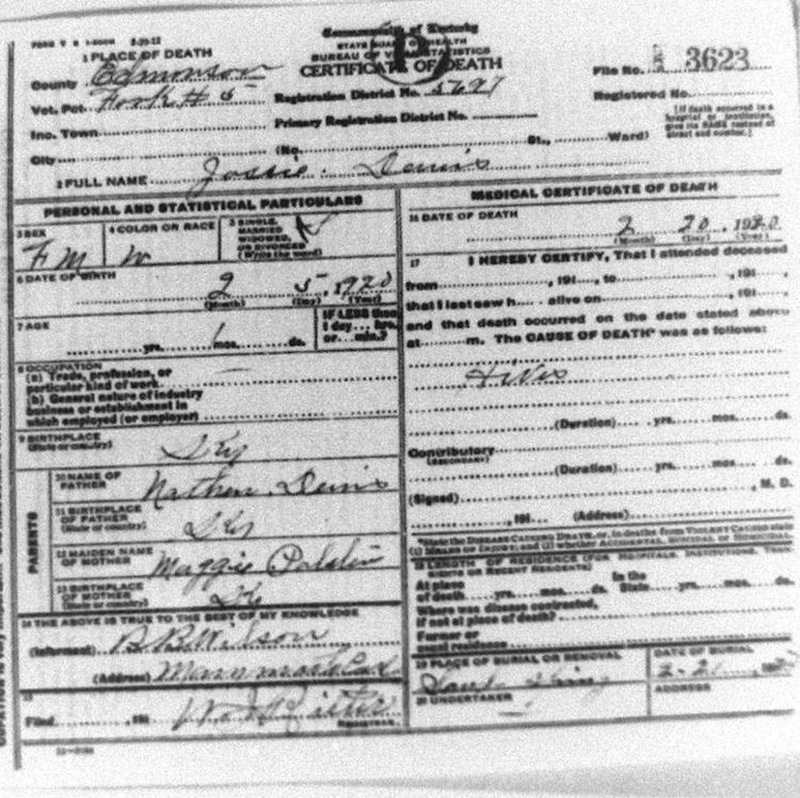 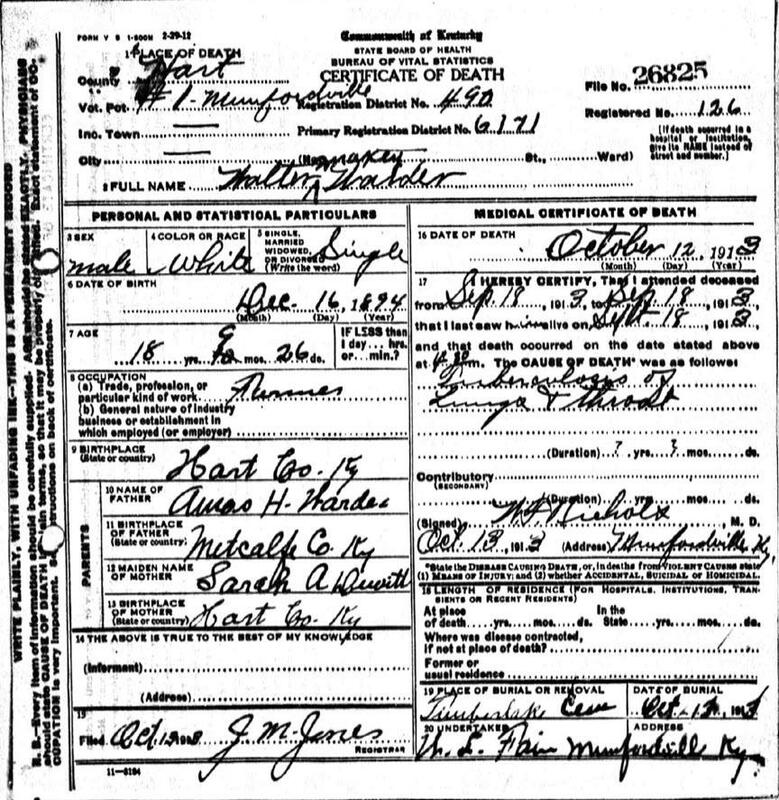 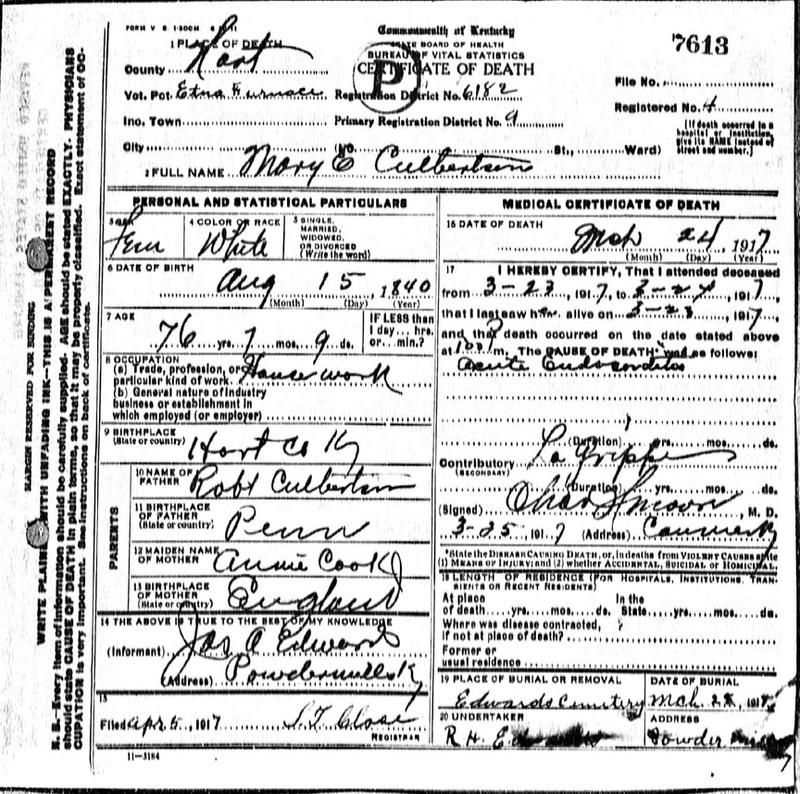 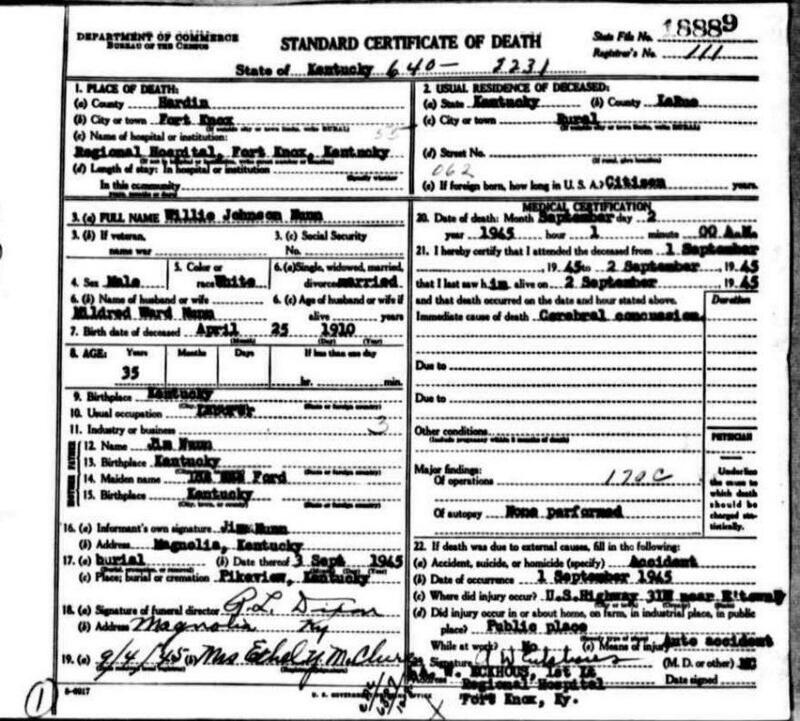 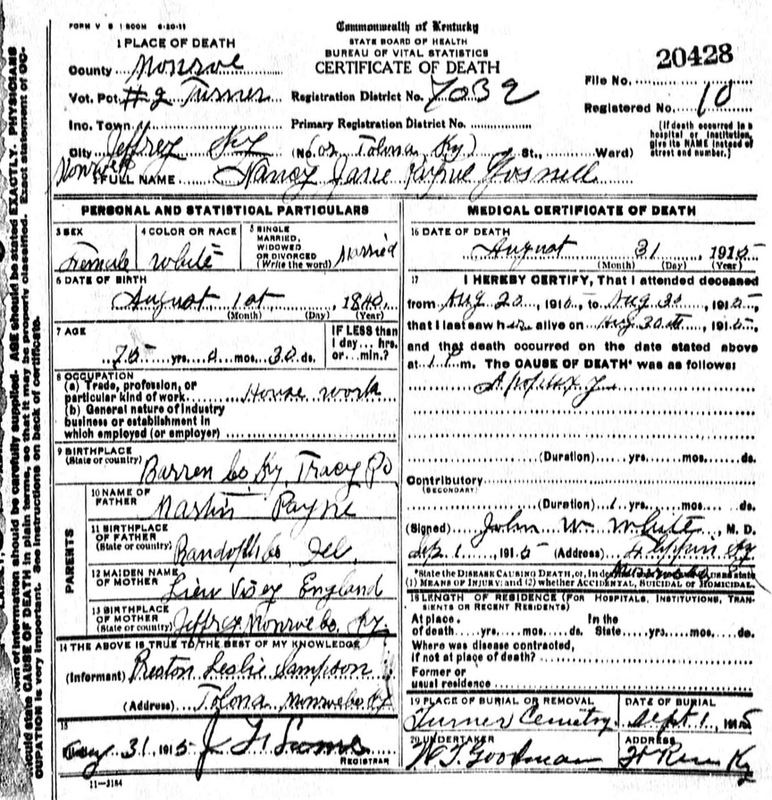 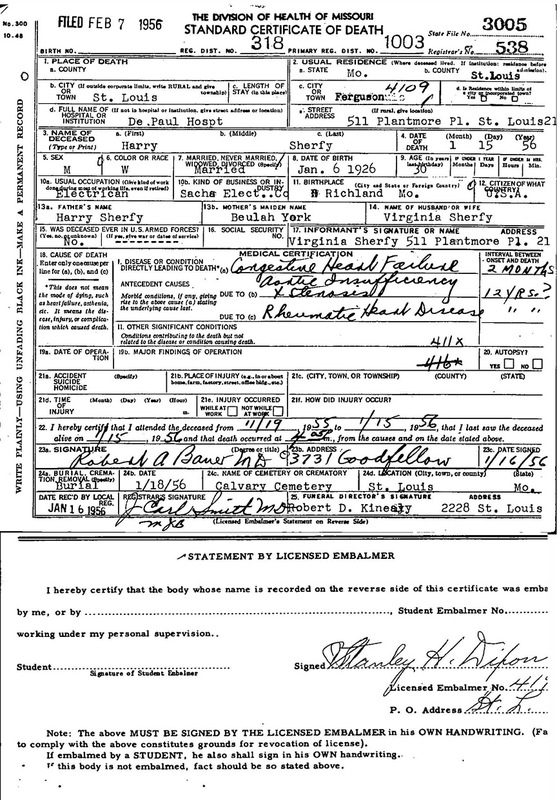 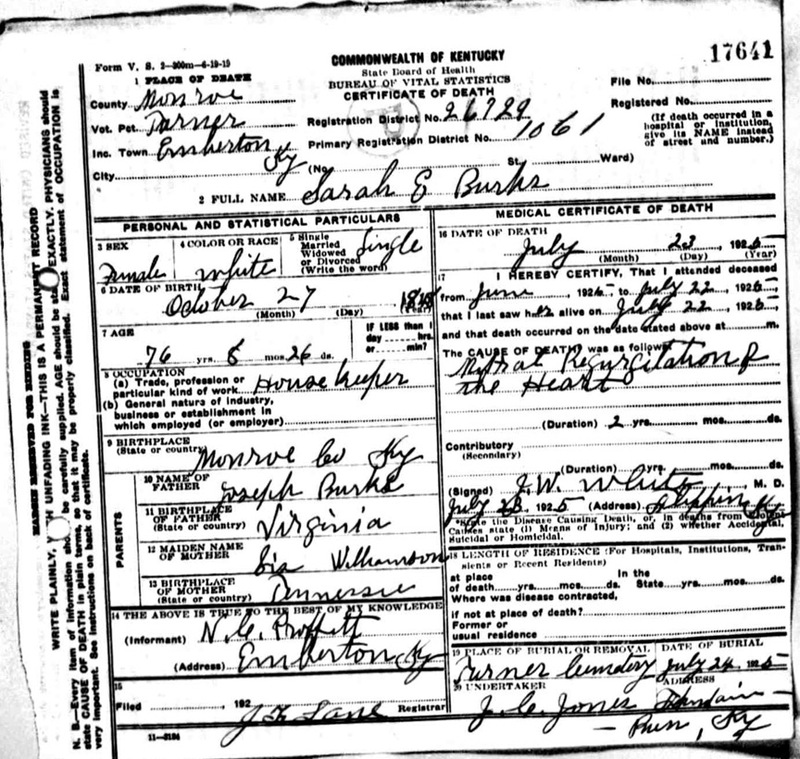 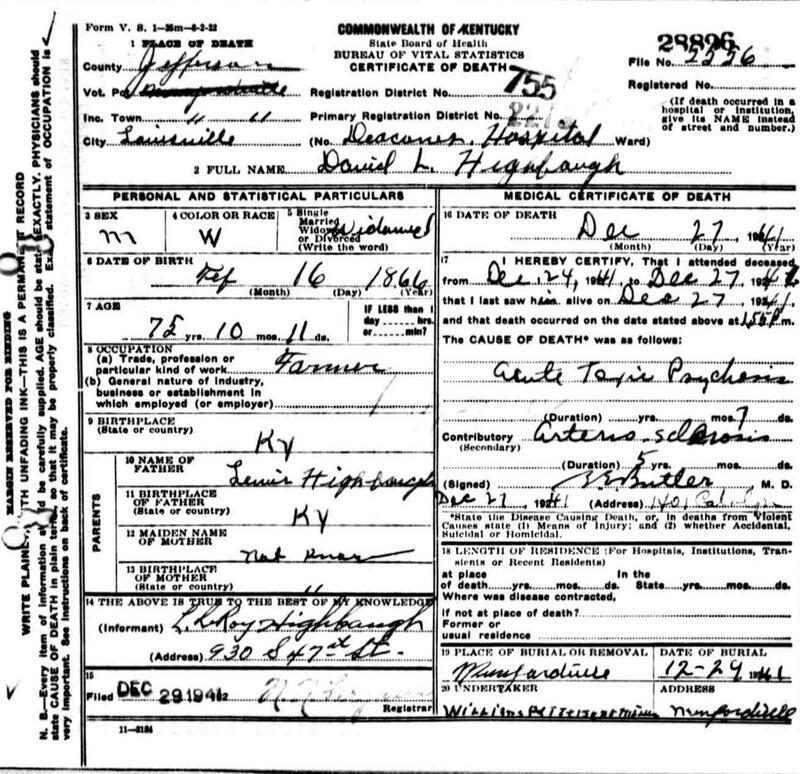 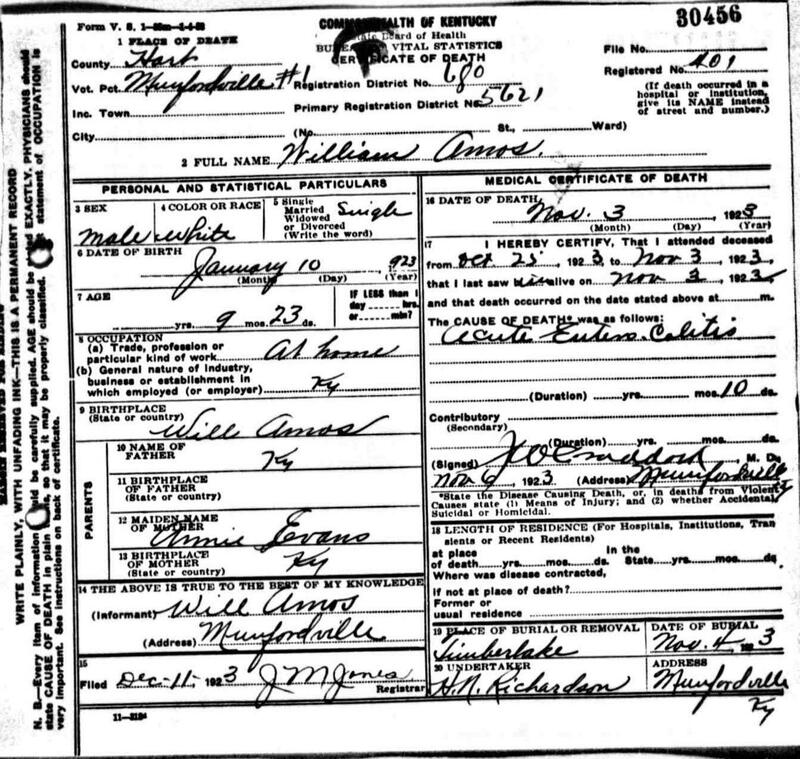 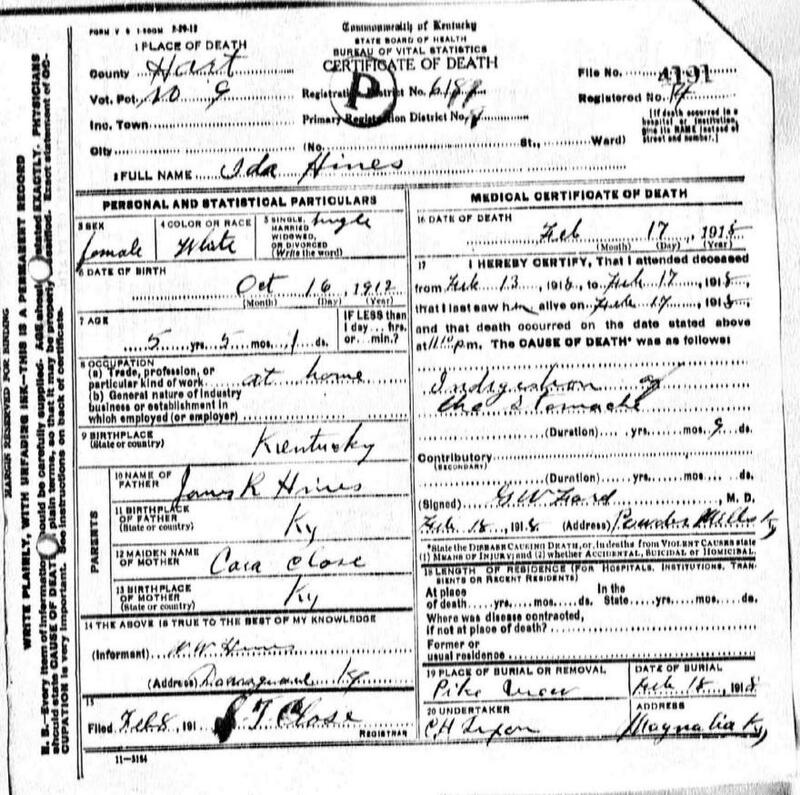 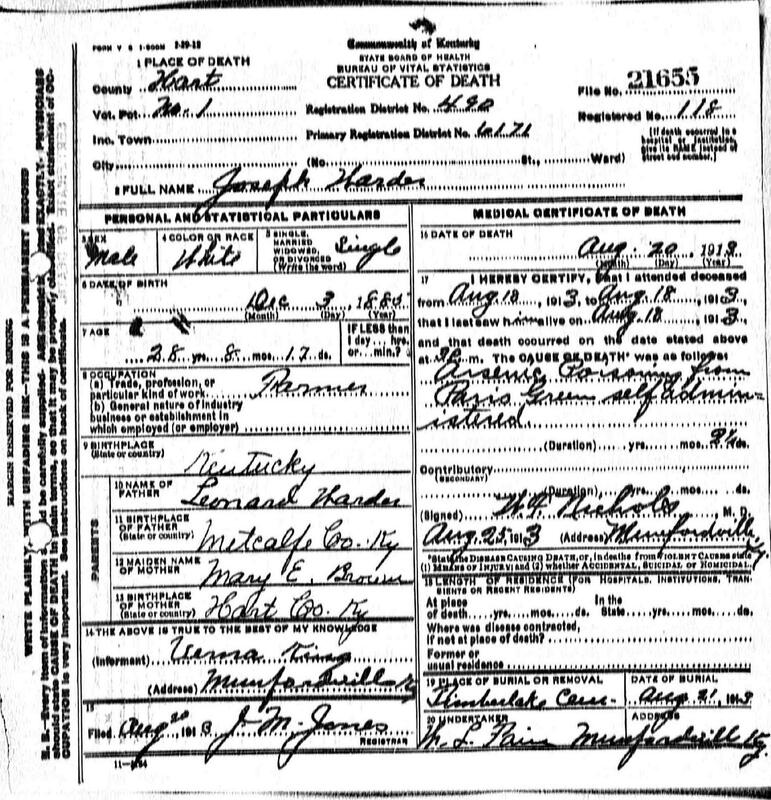 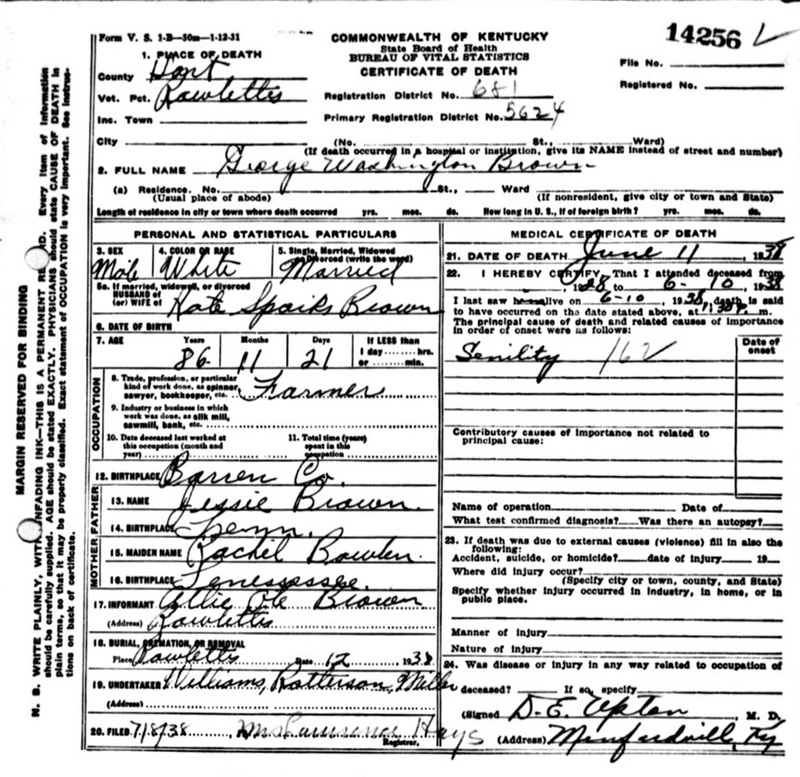 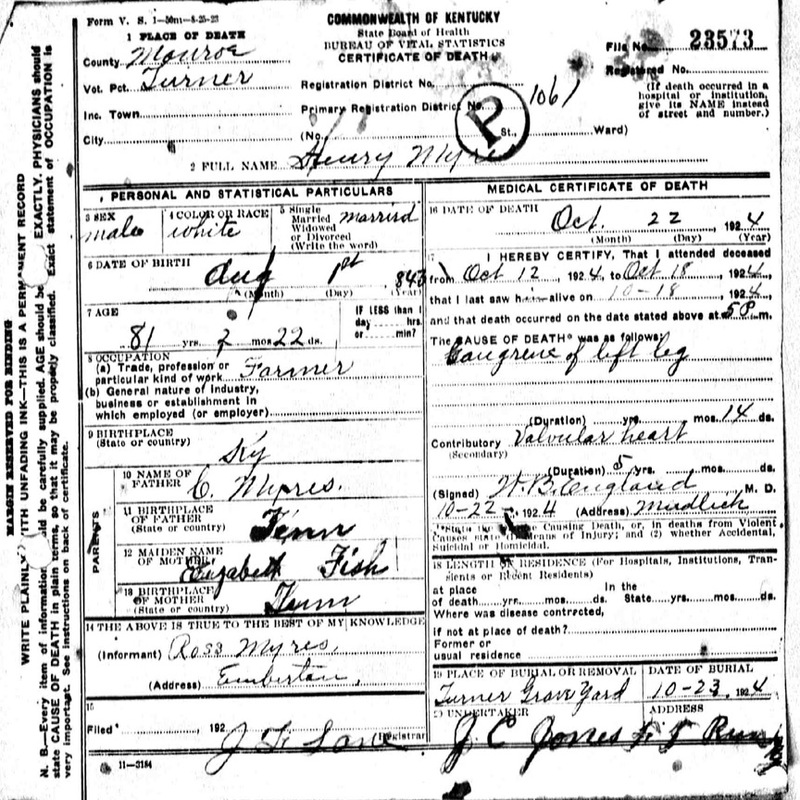 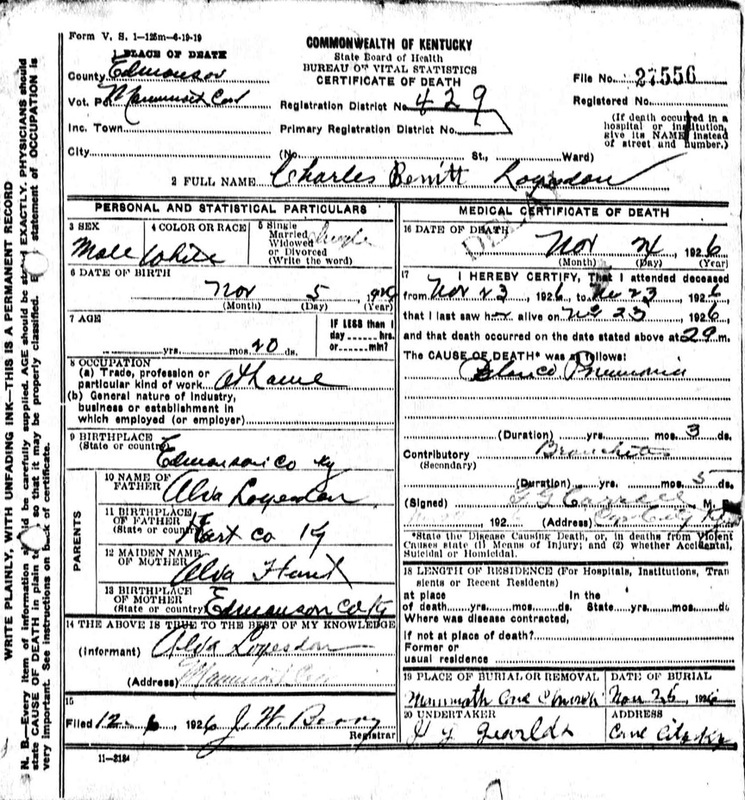 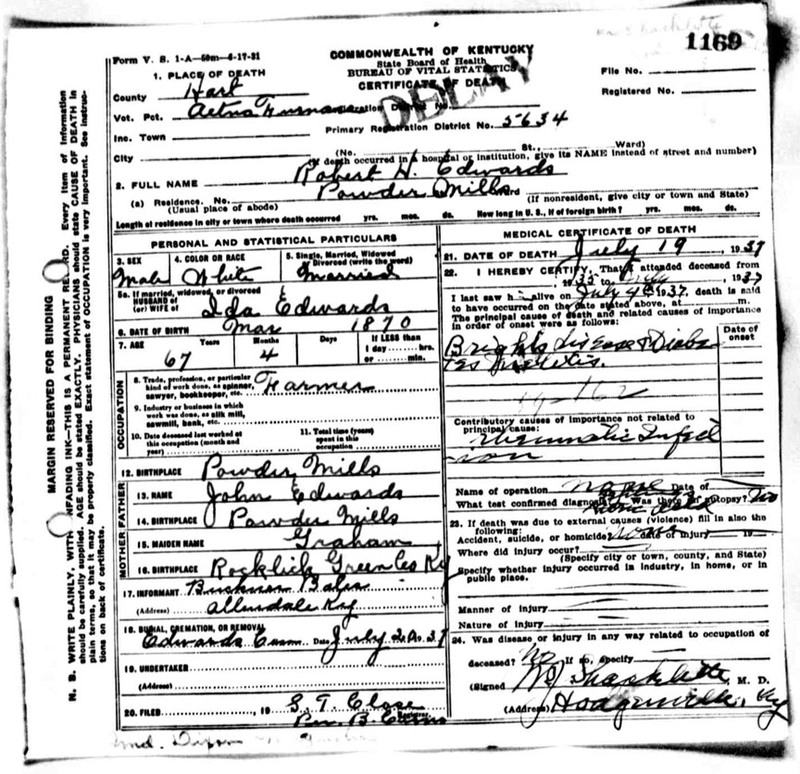 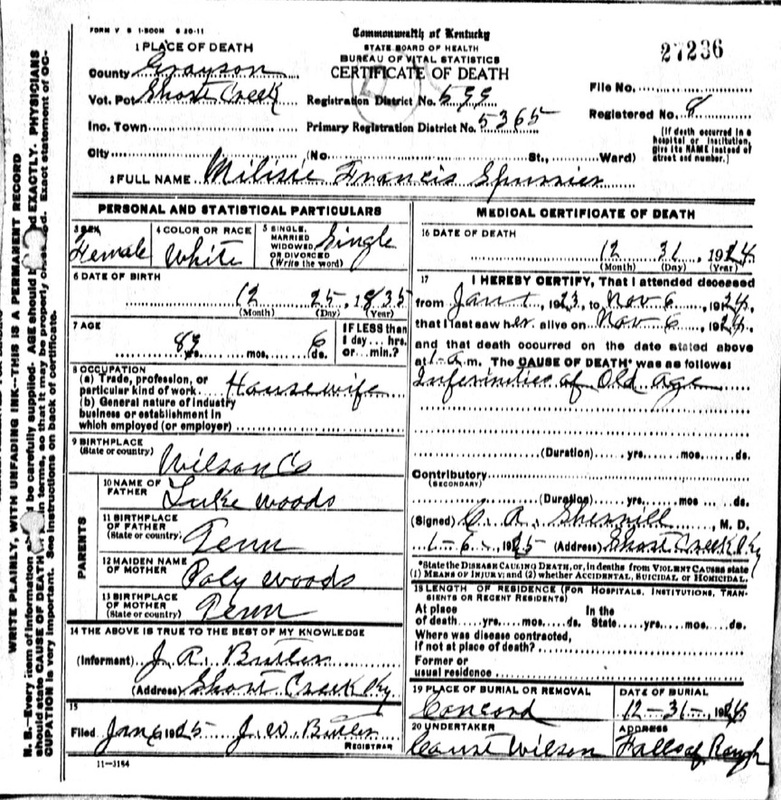 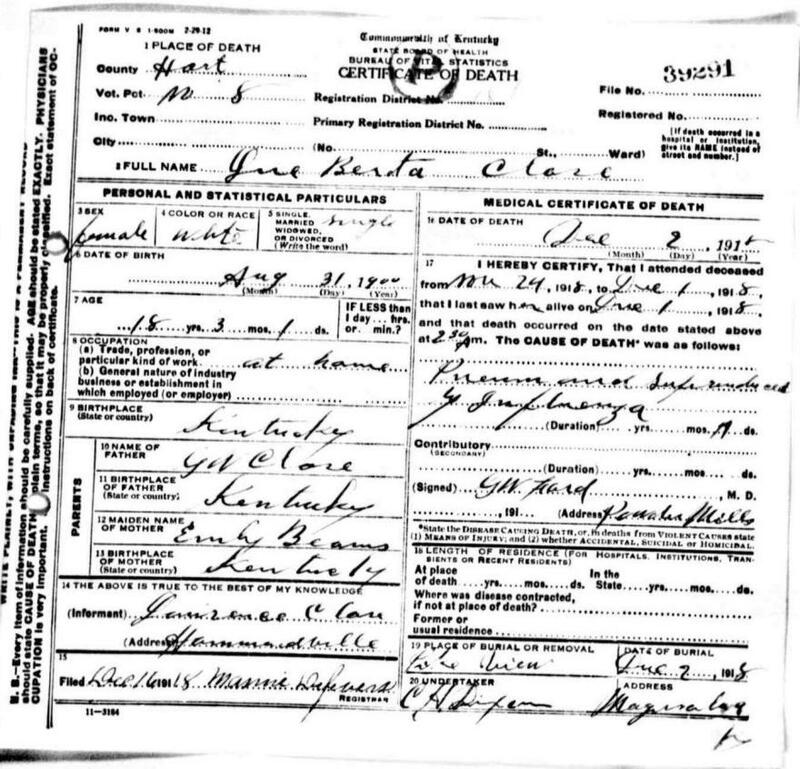 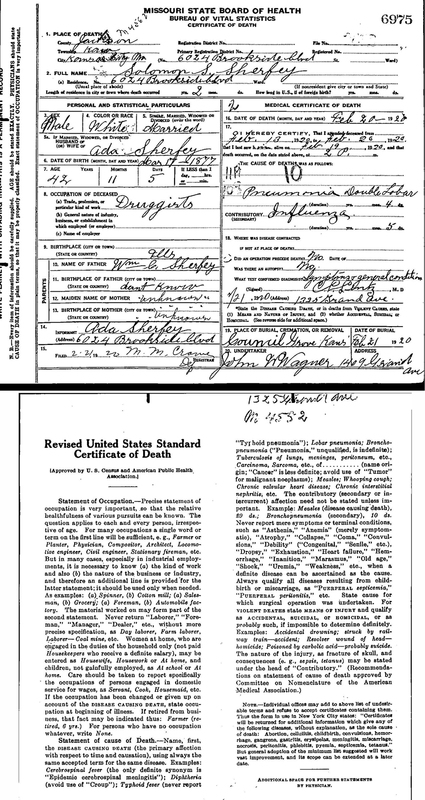 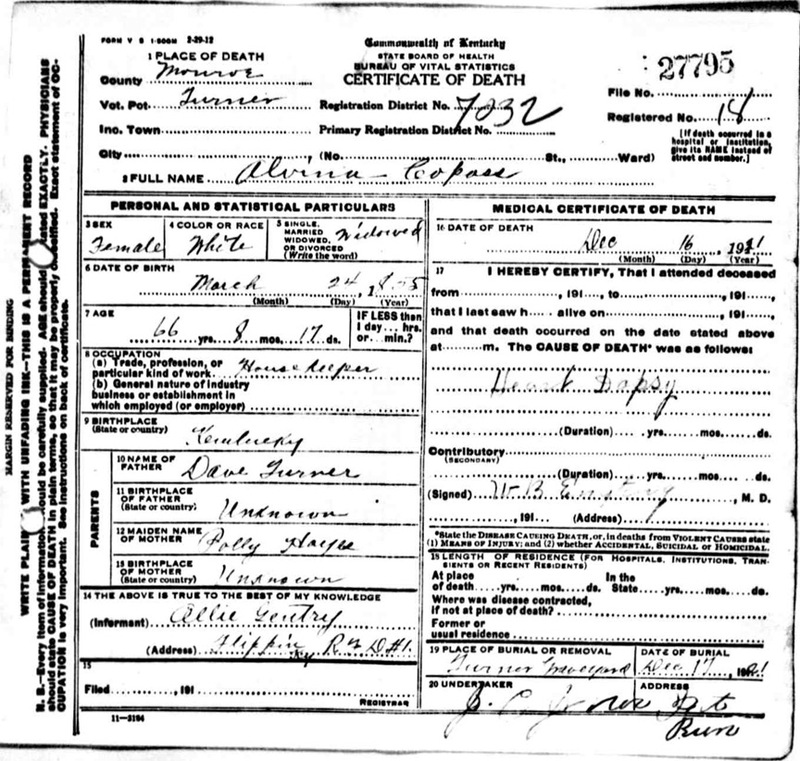 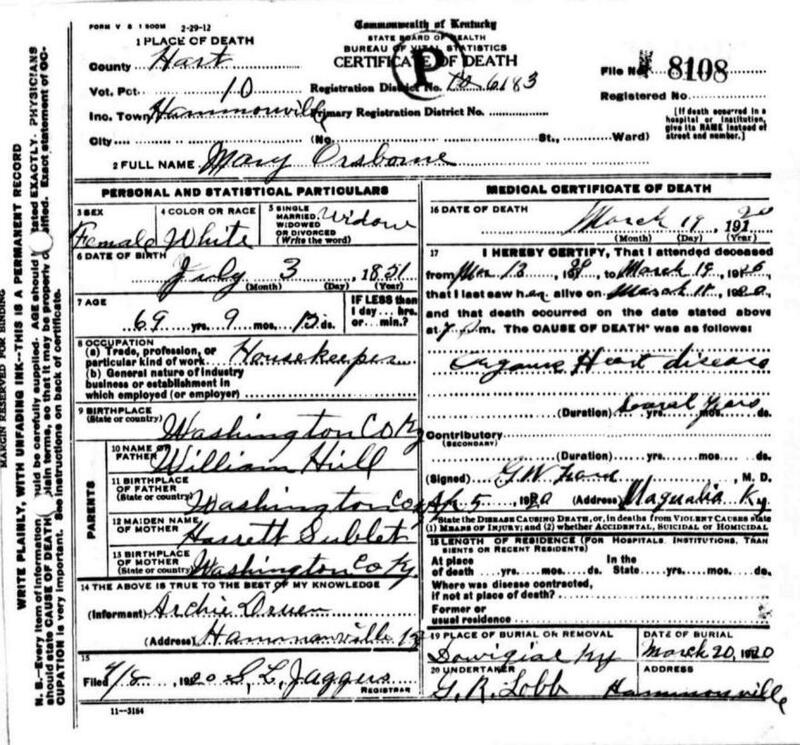 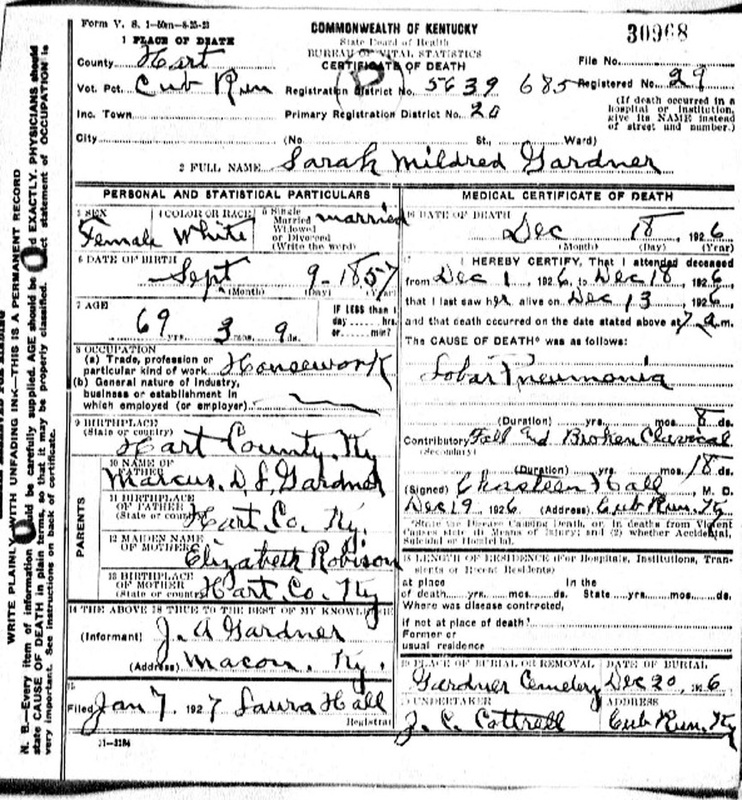 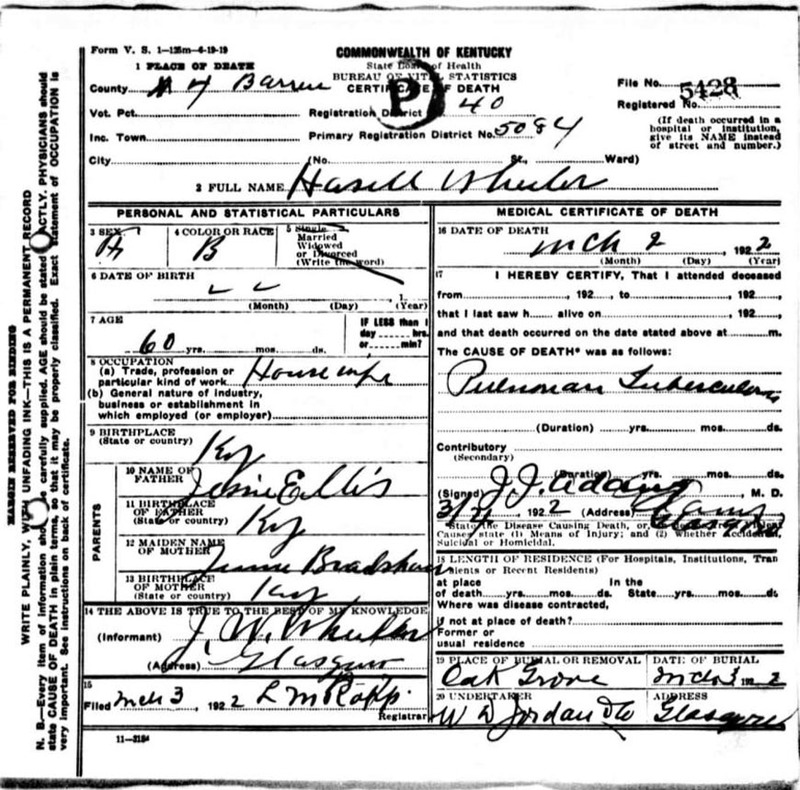 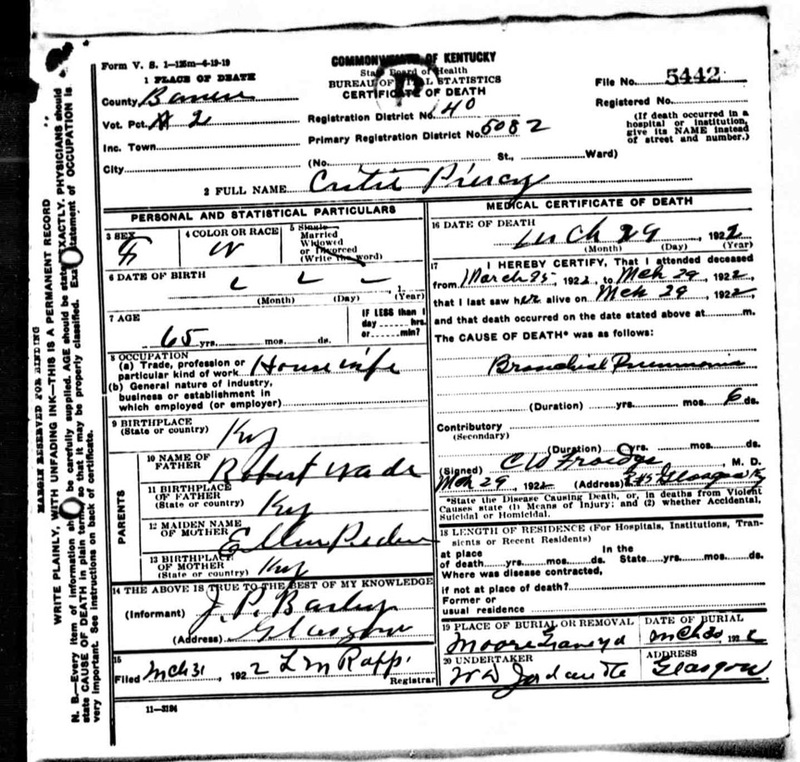 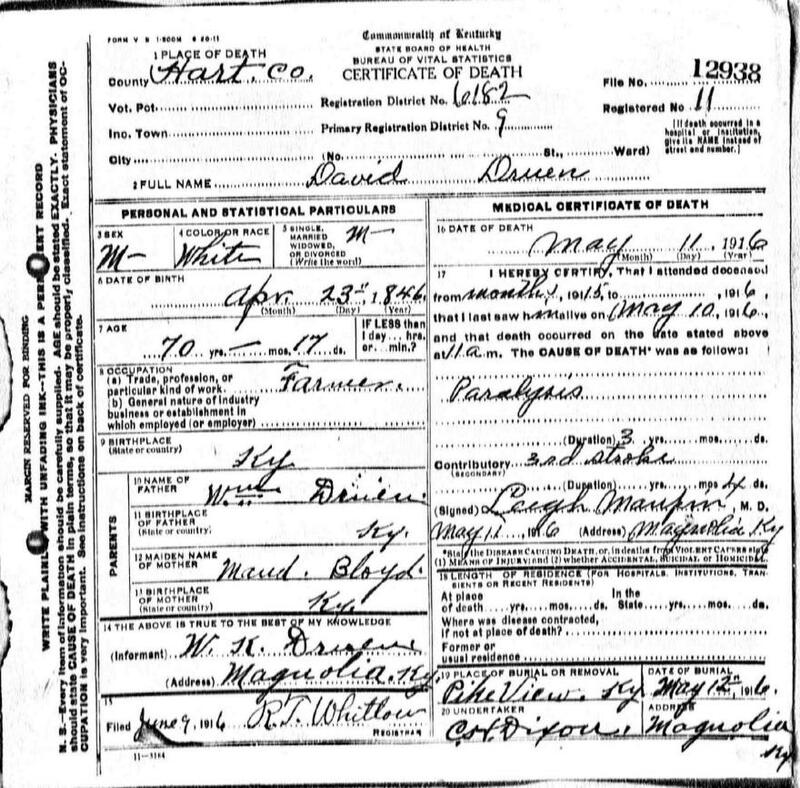 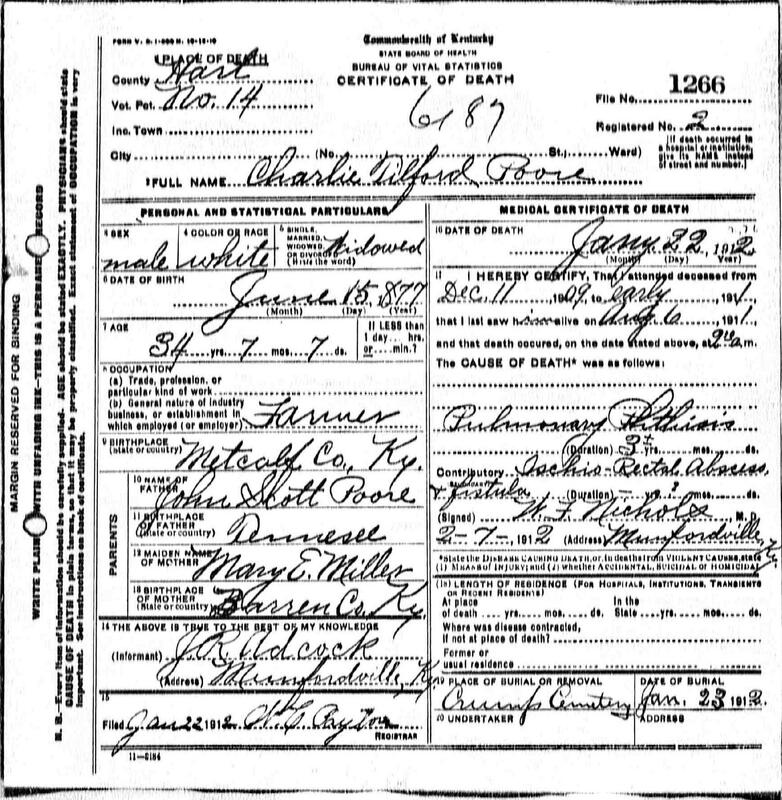 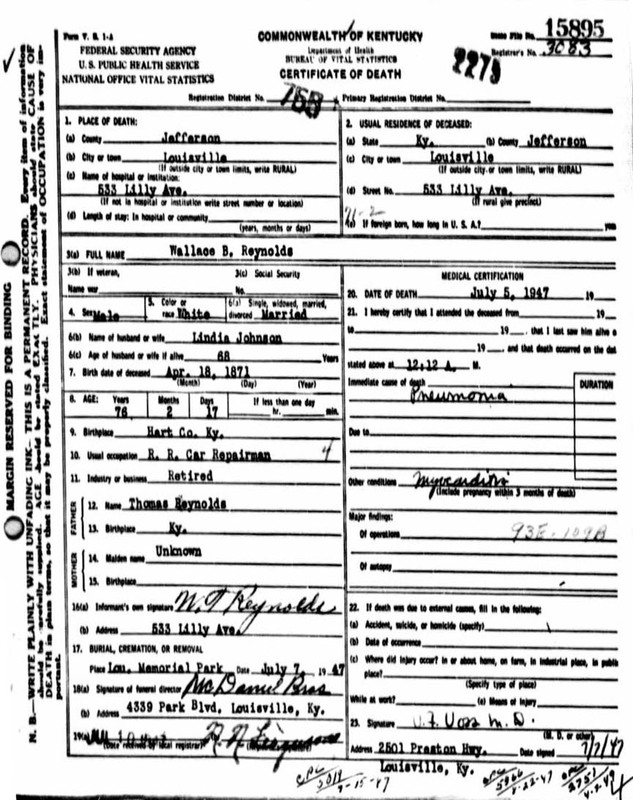 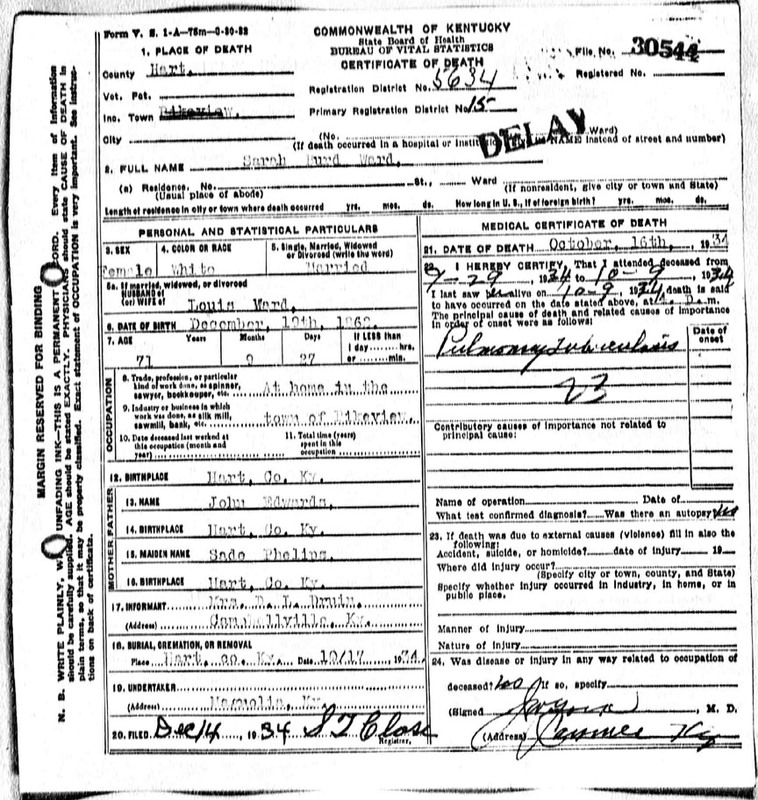 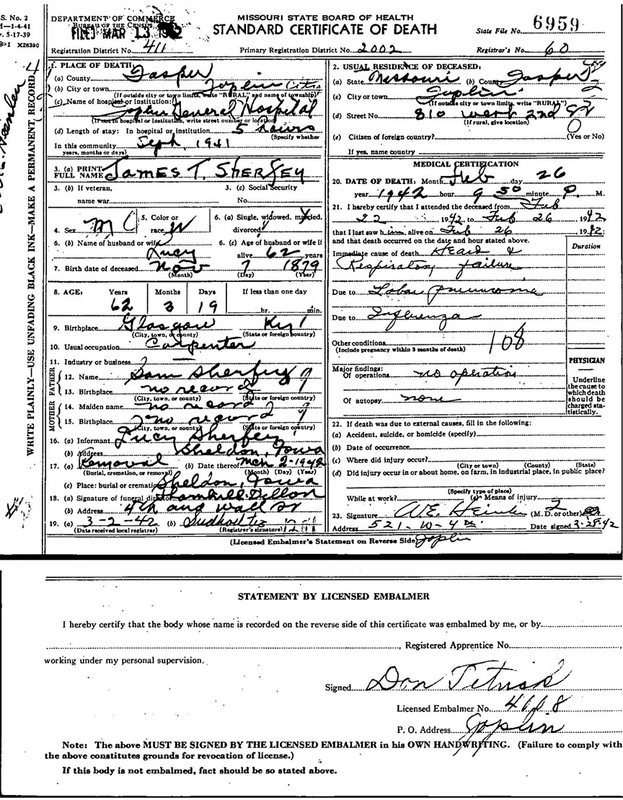 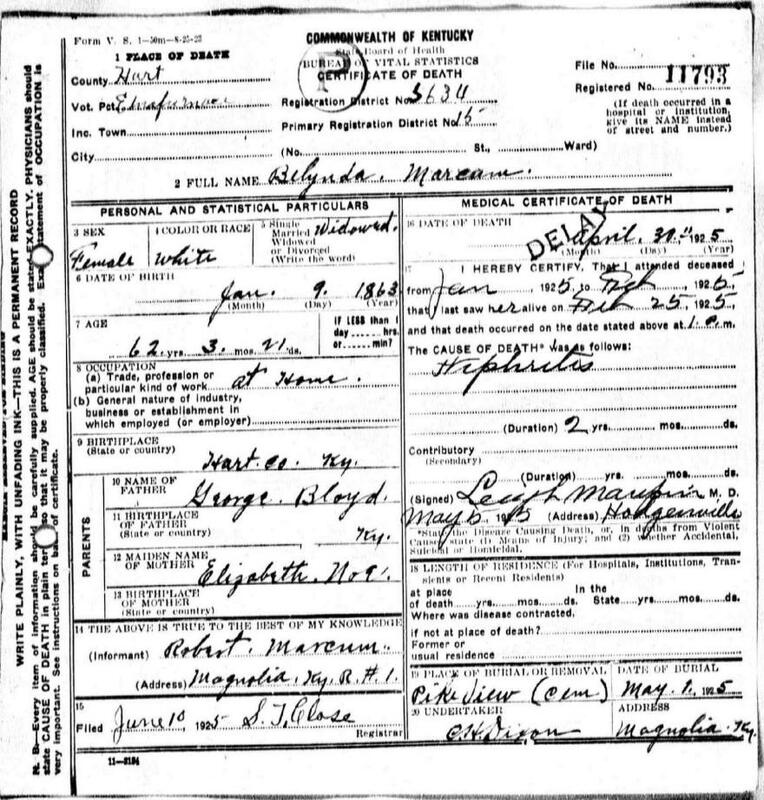 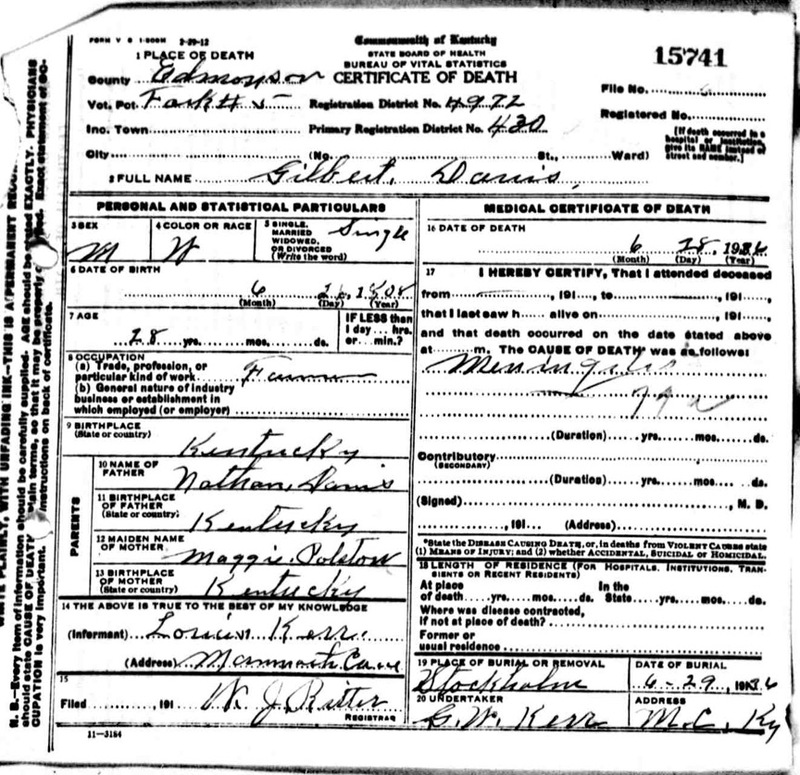 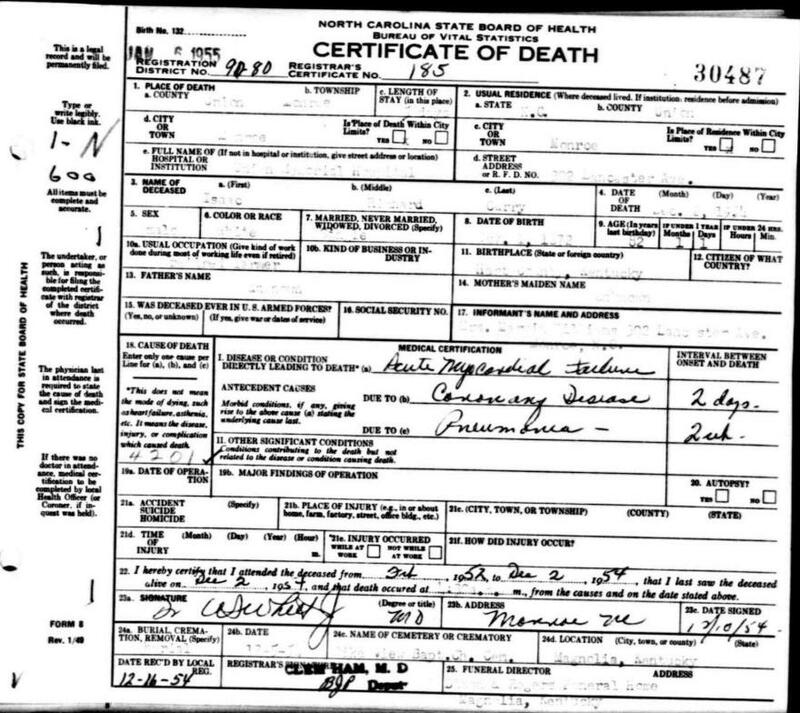 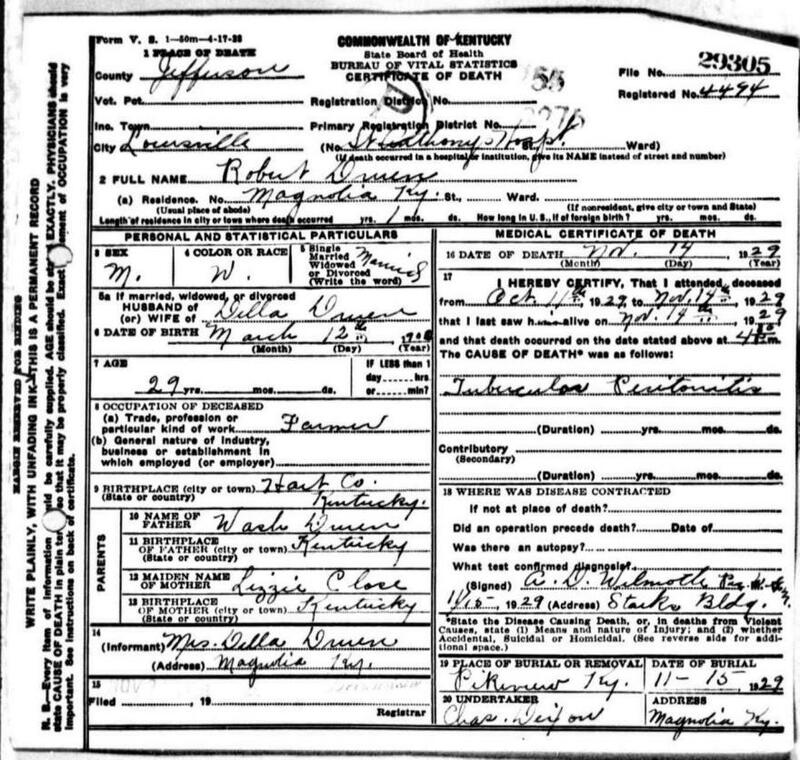 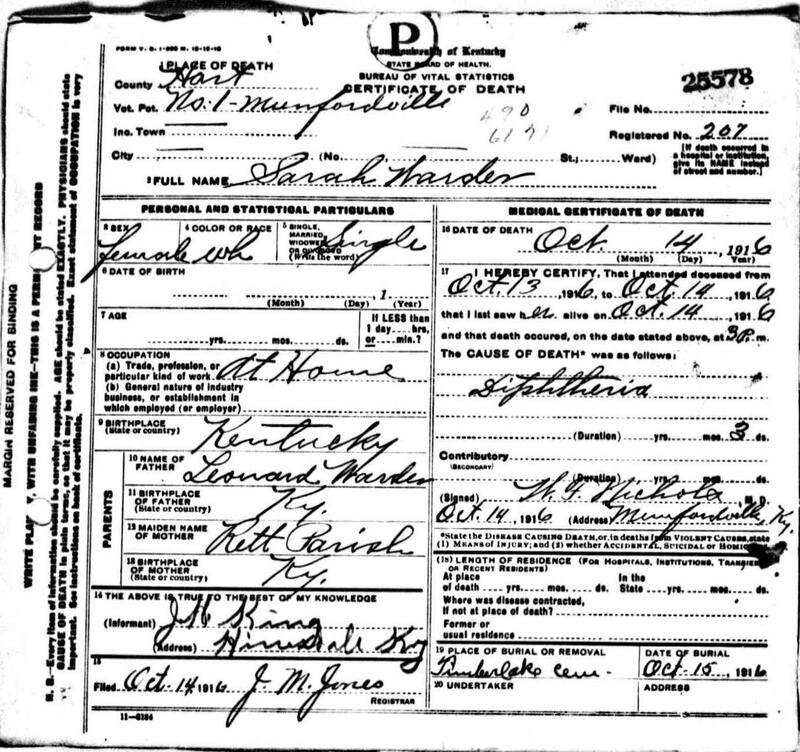 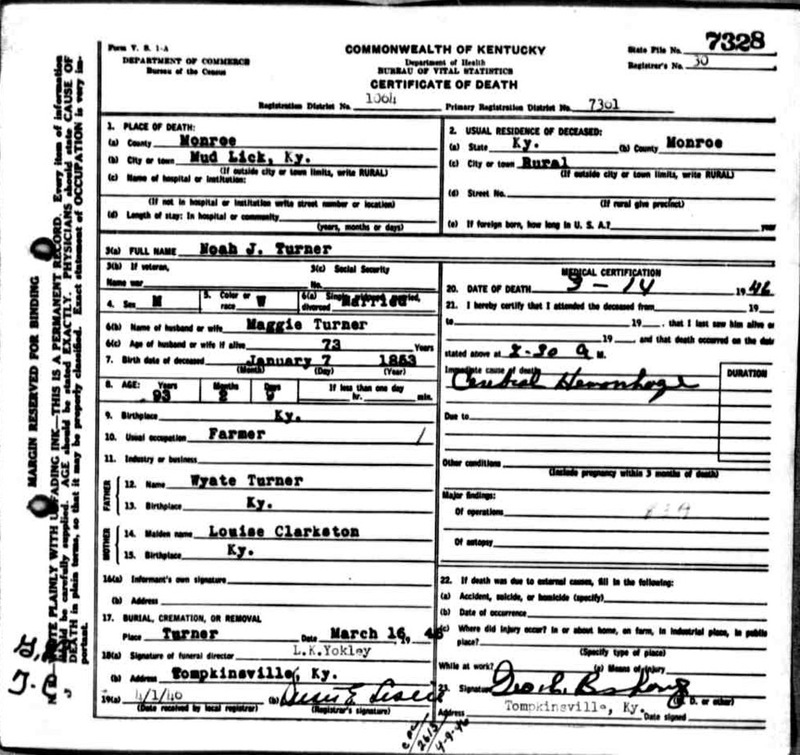 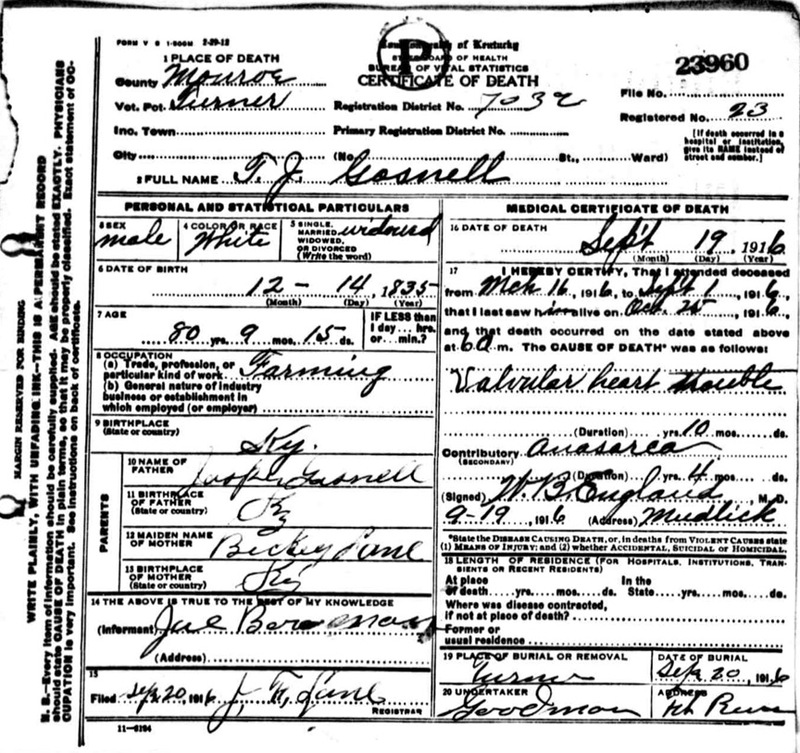 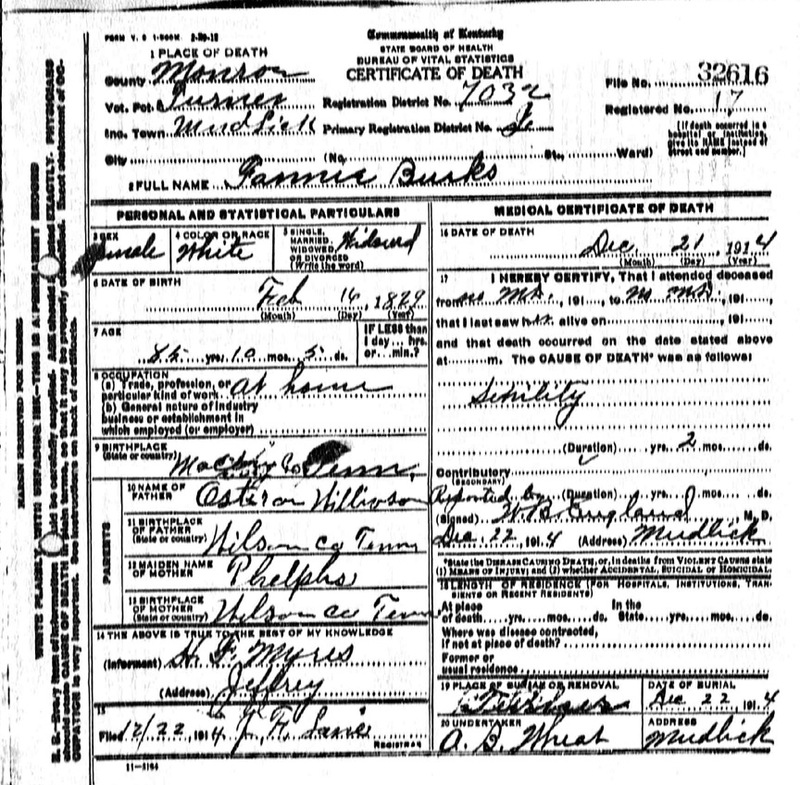 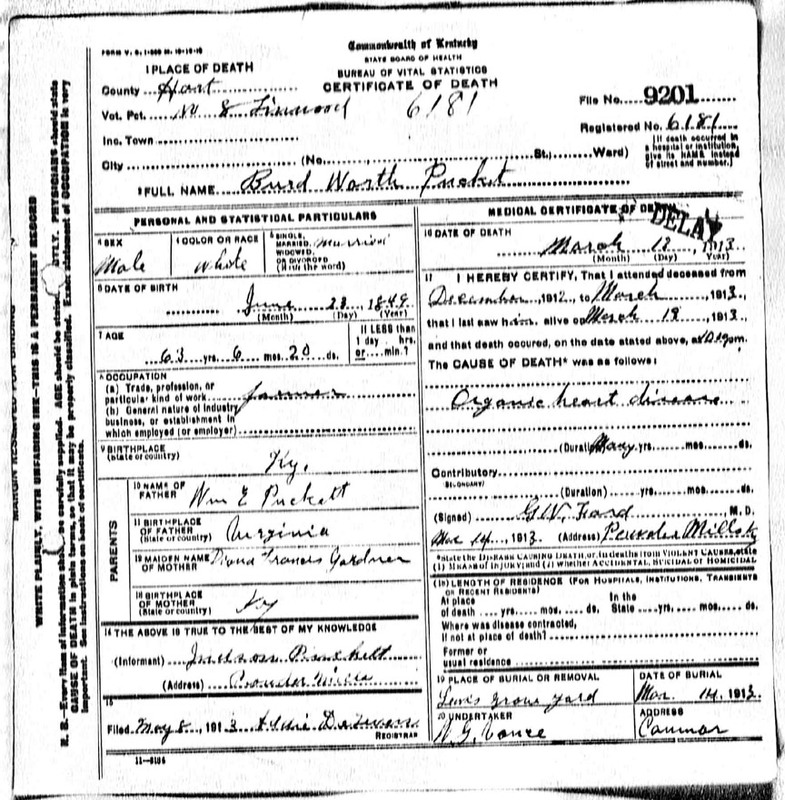 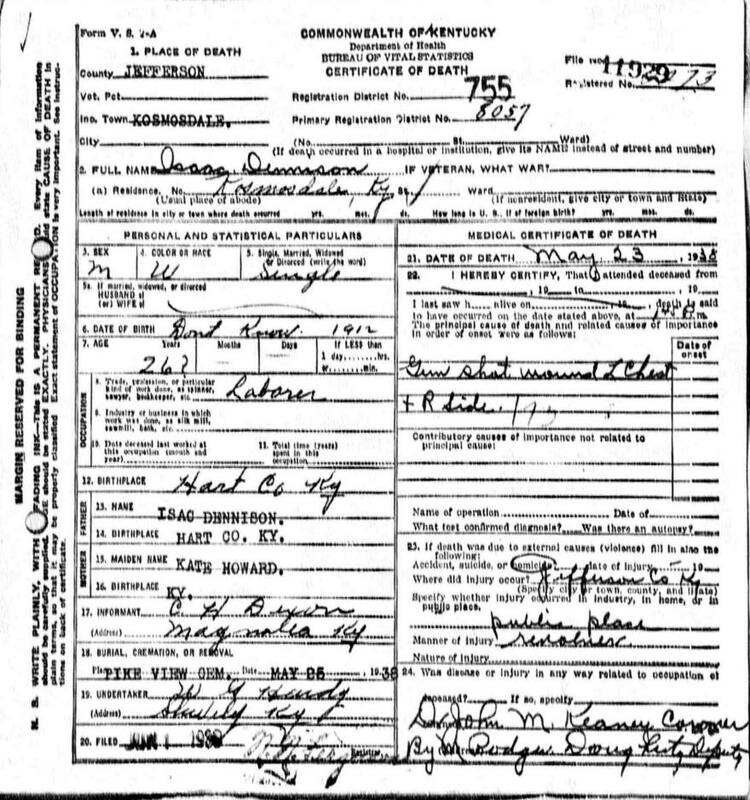 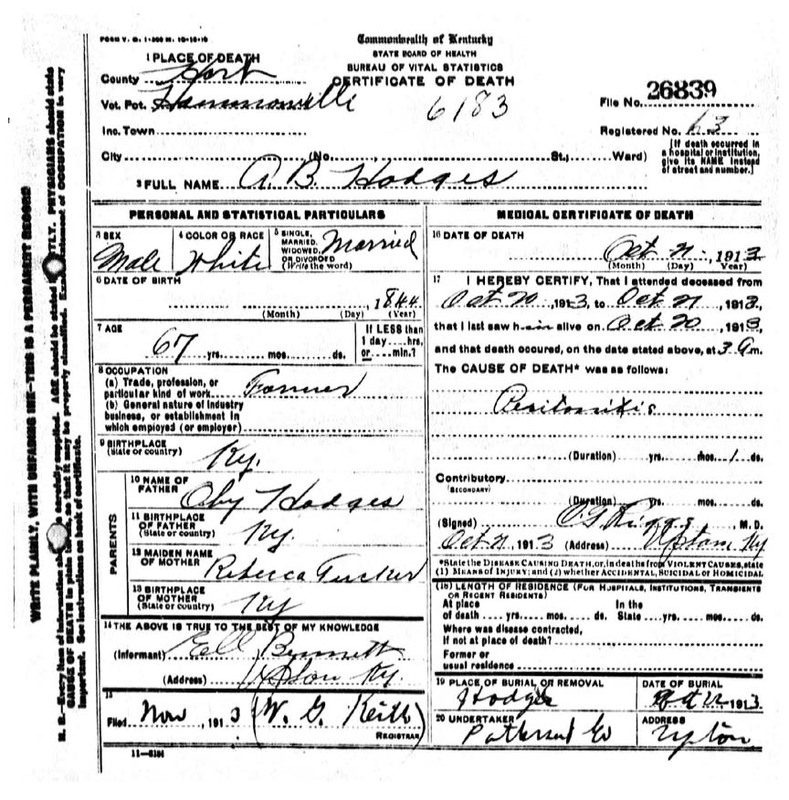 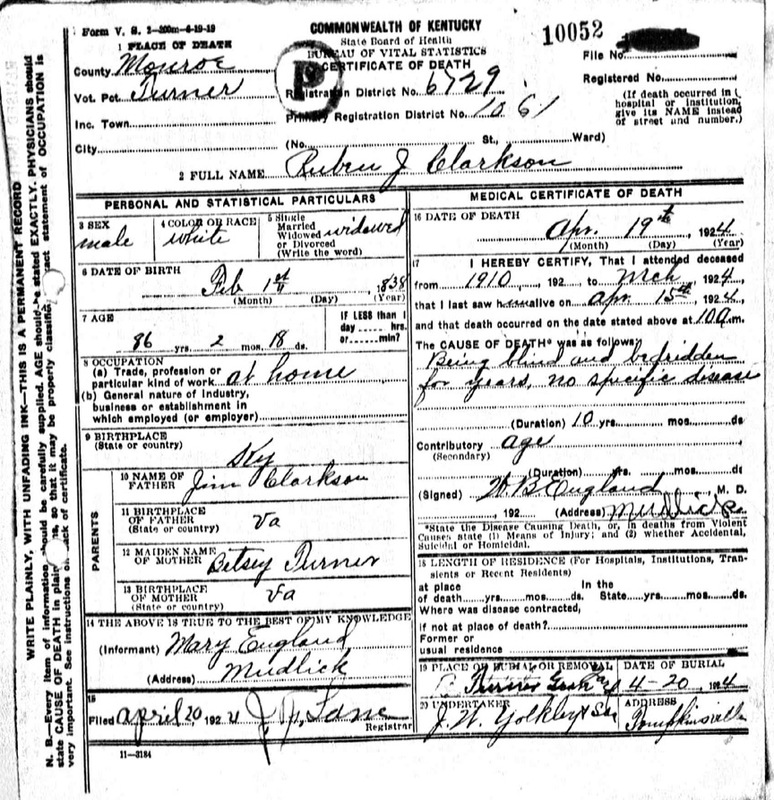 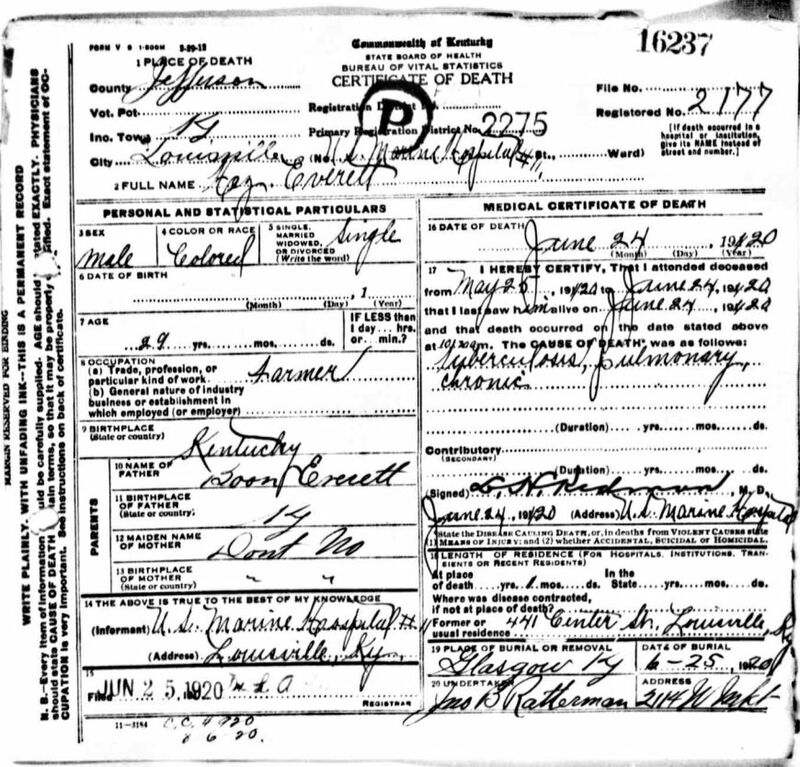 Added 12 death certificates - Surnames: Bennett, Childress, Doyle, Denson (Denison), Ganter, Gerald, Harper, Heyser, Hunter, Maxey(Joe Fields Cem), Sanders, Sternberg, Worf- many of these were likely submitted? 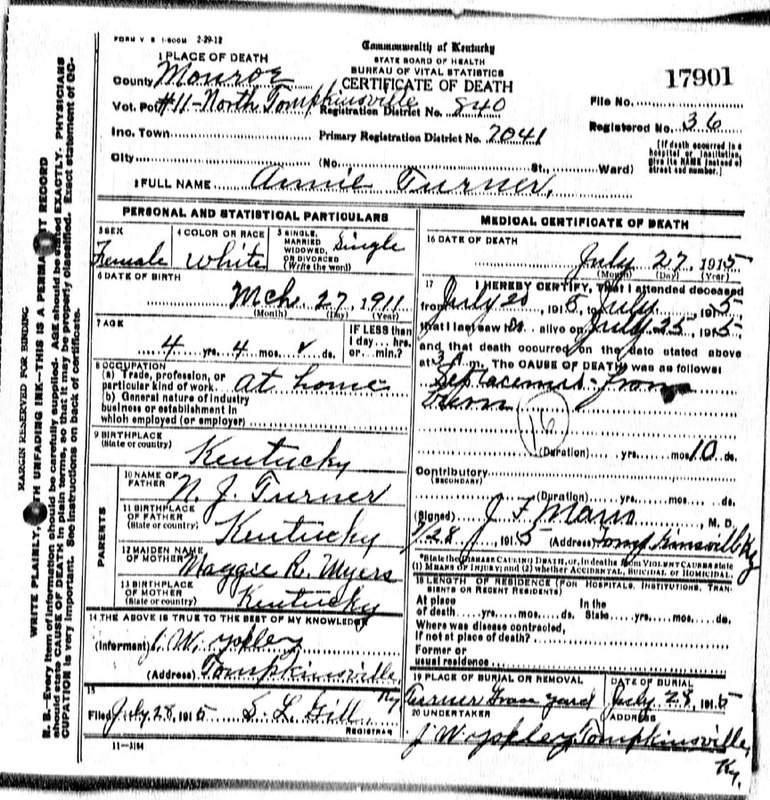 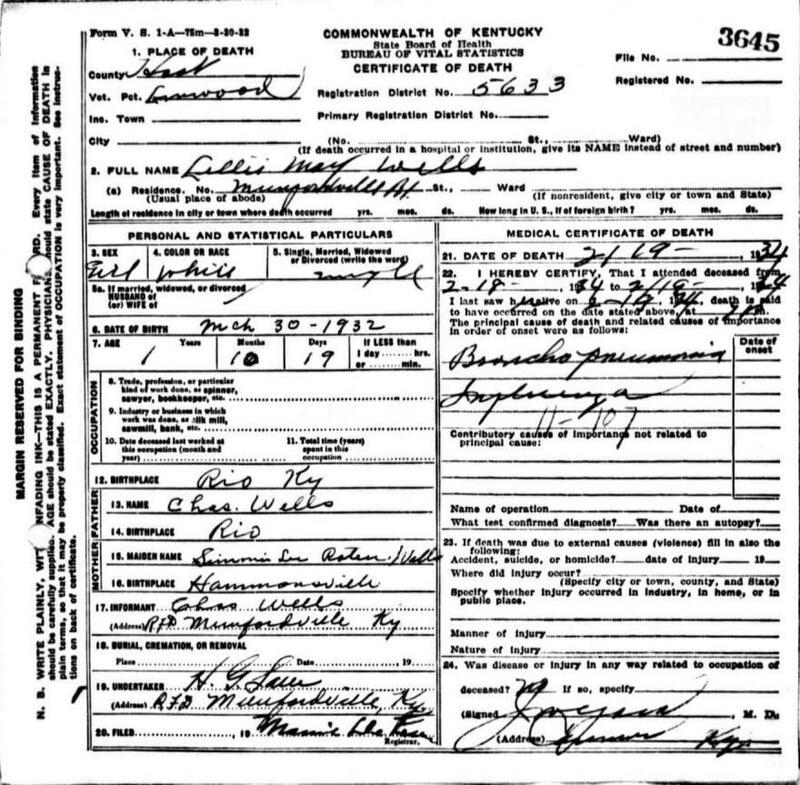 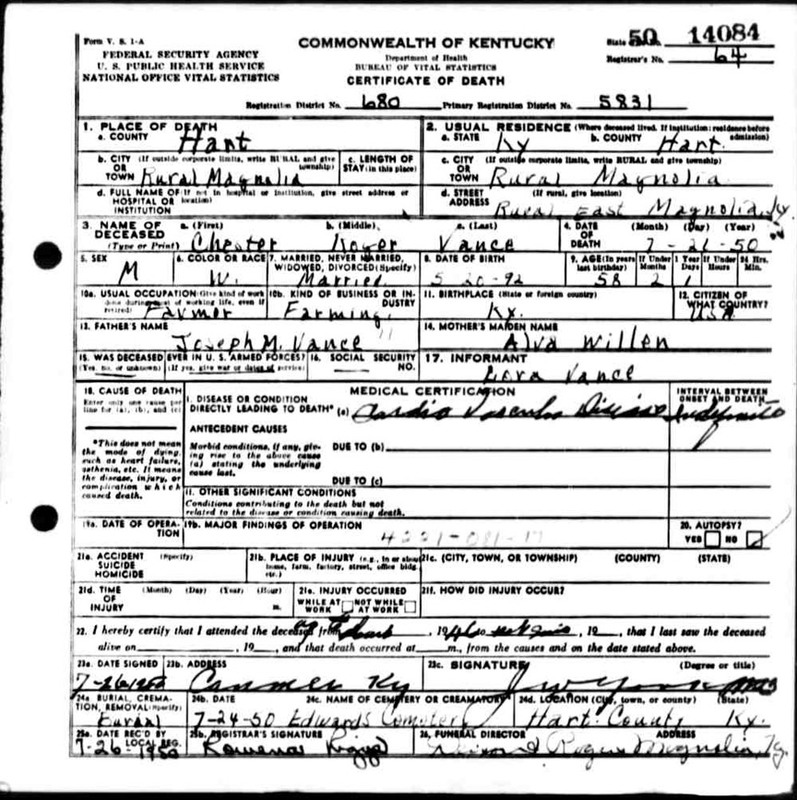 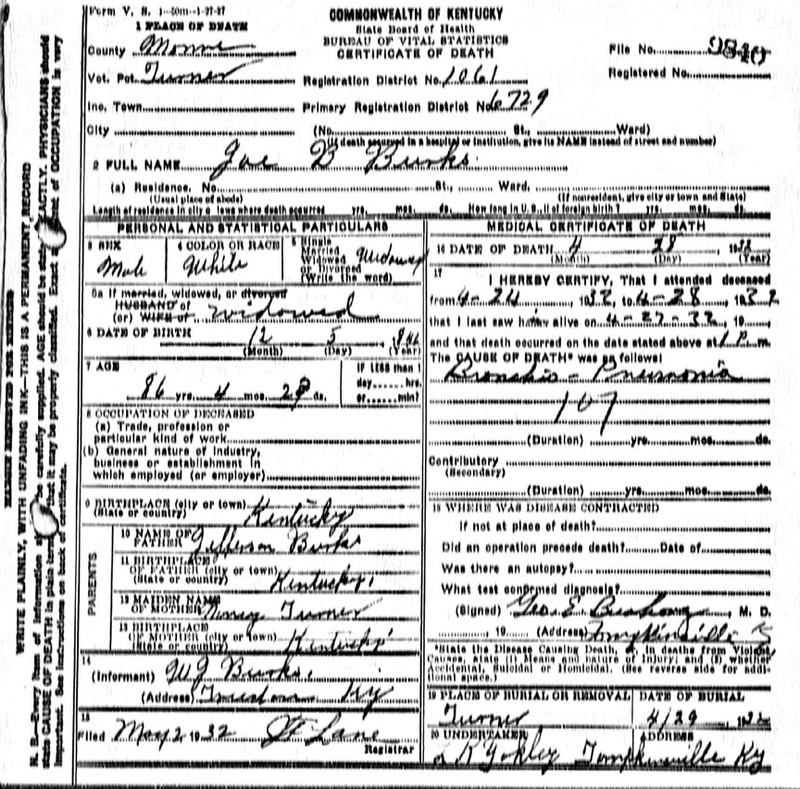 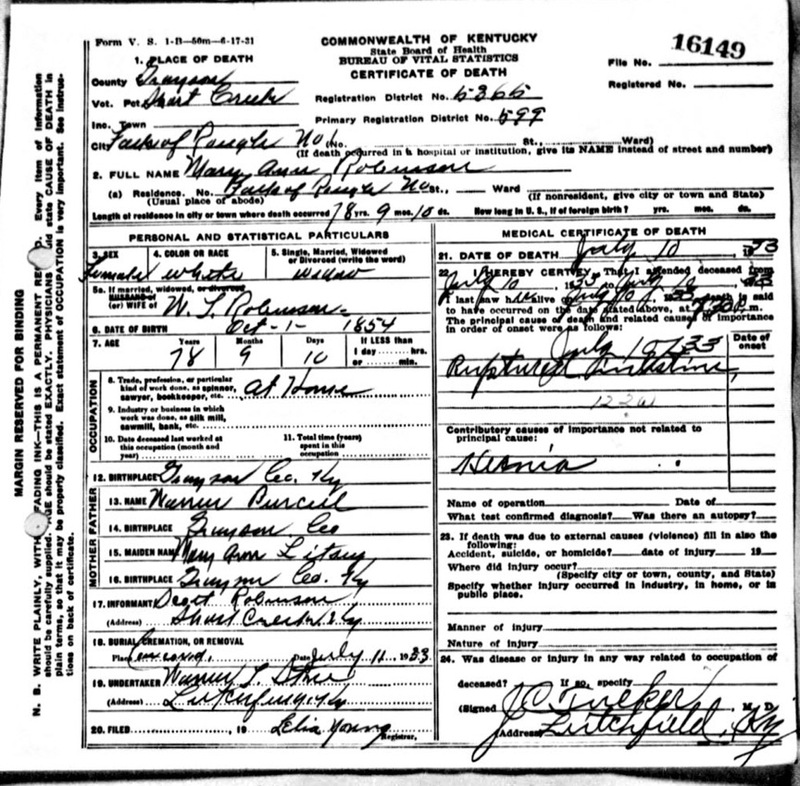 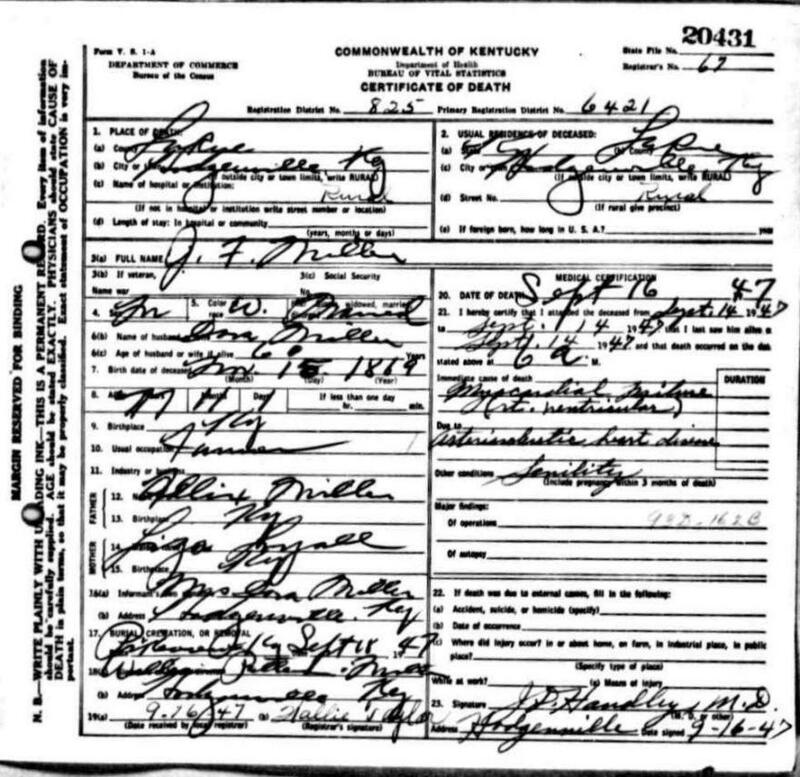 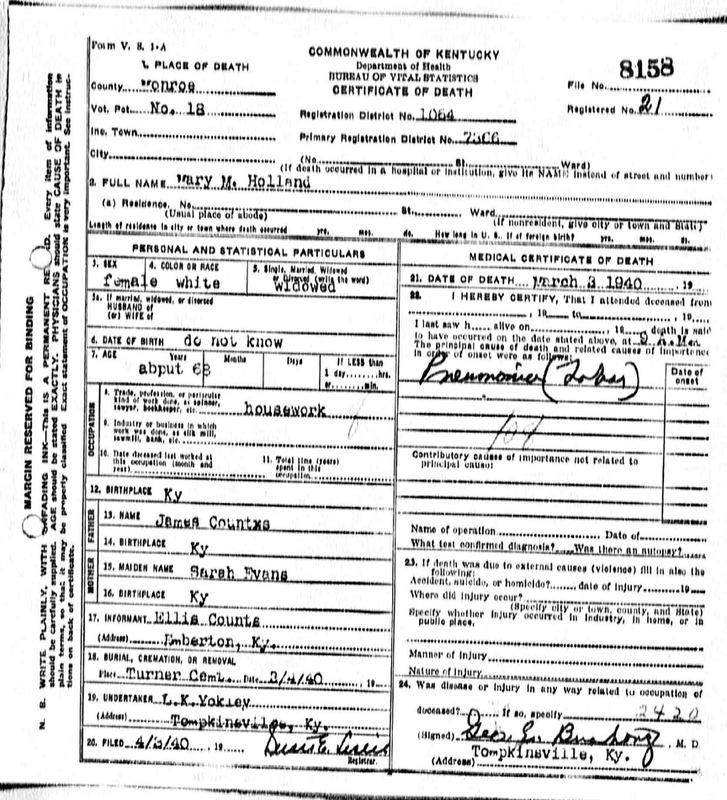 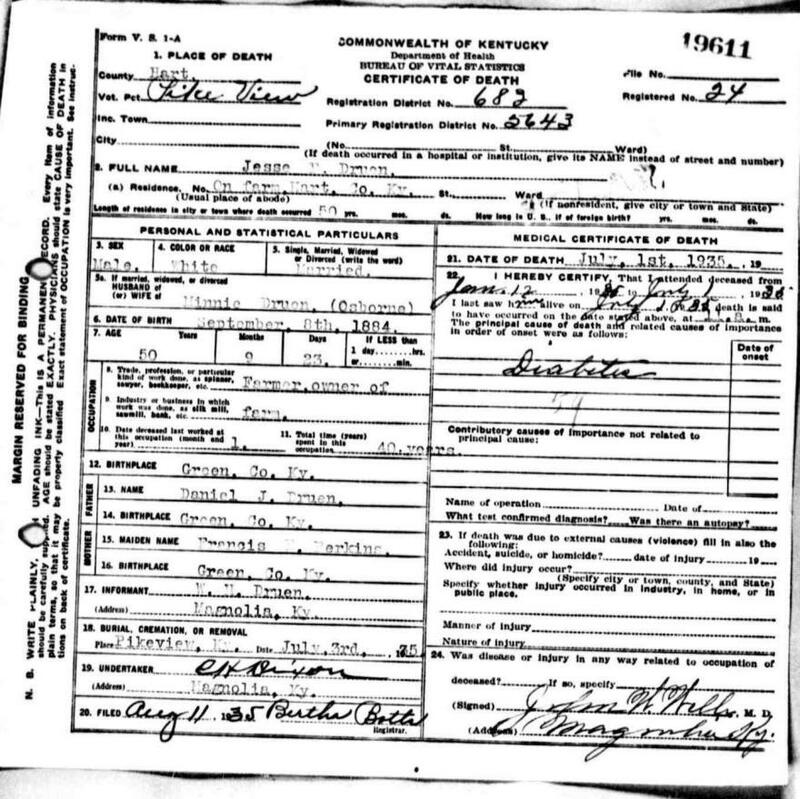 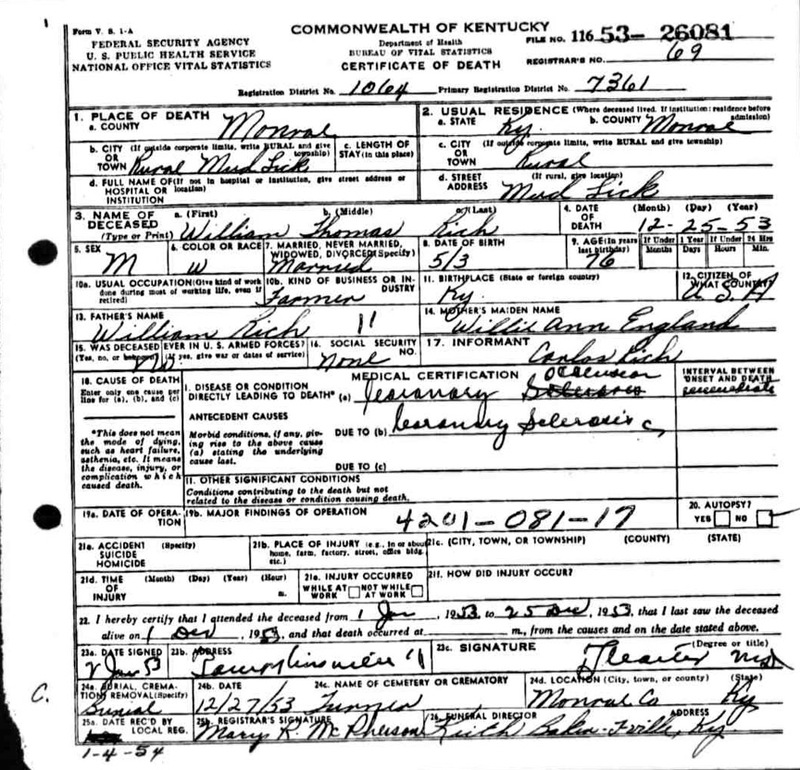 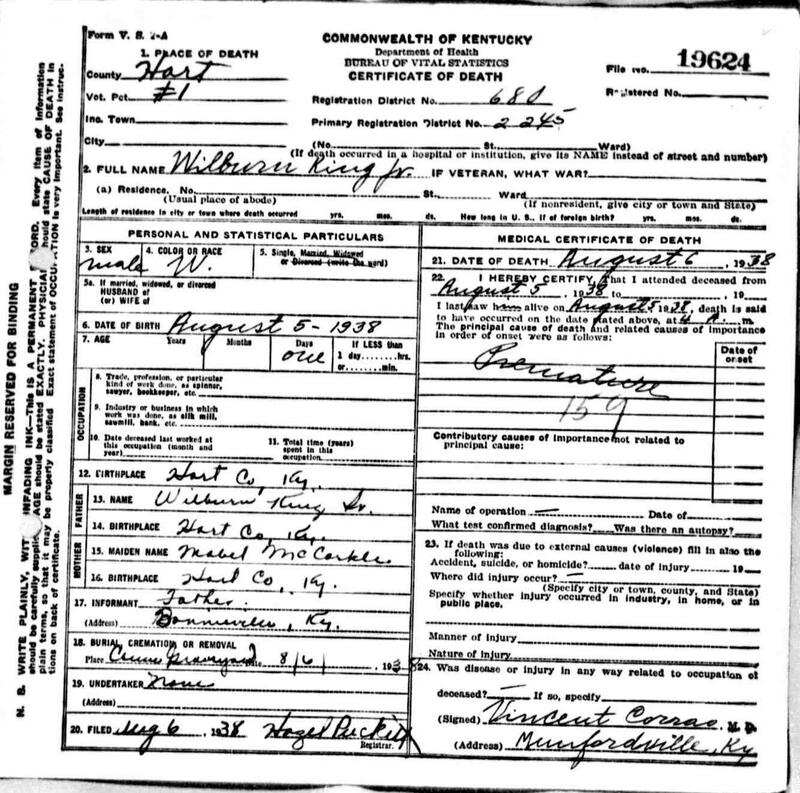 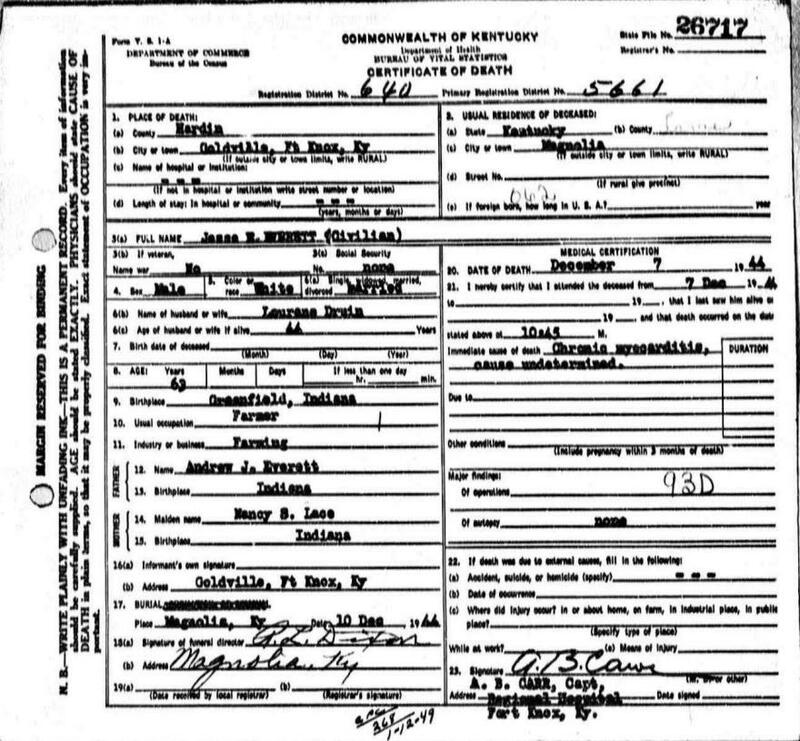 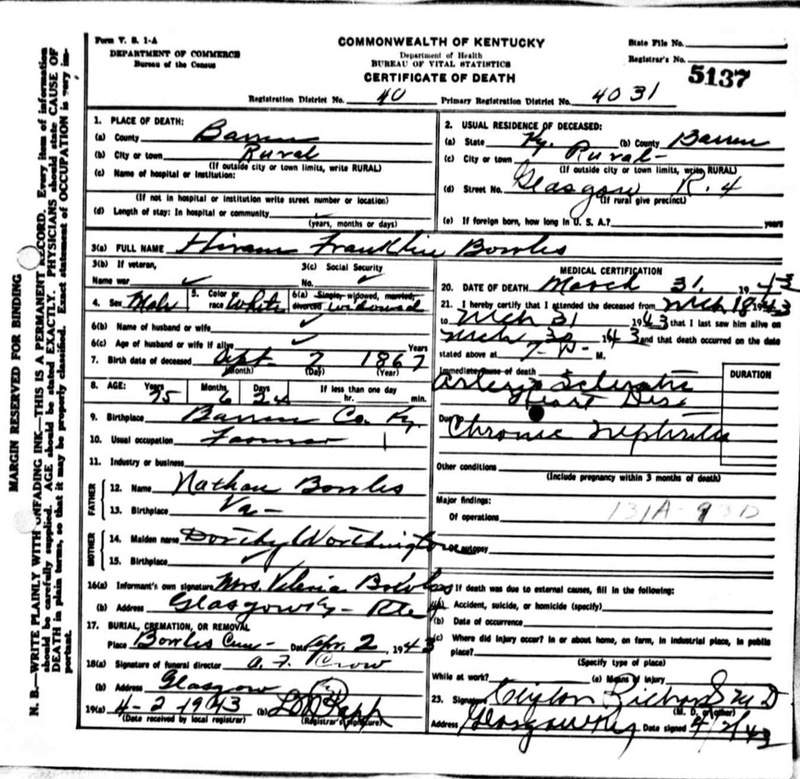 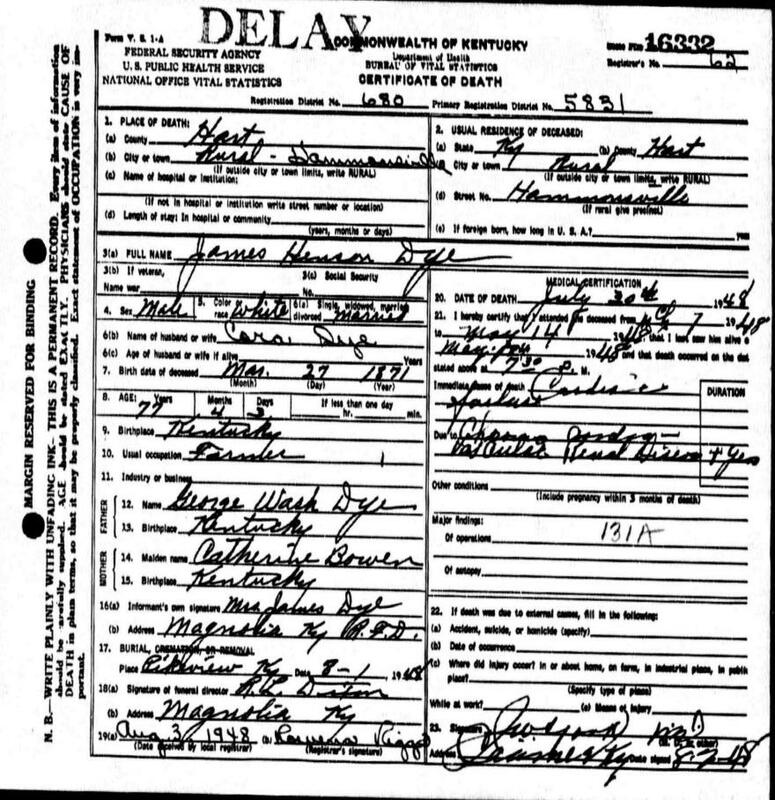 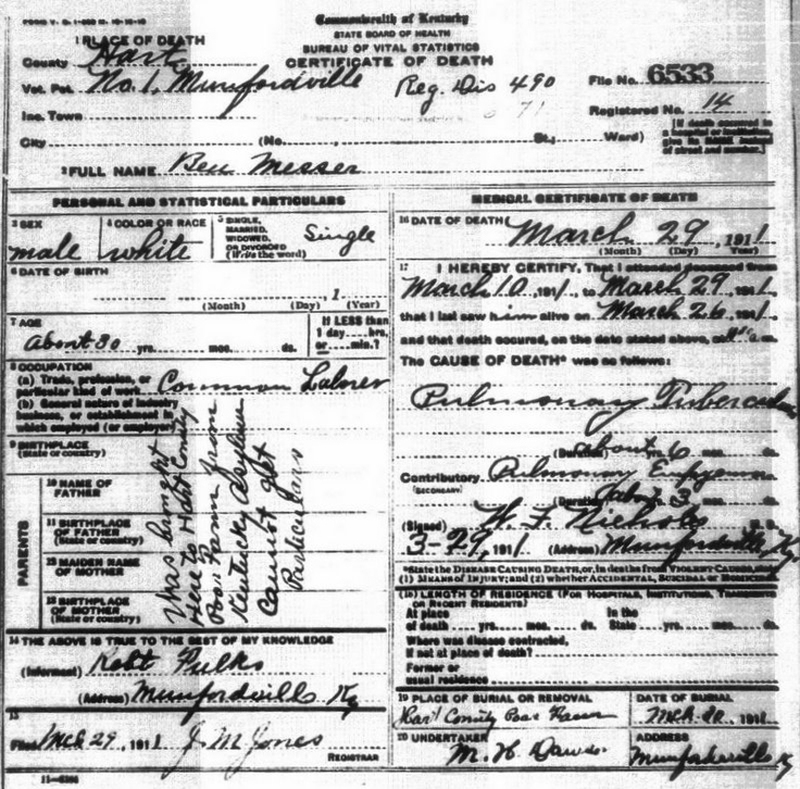 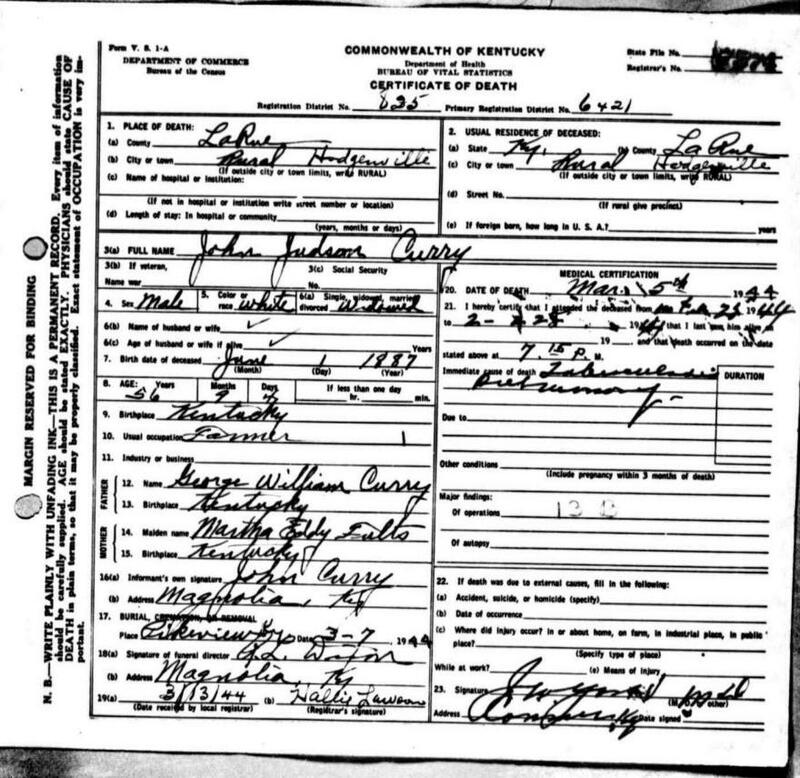 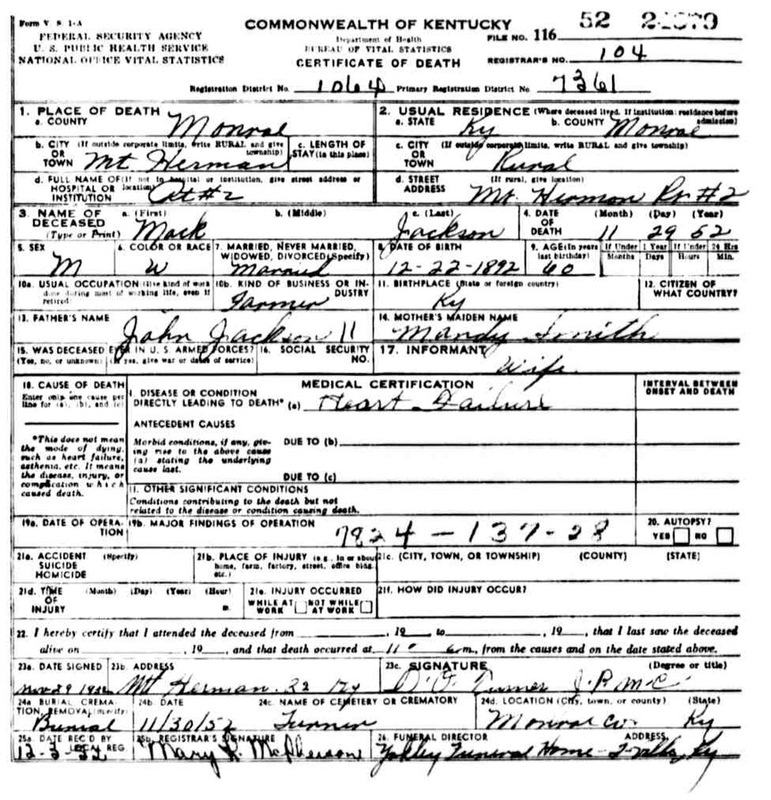 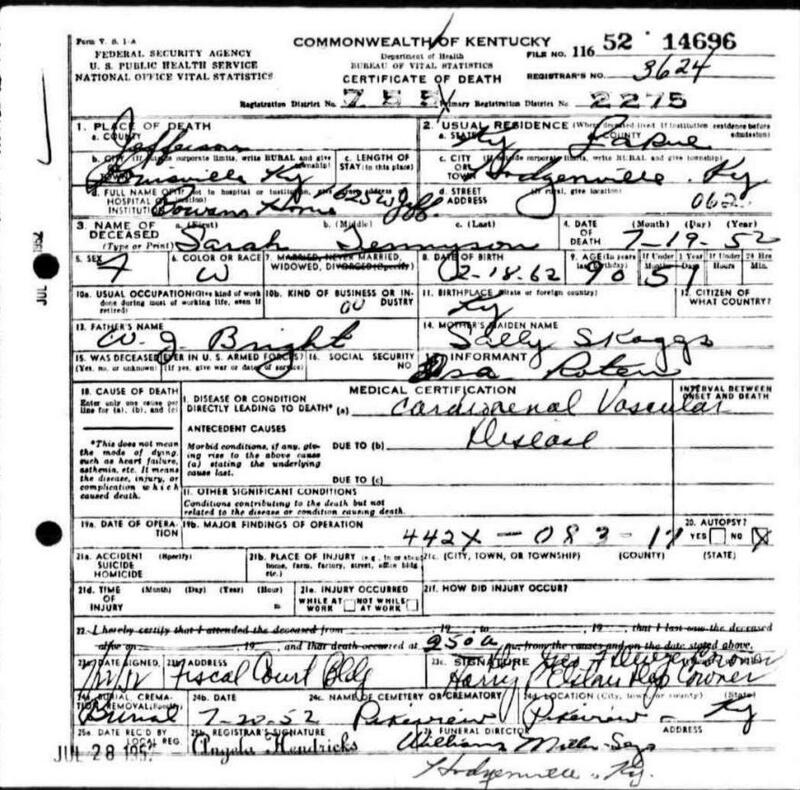 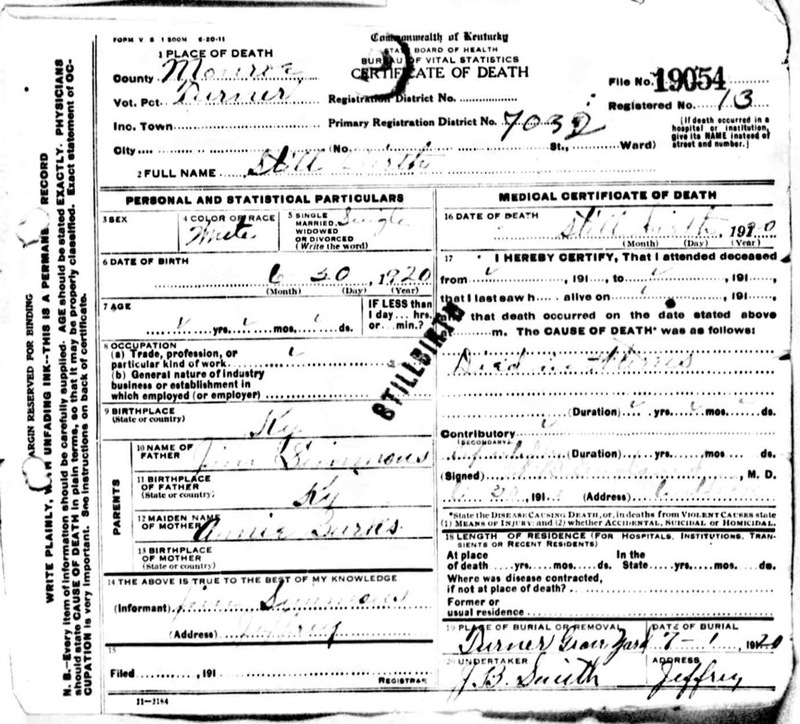 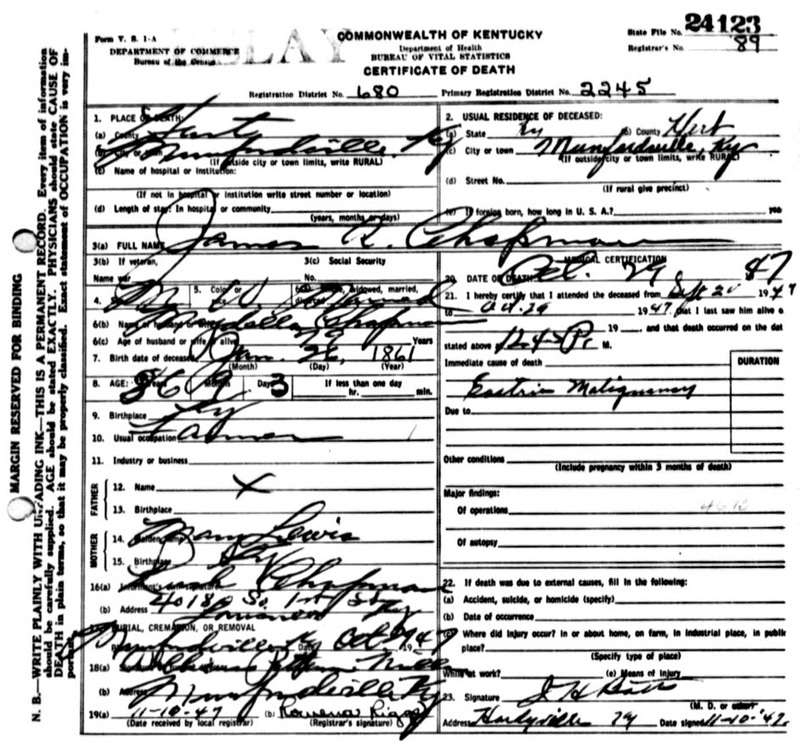 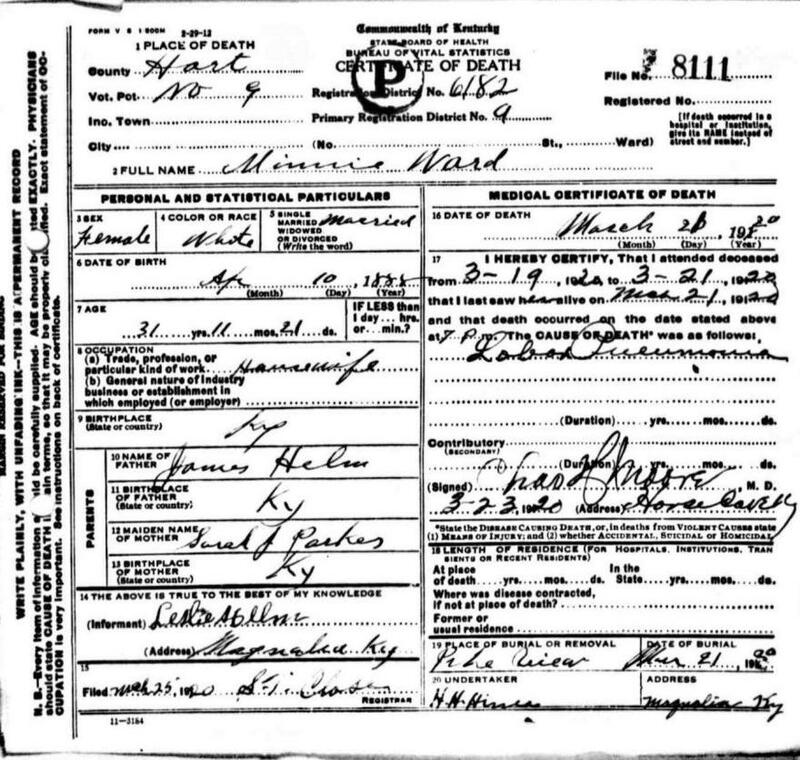 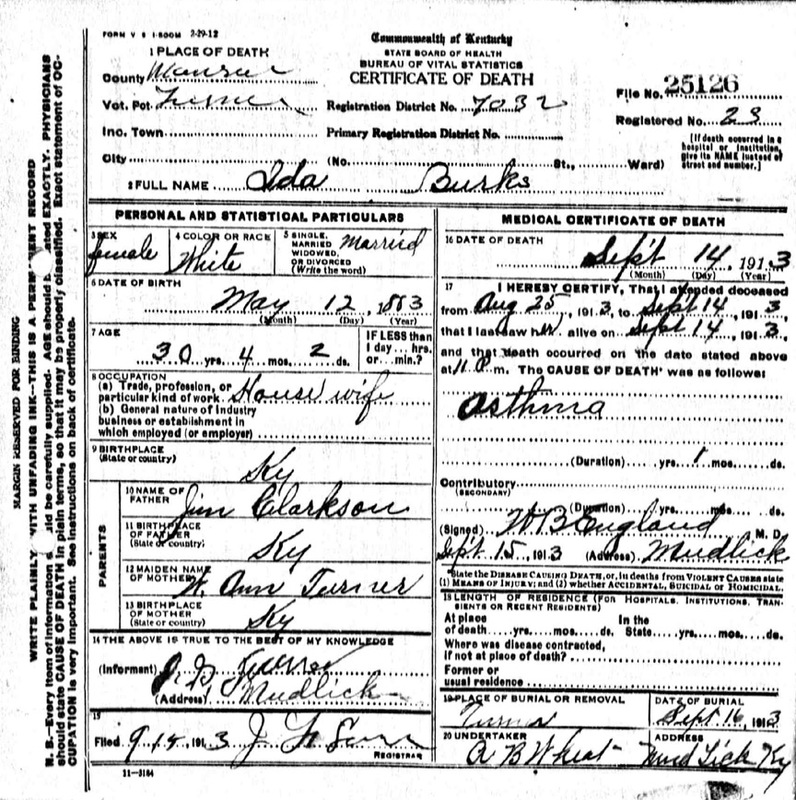 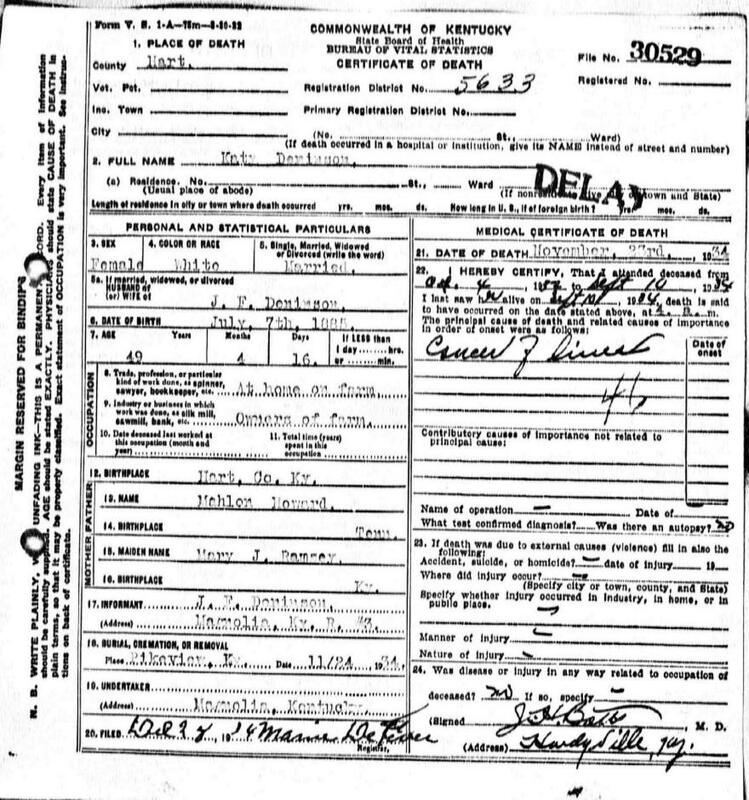 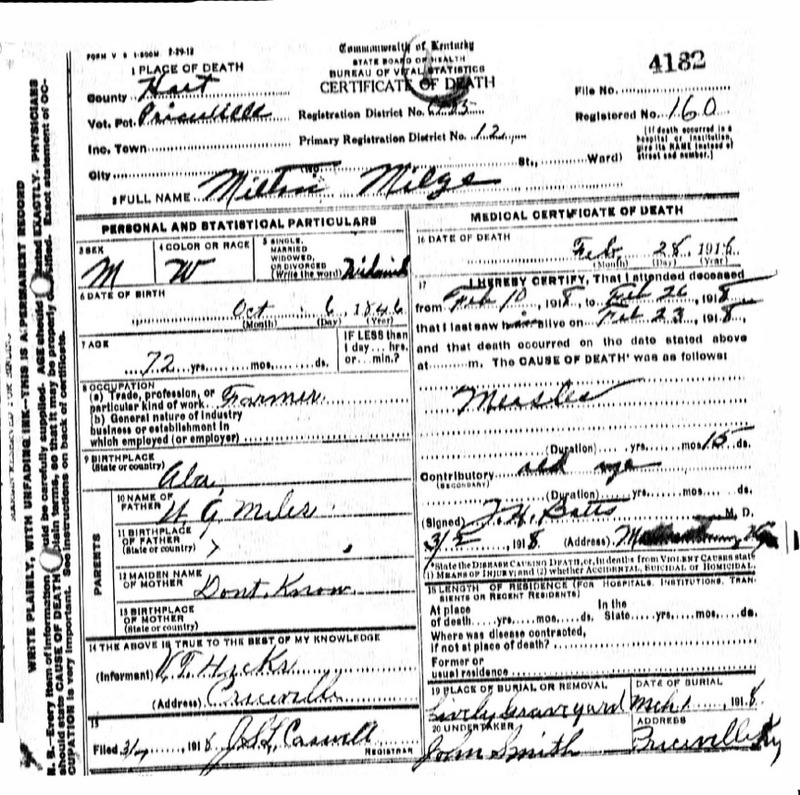 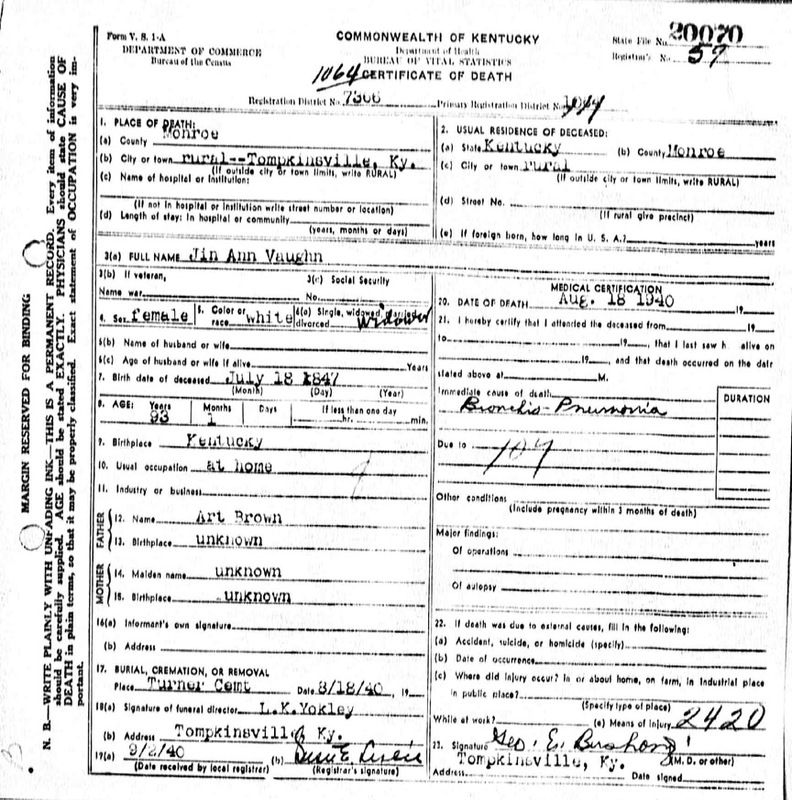 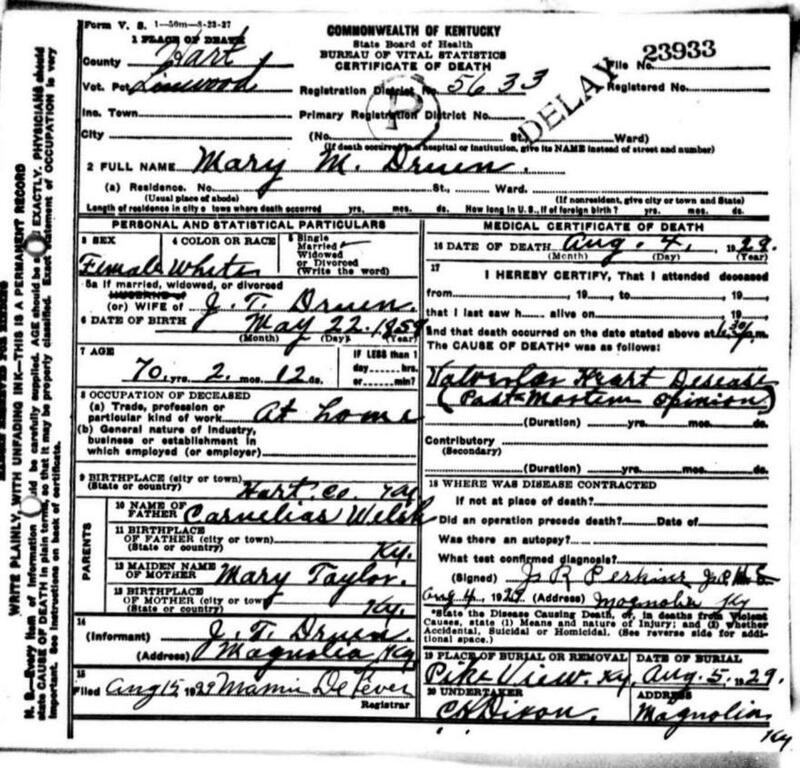 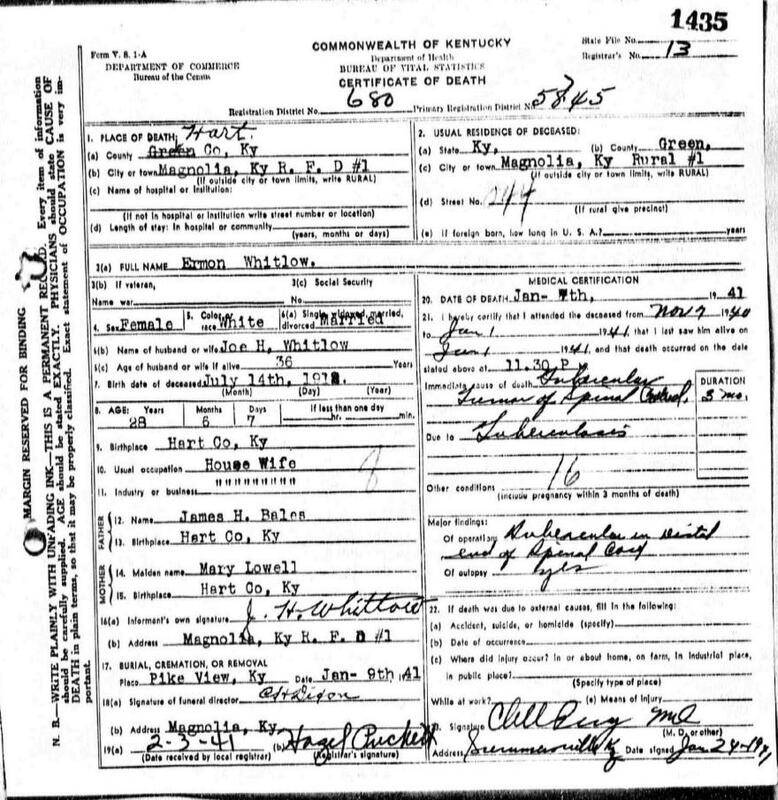 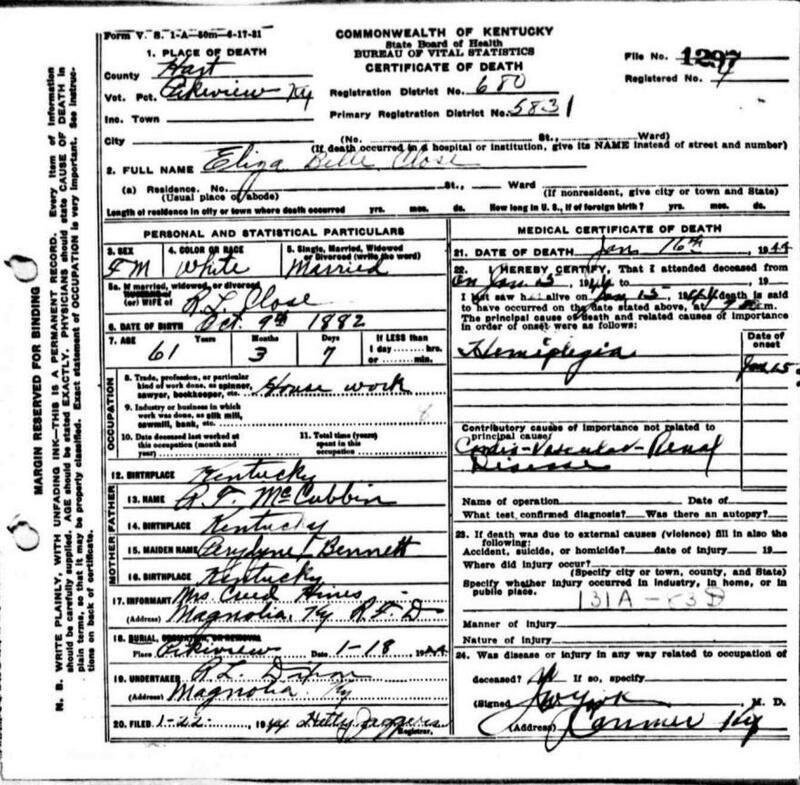 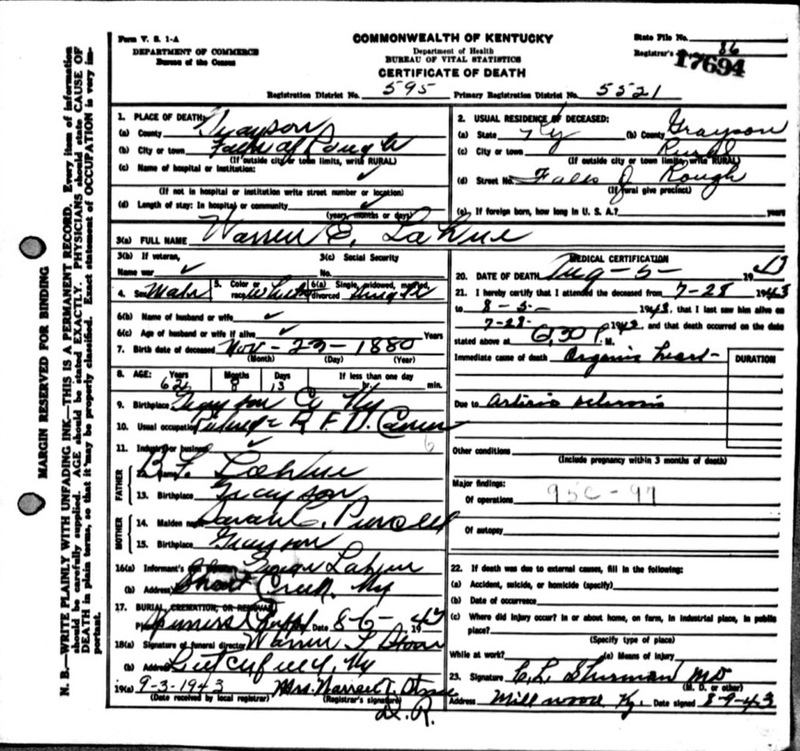 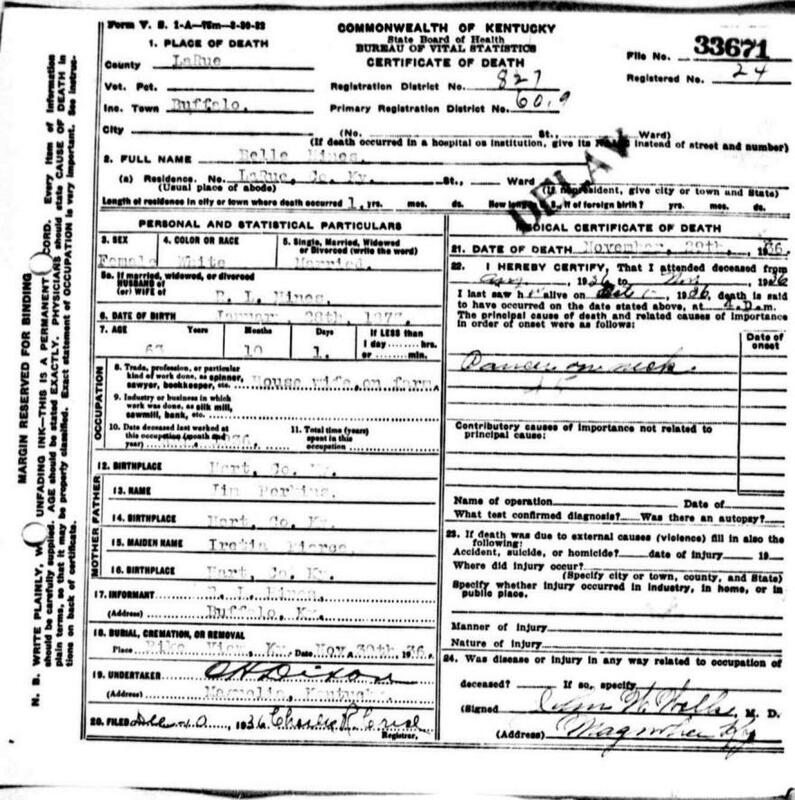 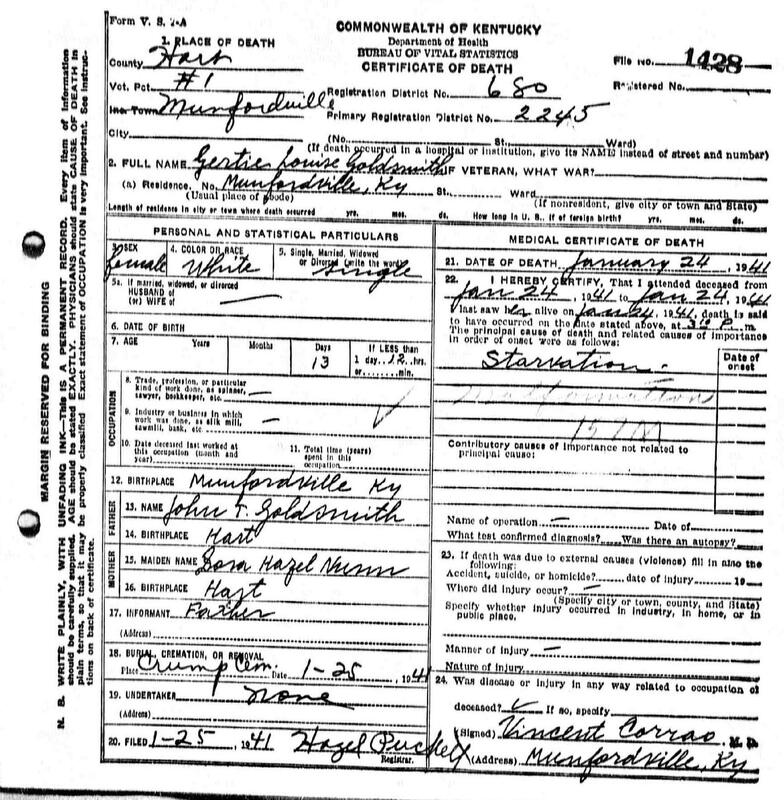 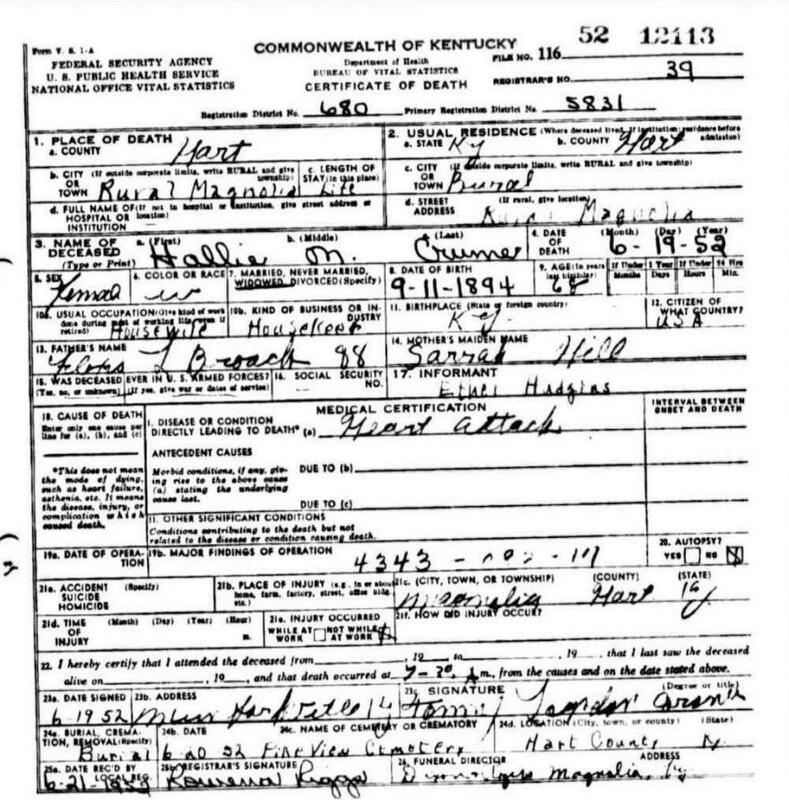 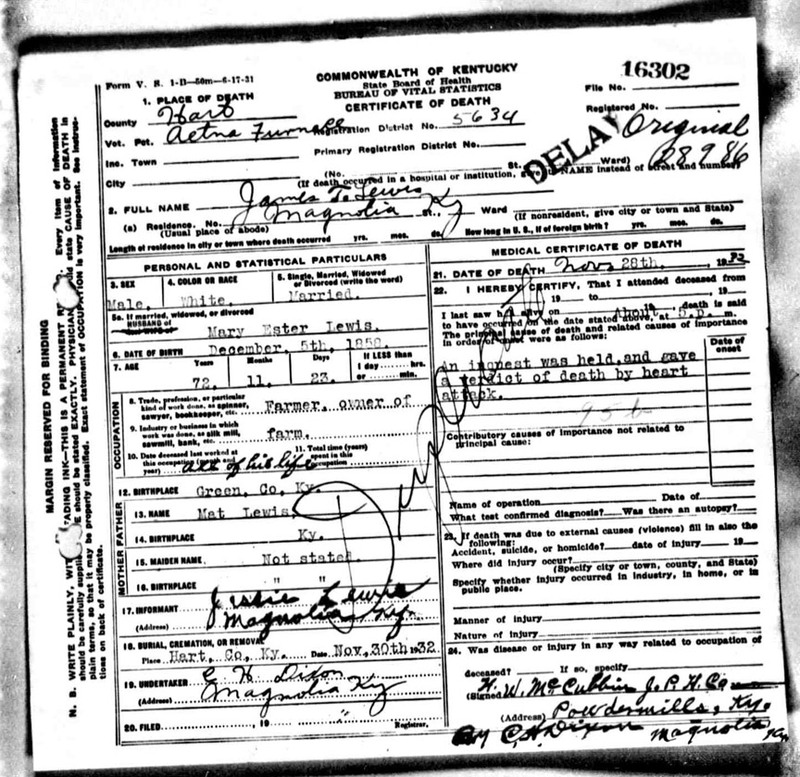 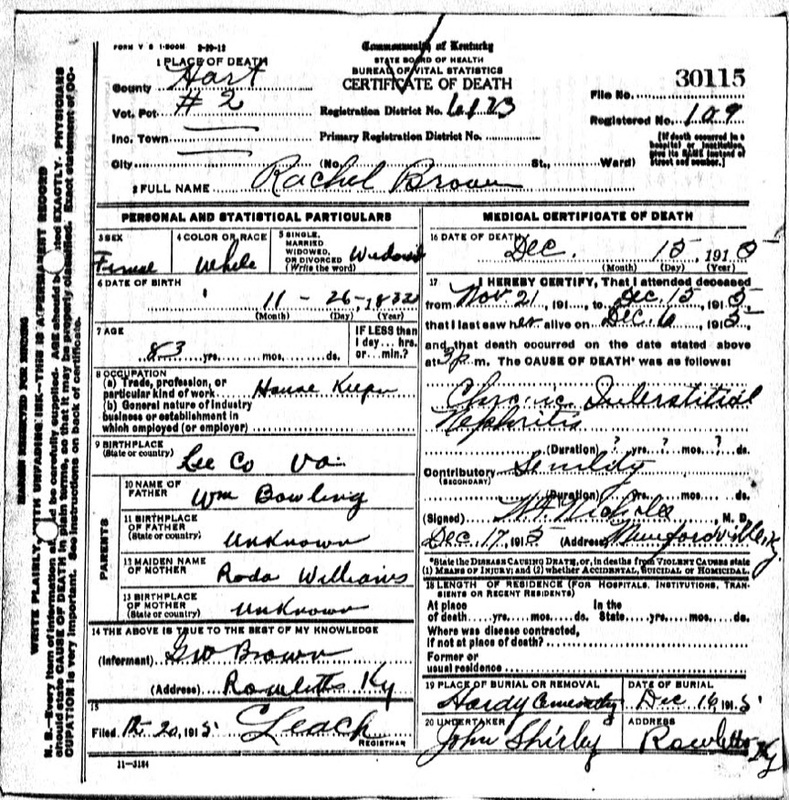 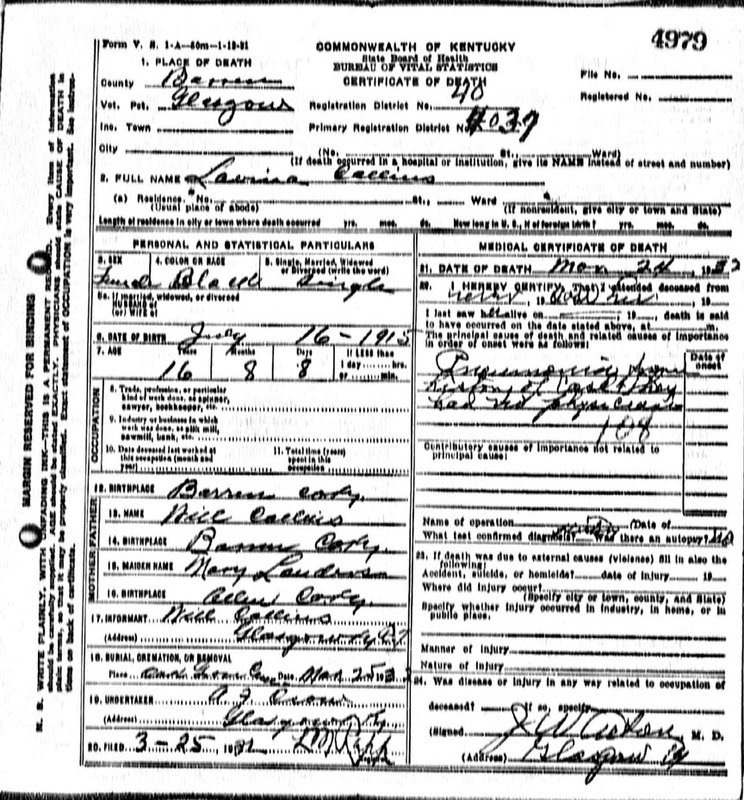 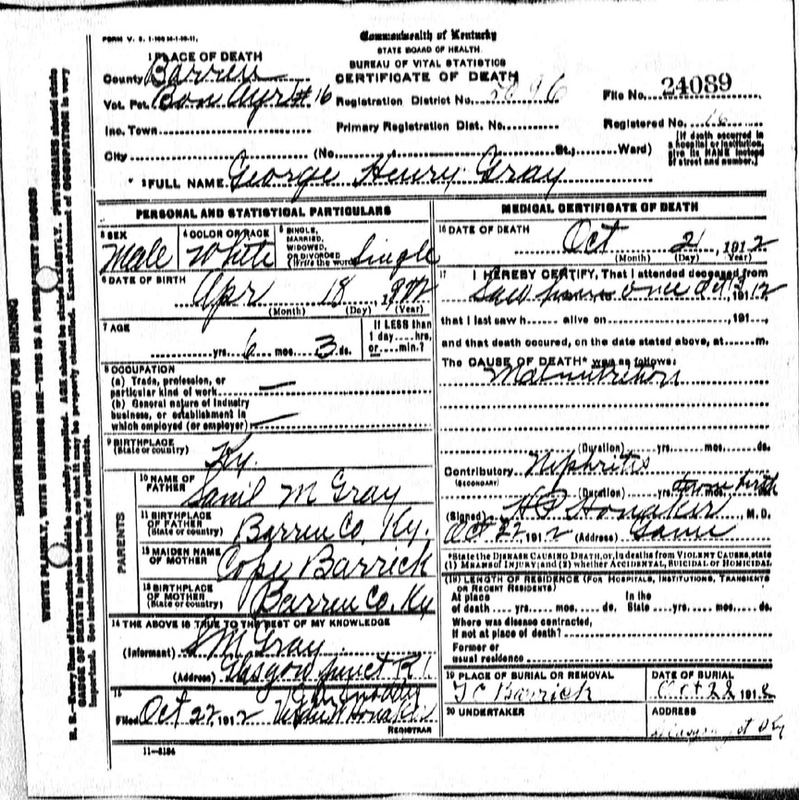 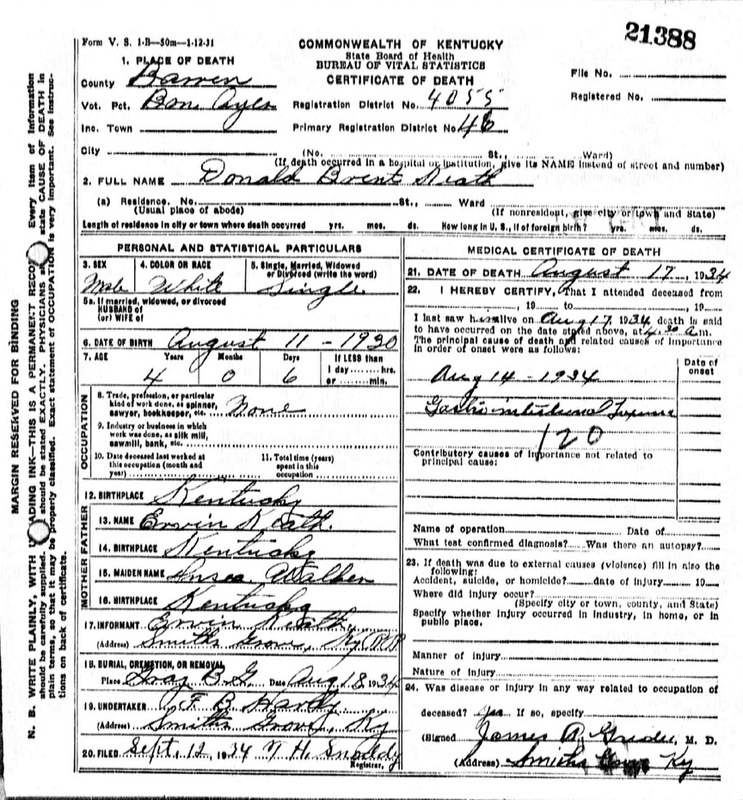 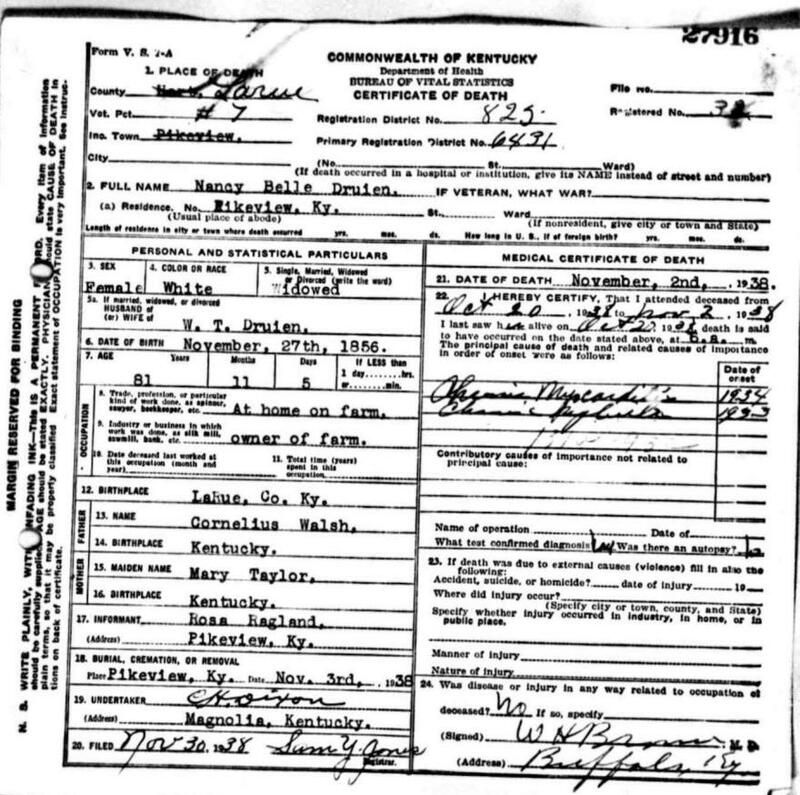 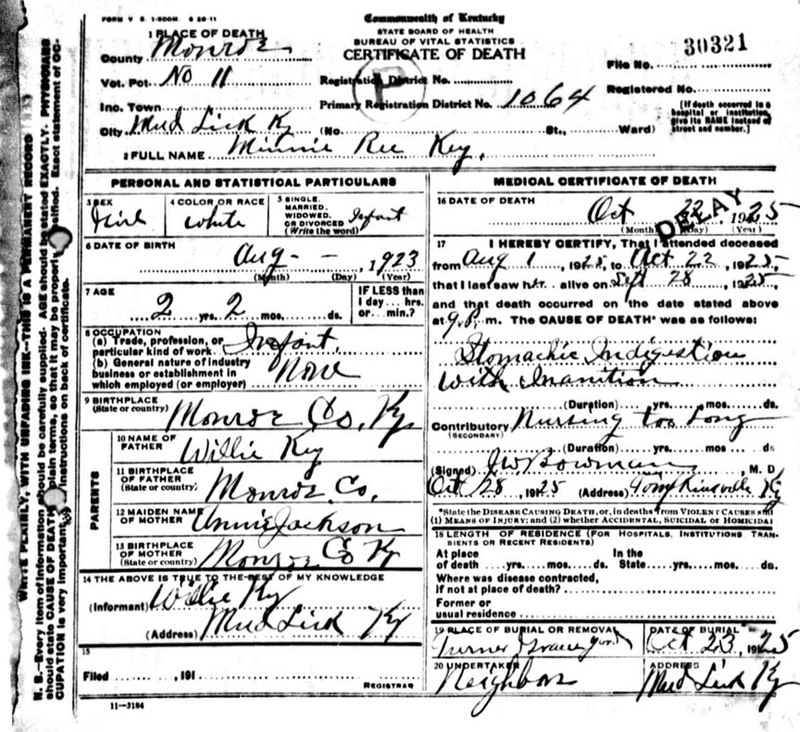 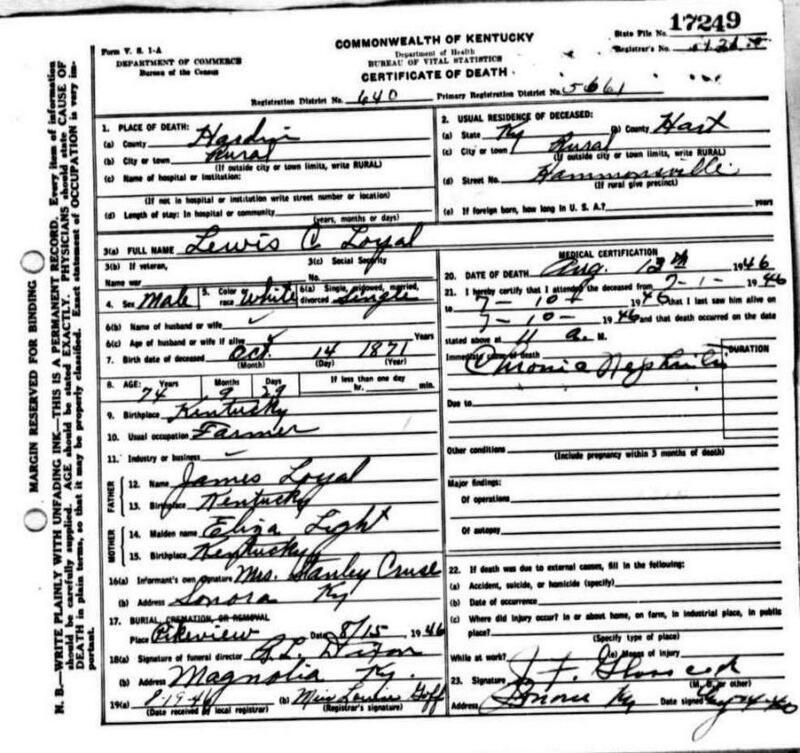 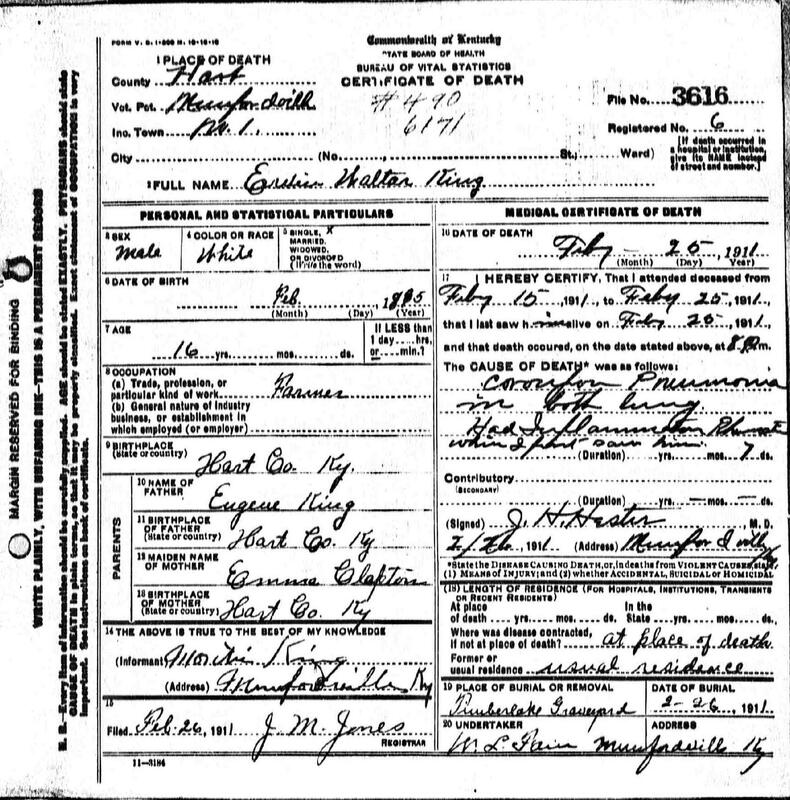 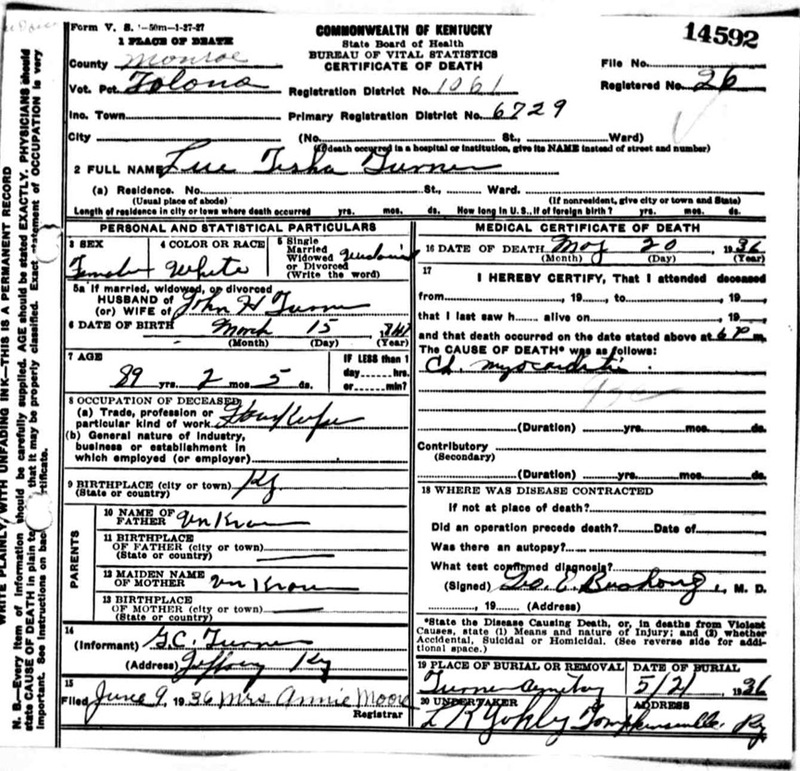 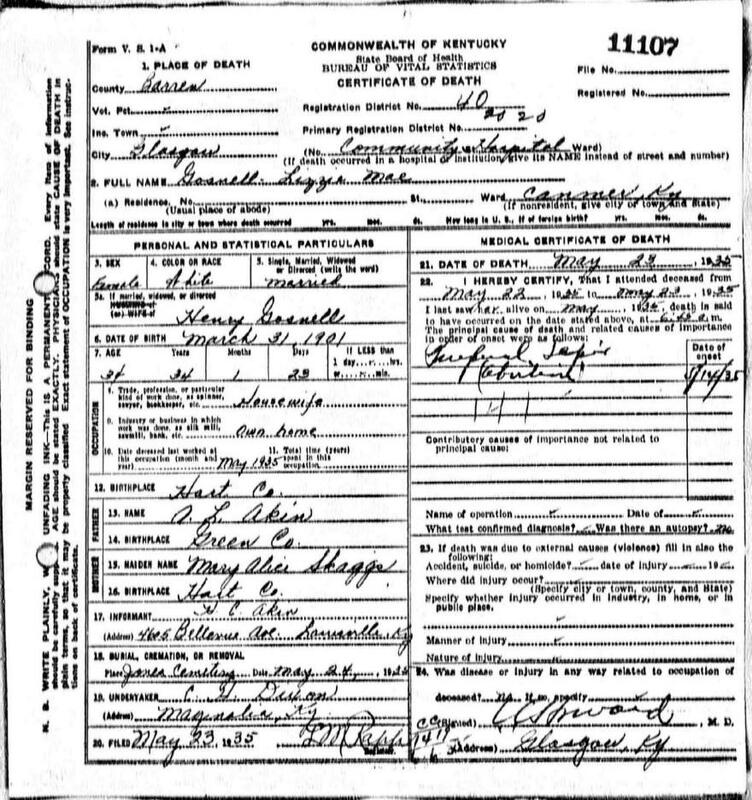 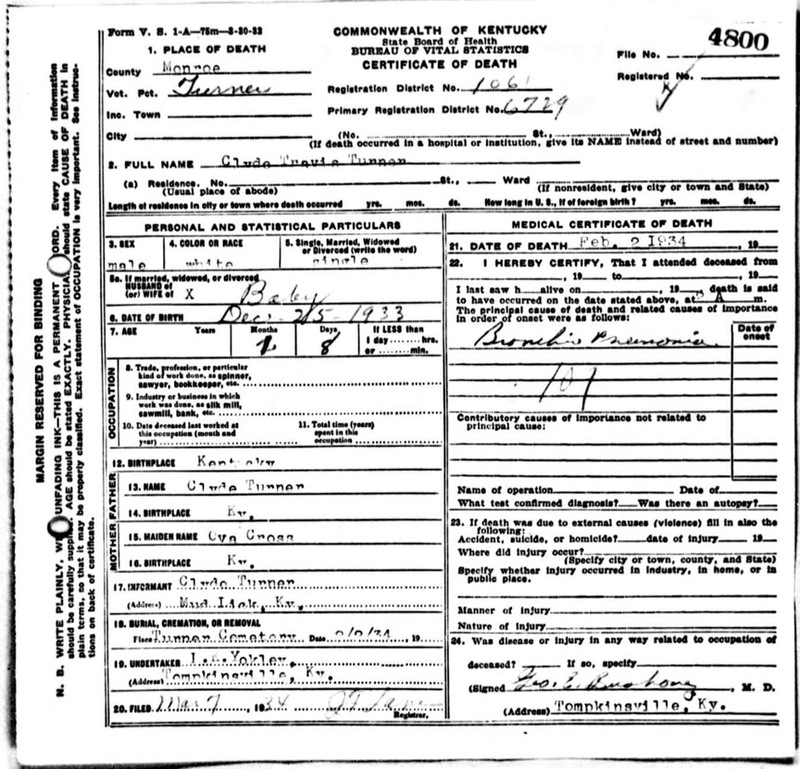 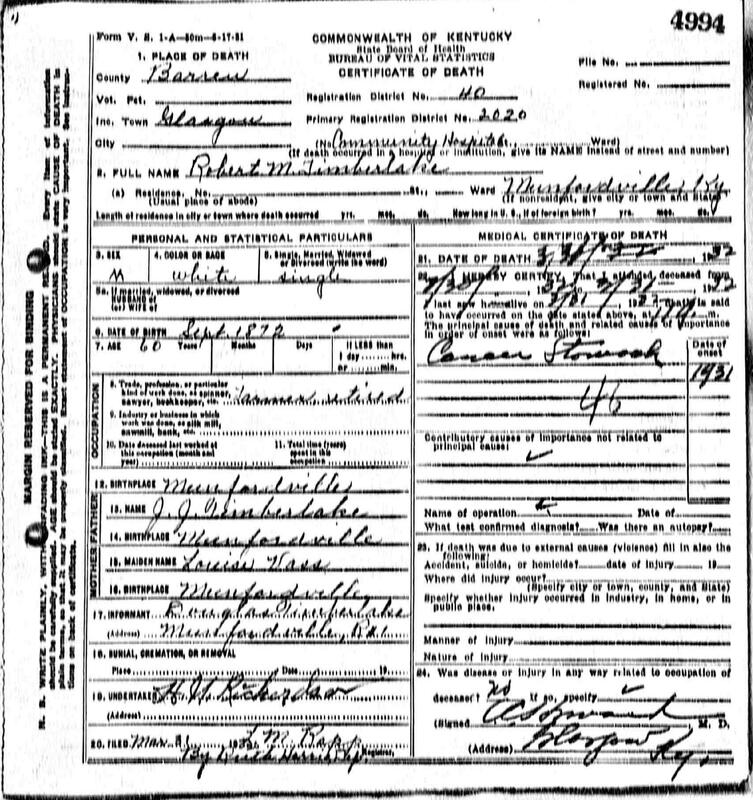 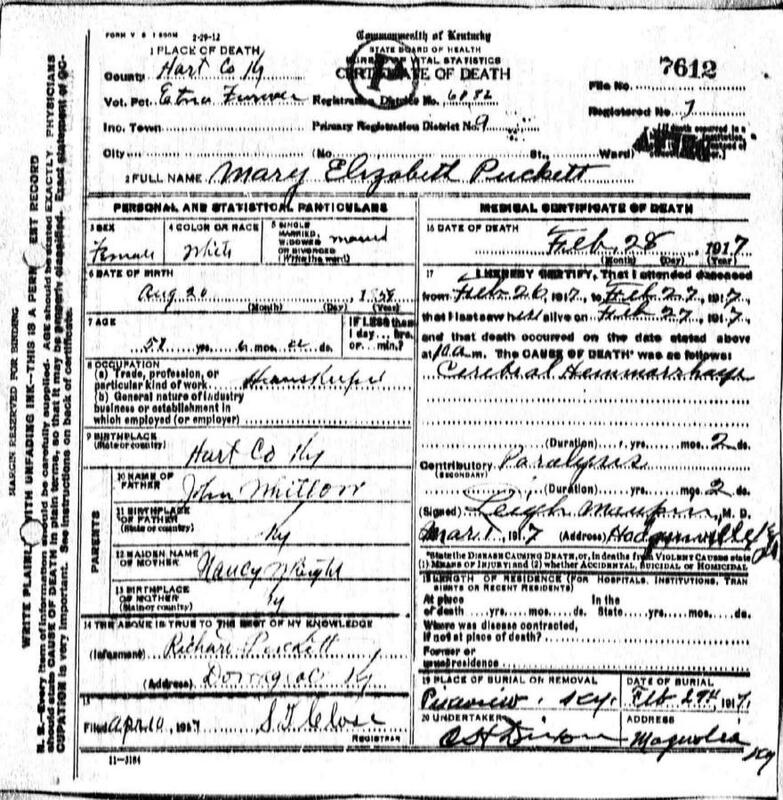 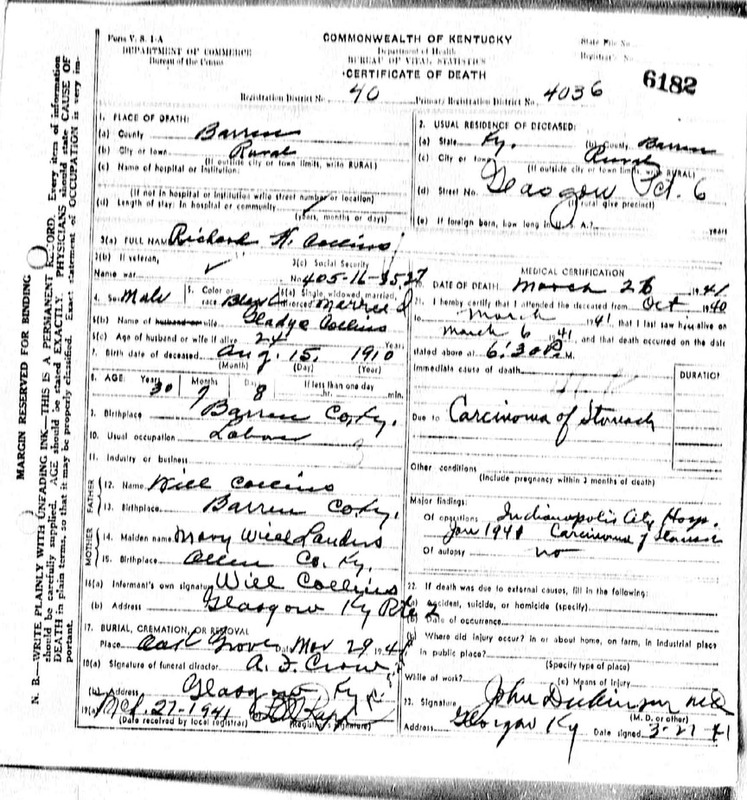 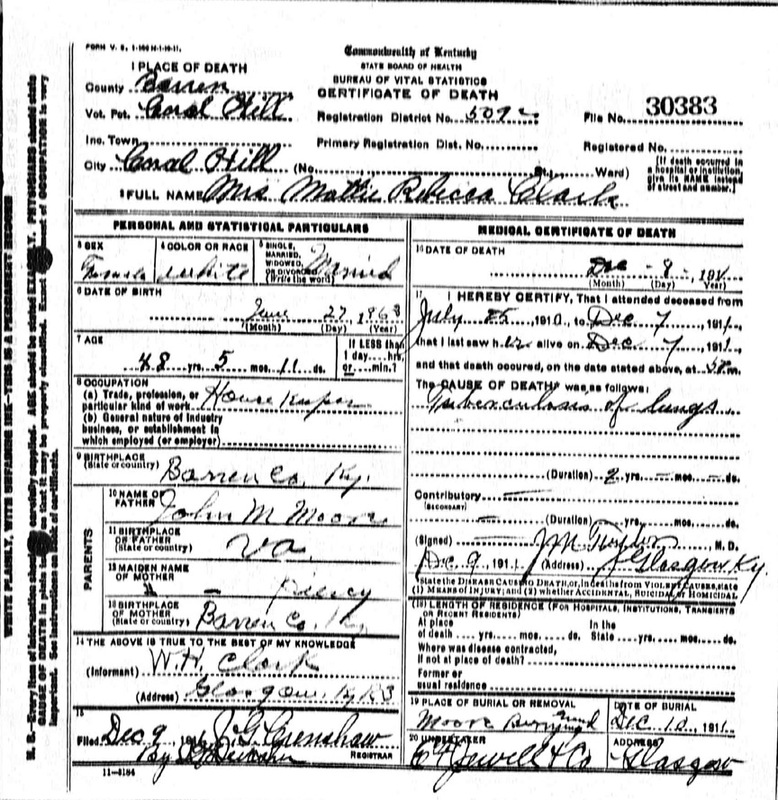 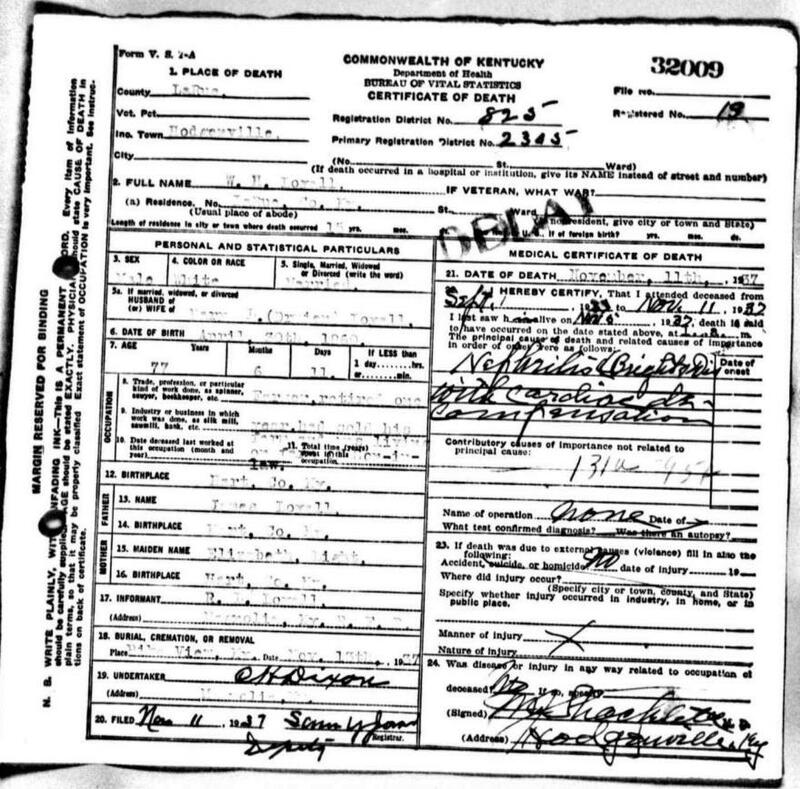 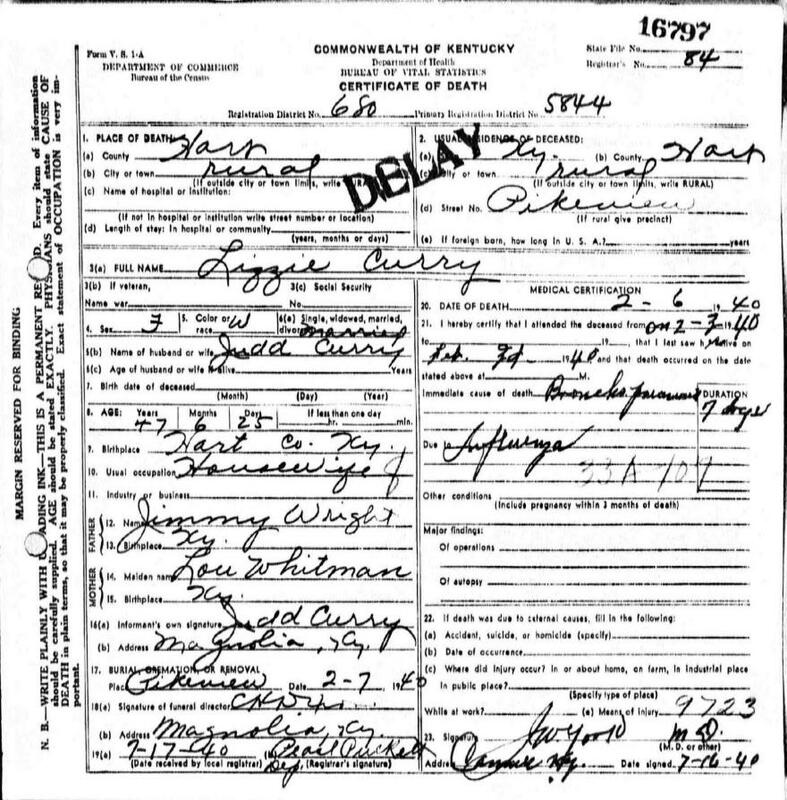 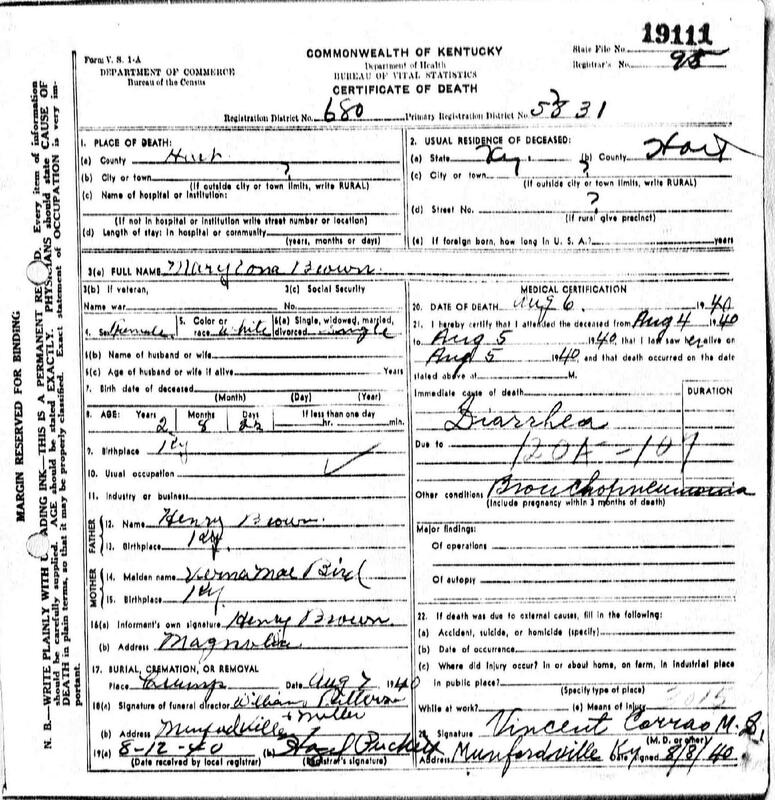 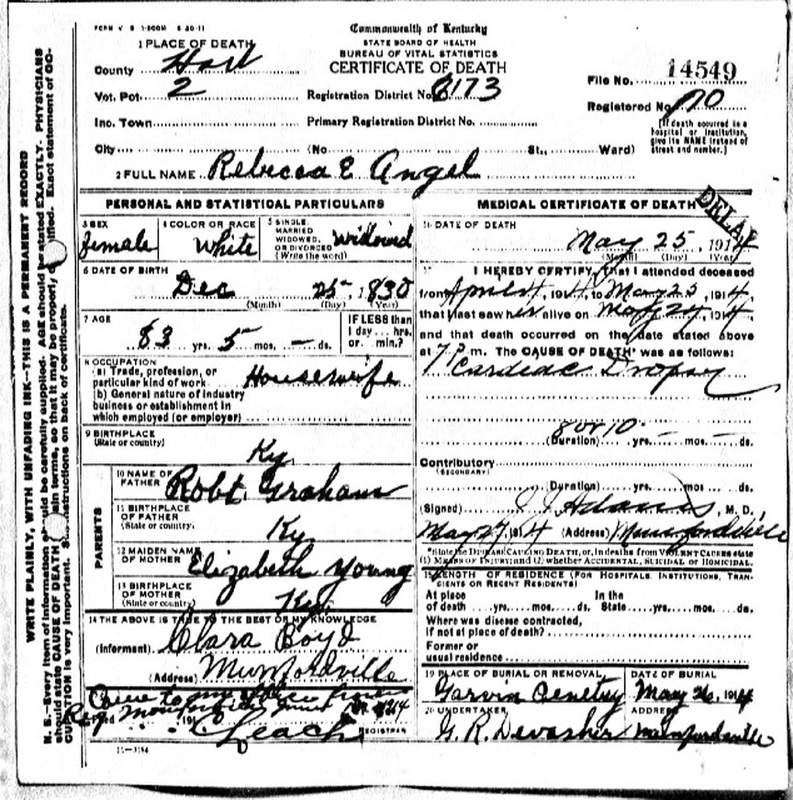 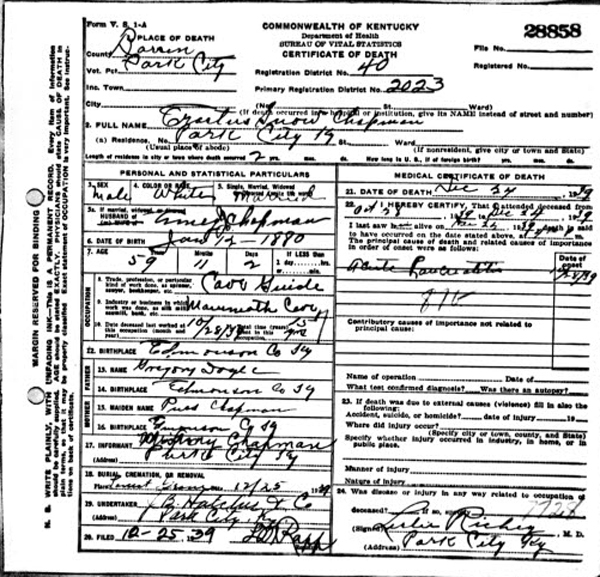 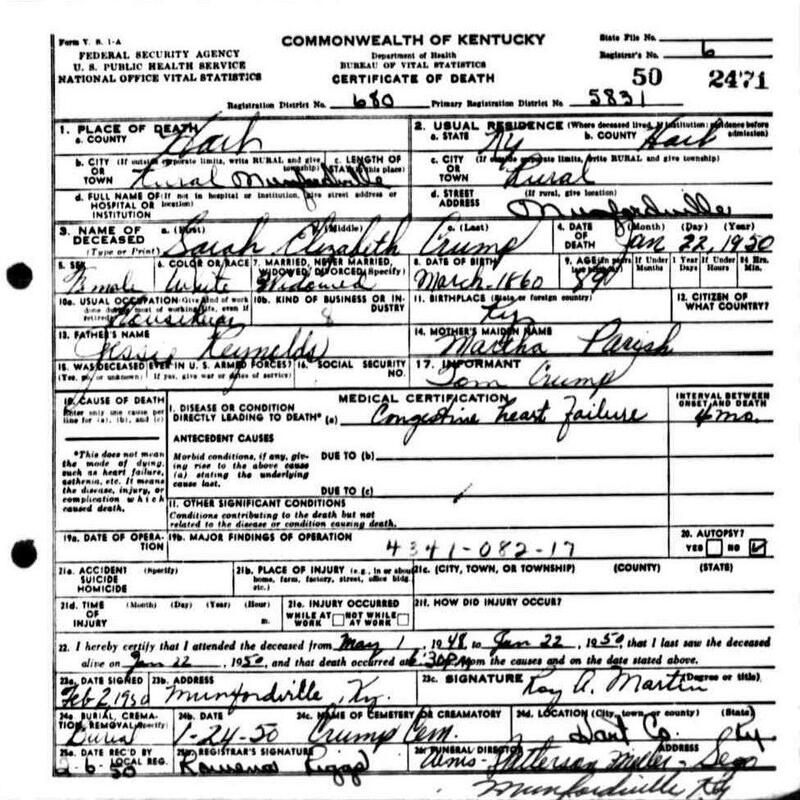 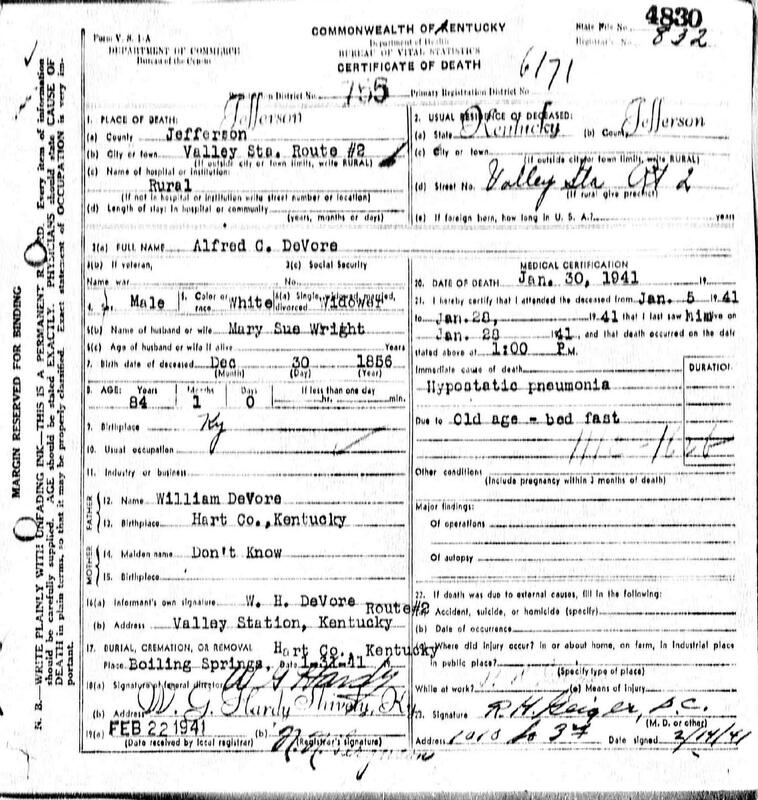 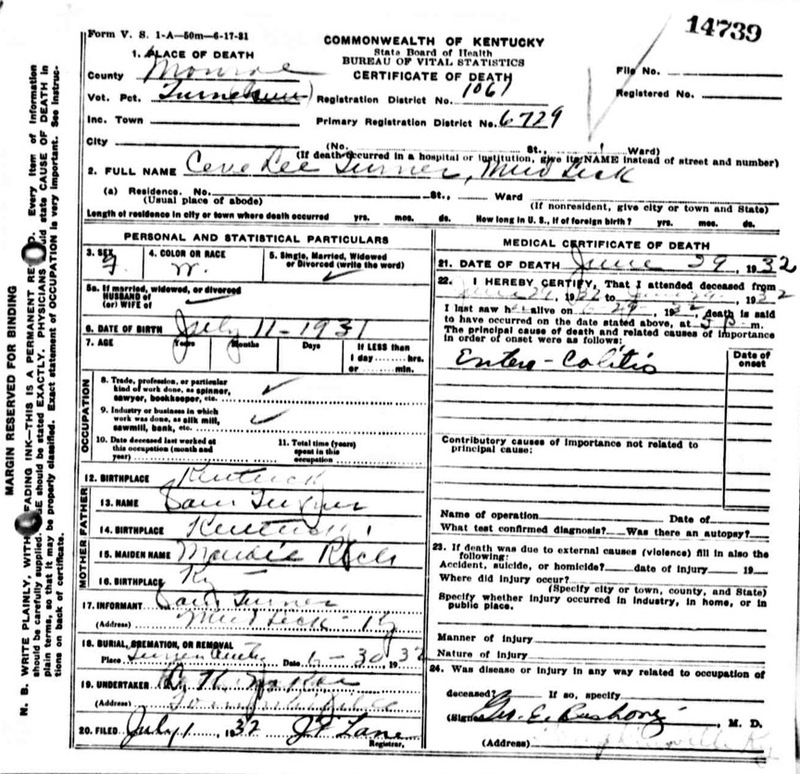 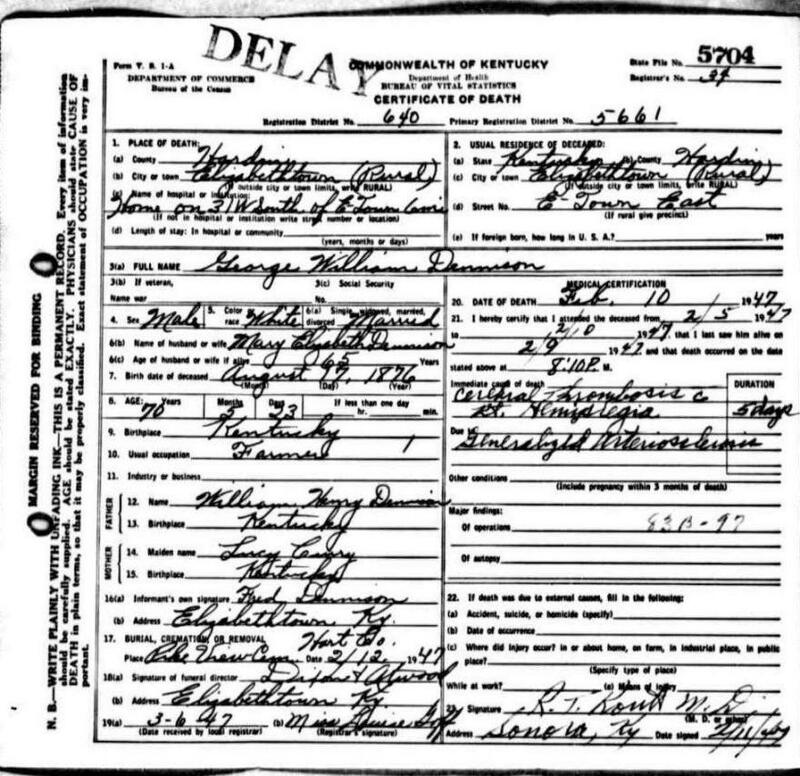 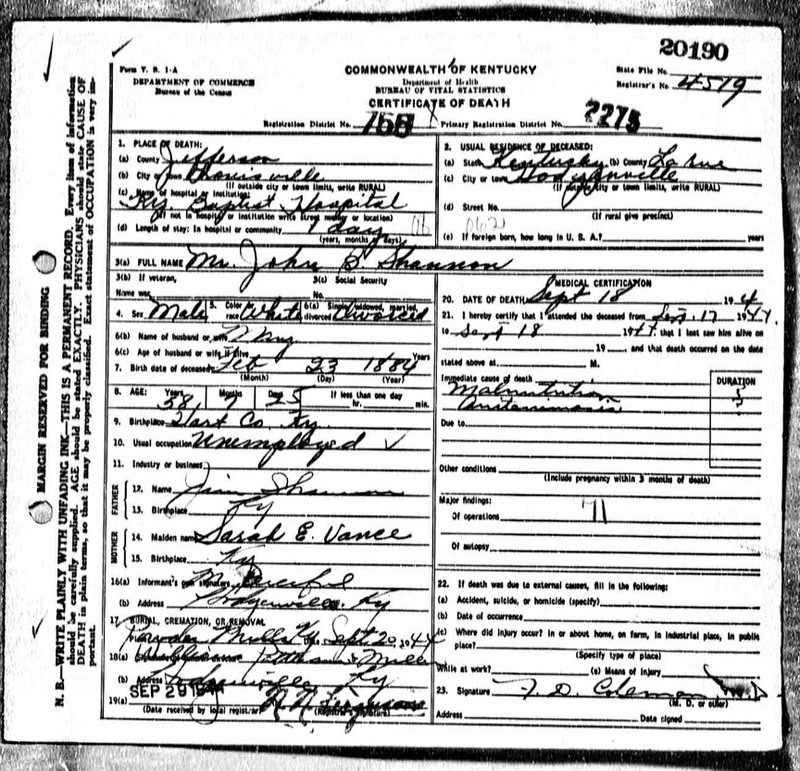 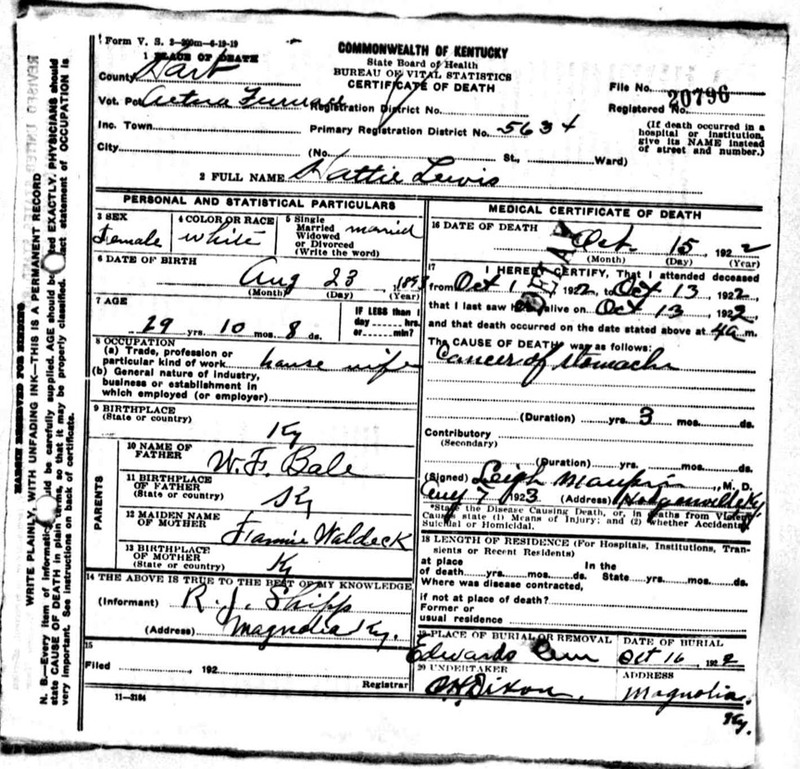 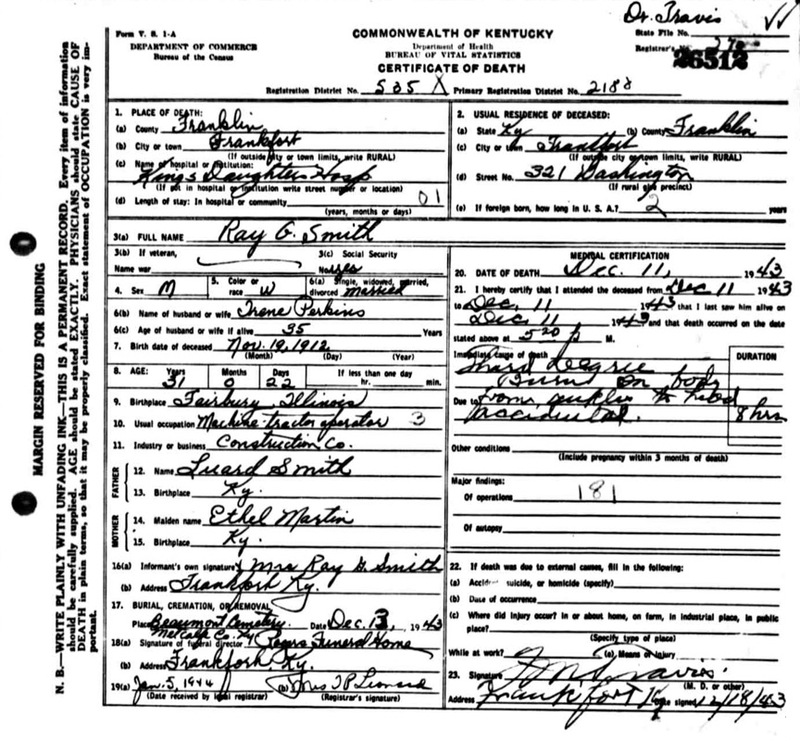 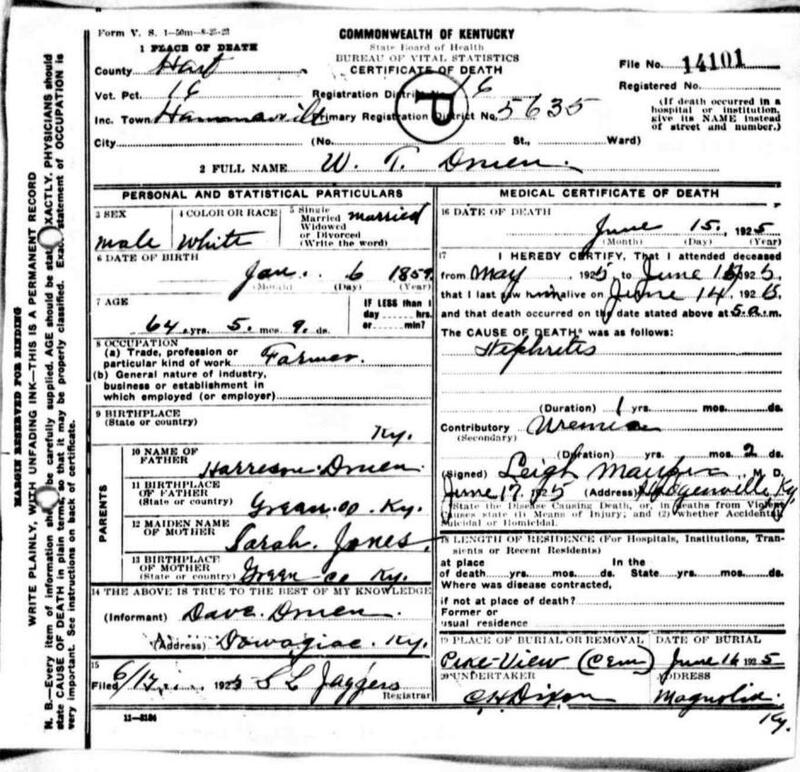 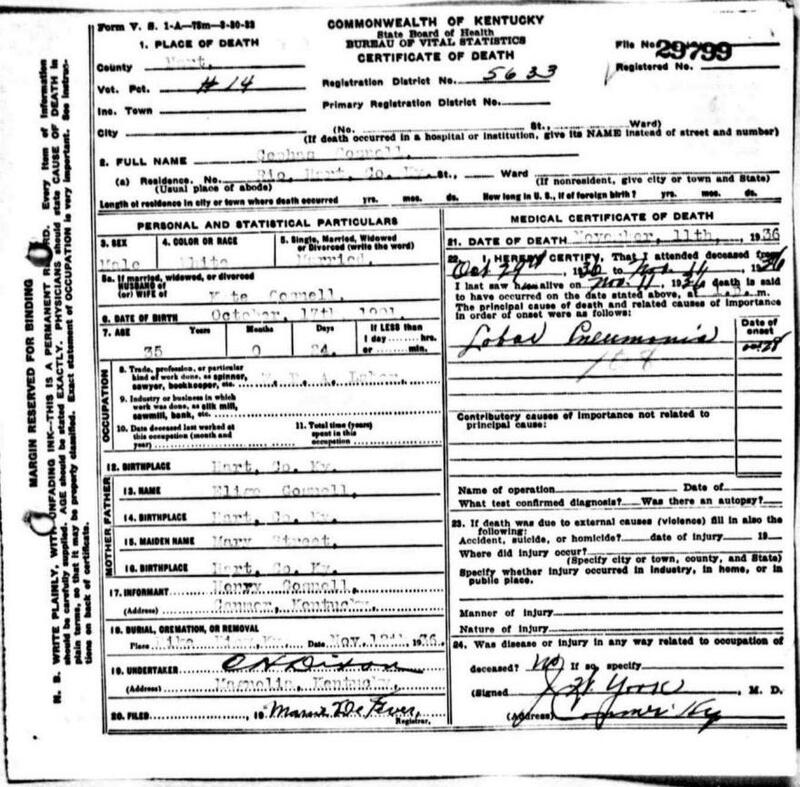 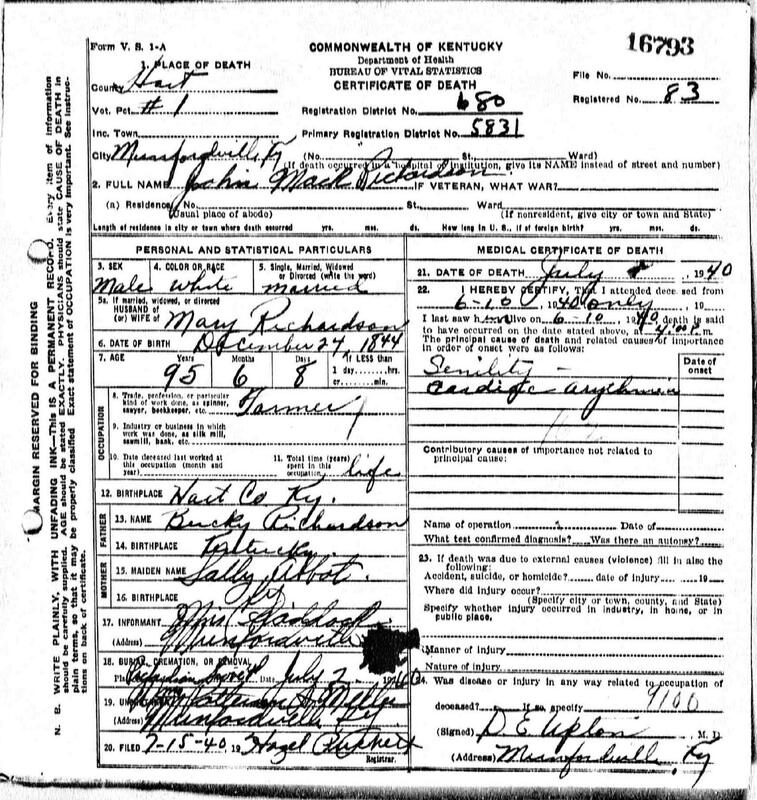 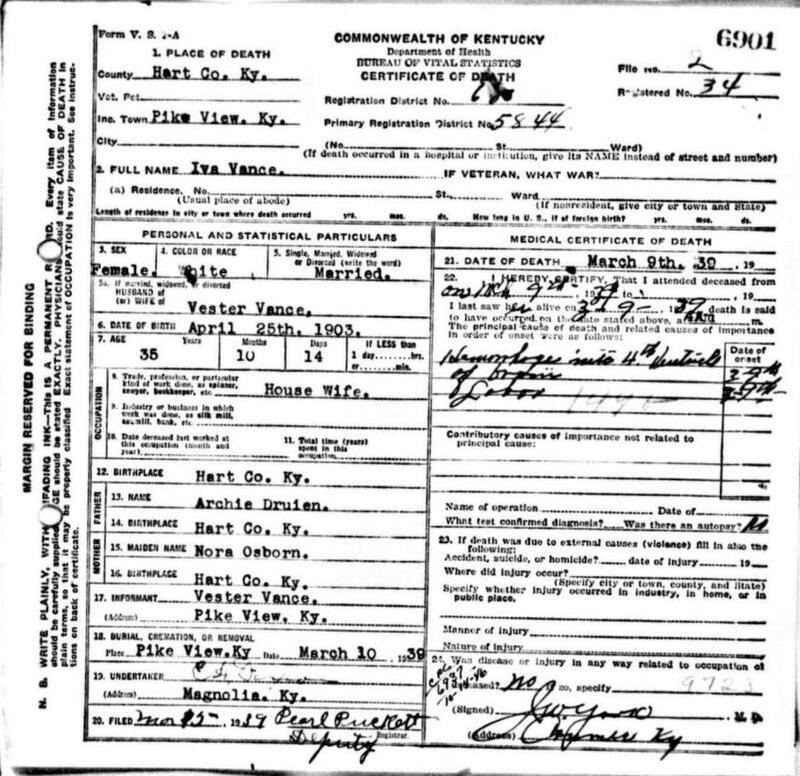 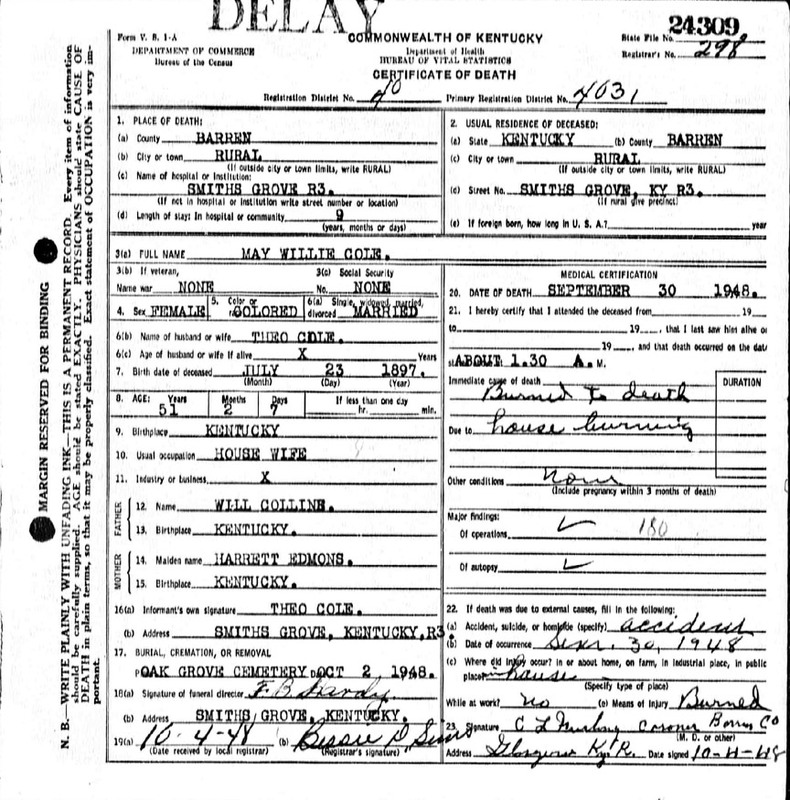 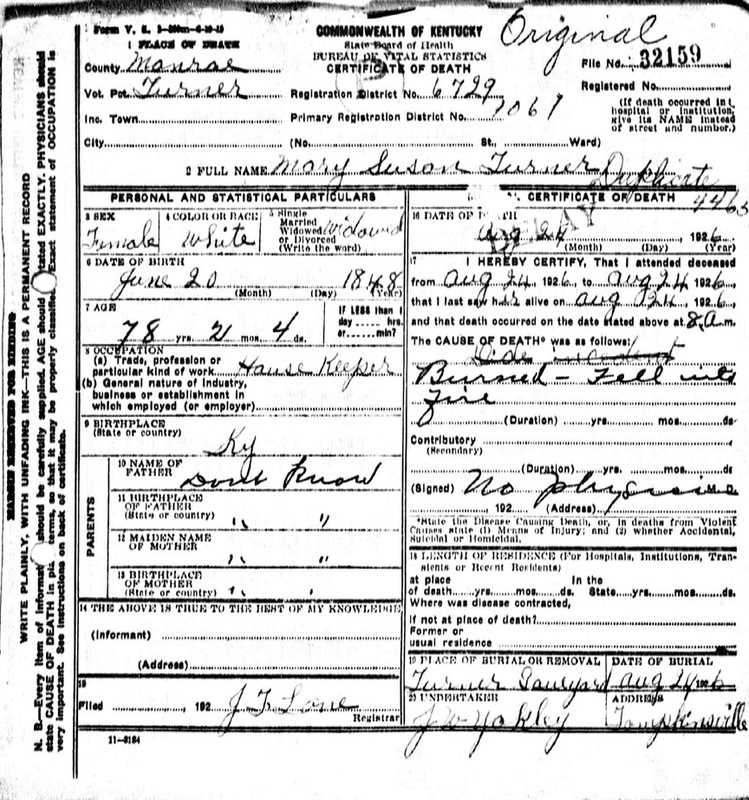 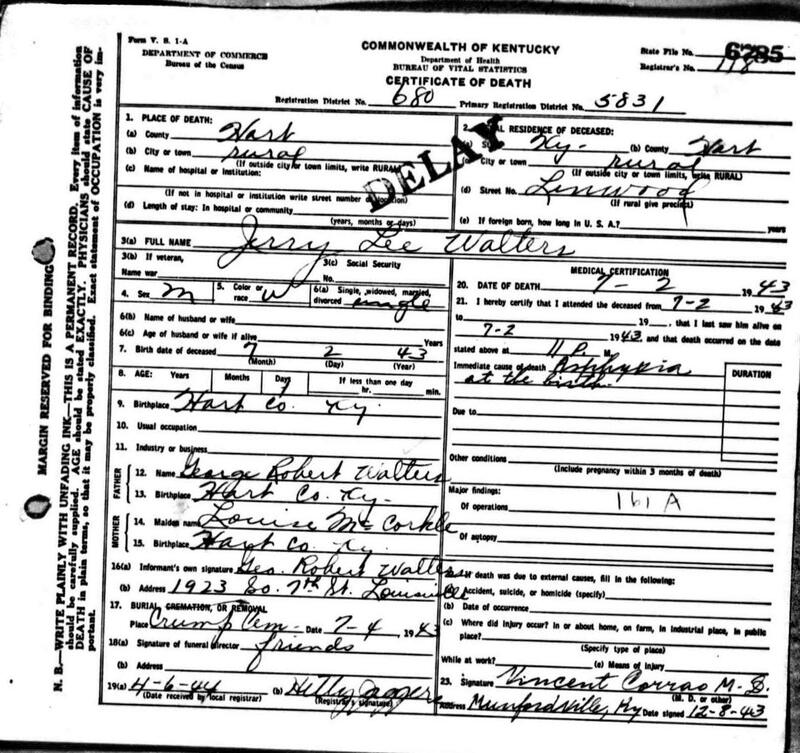 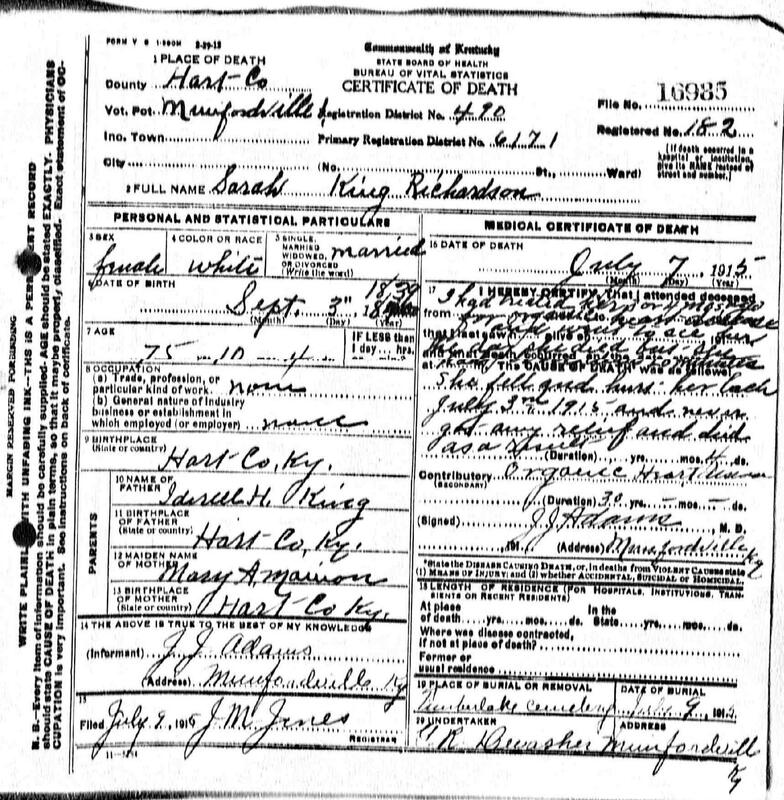 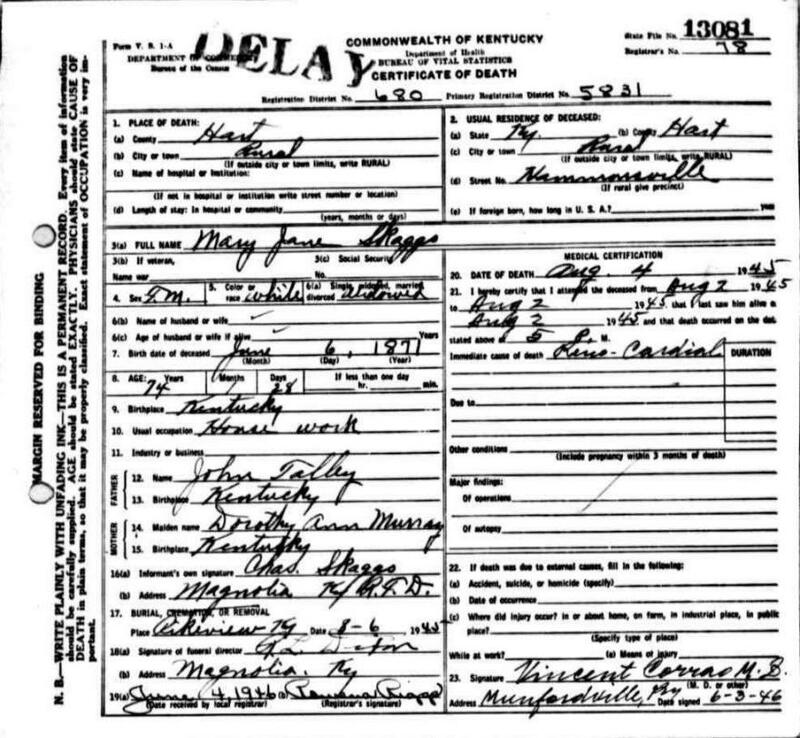 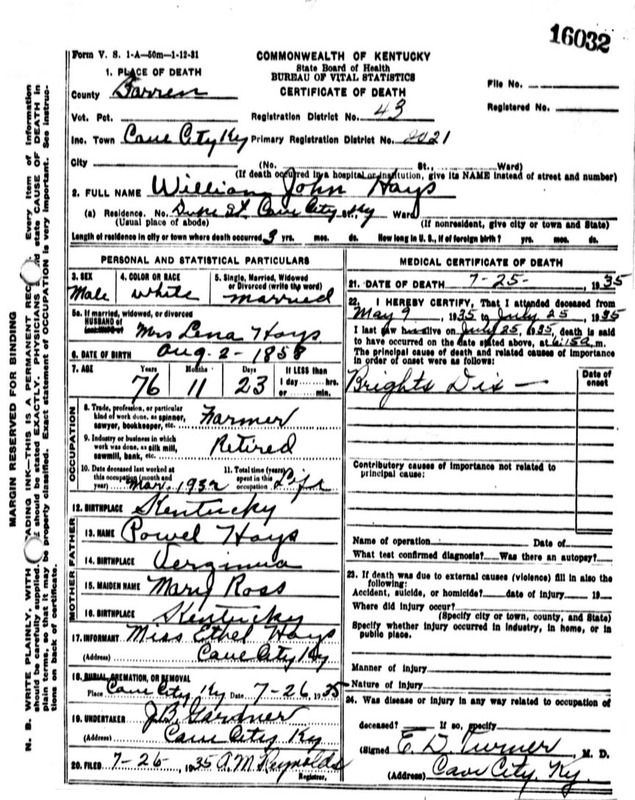 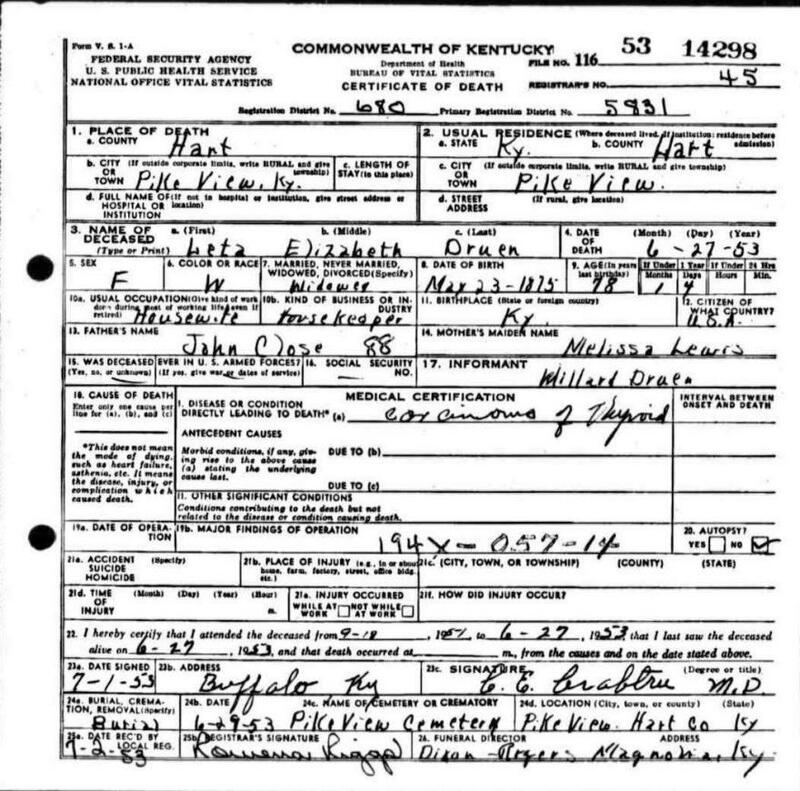 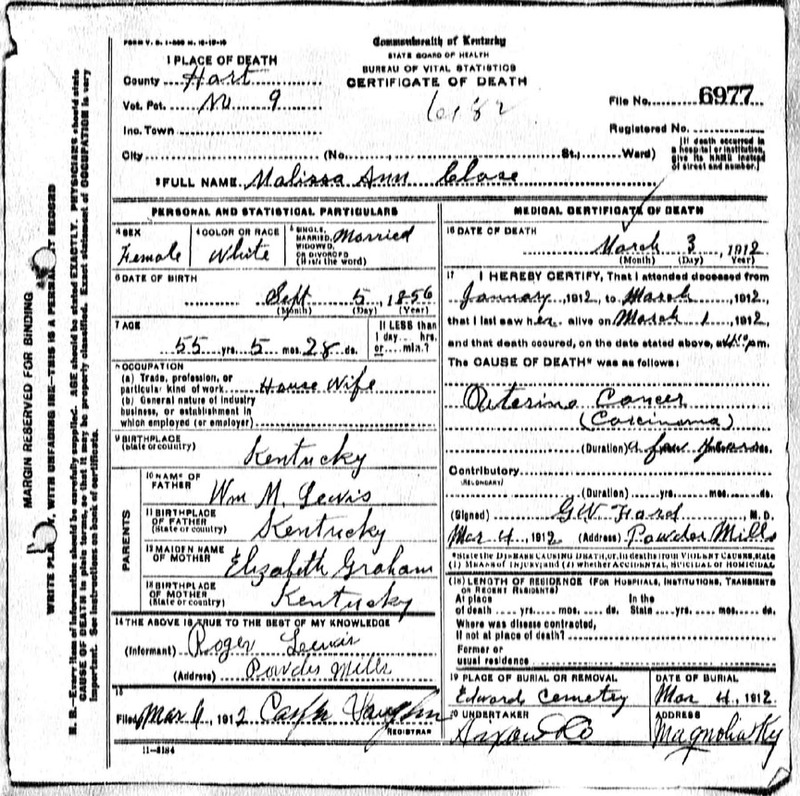 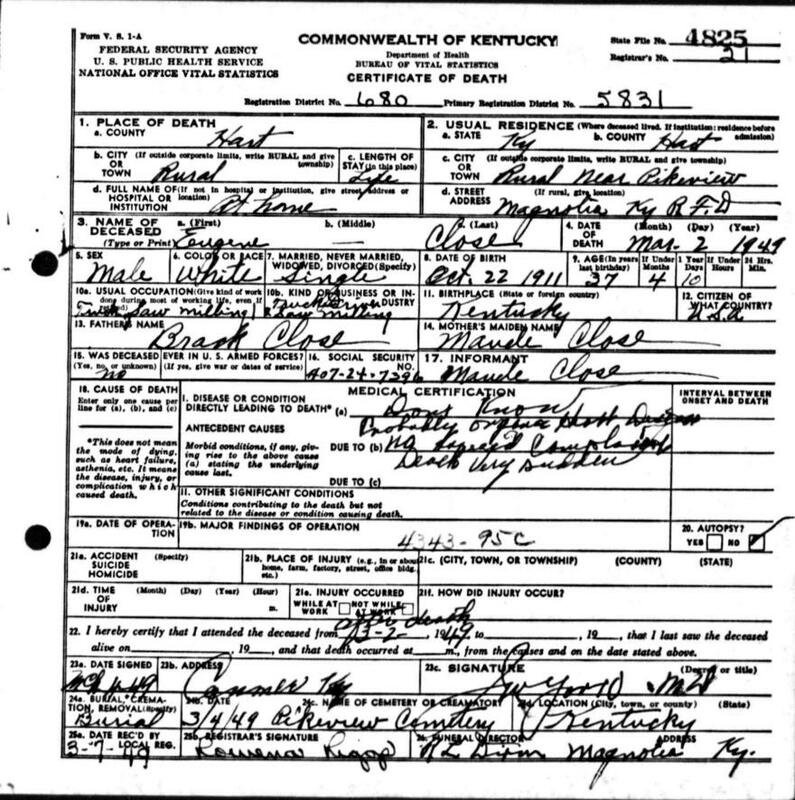 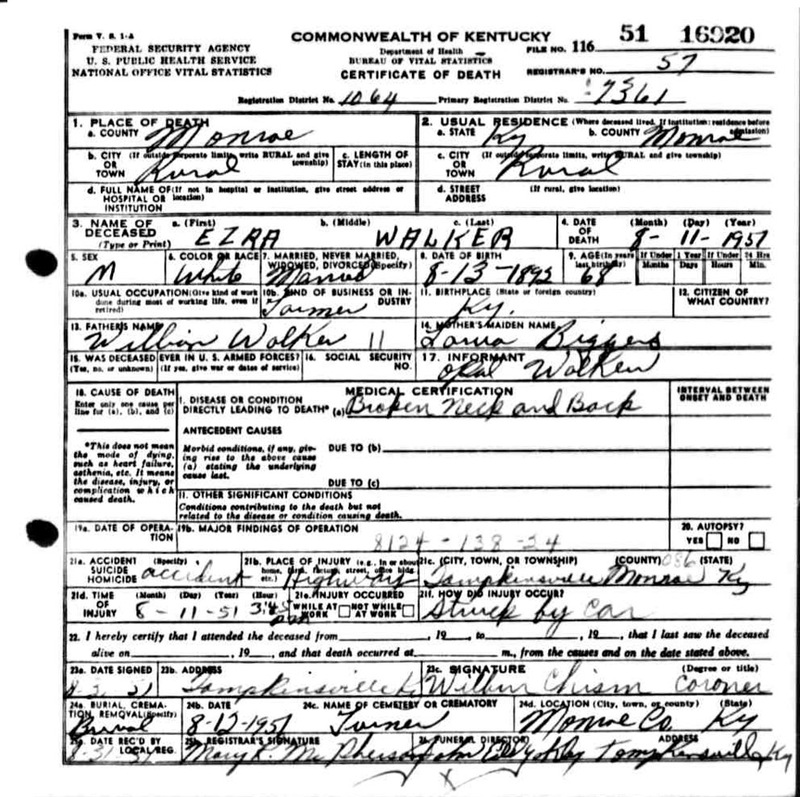 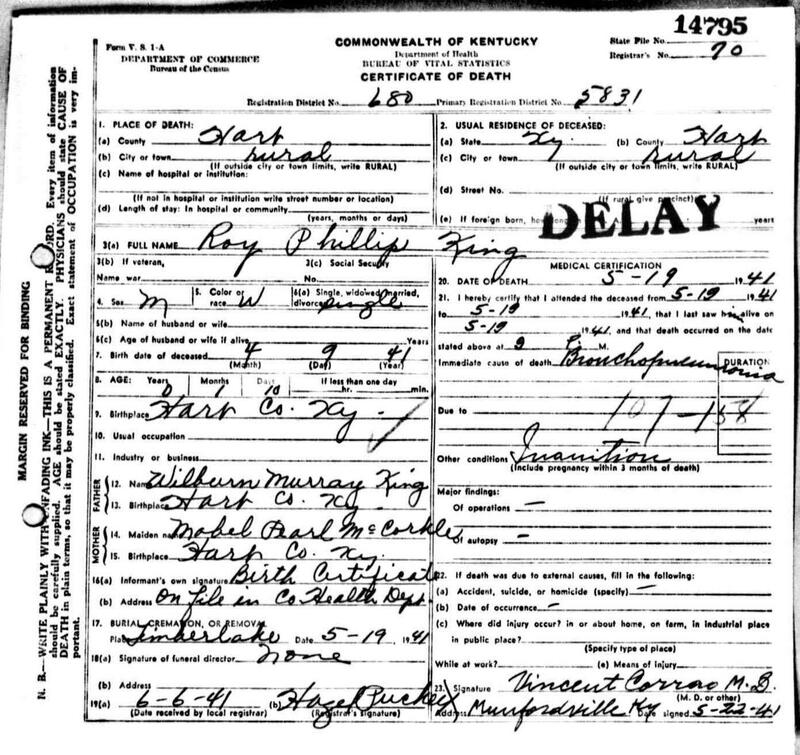 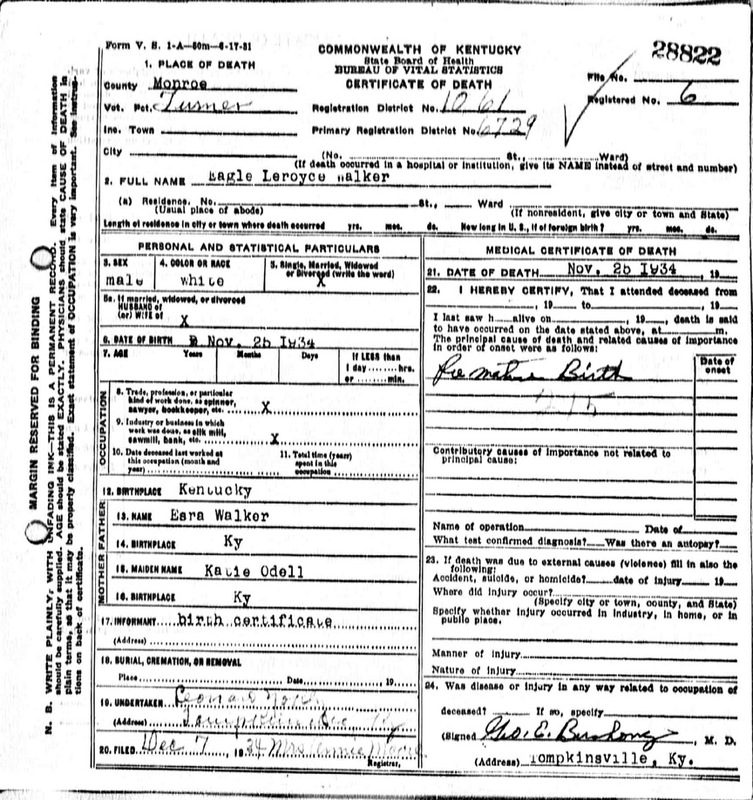 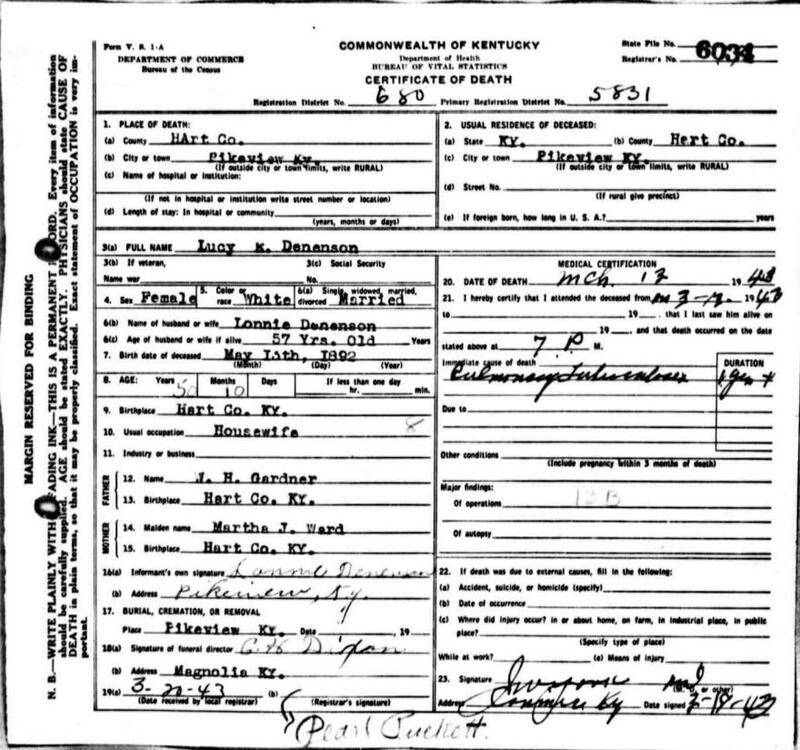 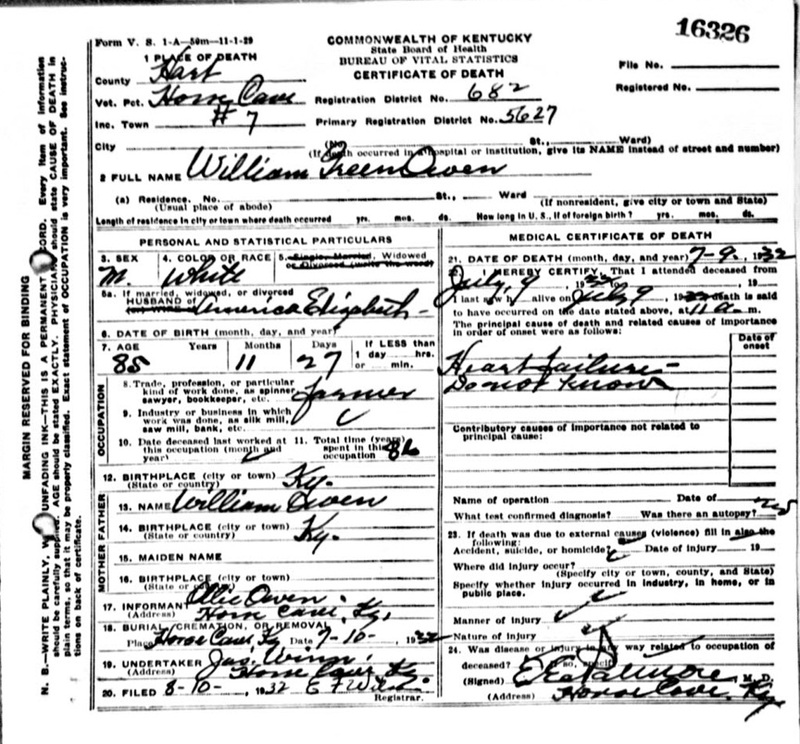 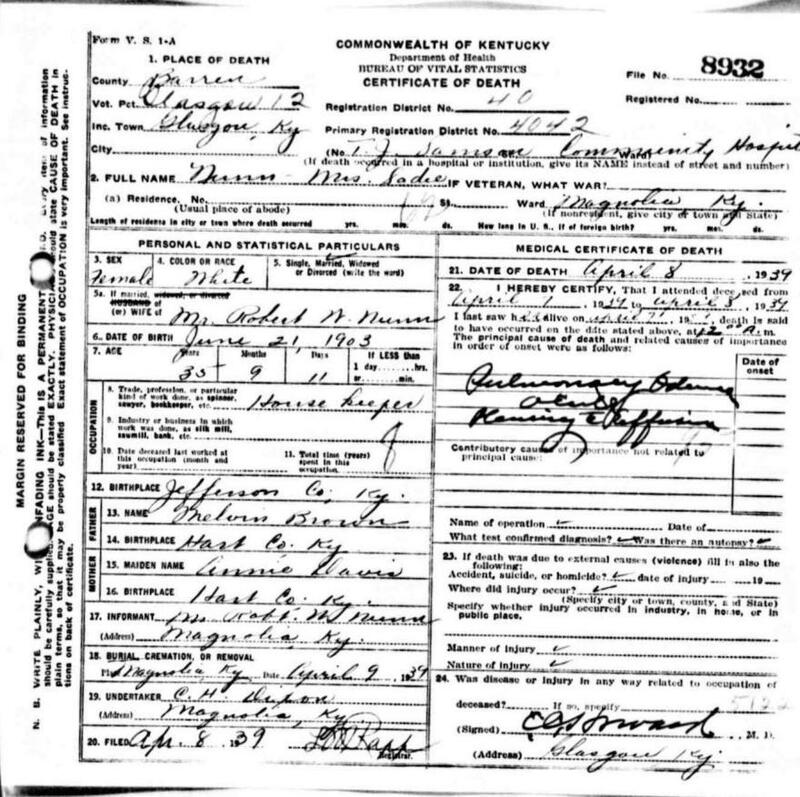 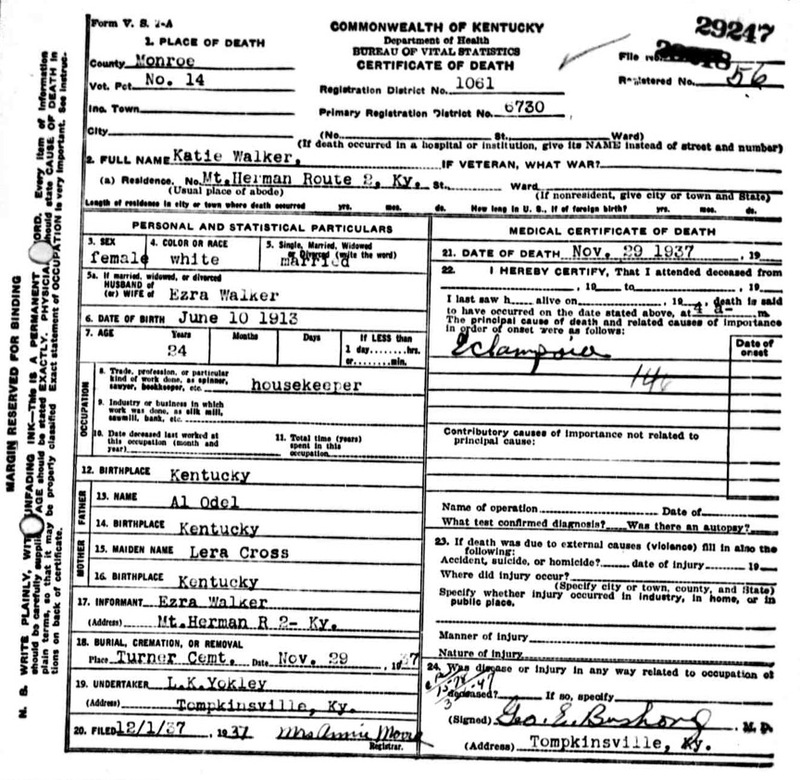 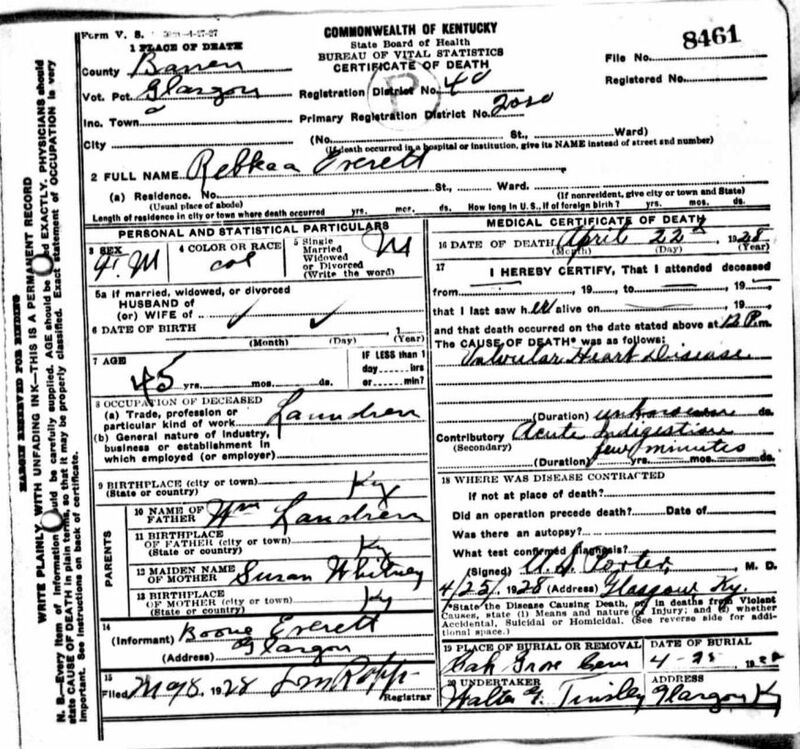 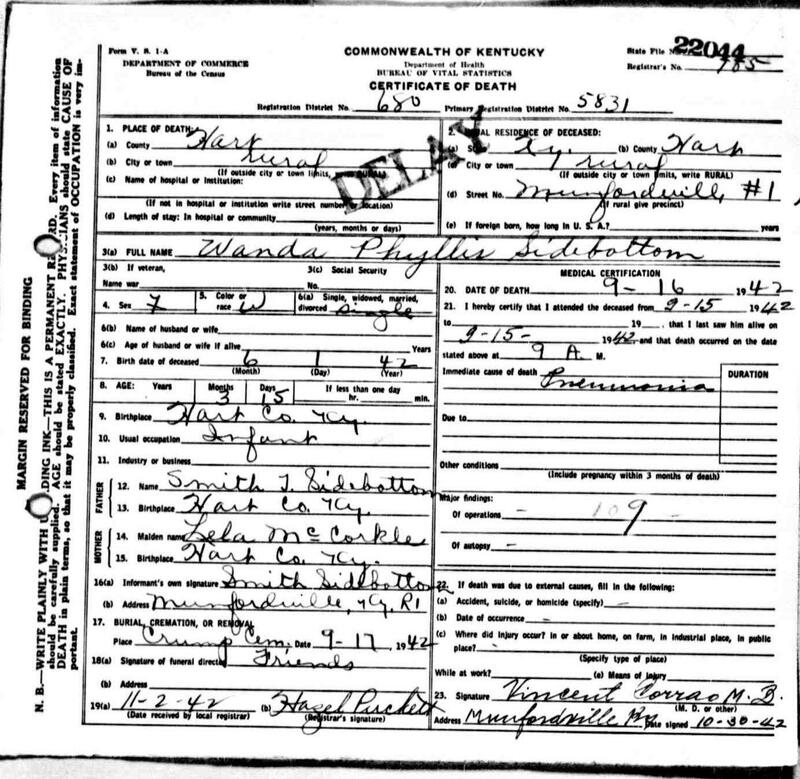 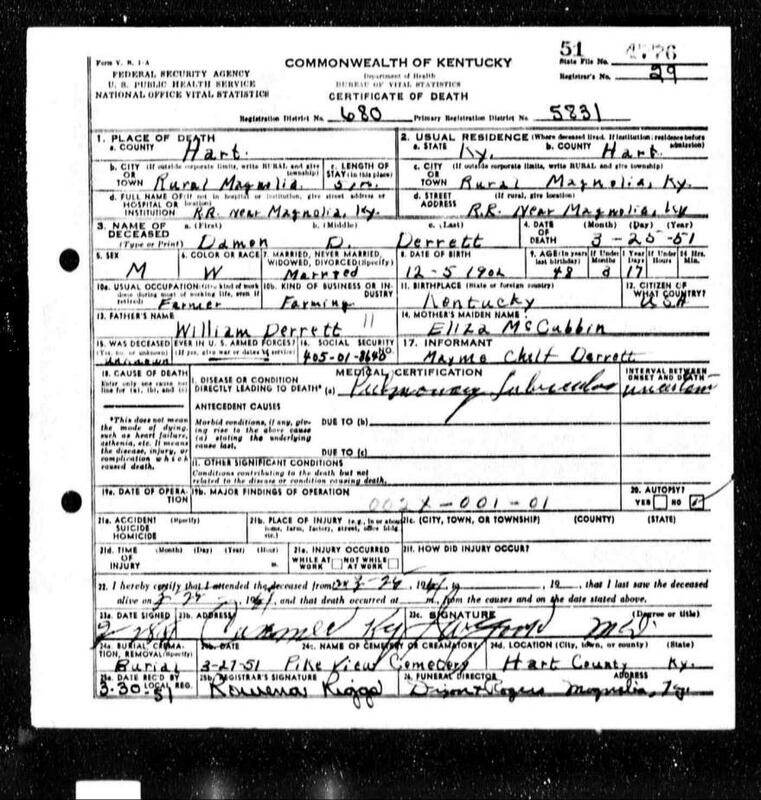 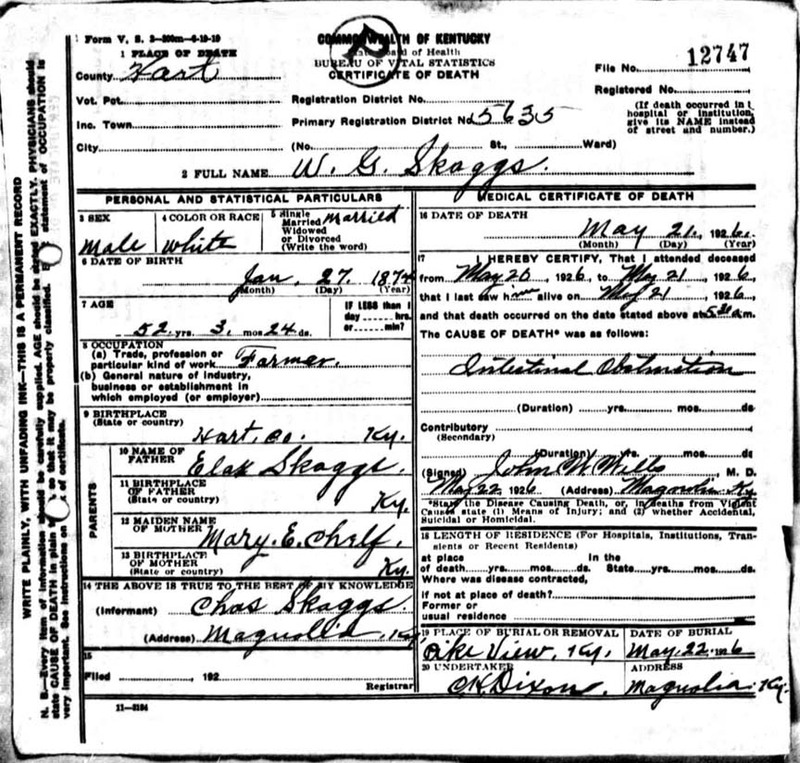 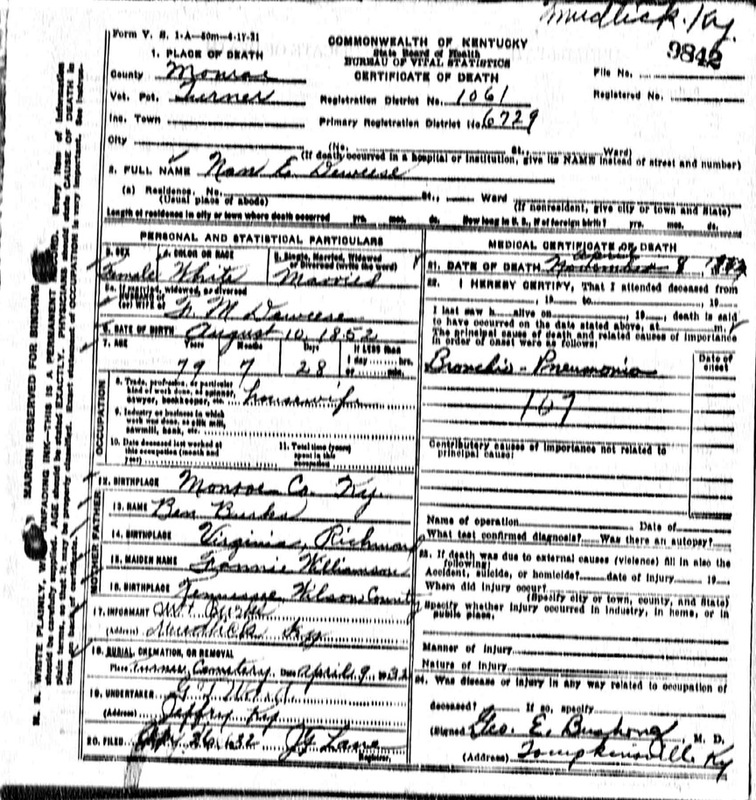 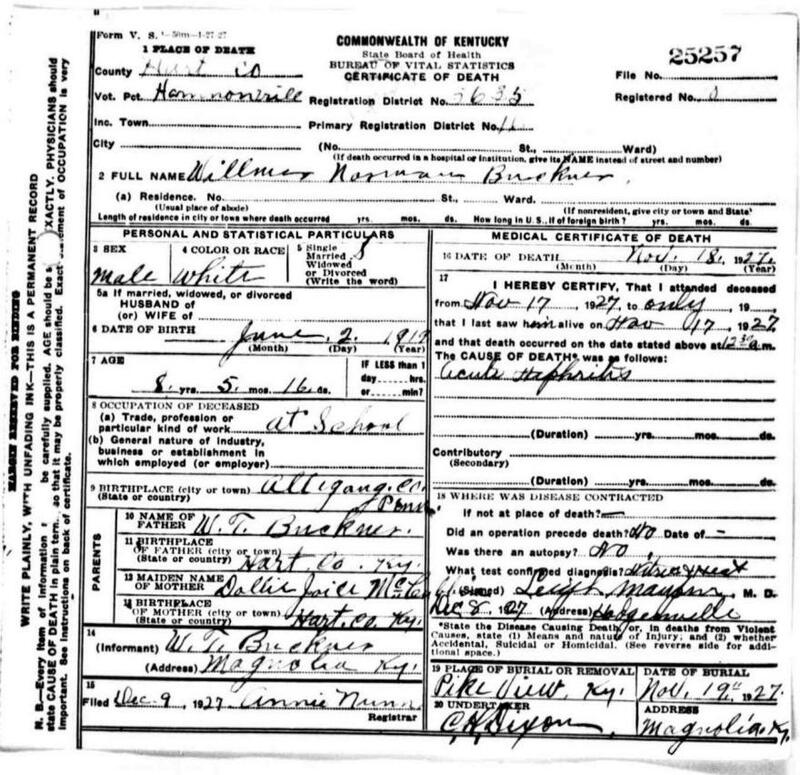 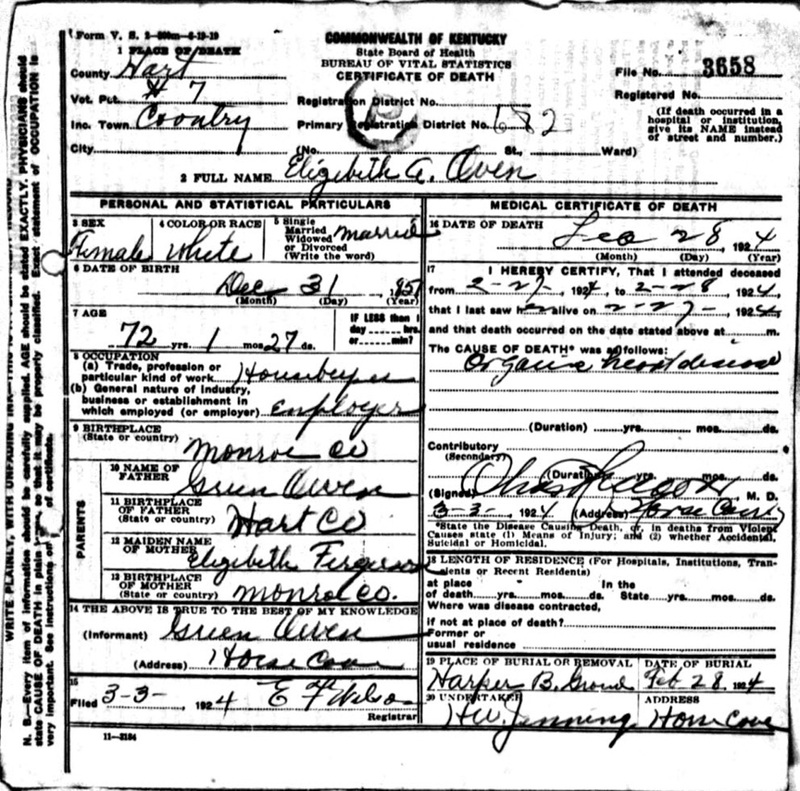 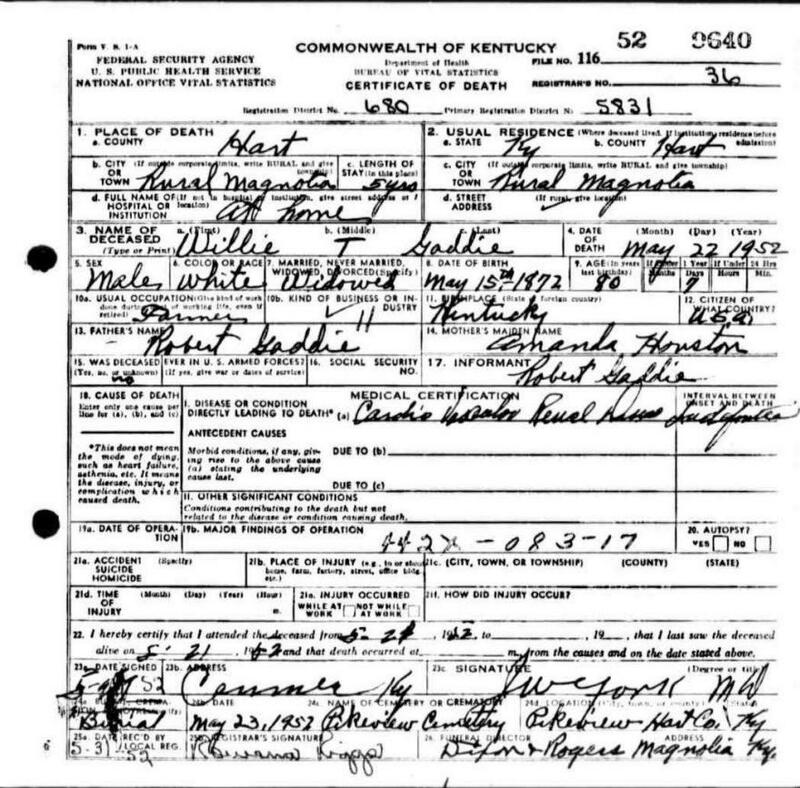 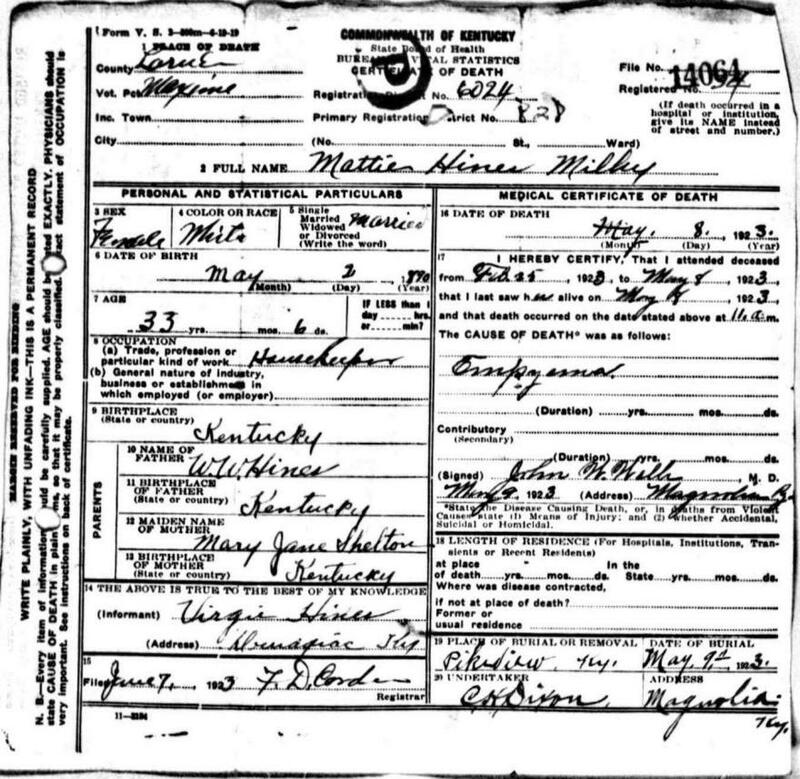 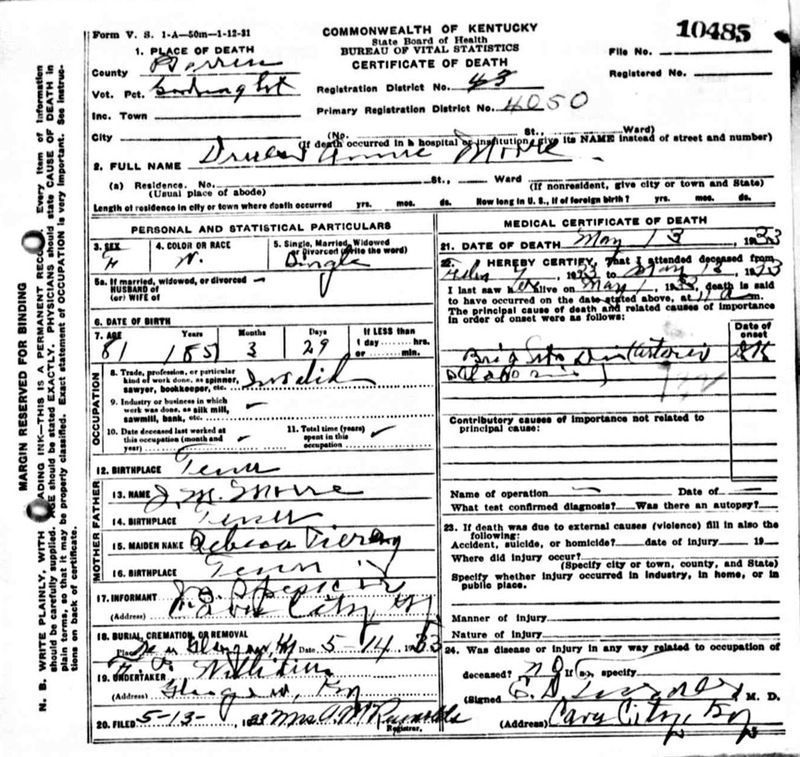 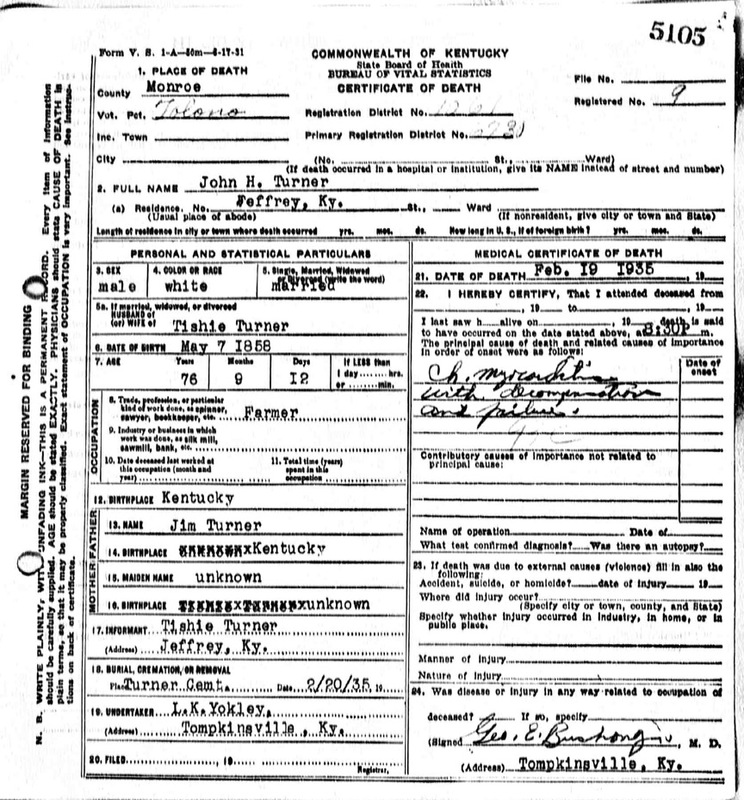 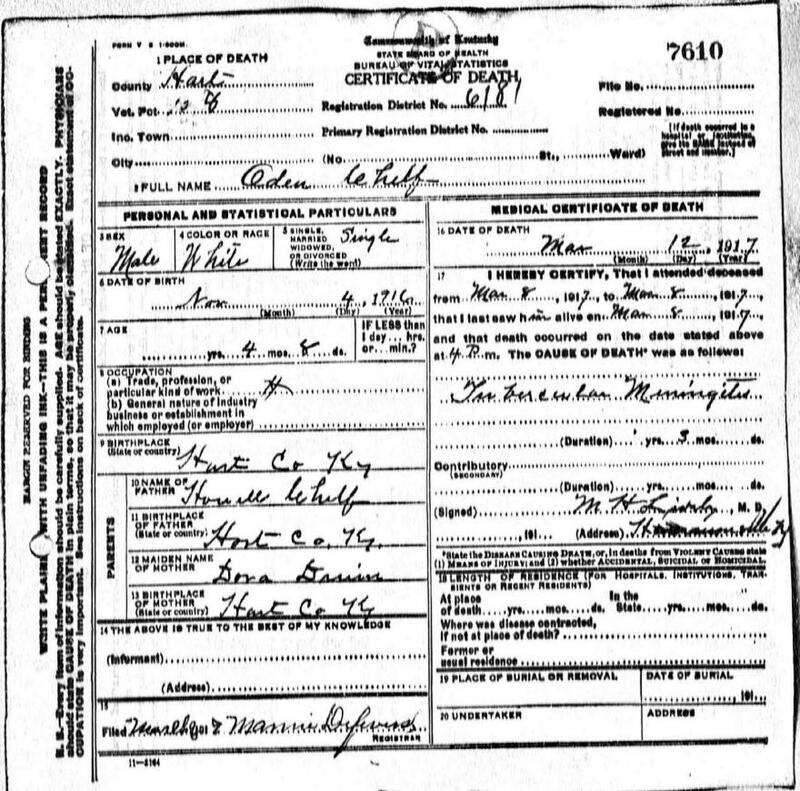 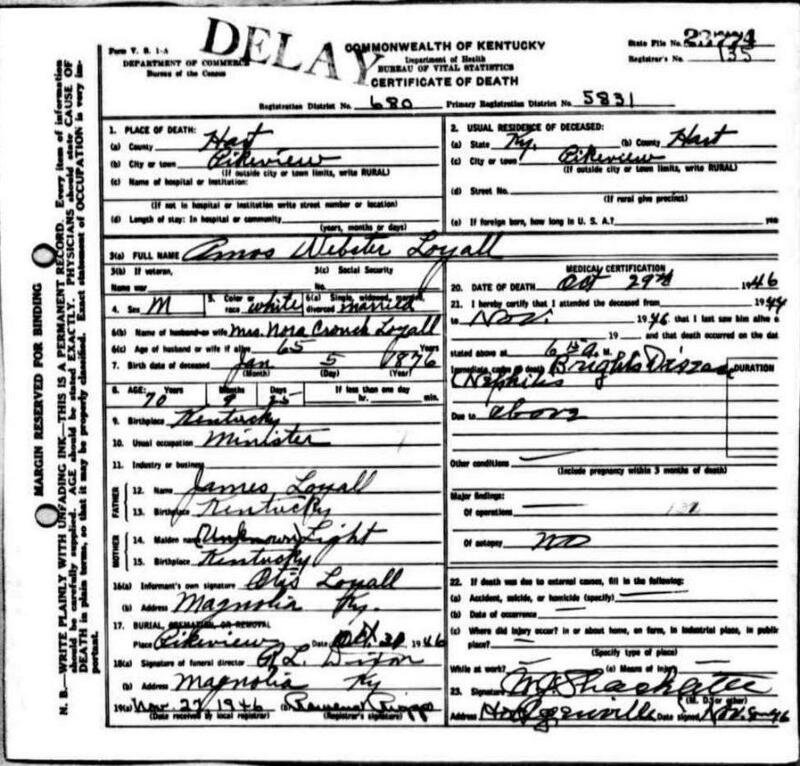 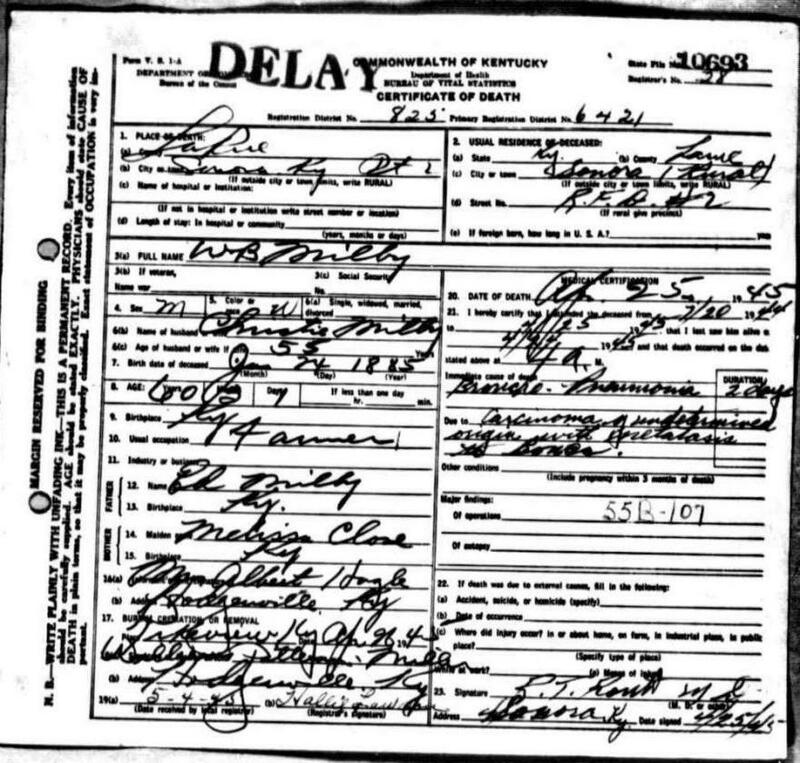 Added death certificate for Mary Neville Savage and corrected info for Little Hope Cemetery, Barren Co., KY - provided by Robert Cravens. 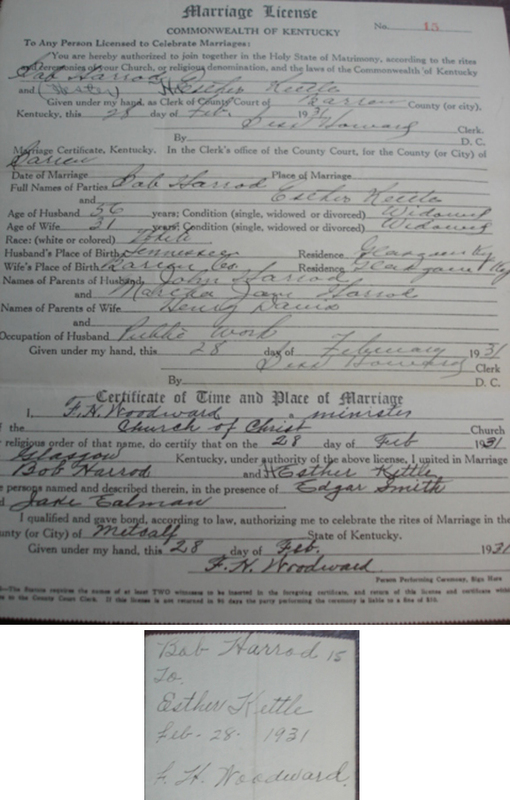 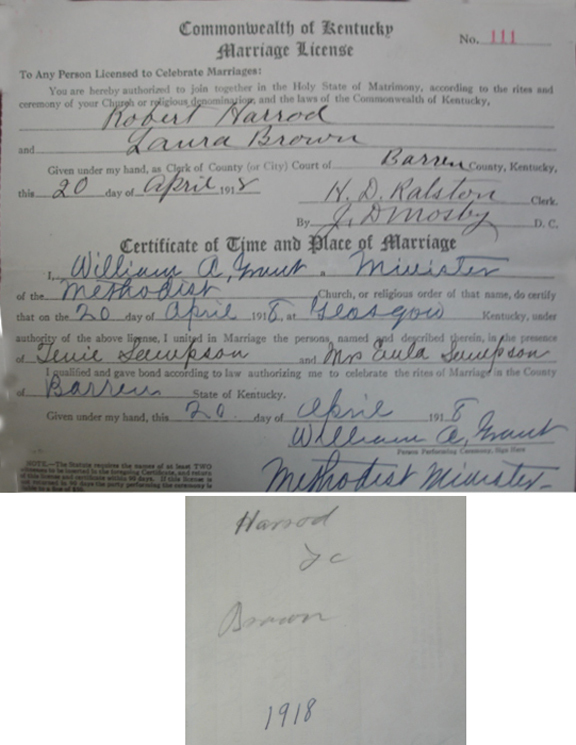 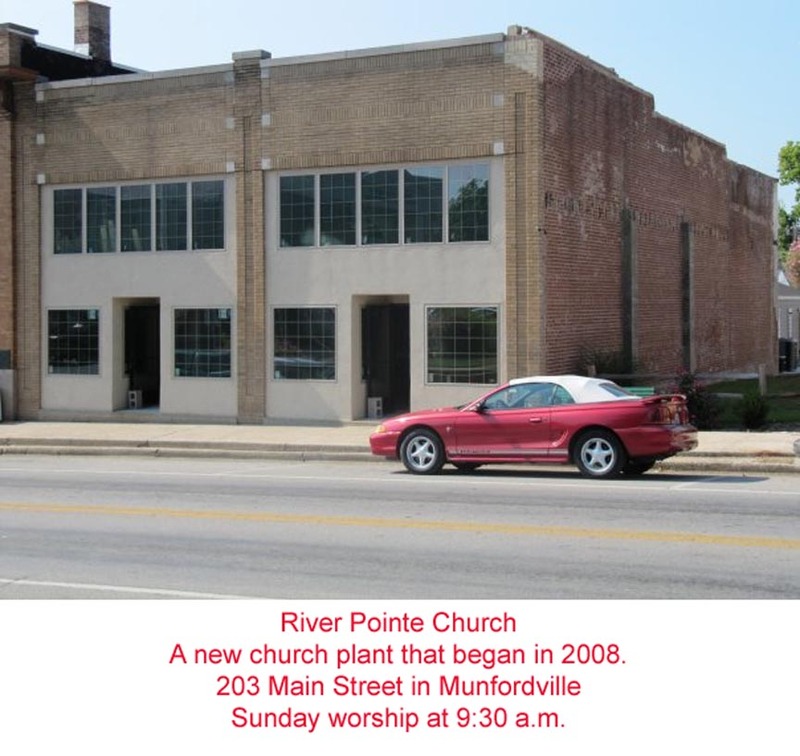 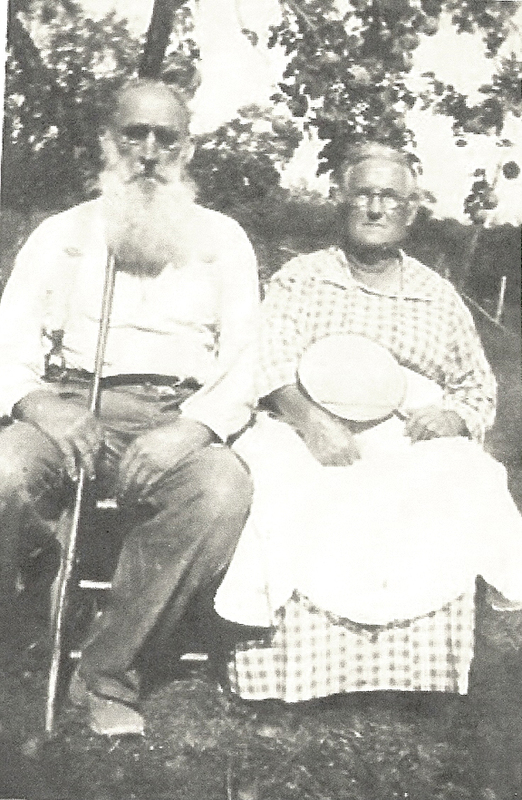 Added stone photos and info for James Roscoe & Nellie Catherine Hoefler Reynolds buried at Louisville Memorial Gardens West, Jefferson Co., KY. - provided by Edith Bastin. 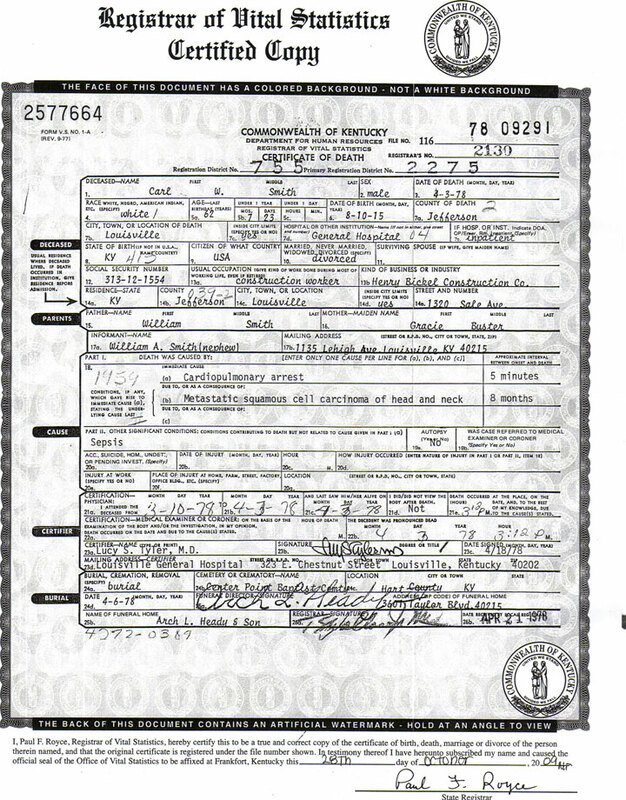 I have switched web hosting companies - I don't expect you to see any change, but if you do have any problems, let me know.